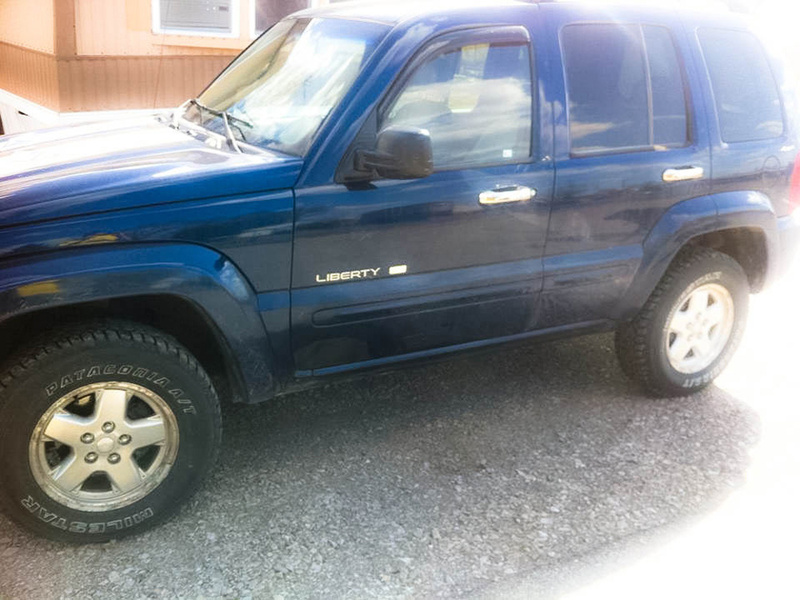 Got some awesome before and after pictures to share? 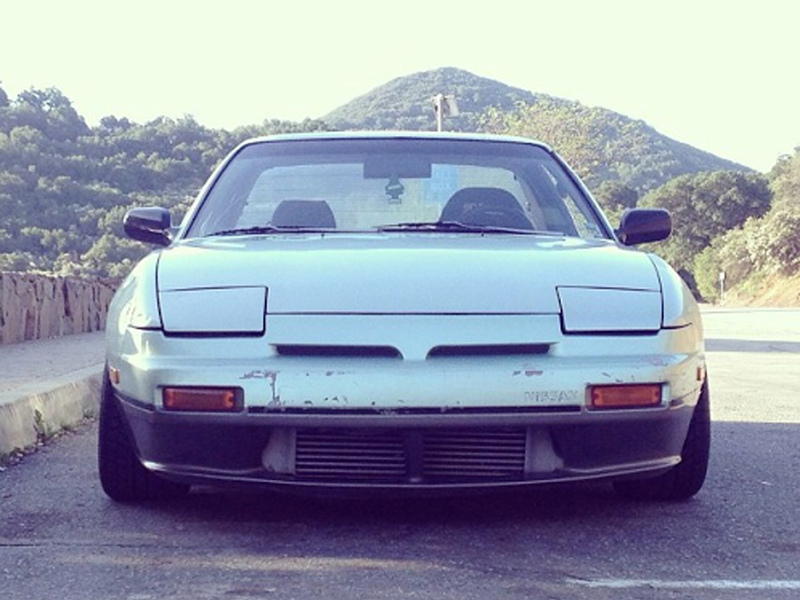 Submit them to us and get featured on this page! 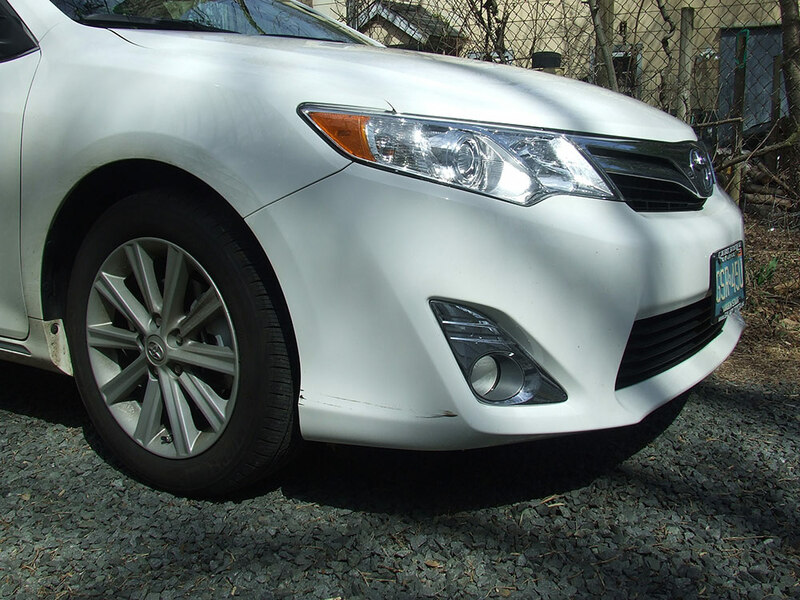 "New Camry. First week. Initiated. Now you see it. Now you don't. Nice. Thanks." 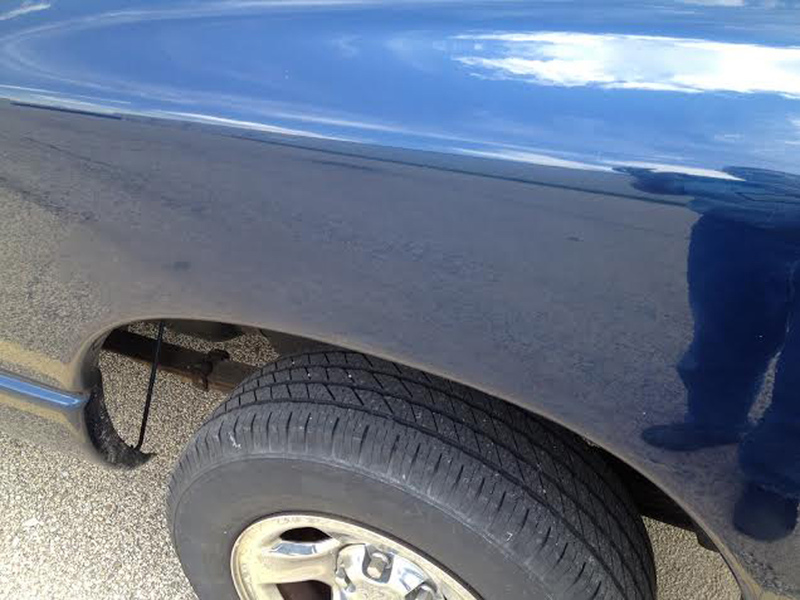 "2011 Chevy Silverado HD3500 dually with right rear fender damage. 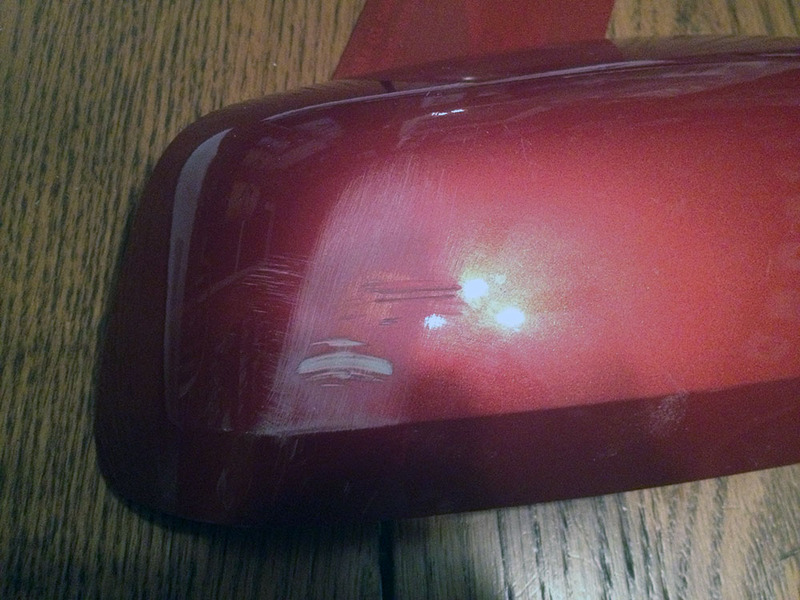 At first I thought I would punch out the dent with a rubber mallet, then smooth out the high spots with a dulled, wooden golf tee and then use the small bottle. It didn't come out well. 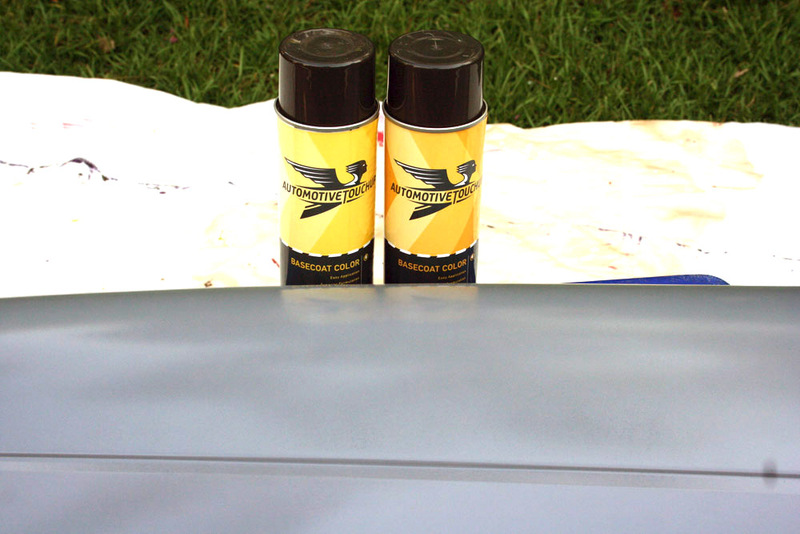 I called AutomotiveTouchup and got the sprays instead. 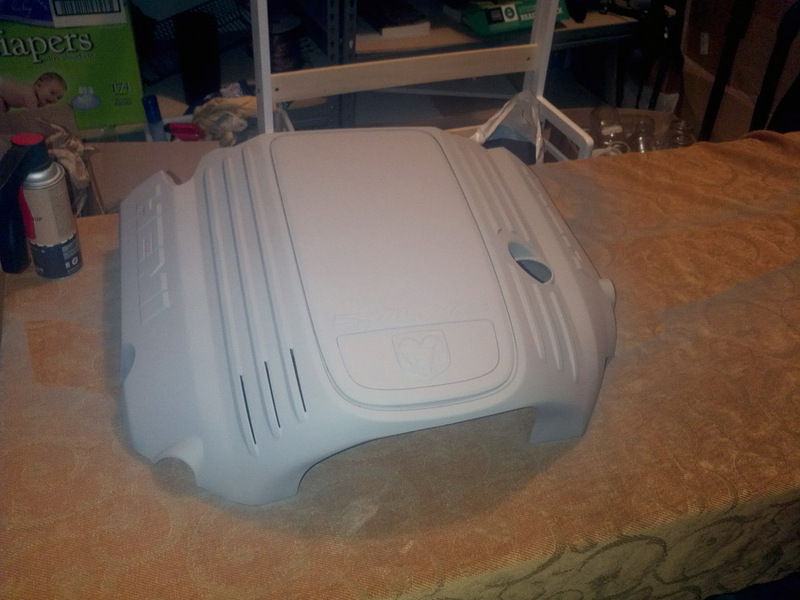 I resanded with 400 up to 1000, primed, wet sanded and then painted. Their paint is real close. 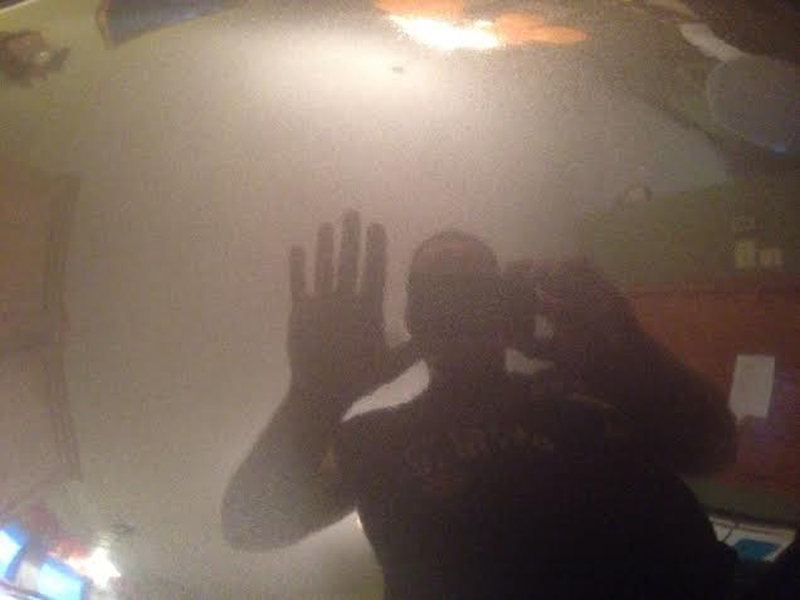 The clear didn't come out as shiney. 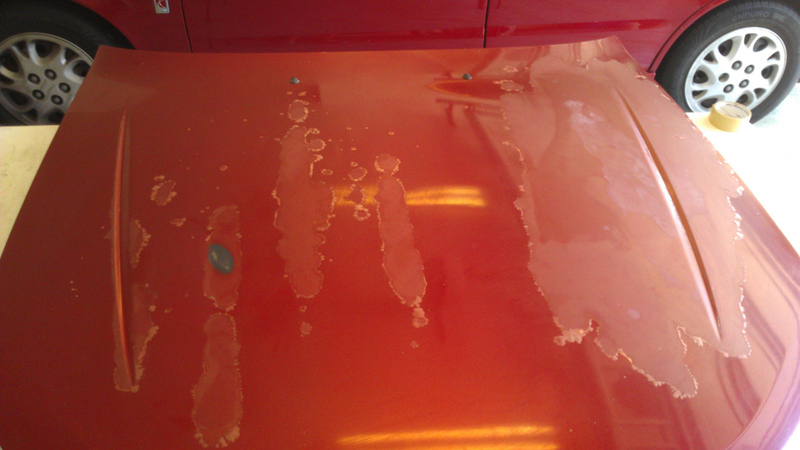 So I am using rubbing compound and will hit it again with clear coat. 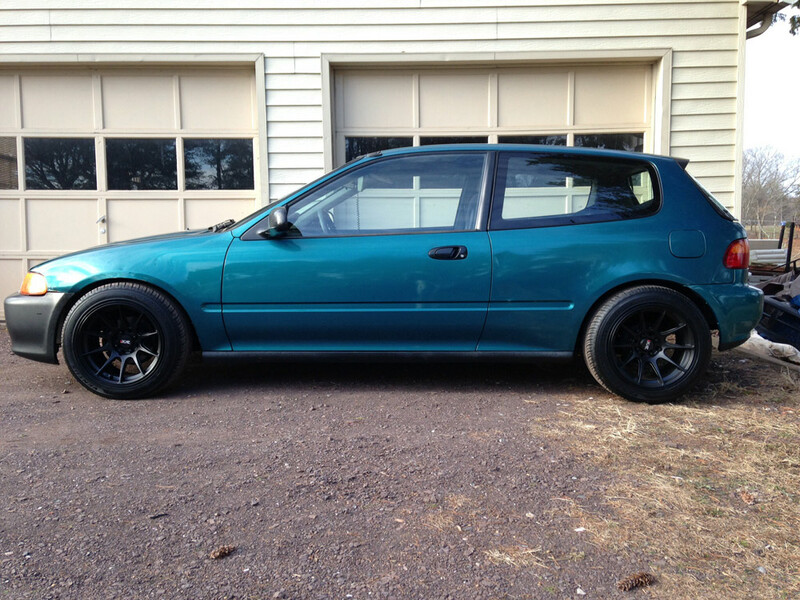 So far it looks good. 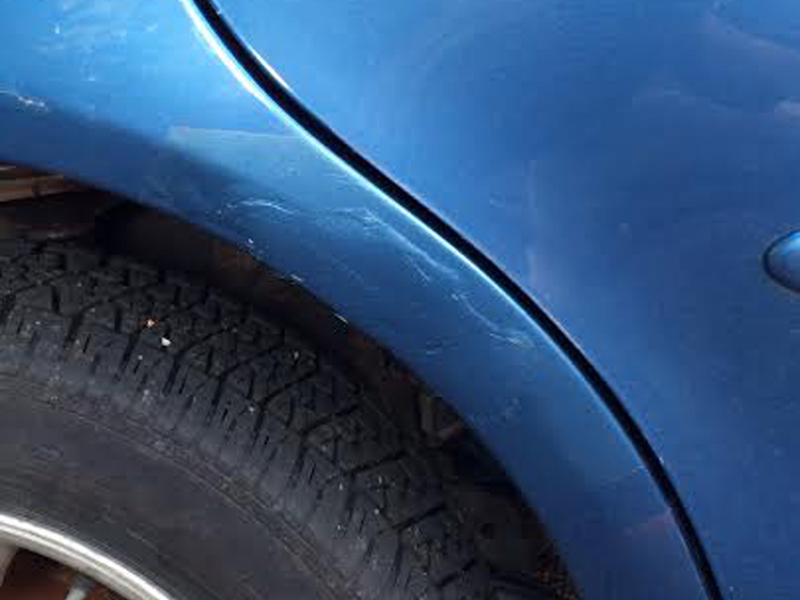 A dent specialist wanted $300 to fix it. 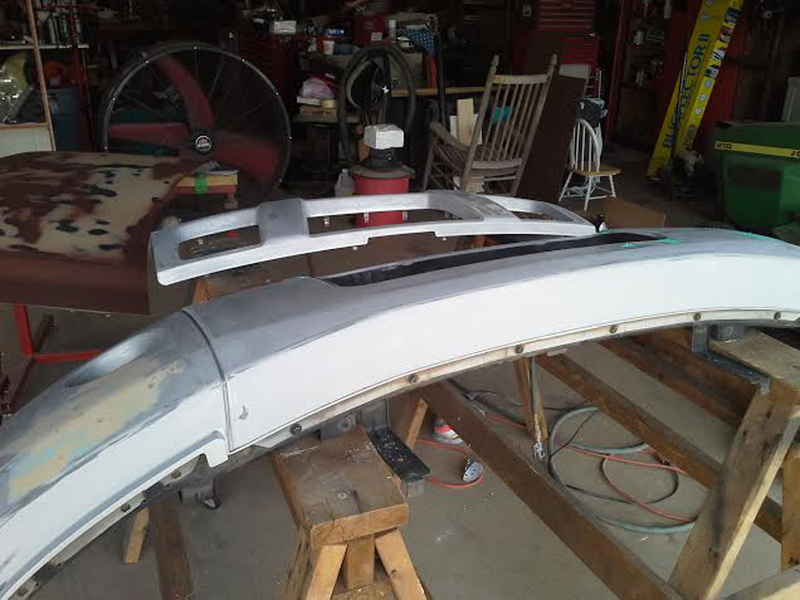 My investment so far about $60 "
"1961 Saab 96 being restored by my grandkids in Evergreen, Colorado I'm impressed with your ability to match obscure Saab colors going back over 50 years. And shipping has been prompt on all my orders. 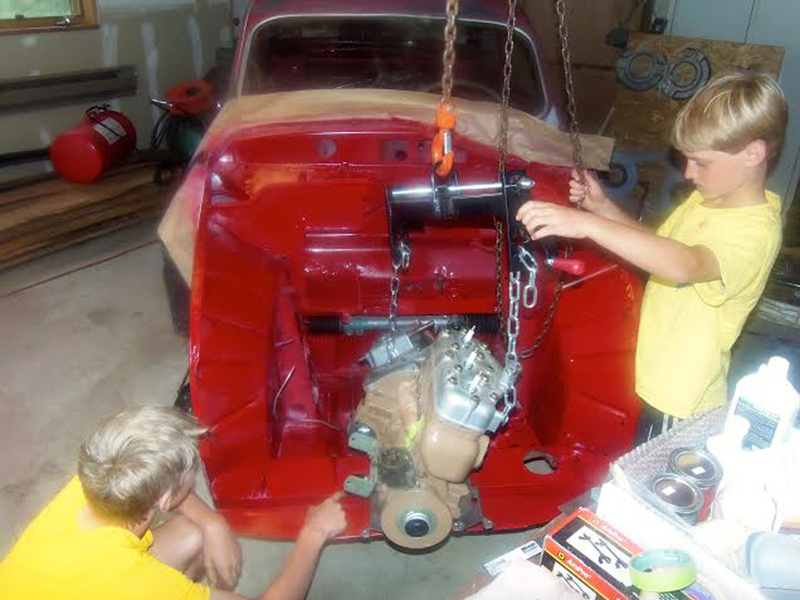 We are doing the engine compartment and all the small body color parts right now." 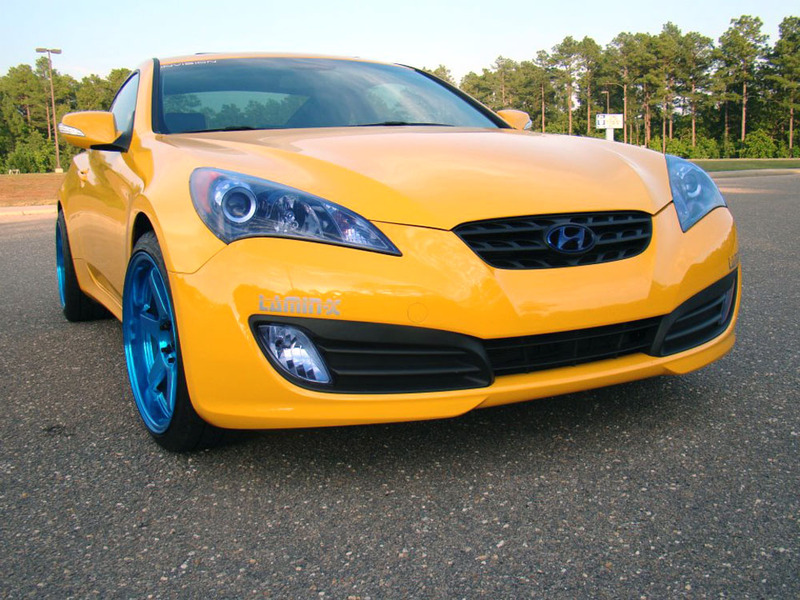 "Color matched the front lip and rear apron. Looks great!" 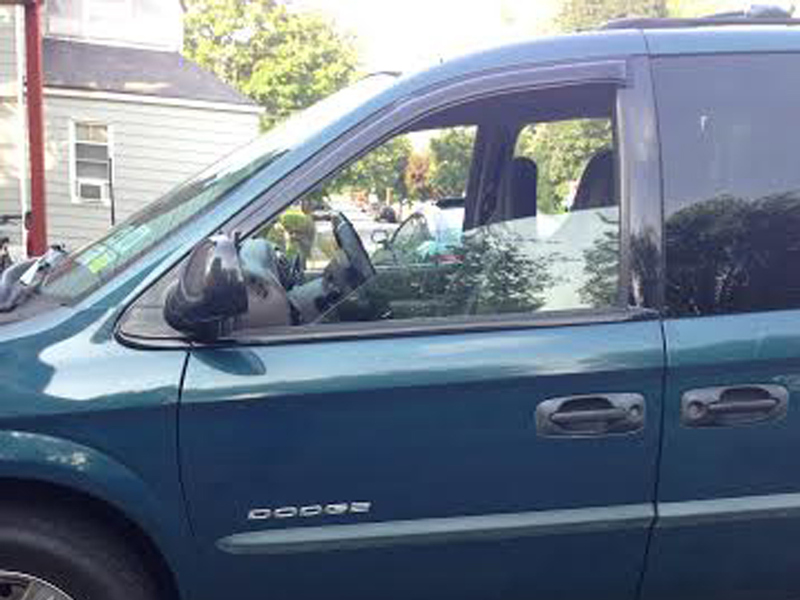 "I want to thank you folks so much, the paint you mixed with the paint code I sent you matched perfectly. 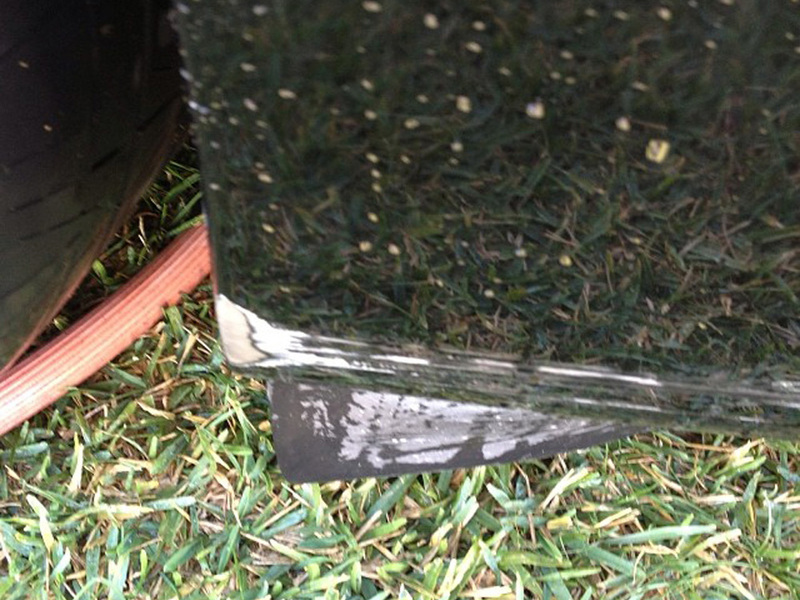 The right front fender was rusting out in spots. 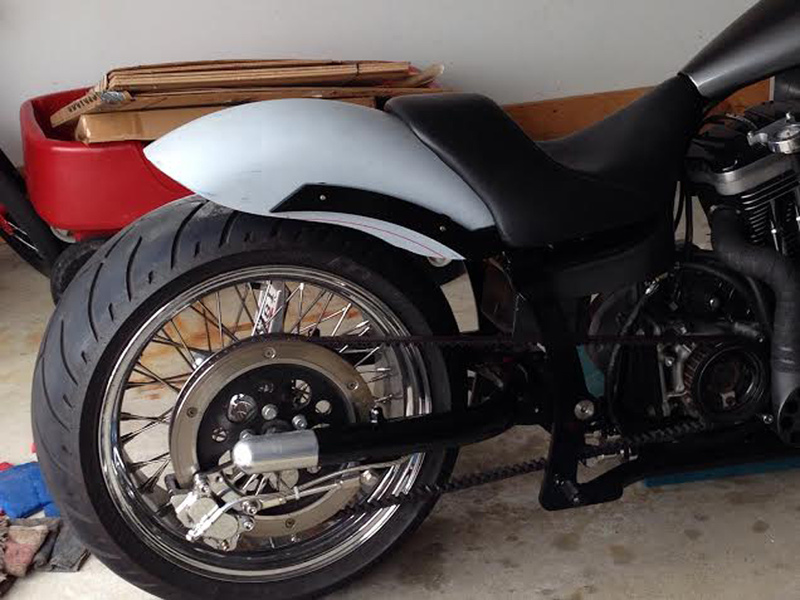 So I replaced it with a new front fender. 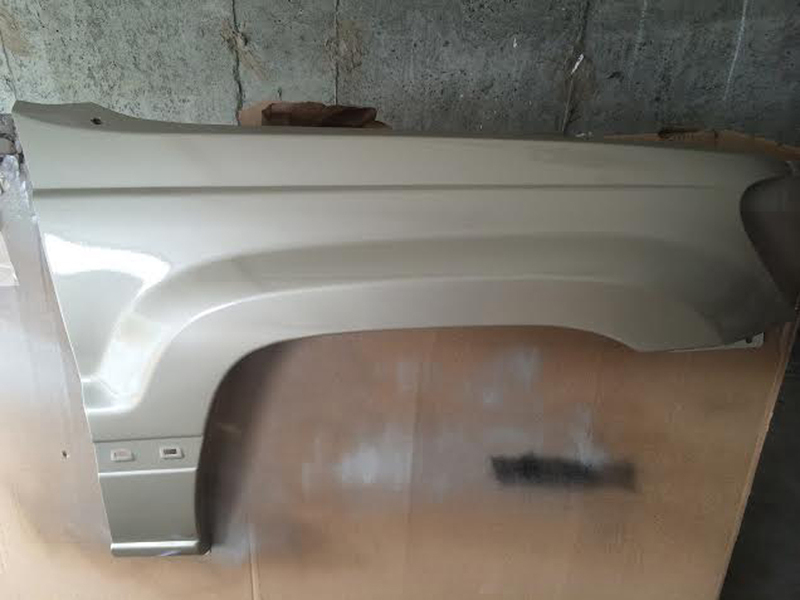 I primed it, then painted it (4 coats) with your base coat and then clear coated it (4 coats). 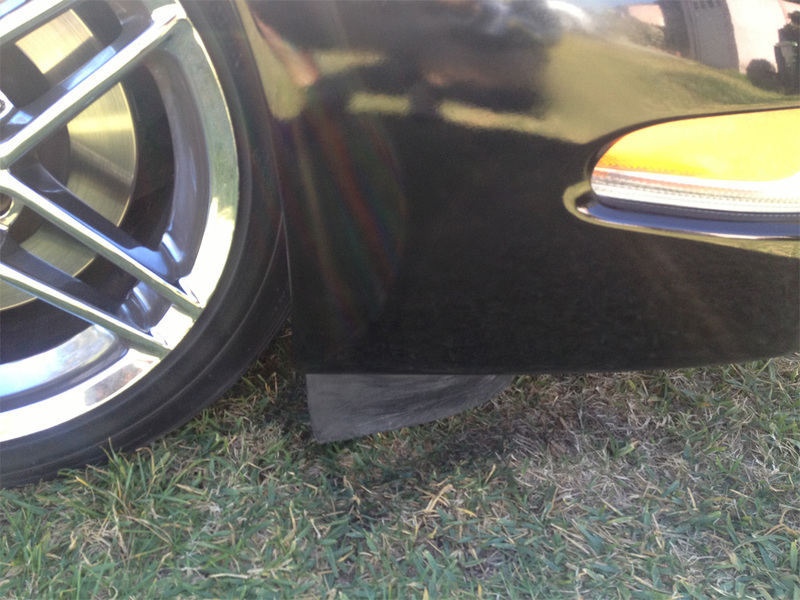 Attached are some pictures of the right front fender. It came out so good! 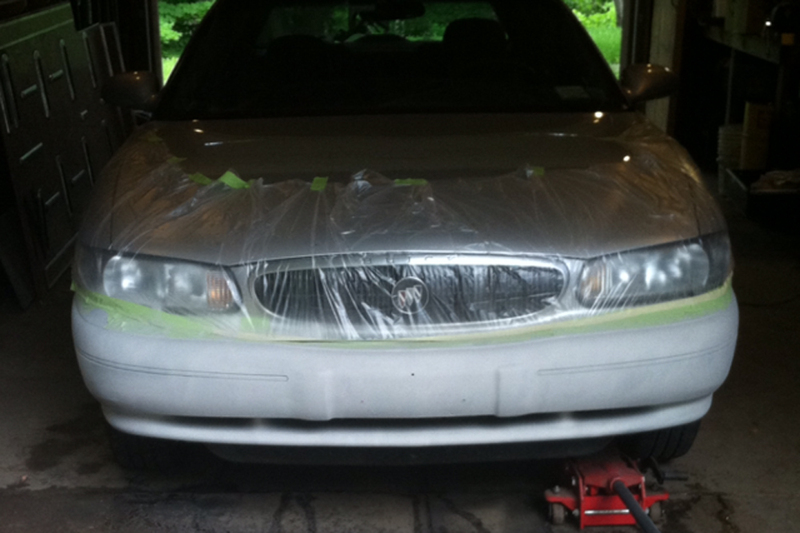 Thank you, Steve"
"My 2003 Buick gets pumped alot parking my bumbers were getting a little old looking,, the rest of the paint was good the body shop wanted too much for a respray of my front and rear bumbers so i dicided to do it myself i did the research and found your company, I watched all your videos on how to prep sand and finish my bumbers, I ordered all your products including my paint color, Buick u519f galaxy silver matalic, I was so amazed at the exact match it was perfect It was alot of prep time and sanding but i think thats what made the finish come out body shop quality Thank you again, I will definitely use your products again.... :-)"
"Bought two unpainted mirror's for my car. 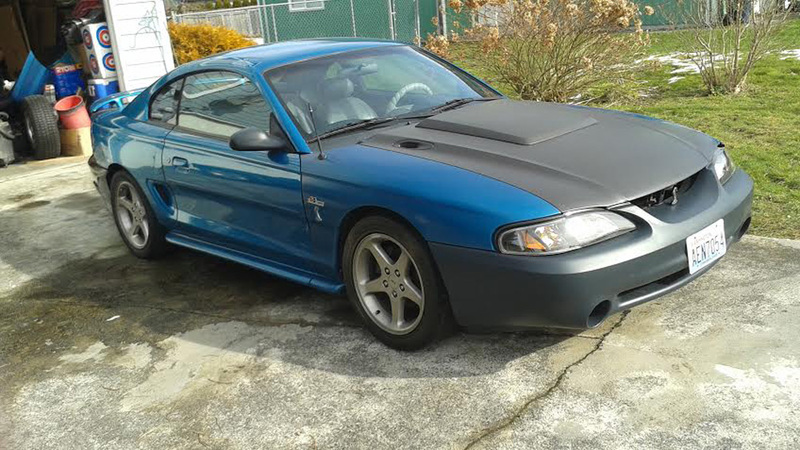 Was concerned that I wouldn't be able to match the metal flake paint. Very pleased that it was an almost perfect match. 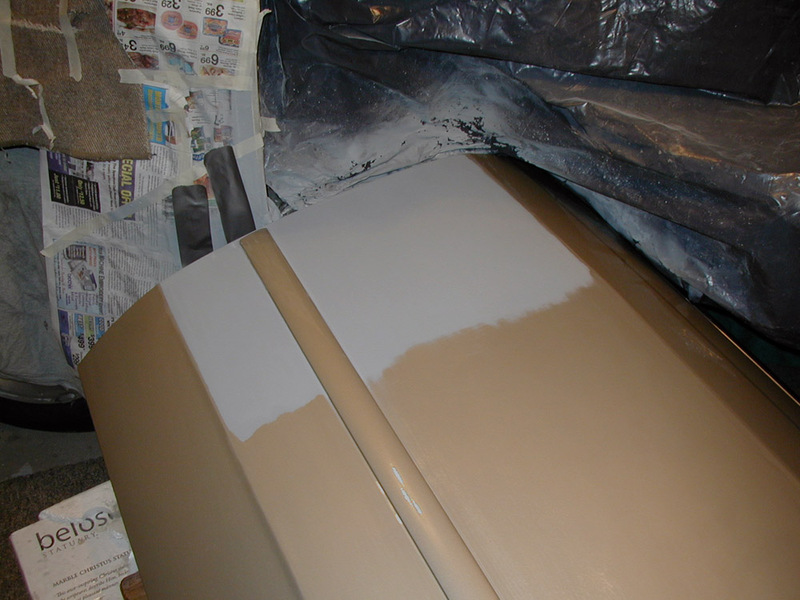 One less coat of base color and it would have been. 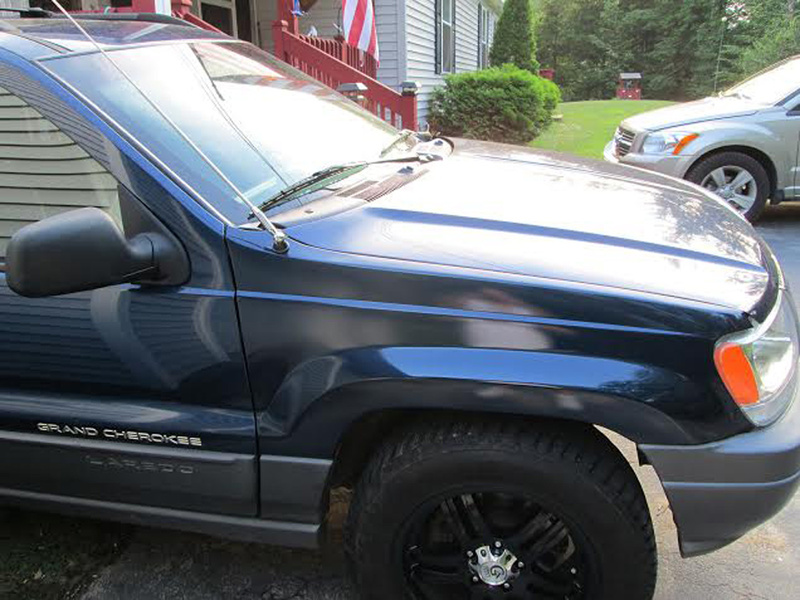 Highly recommend their products and paint matching ability. 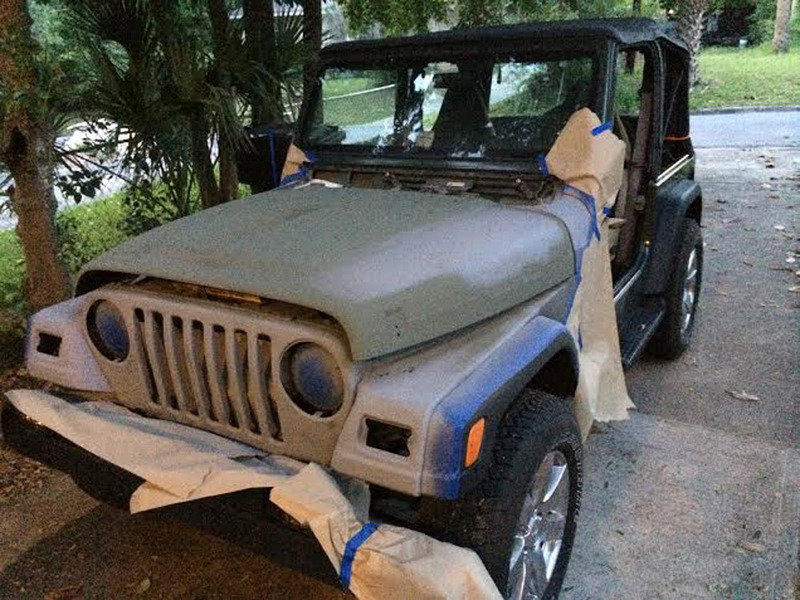 The directions that come with the paint make it almost fool proof." 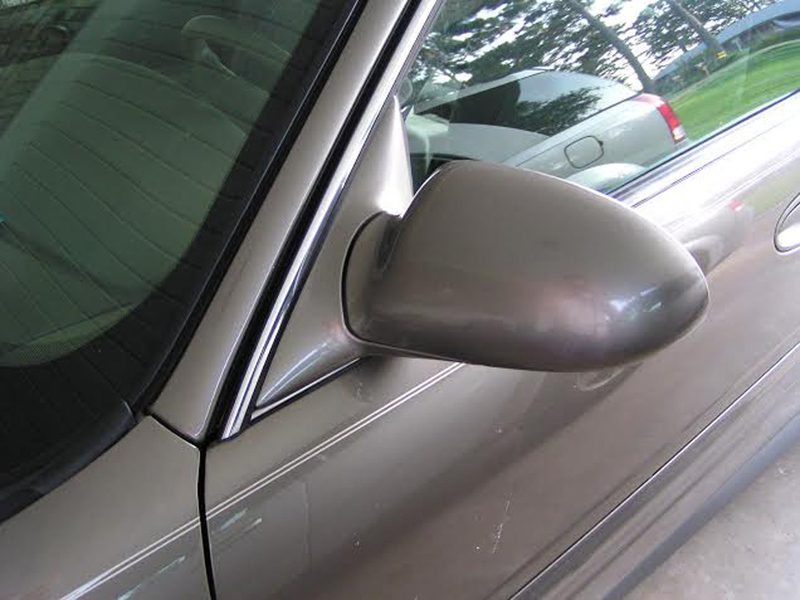 "Had to replace the passenger mirror and painted it following instructions on youtube working out perfectly"
"My 2001 Honda Civic was sideswiped and the estimated repair cost was about $2000. 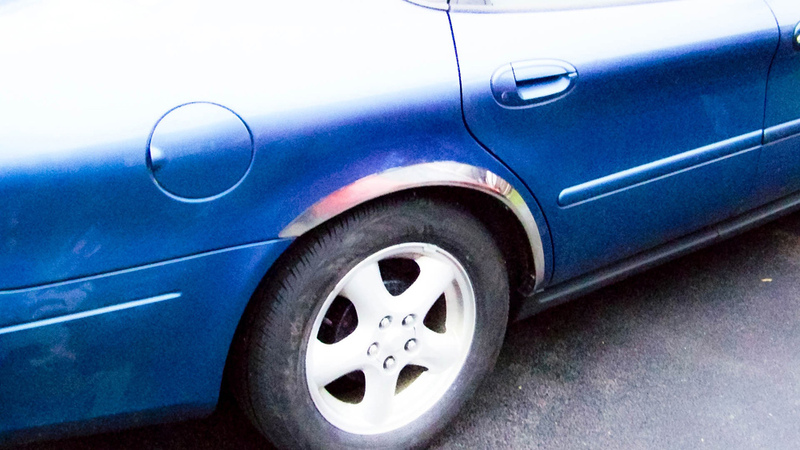 Using Bondo, Automotive Touchup paint and clear coat, I was able to fix it myself for under $150! 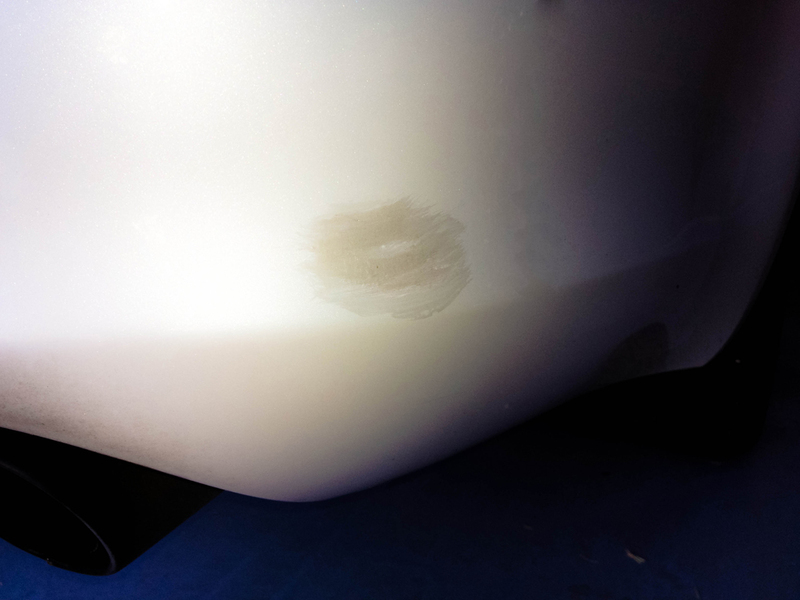 Thank you Automotive Touchup!" 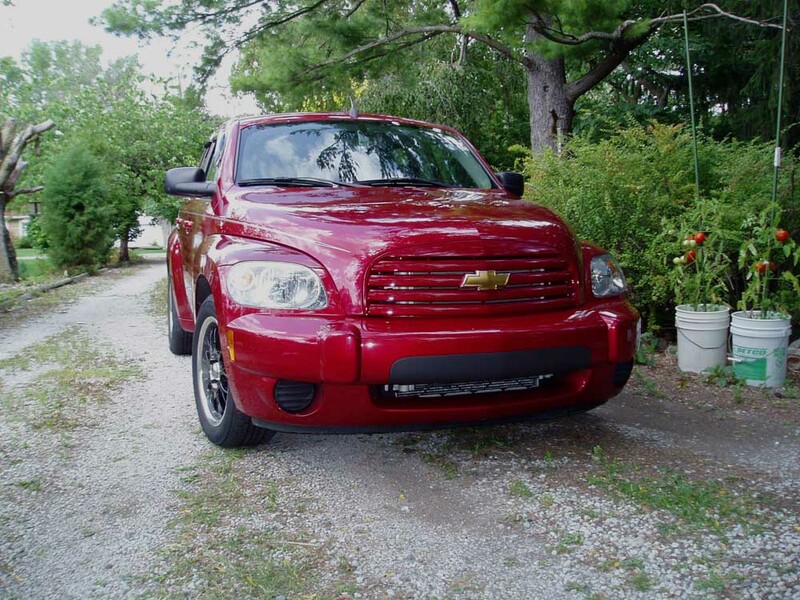 "The clear coating was peeling off the hood, grill and bumper on my 2004 Nissan Titan so it was time to paint. I came across your website by accident and am I glad I did. The amount of information and videos you have are very helpful. 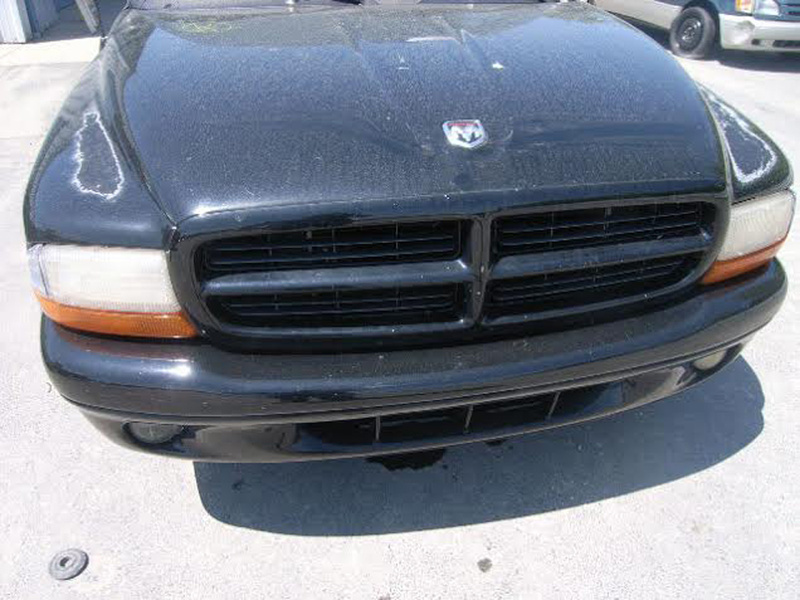 The pictures are of the sanded hood, grill and bumper. 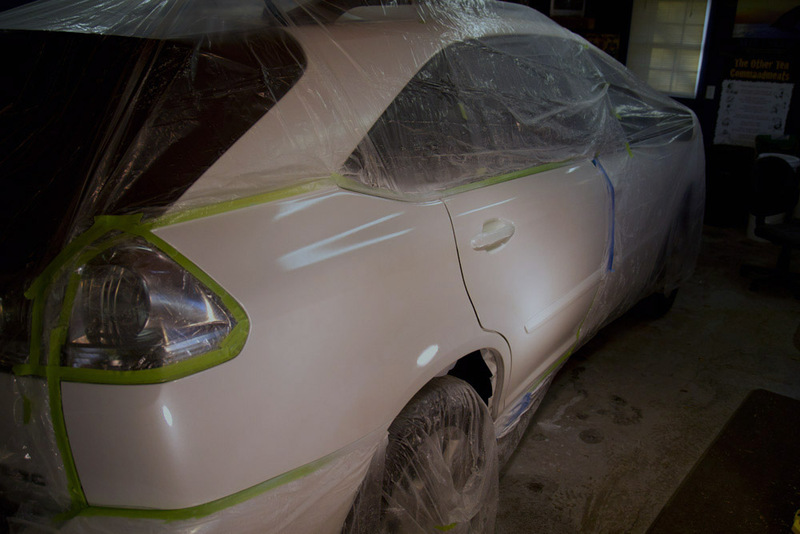 Then in primer, then the base coat with the clear coat. I am very pleased with the way it turned out. 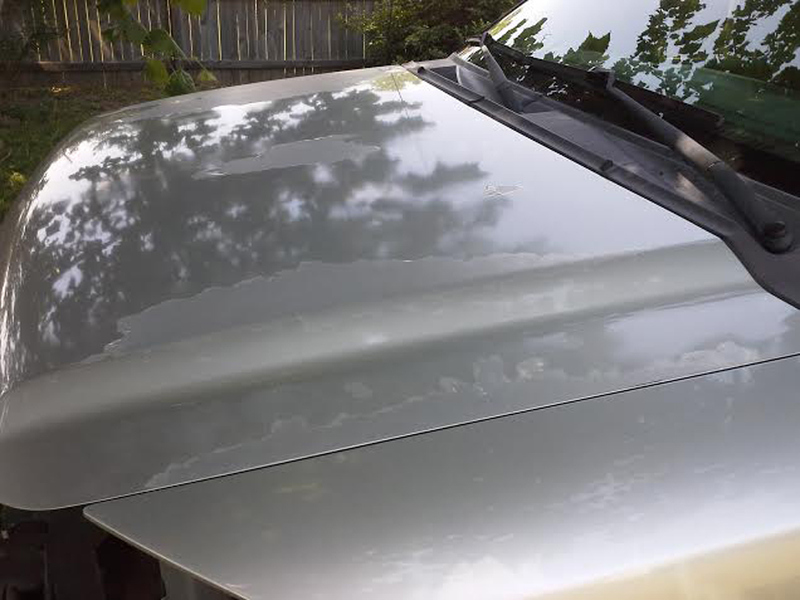 I look at my wife's vehicle and I will be contacting you for more paint. Thank you." 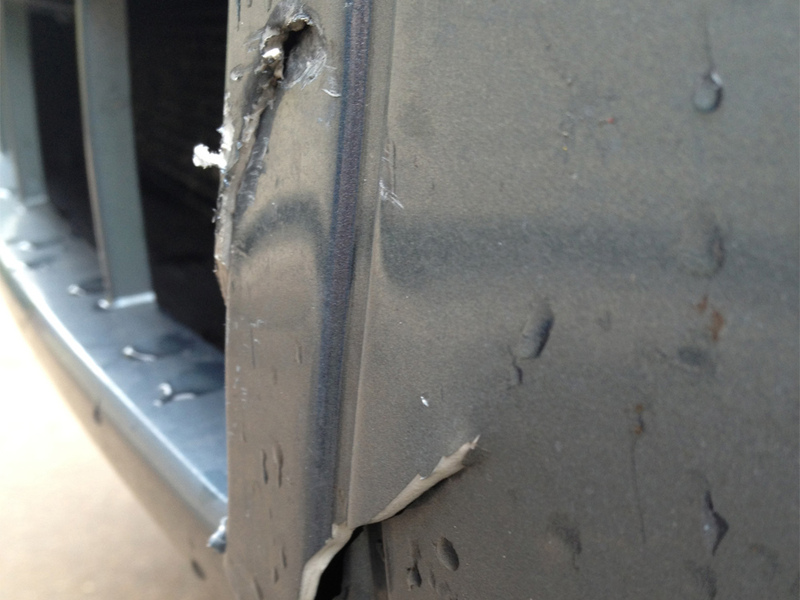 "Had some rust starting on the rear quarter and when we dug into it, it was pretty bad. 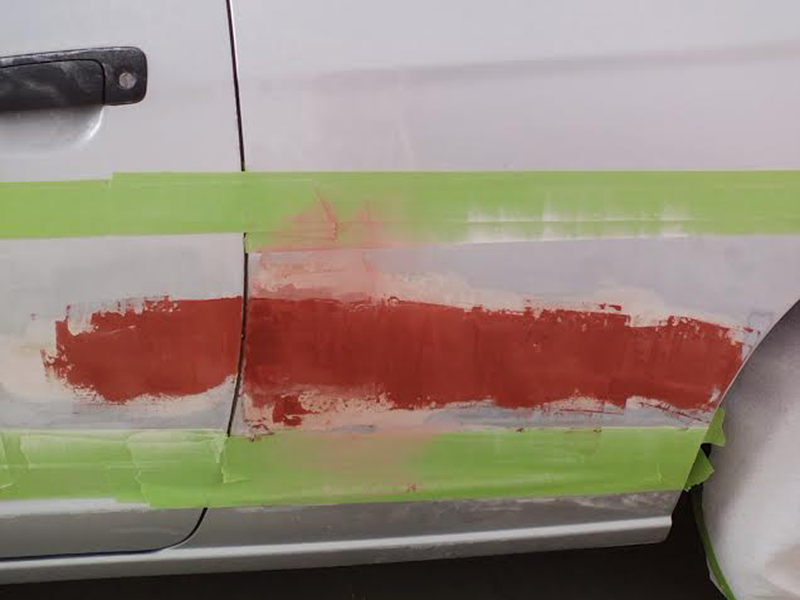 Really happy with the paint we got from you. 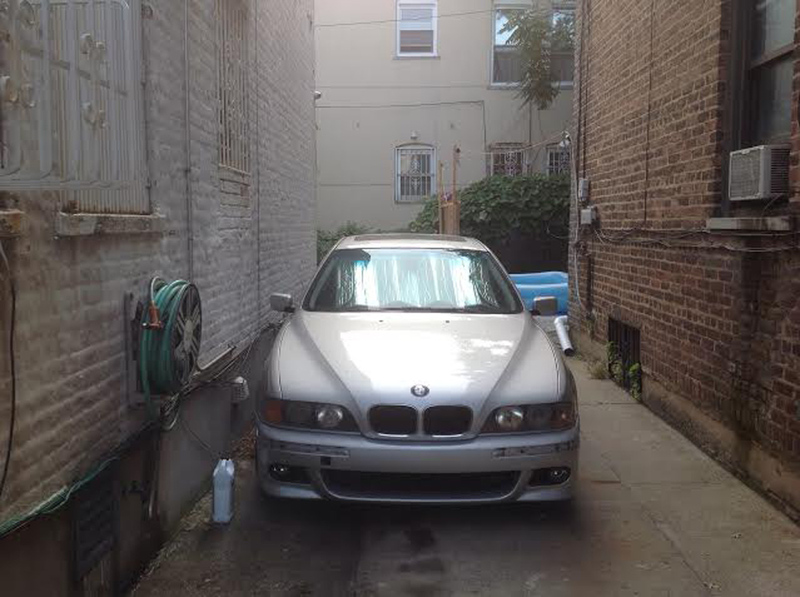 It came out excellent"
"1999 BMW 528i with M sport package. 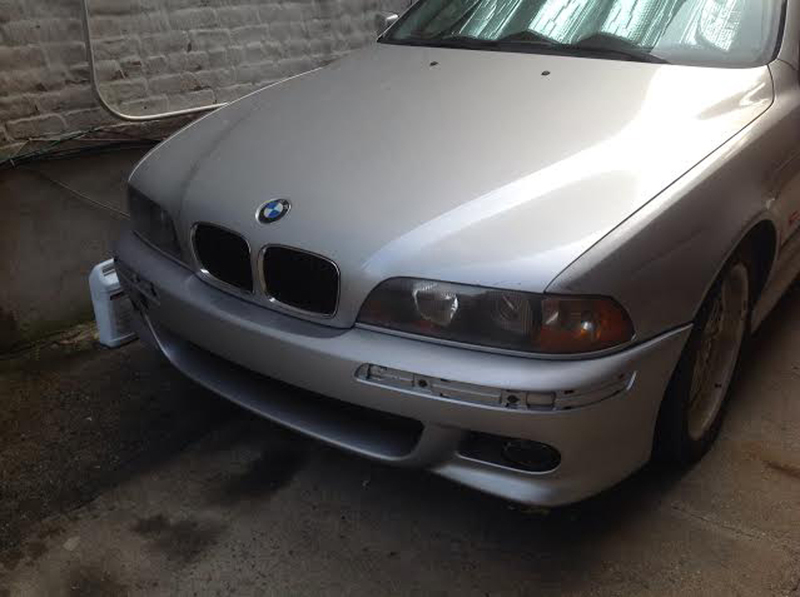 New primed M5 conversion front bumper cover kit. 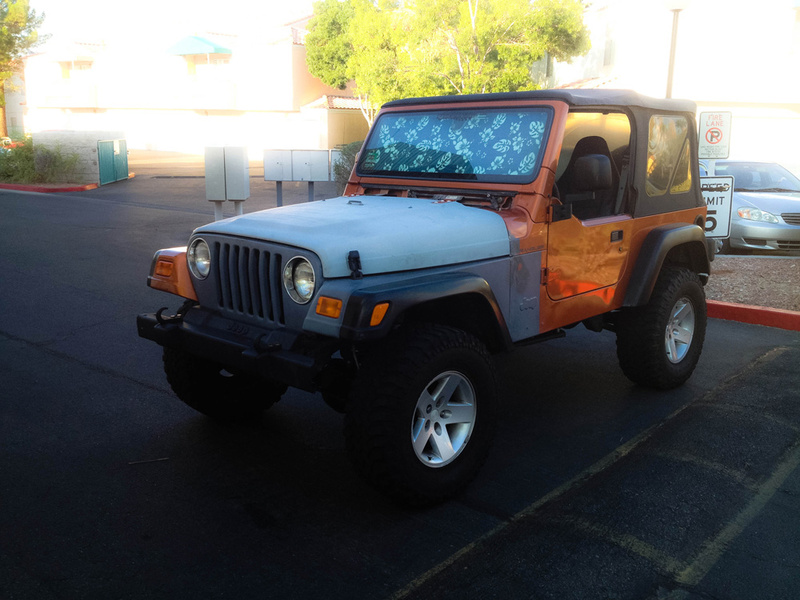 I tried several shops to get it painted. The price ranged from $250 to $500. My patience paid off. I found ATU by accident on the web and decided to give it a try. 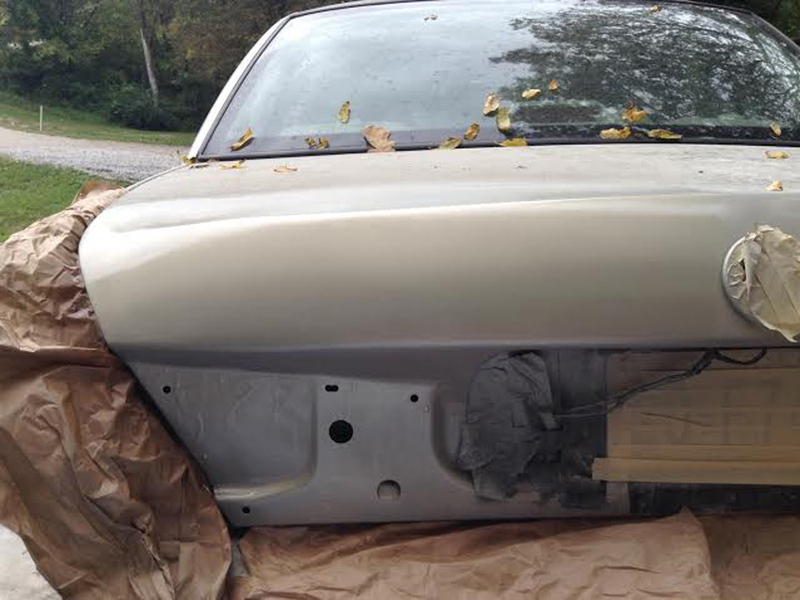 For less than $100 in paint and primer, it came out perfectly. Paint matching was excellent. Excellent results from a can. 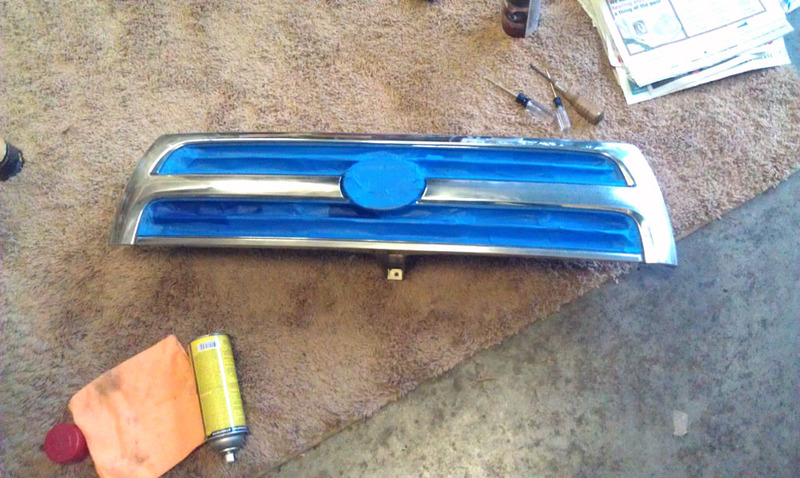 This was my first time painting a bumper. 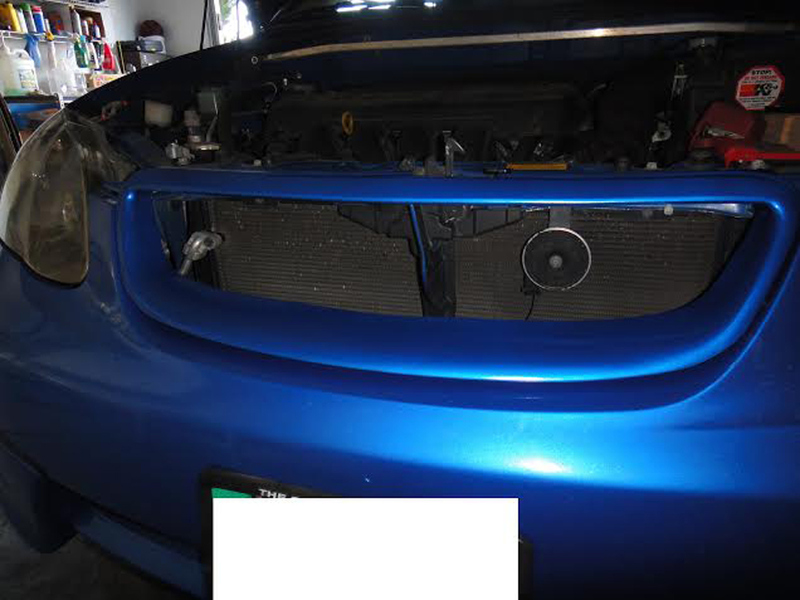 I purchased this car over a year now and was hoping to find a reasonable price for painting the bumper cover. I am glad I found ATU. 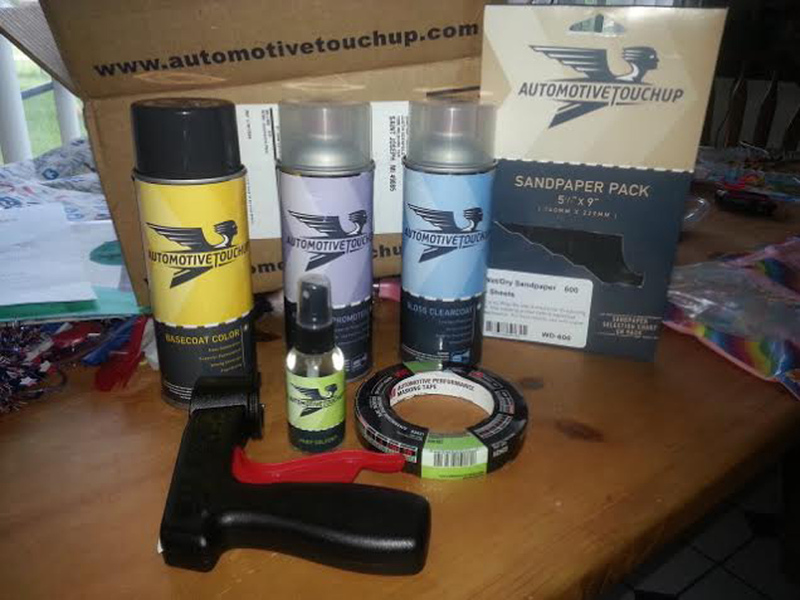 Thanks Automotive Touchup"
"I have used these products on a 7 retired police cruisers. 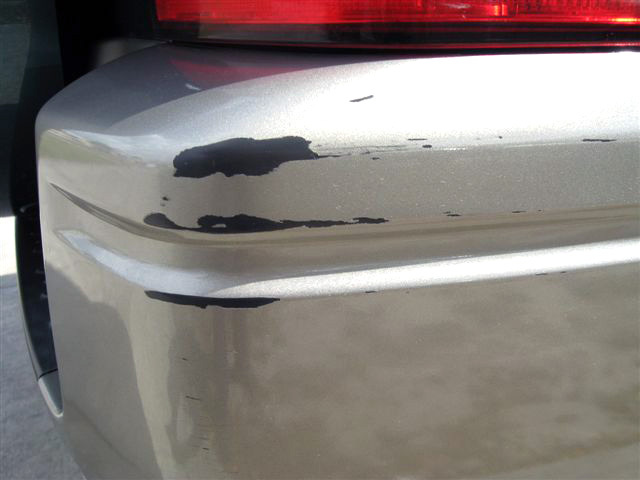 Chipping and flaking of the paint is common. The matches have been perfect every time." 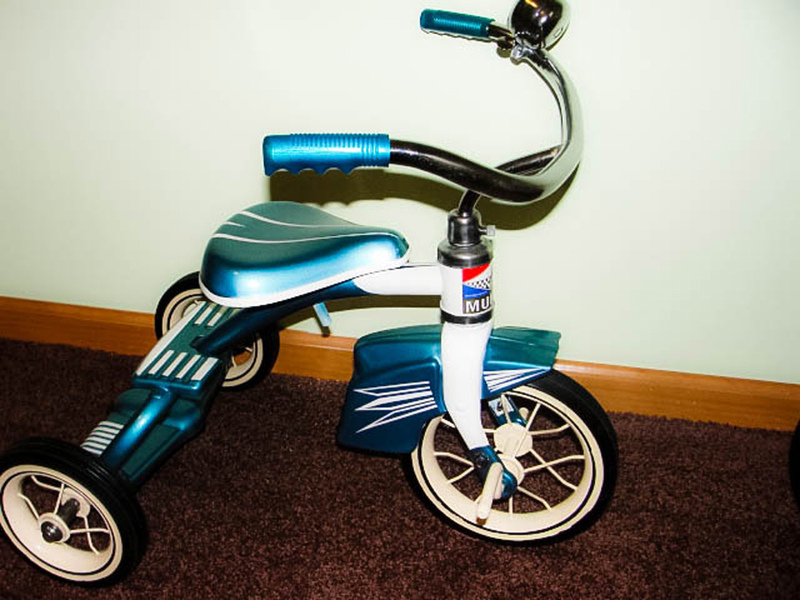 "When I built my bike, I had a painter shoot the tins a 2008 Honda color. 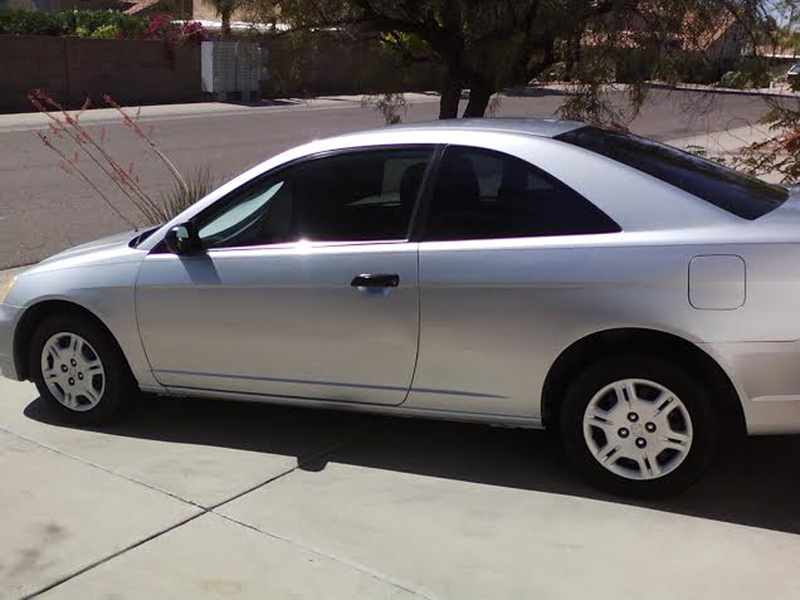 Nimbus gray metallic was the color. 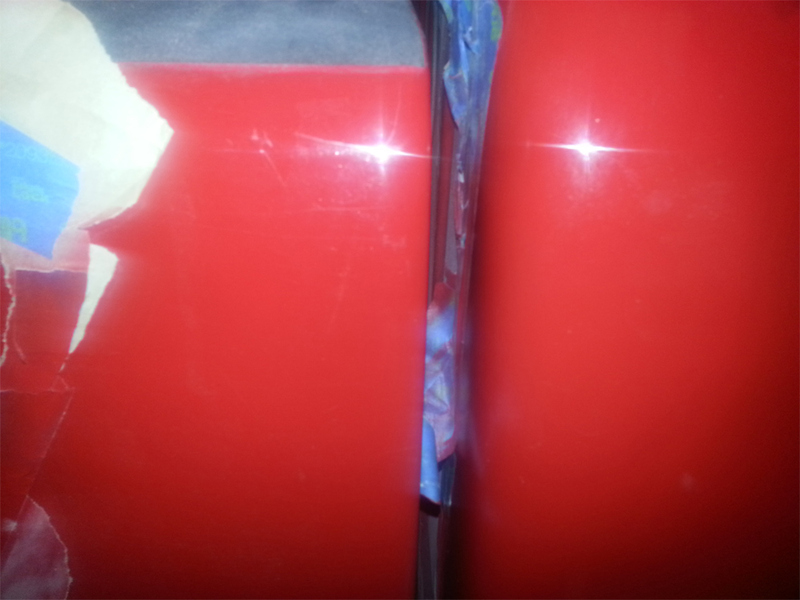 Well, my rear fender developed a crack on the manufacturer seam and I replaced it with a fiberglass rear fender. 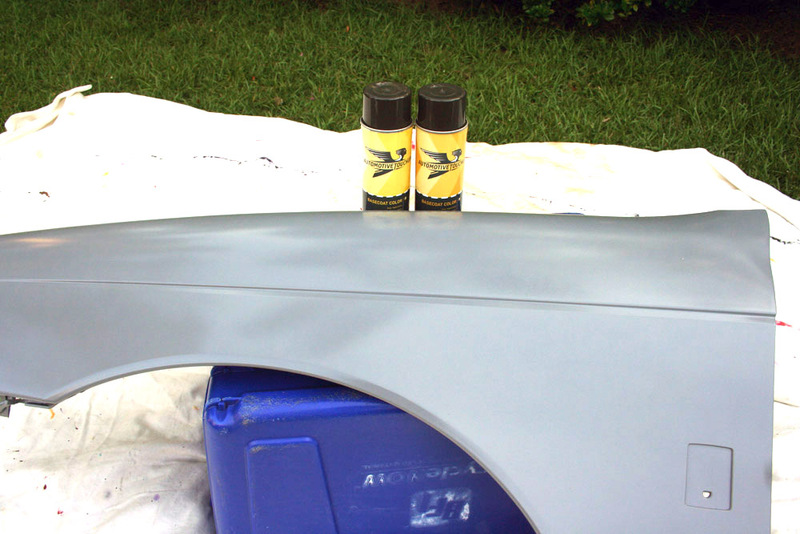 I ordered the aerosol cans of primer, base coat, and the 2x clearcoat. I could not be happier with the results! 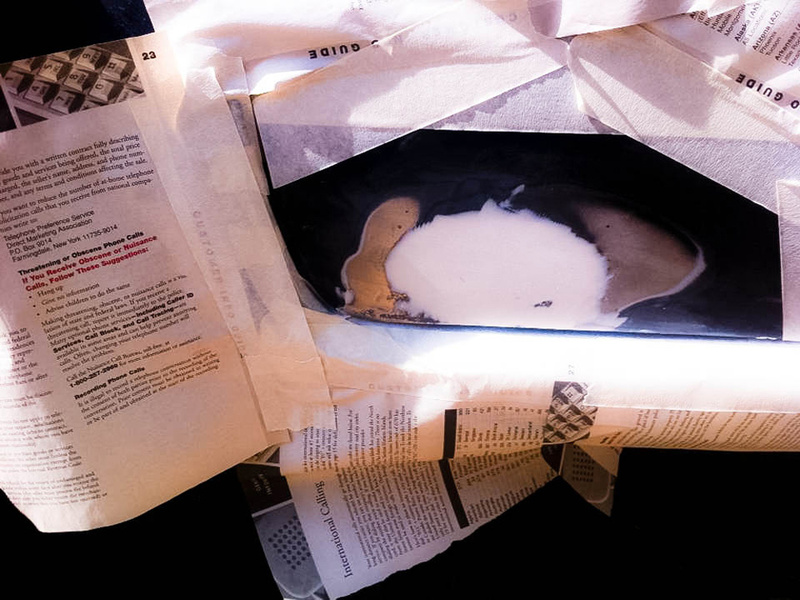 I am not a painter by no means, but if you follow the instructions it sure looks like I am! Great products! I will definitely shop again! Thanks!" 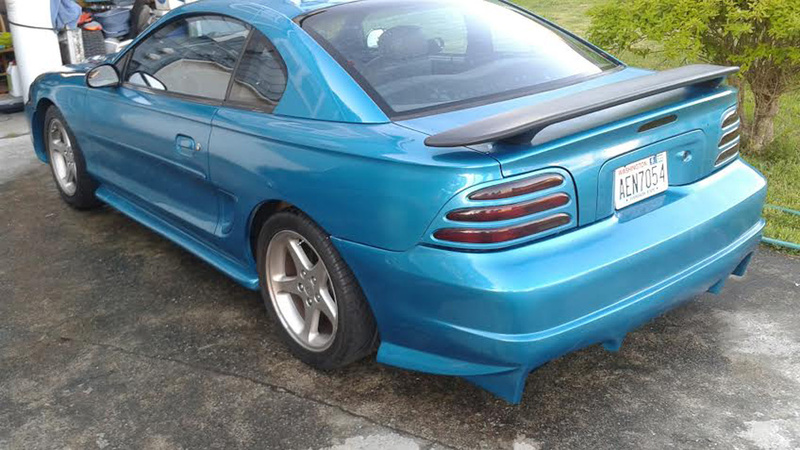 "1993 Mustang GT rear bumper cover." "I just want to say the match is just super!" 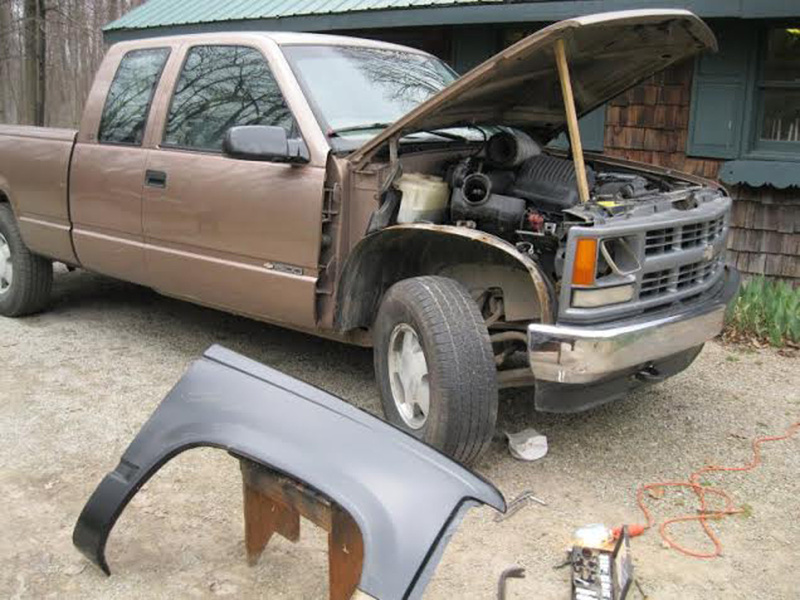 "I'm not done with my project on my 97 4runner. 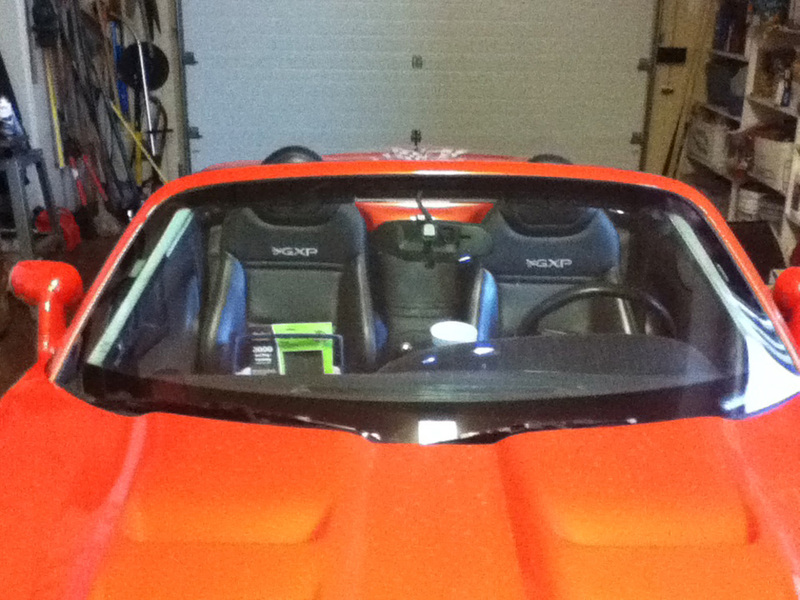 Did my hood and roof. Both of them had no paint left. 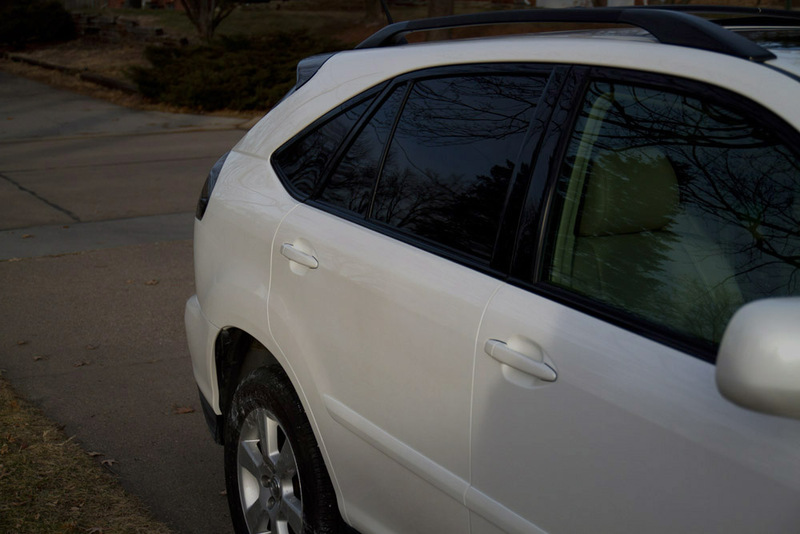 Take a look at the finished results. Not bad huh." 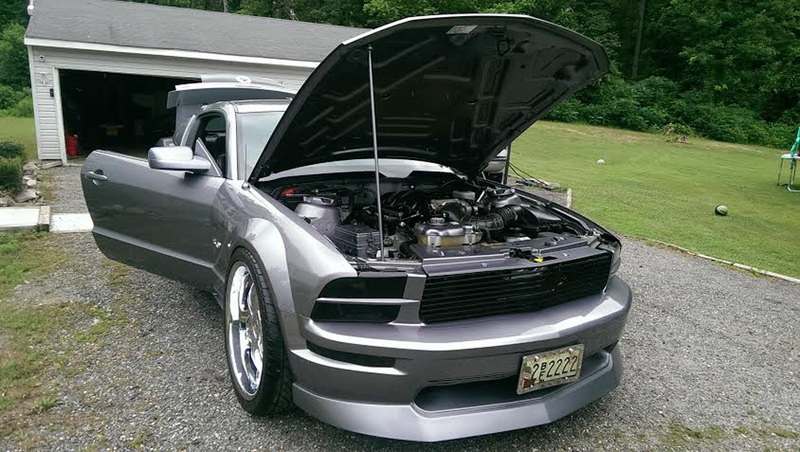 "My 2010 Camaro 2SS. 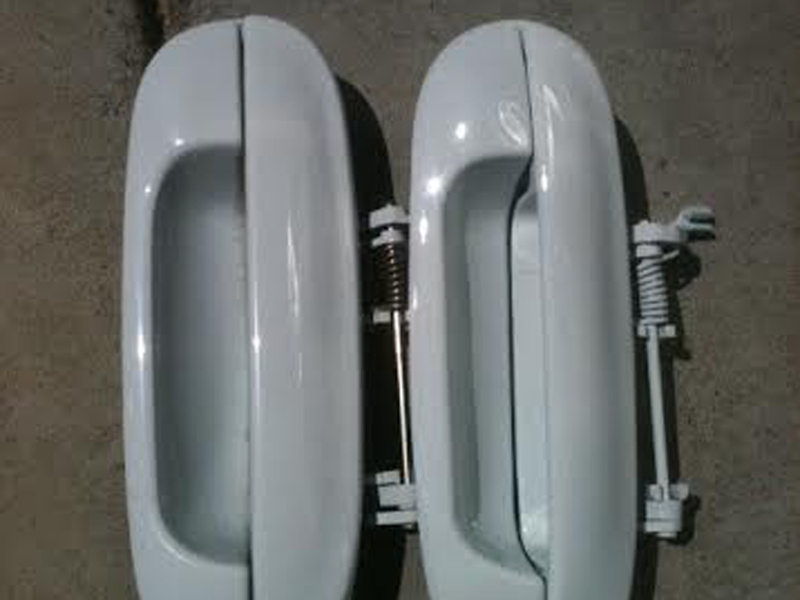 I painted & cleared the lower ACS t-4 sides skirts & front splash gaurds with the bumper black. 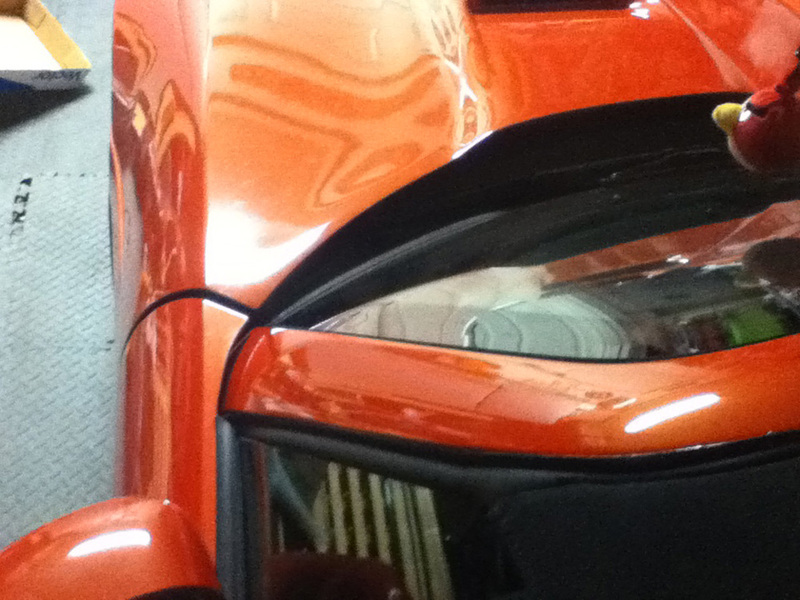 Then painted & cleared the winglets (in front of the rear tire) Inferno Orange metallic, which was a perfect match! 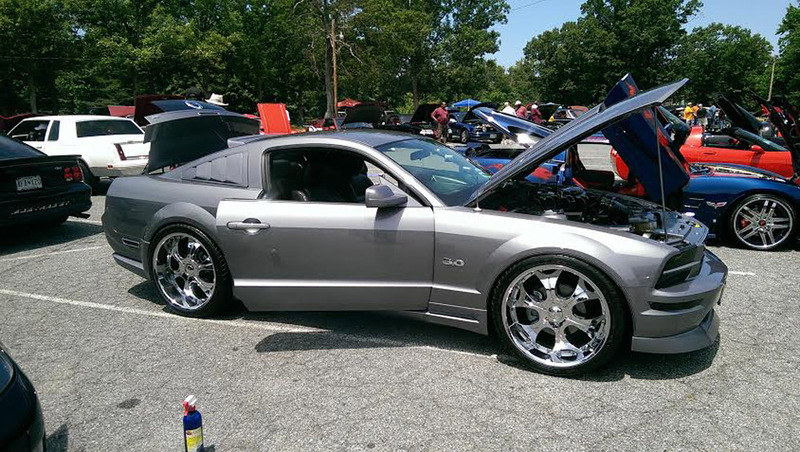 Great products & I always recommend your products at the car shows I'm in." 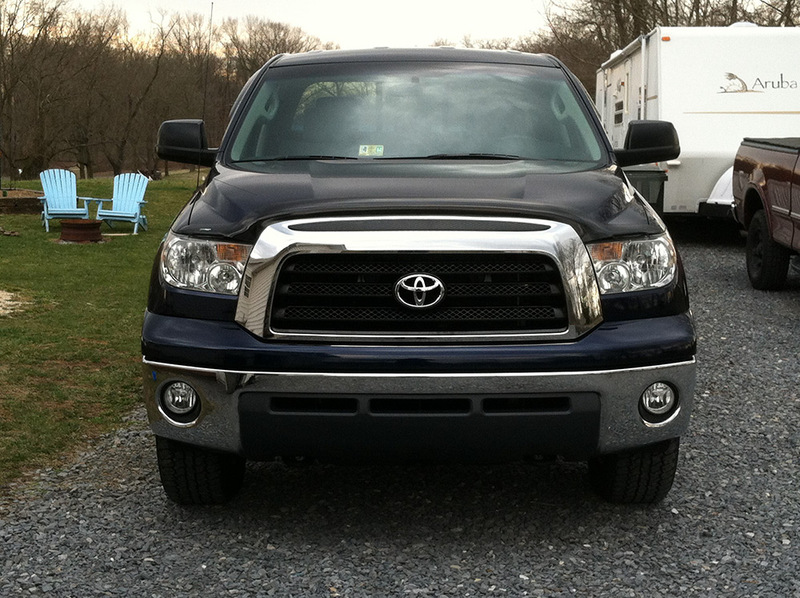 "Ordered a Toyota 8P1 Speedway Blue Metallic and painted my grill. Turned out better then I thought." 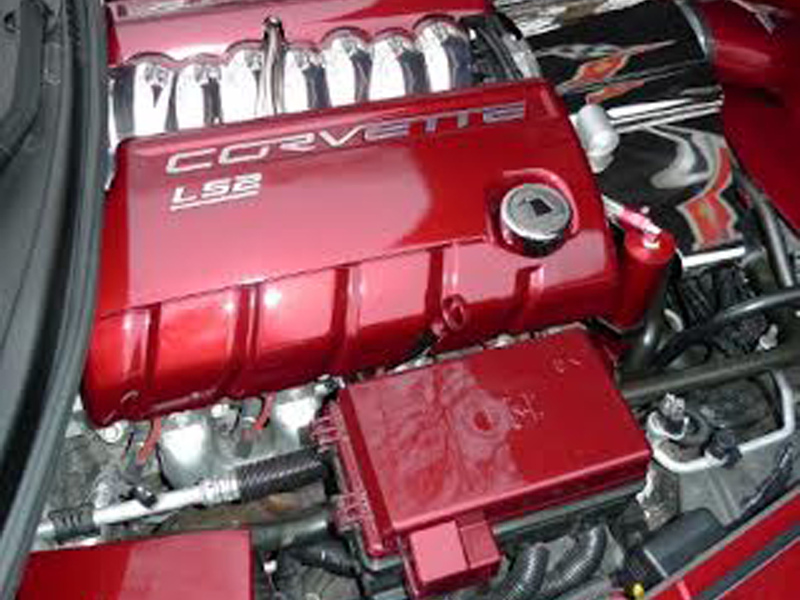 "This is all the work I've done under the hood of my 07 Vette . 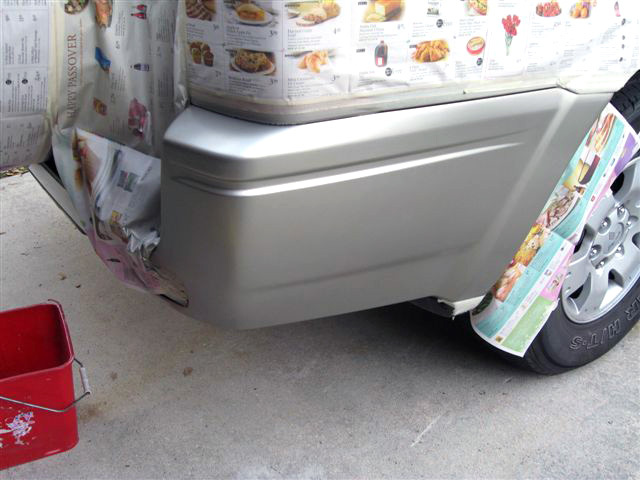 I uses all your products, sandable primer, base coat and clear, adhesion primer, all from rattle cans. 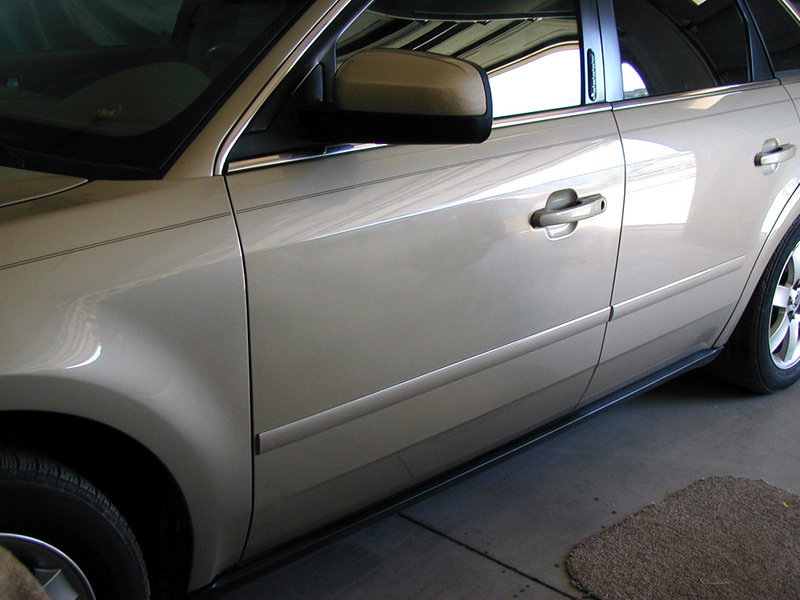 The products have never failed me, color is always spot on, clear sprays beautiful and really shines." 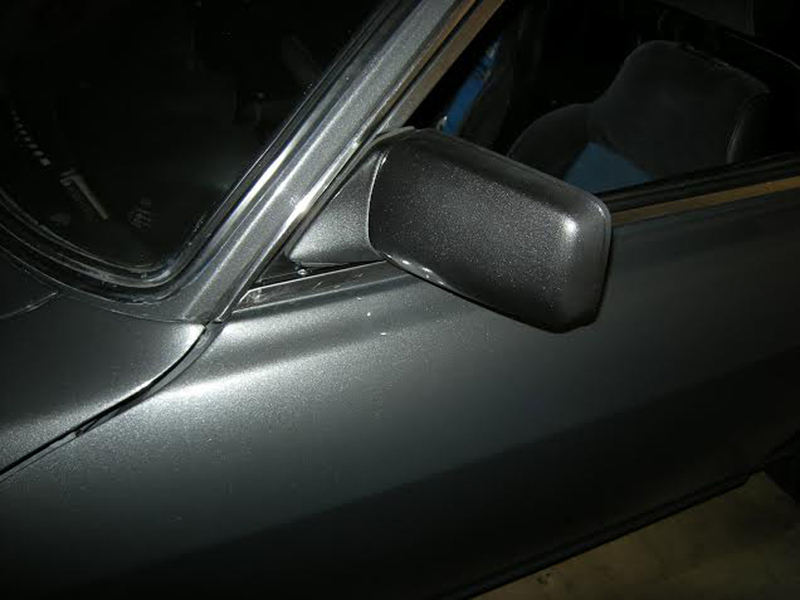 "I destroyed my passenger side mirror and got a replacement with "primer" finish only. 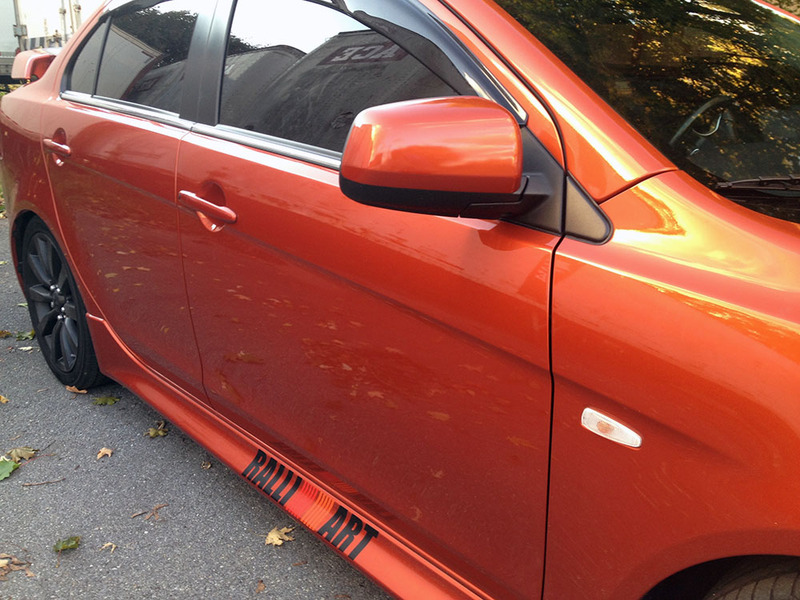 Luckily, I found AutomotiveTouchup on line and submitted the required information. 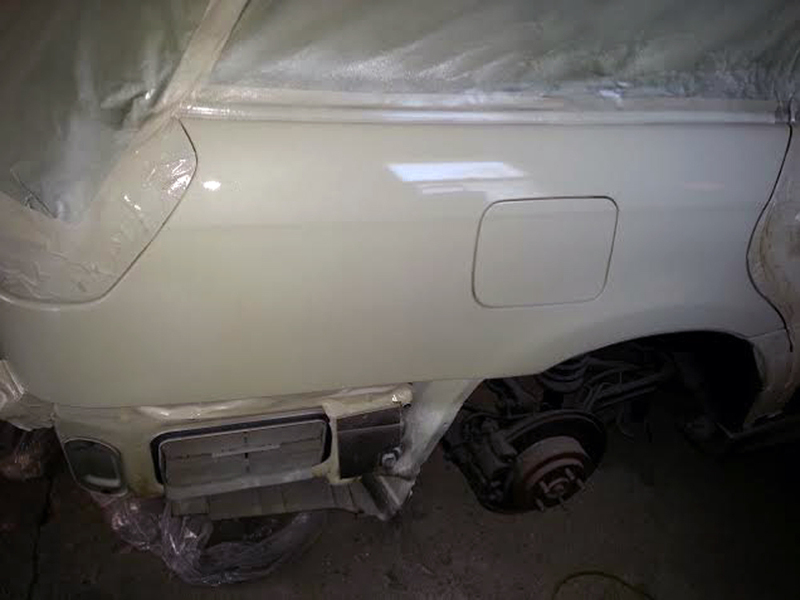 The paint provided is a perfect match to the manufacturer's paint. Thanks." 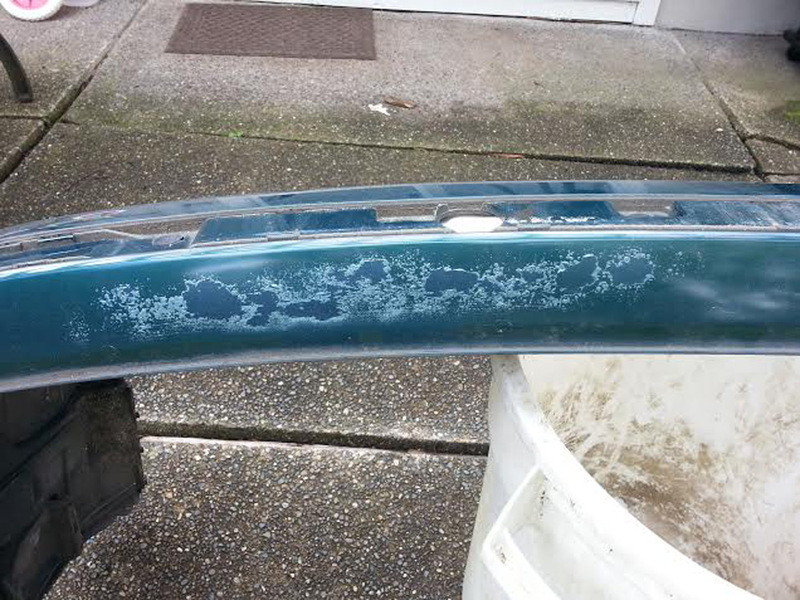 "I had really bad rust near my trunk latch under the weather stripping and on my rear fender right above the wheel-well; which is a common place for cars that handle harsh winters and road salts. 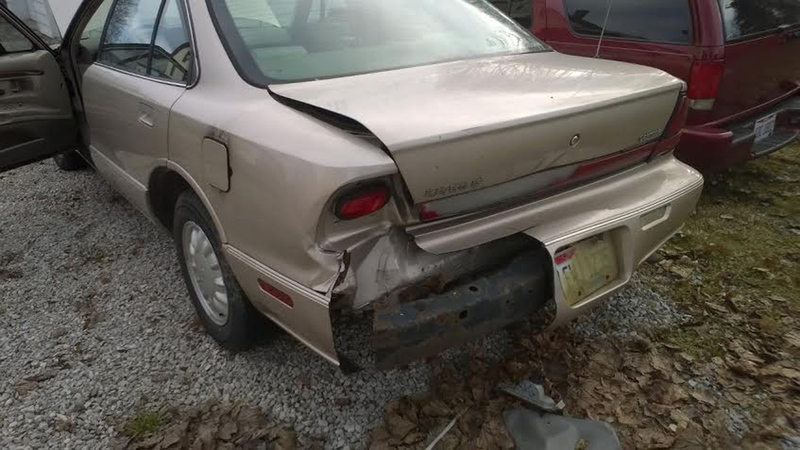 I got quoted $250 for the trunk latch and $600 for the rear fender, which is too much for me. 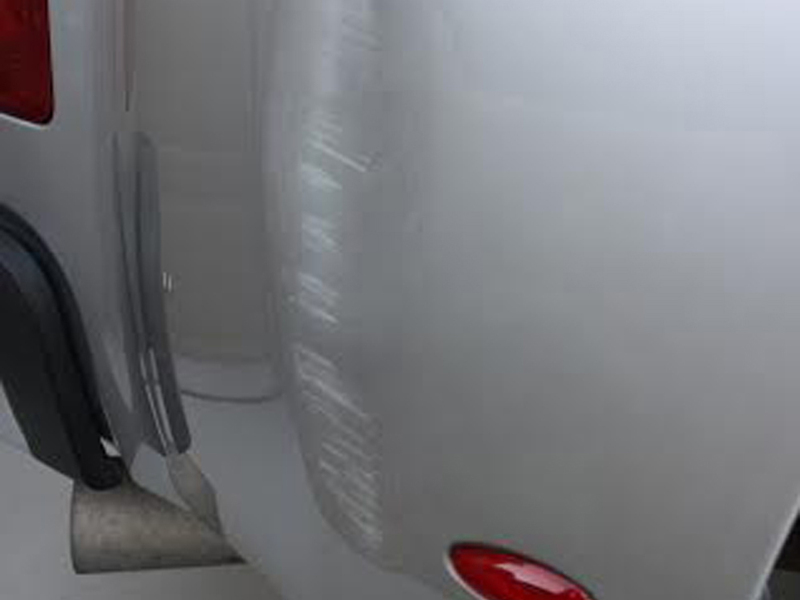 I fortunately came across AutoMotiveTouchUp and decided to go for it (let it be known that I have NO prior autobody experience before this fix). 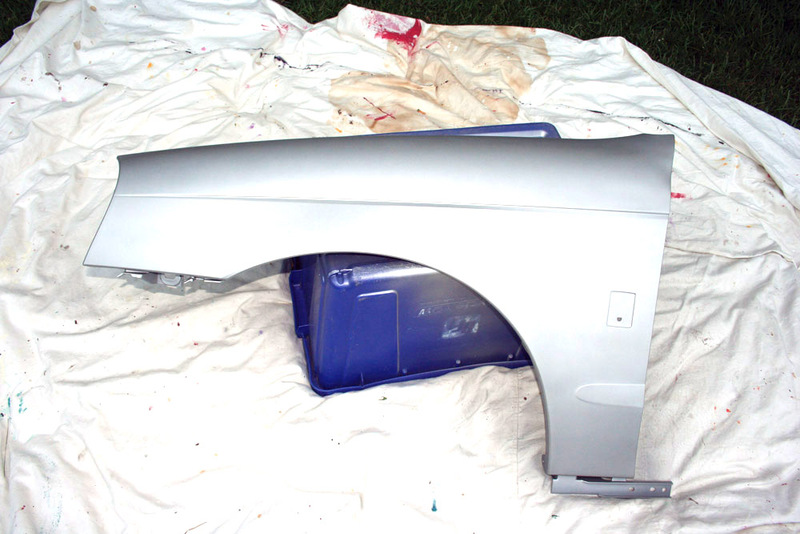 I simply read their aerosol spray instructions and did some research myself and went ahead and ordered the appropriate primer, basecoat by color code, and acrylic clear coat (I did use a catalyzed clear coat for my rear fender which was recommended by an autobody specialist - the 2K Spray Max - which you can get on this site as well). Well, without further ado; I will let the pictures speak for themselves! It is quite a bit of labor but definitely worth it! I spent a total of $100 give or take for all the supplies compared to roughly $900 for a shop to do it! The color match was dead-on when I tested on the test card they supply. 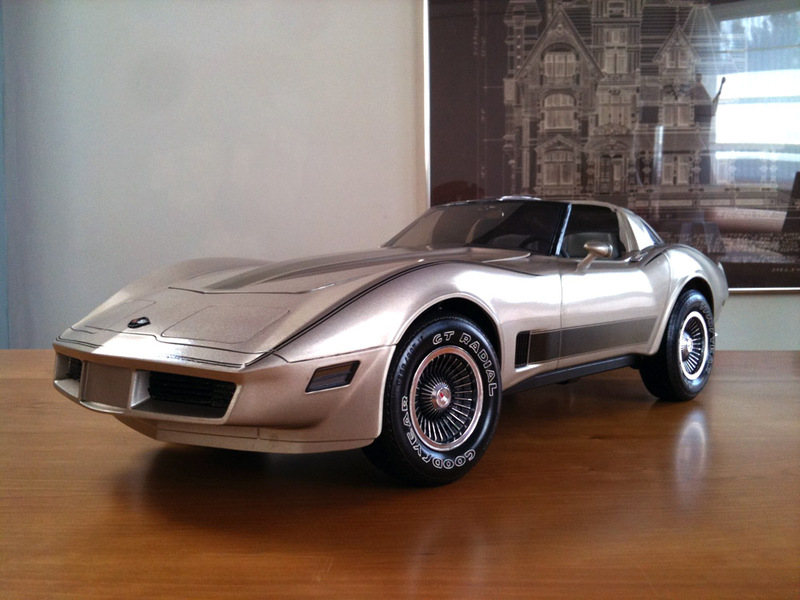 All I suggest is to take your time and spray light coats with the base (silver is probably the hardest to match). 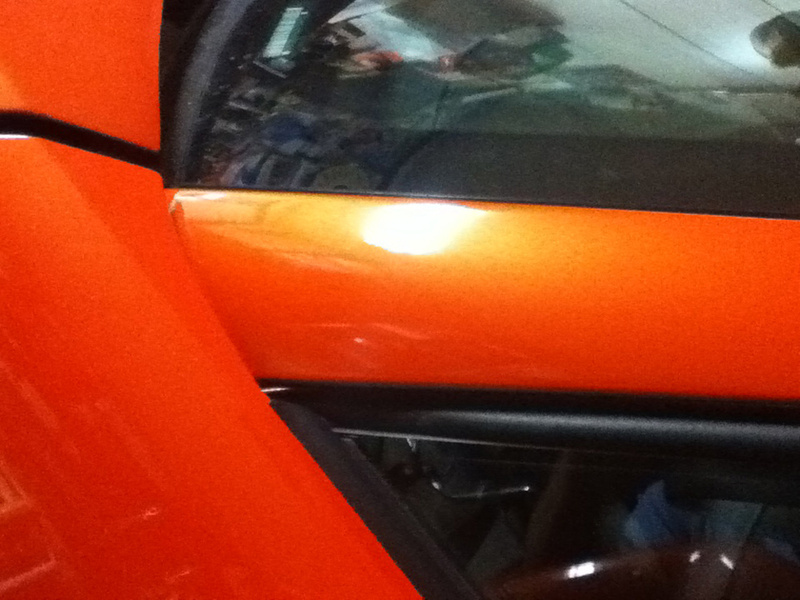 Thanks AutomotiveTouchUp!" 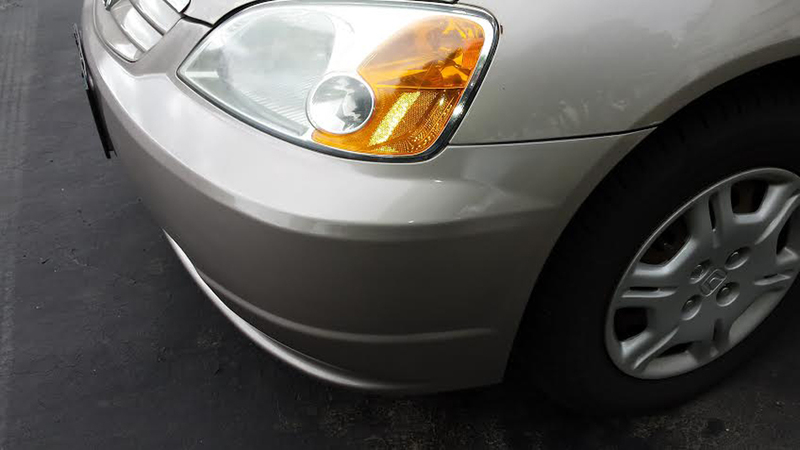 "Toyota wanted almost $2,000 to replace a damaged bumper corner. 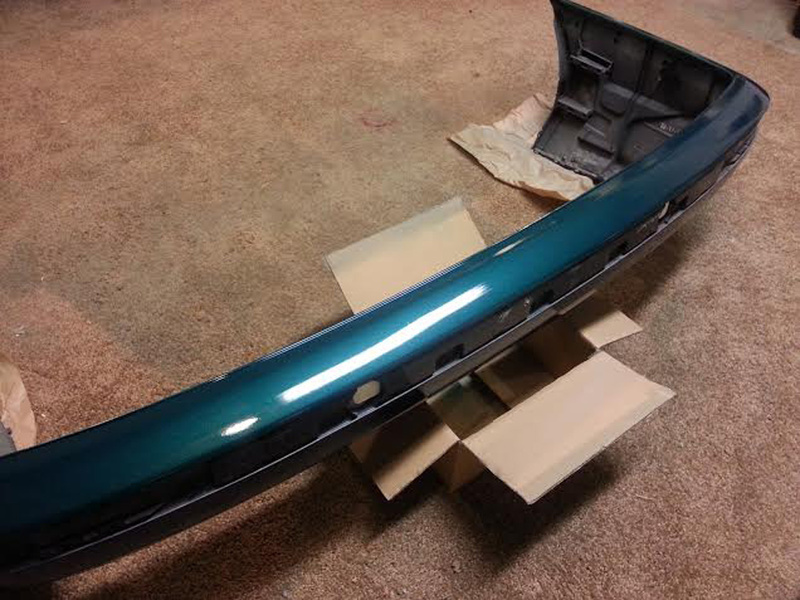 I purchased an aftermarket bumper corner for $35 from rockauto; paint and clear coat from automotive touch up for $35; and primer from Sherwin Williams for $25. 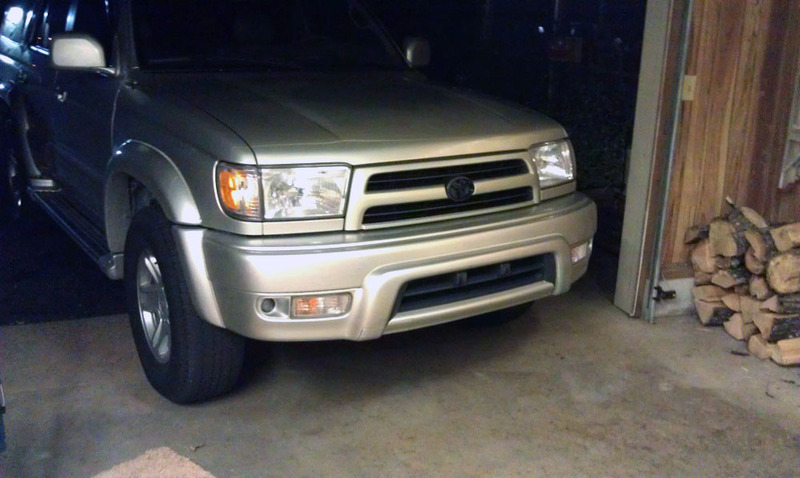 After the work was completed, it look as good if not better than the work Toyota would have done. The paint was a near perfect match. 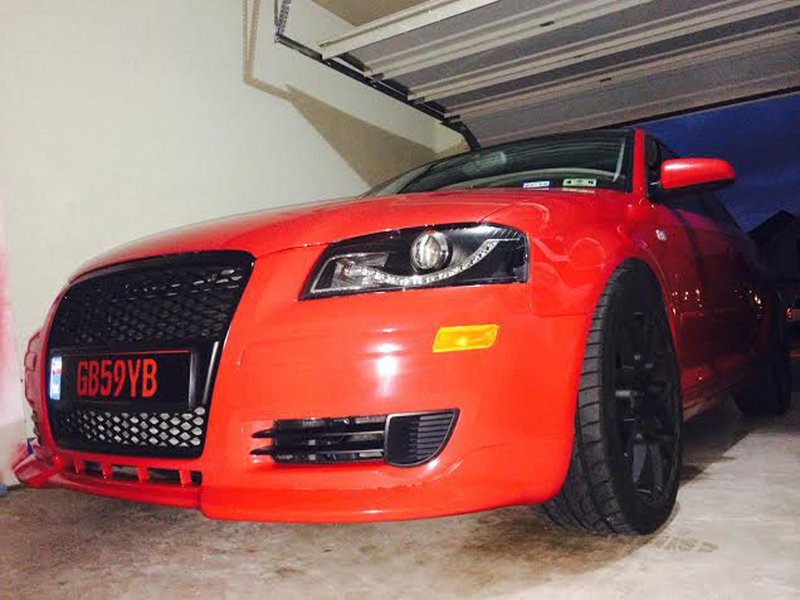 I am really satisfied with the results." 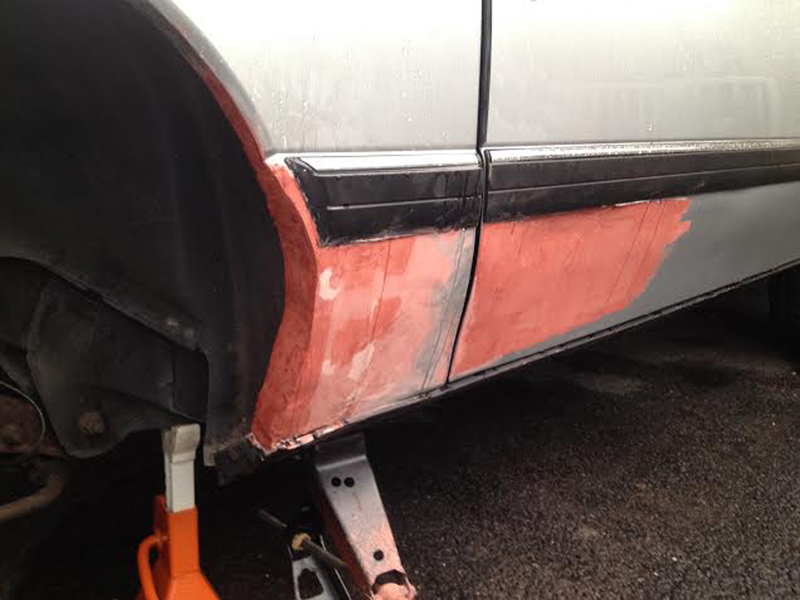 "2001 Jeep Grand Cherokee Laredo Fender- I am not a professional auto body guy or painter. 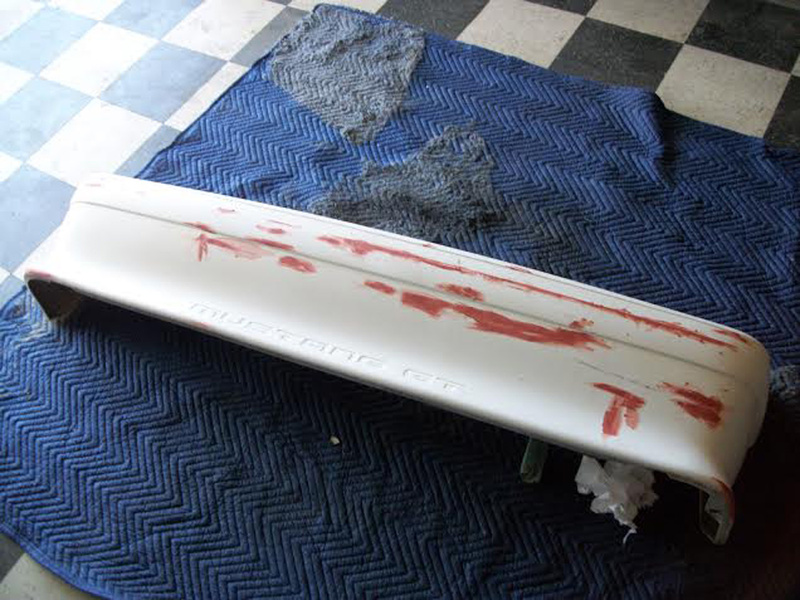 I ordered a new fender on ebay and it came in primed. 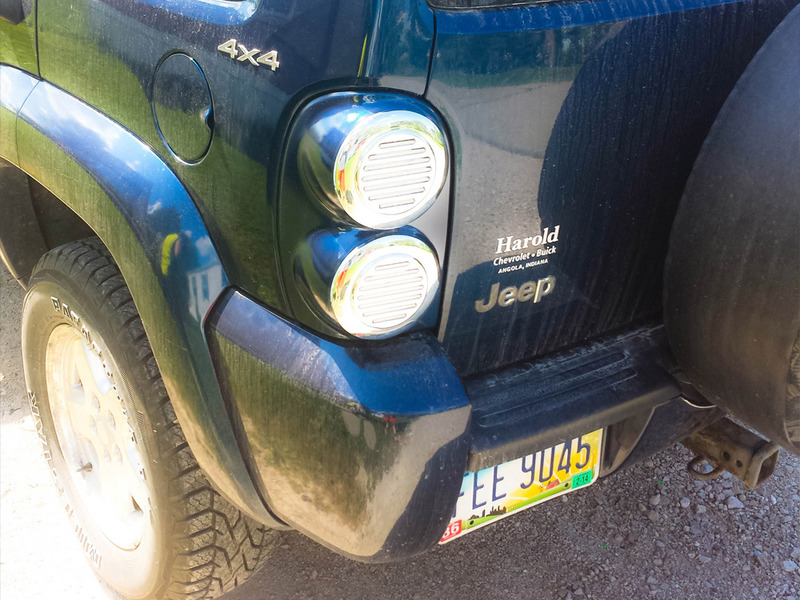 I just scuffed it up with a scuff pad and cleaned it up with glass cleaner and a lint free painters towel. 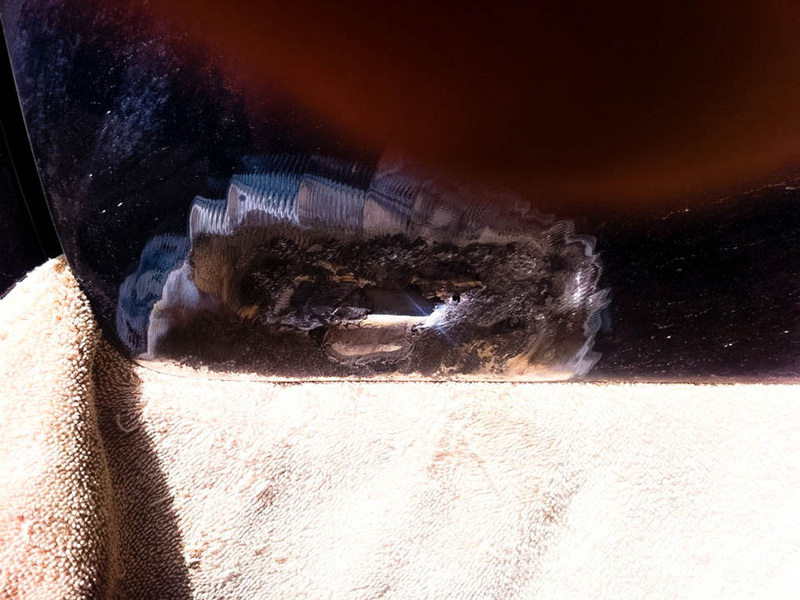 Used a tack cloth to remove any dust. I ordered your Aerosol spray with your pistol grip handle. 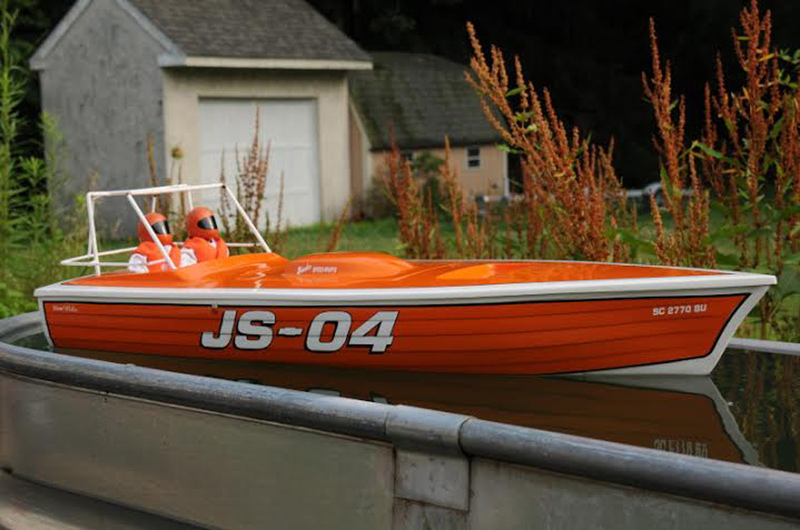 The color was perfect and the paint job looked professional. 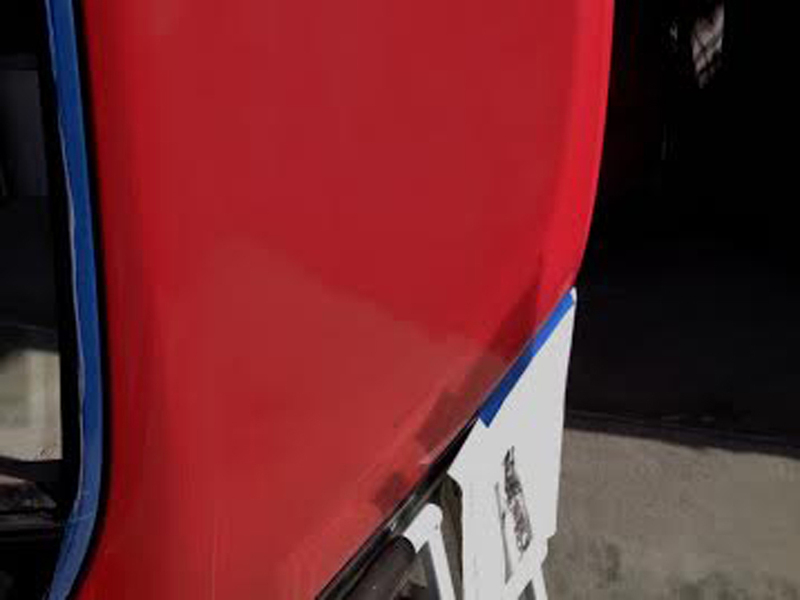 I could paint a whole car using this product and save a ton of $. I will definitely be buying more in the near future. Great product." 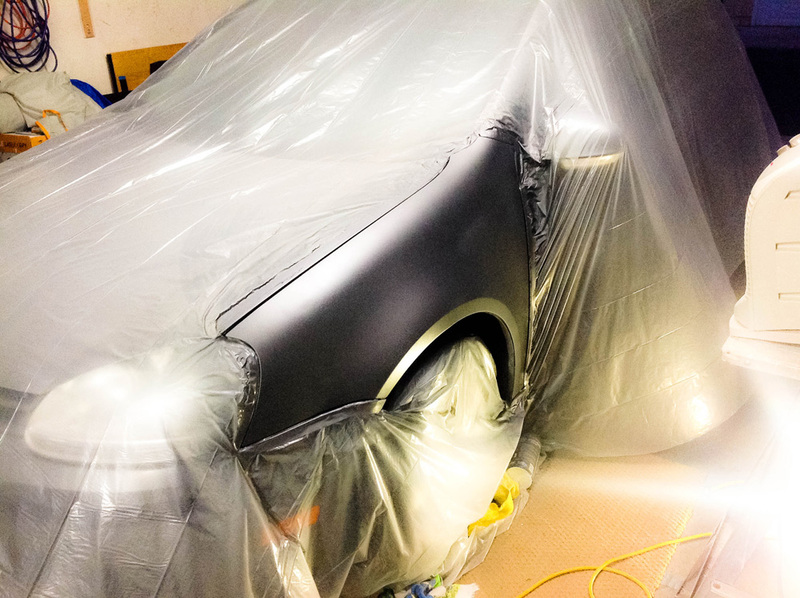 "As a 25 year "hobby" painter, I have sprayed about every type of Automotive paint to include lacquer, Imron, Centari and base coat/clear coat. 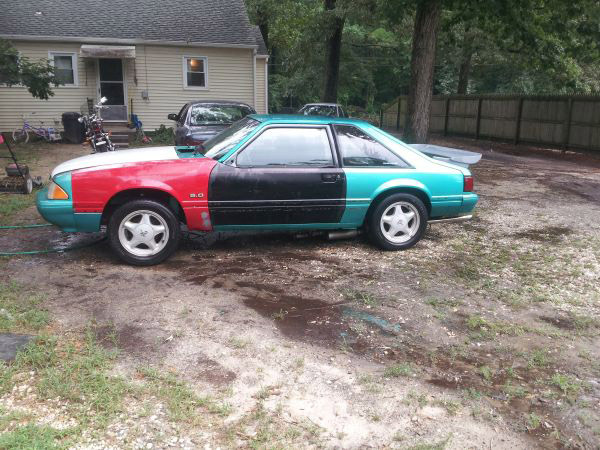 I was a little skeptical on the paint match. I was VERY please with the outcome. 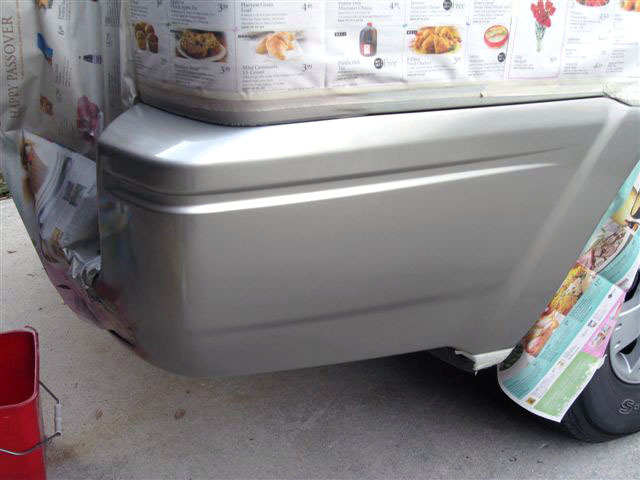 Helping fix a neighbors car it needed a new bumper cover so I ordered the Adhesion promoter, Base Coat and Clear in the aerosol cans. Paint match was perfect. 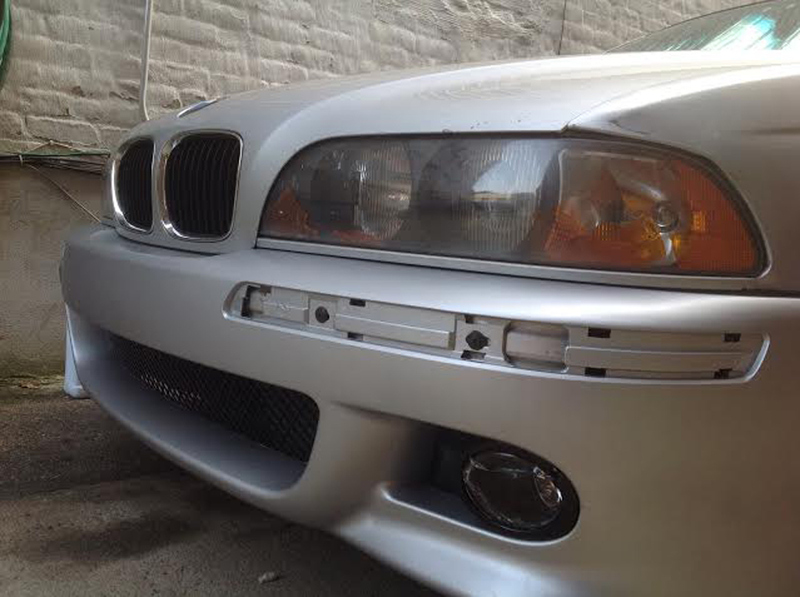 In the photo of the grille (original paint) its right against the new cover. Perfect. And I was surprised with the aerosol clear that it was actually a two part clear, with the activator in the bottom of the can! Nice! 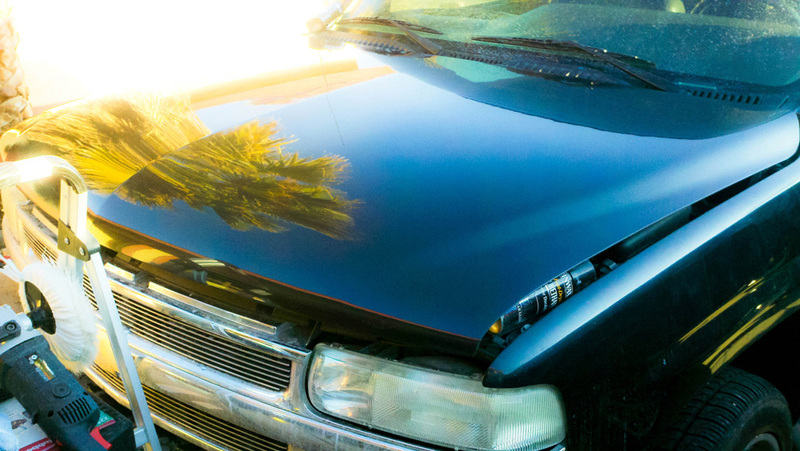 I would definitely recommend Automotive Touchup. 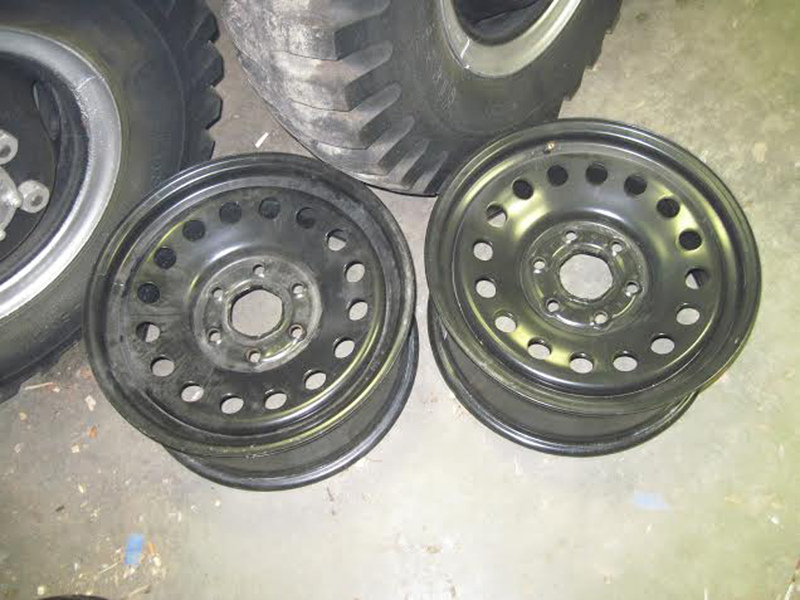 I will be a repeat customer for these types of smaller jobs, but also think they will beat my local vendor on quarts if i need that." 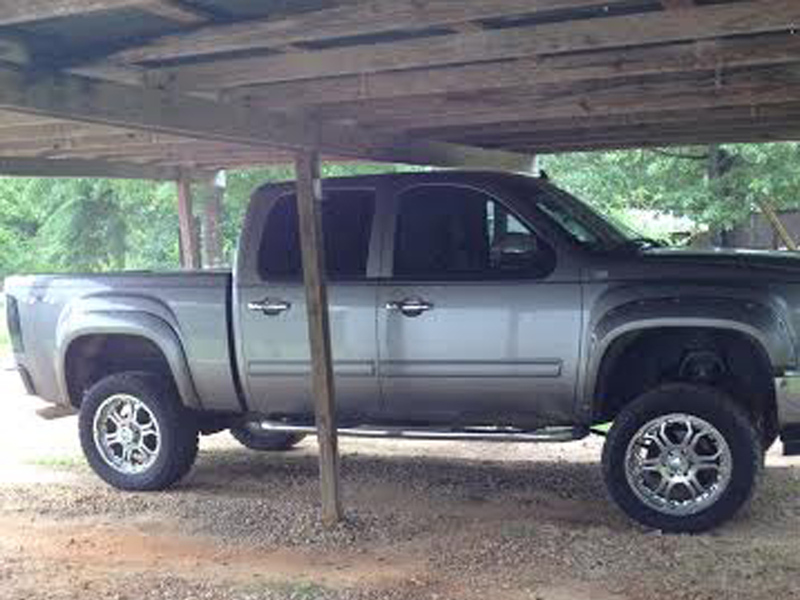 "My 17 year old baby with a new front fender. Great color match. 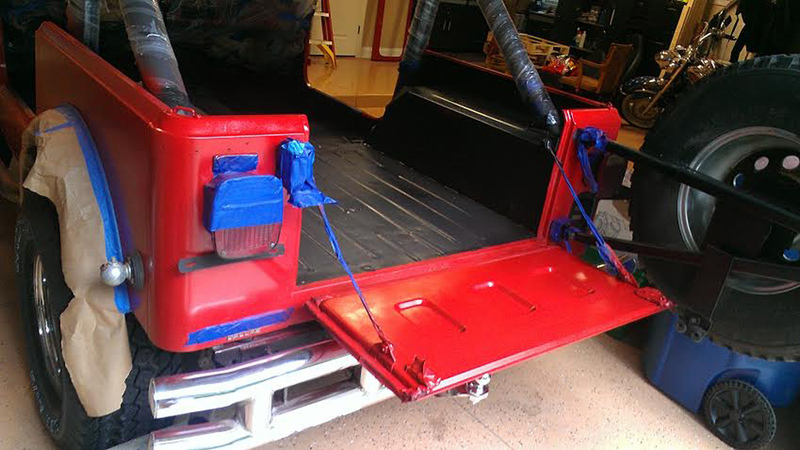 forgiving paint to work with, Fan spray was very helpful"
"My old 97 Chevy pickup with new passenger side front fender." 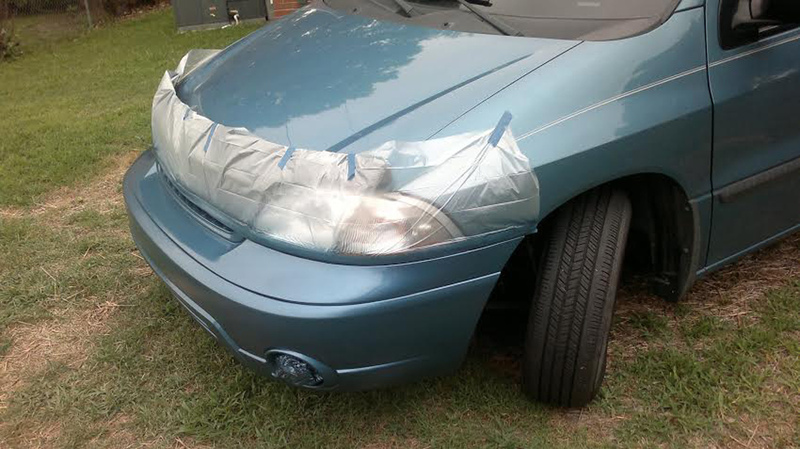 I have no body work experience, and got some estimates. 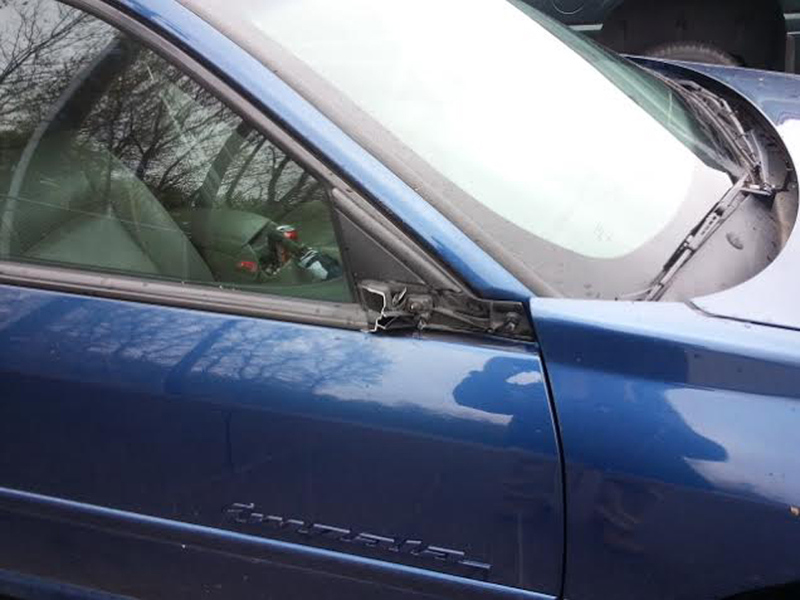 Needless to say, a professional repair was out of the question, with estimates near $1000. 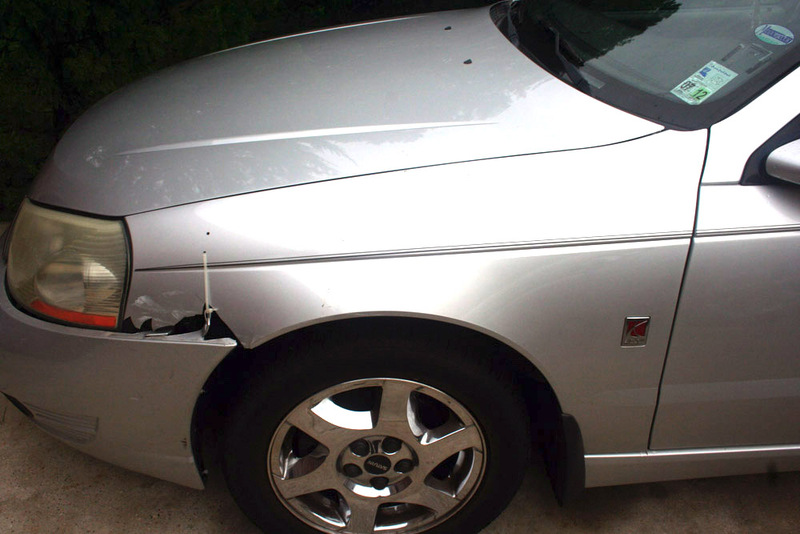 So it was time to learn to fix it myself, again. 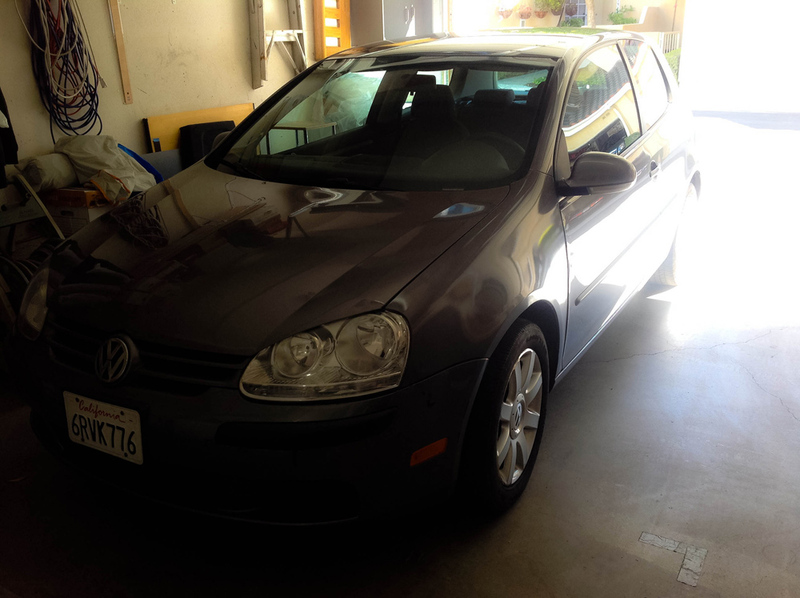 After watching the videos posted, and summoning up the courage, I pulled the trigger and trusted Automotive Touch-Up to help me finish strong. 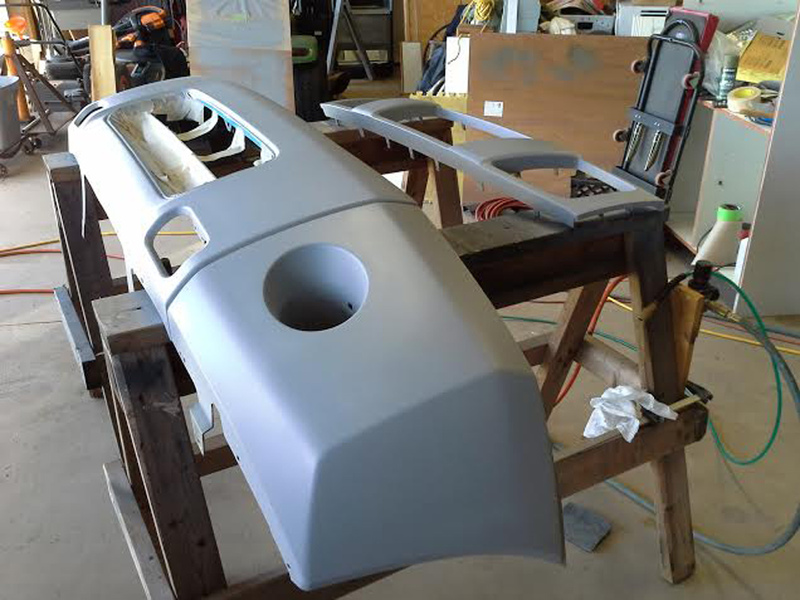 I ordered everything I needed, sandable primer, color match paint and clear, as well as the spray gun handle to help blend everything together nicely. I did the test card, and was really surprised with the results, a near perfect match. 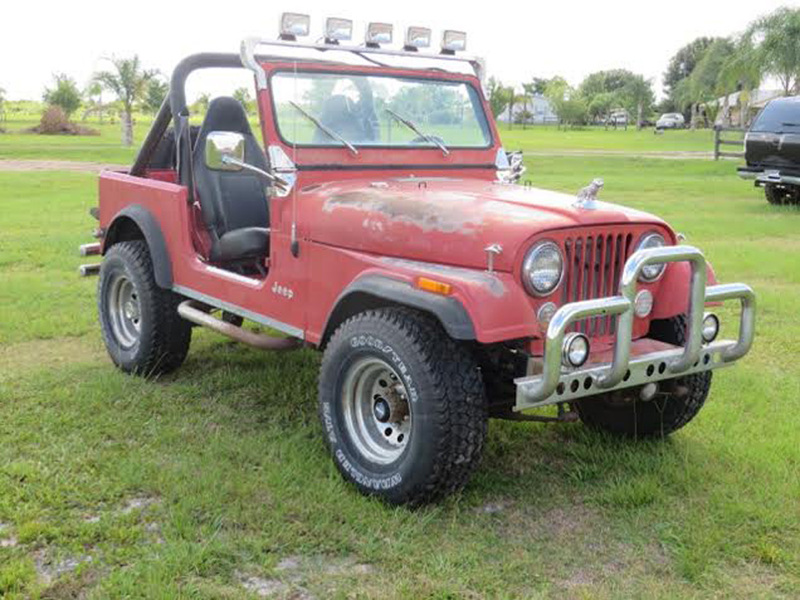 Not to shabby for a guy with no body work experience. So after a good long Saturday, I got everything finished. 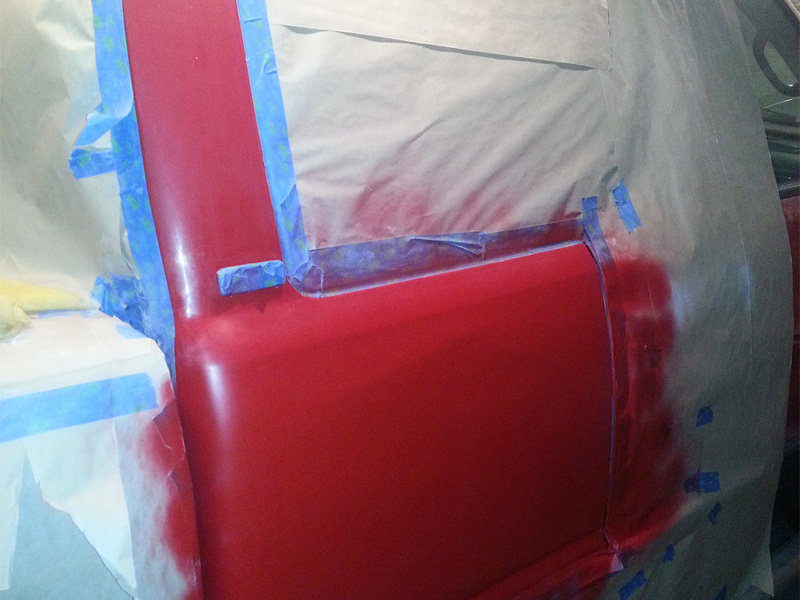 6 coats of base color to match, and 5 more coats of clear. 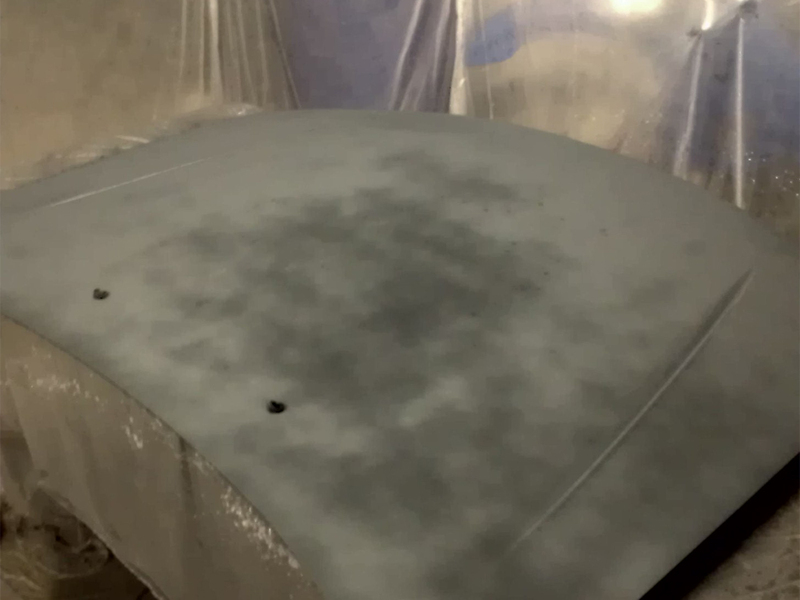 I won't lie, I wish the paint dried a little faster, as everyone knows there is more exciting stuff than watching paint dry. 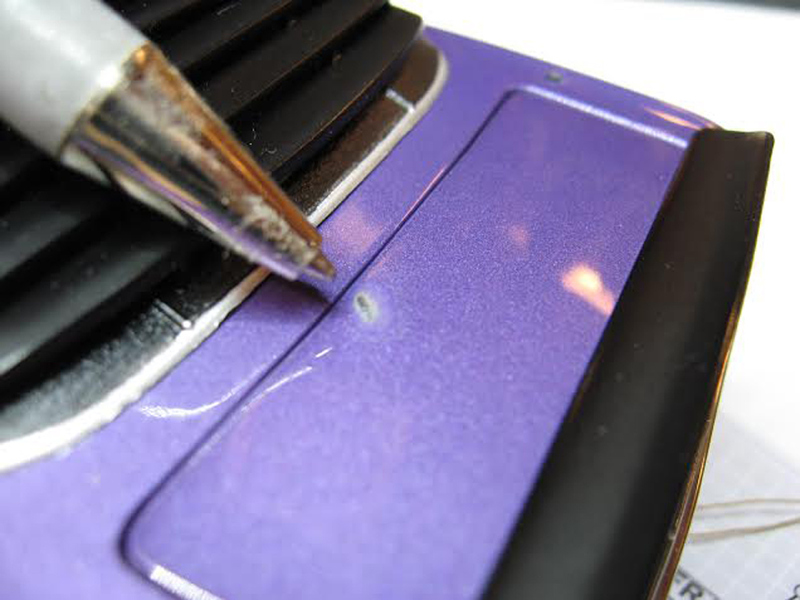 Thanks for providing a great product, and good videos on how to repair even the worst damage like a pro." 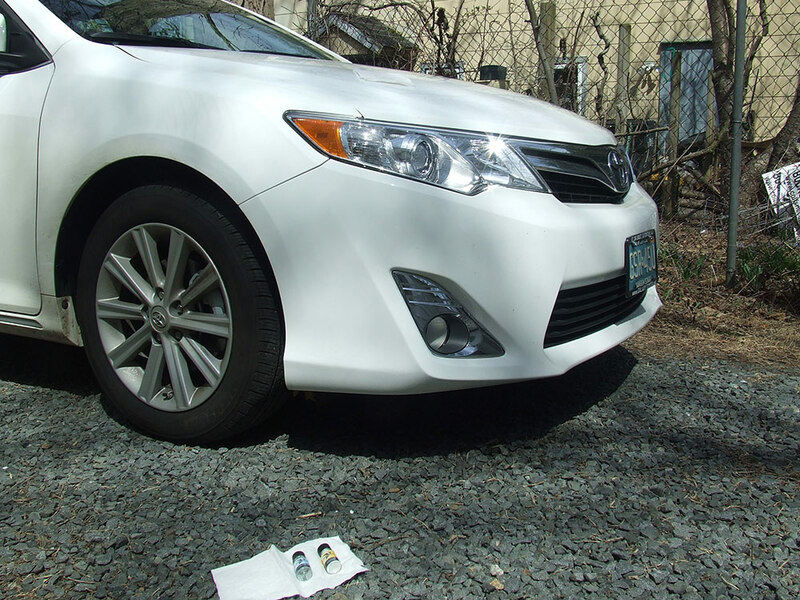 "I've heard and read a lot of good results from using automotive touch up, so I opted to try their aerosol spray can for something a little different. 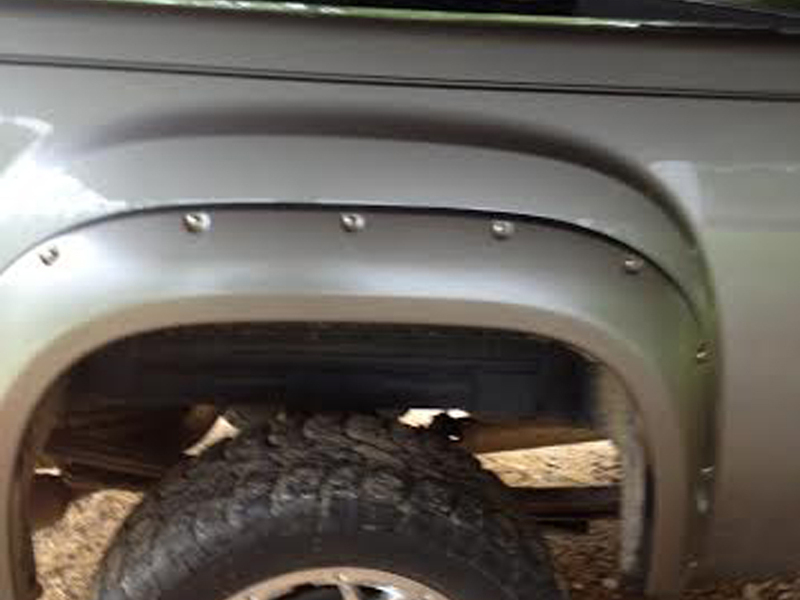 I had recently ordered a set of fender flares for my truck, and decided to paint them myself as a cheaper option. 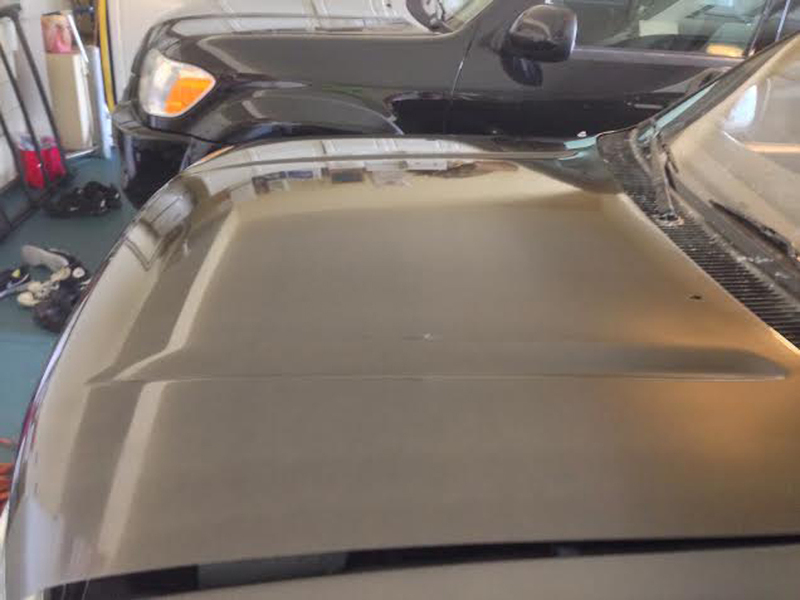 I ordered 3 aerosol cans of gray stone metallic from automotivetouchup.com and the finish product was like the GMC factory had professionally painted these bad boys. 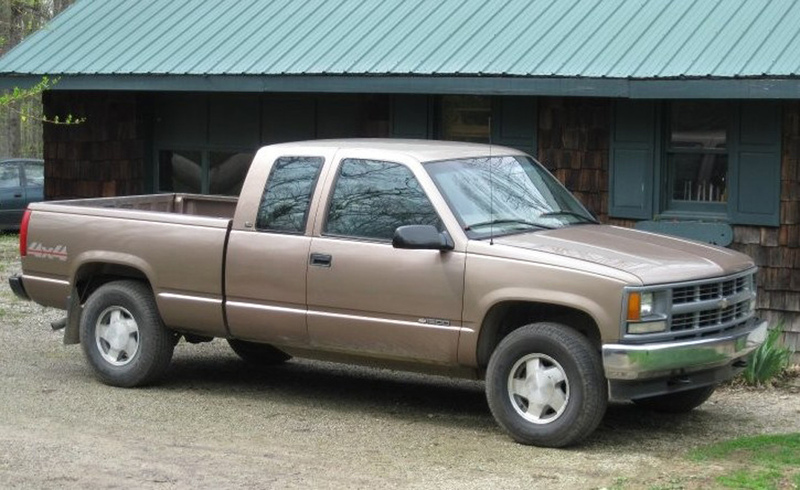 It was an exact match to the color of my 2008 GMC Sierra. 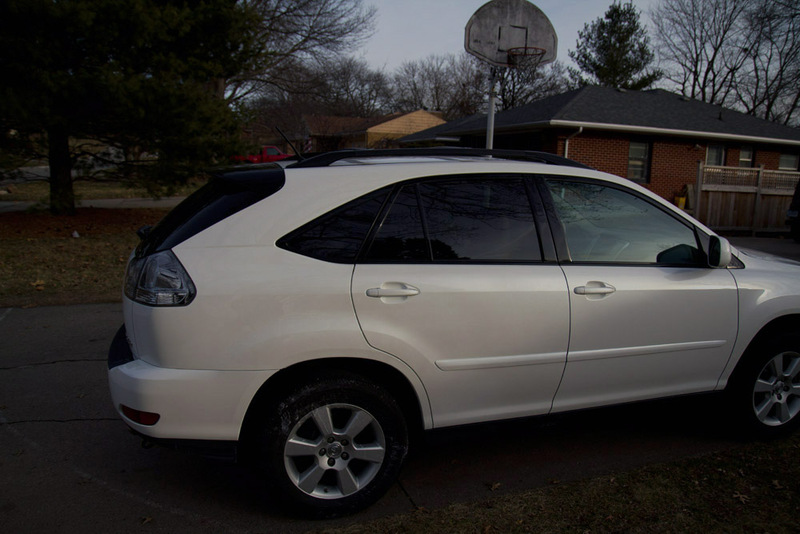 I would highly recommend this company for touch-up and any other accessories added to a vehicle." 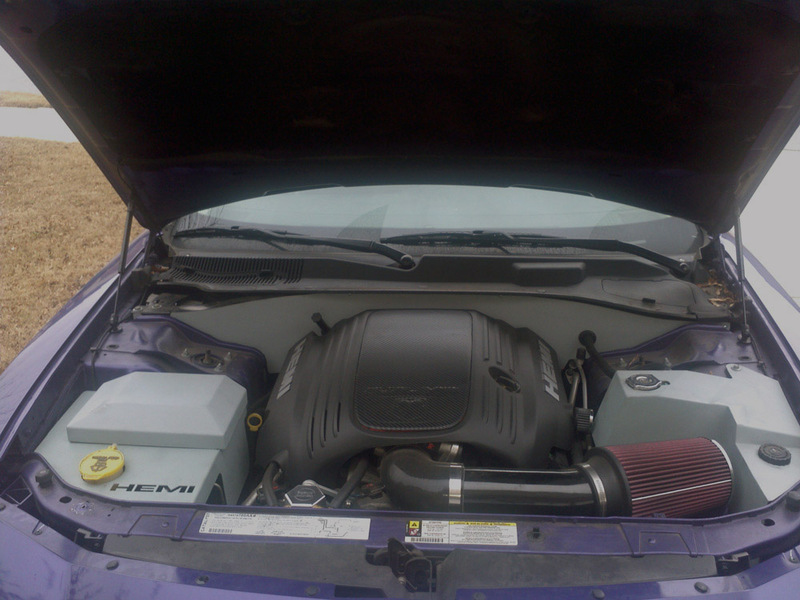 "Inner & under hood + fender!" "I wish I would have taken before pics of these mirrors! I really did not know what to suspect. 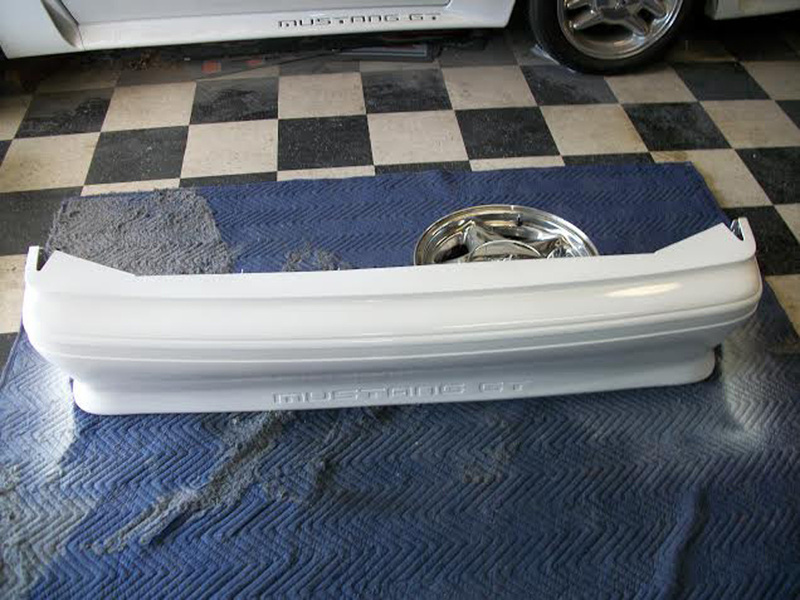 I decided since the mirrors turned out absolutely perfect, I am now going to do the bumper next (The mirrors looked just liked this bumper before I did them). 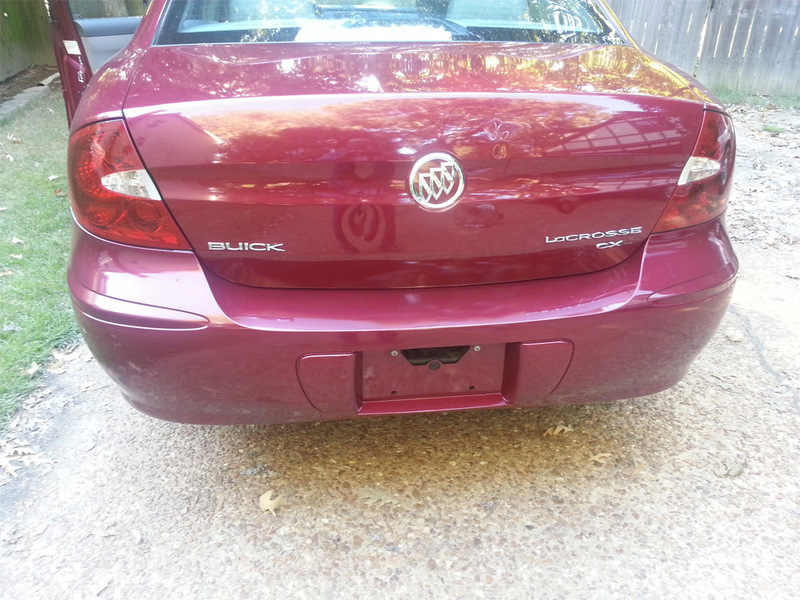 I will submit pics of the bumper when I do it. 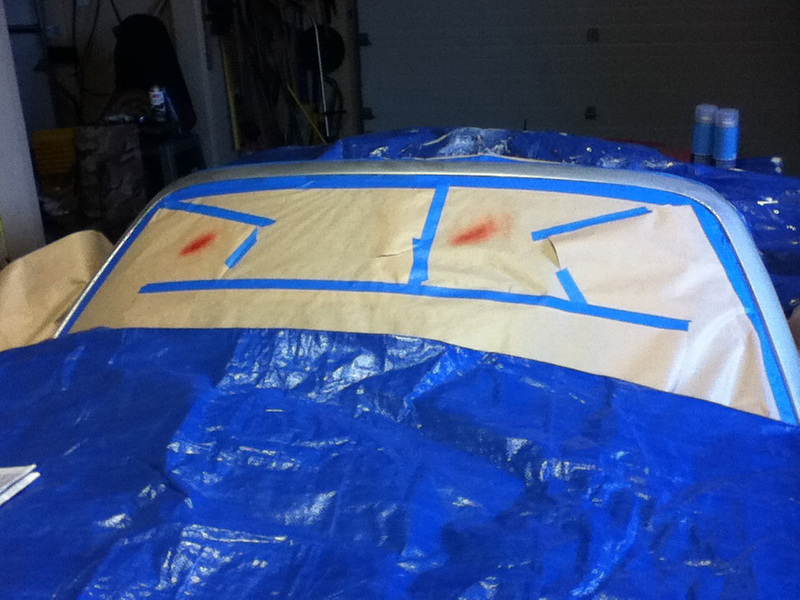 This saved me from painting an entire car!" 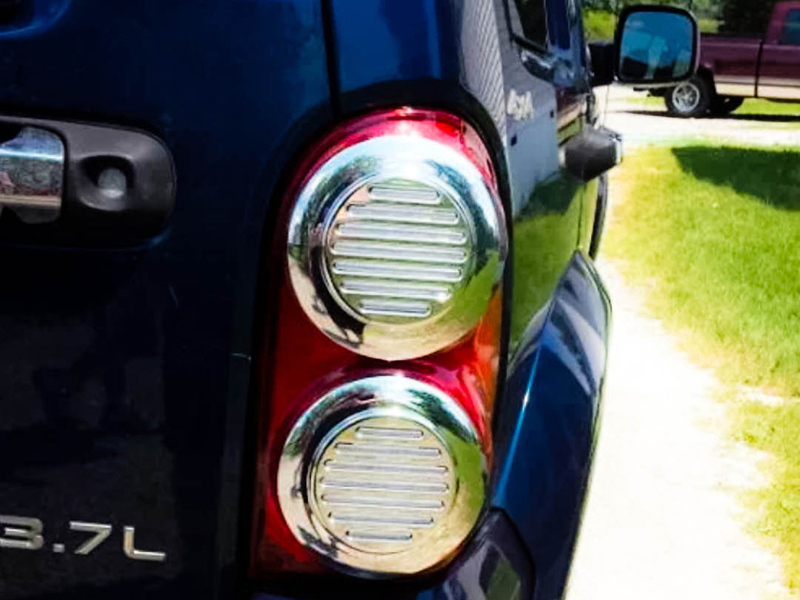 "This review will hopefully help others make the decision and order from Automotive touchup to make that repair at home easy and save money. 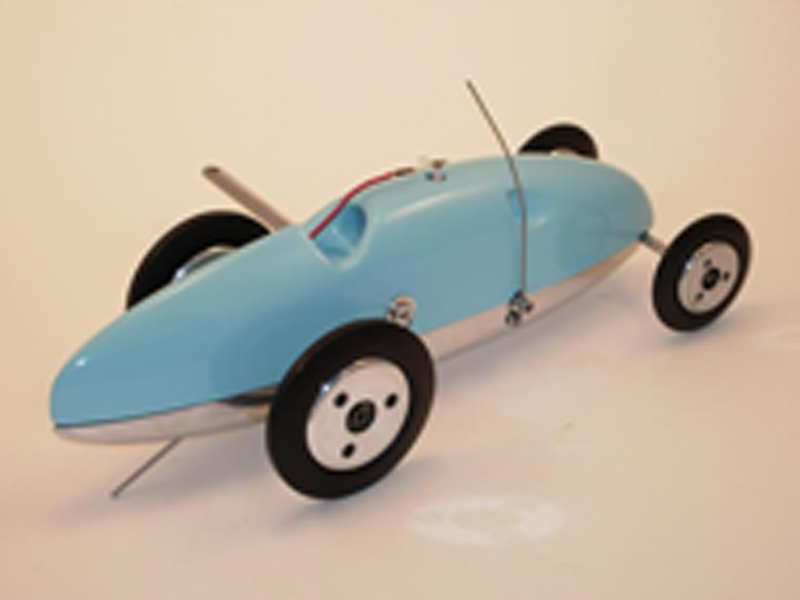 The products are top quality and professional. 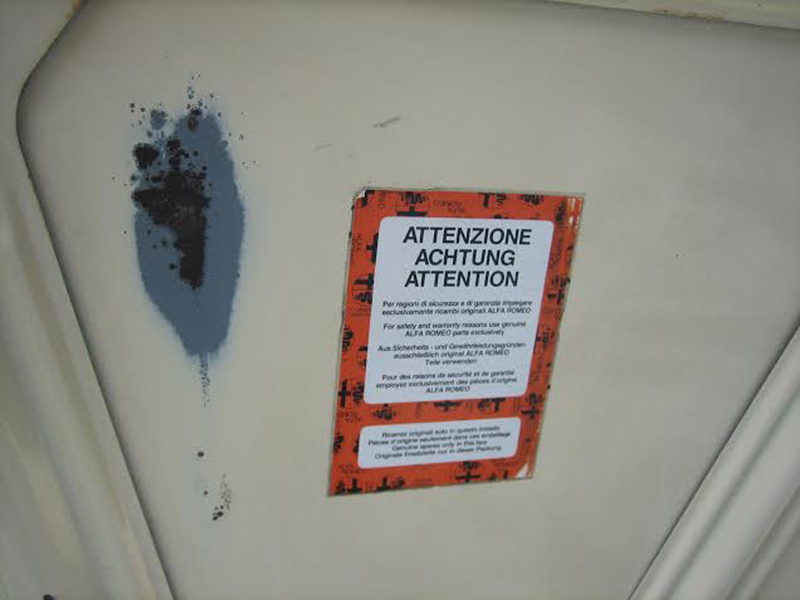 Therefore you must treat the project as such. 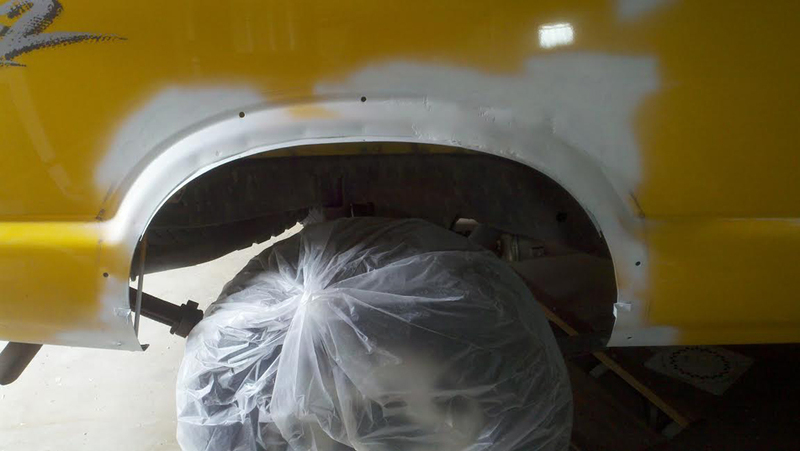 I just finished painting both fenders. 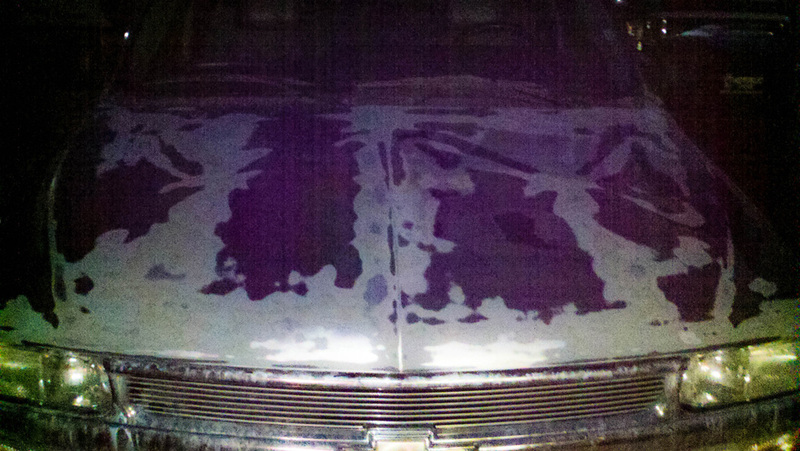 The hood is original paint. 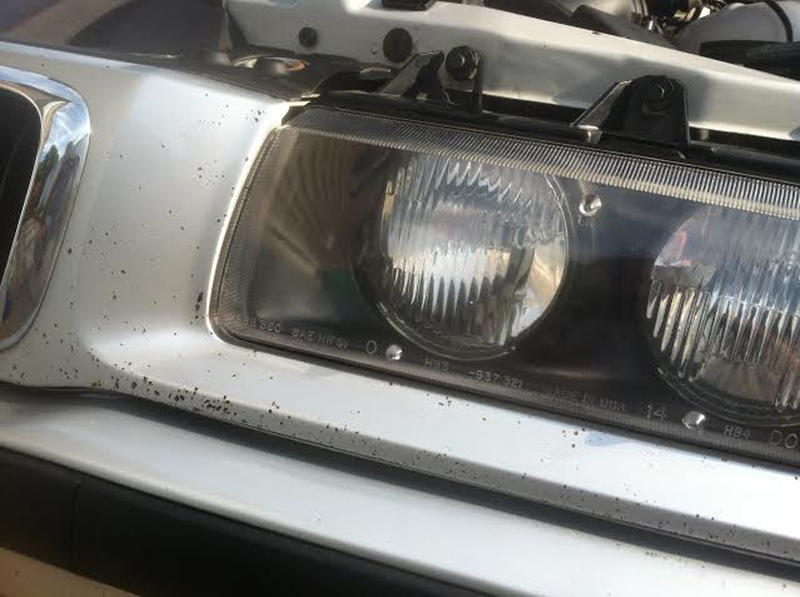 As for the match, my color by the pic is black so most expect an easy match however, I will assume that most colors will match fine as long as the car as a whole is not faded by weather and time. 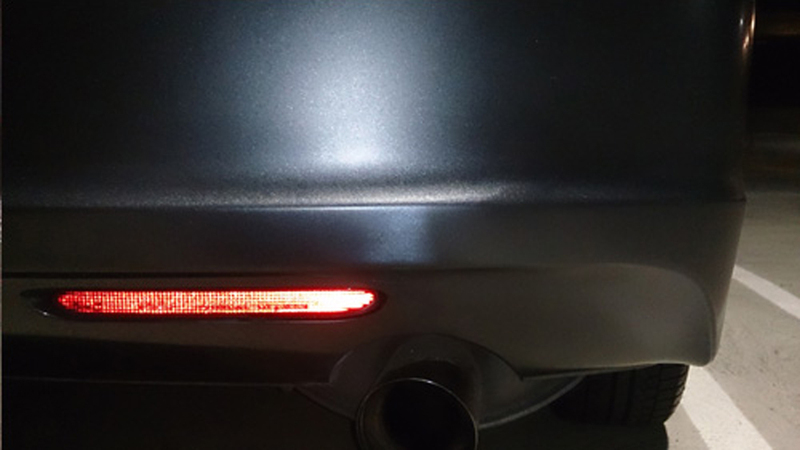 The quality of the finish is very beautiful and I will definitely be a customer with AutomotiveTouchup for future projects." "Dead on Perfect. 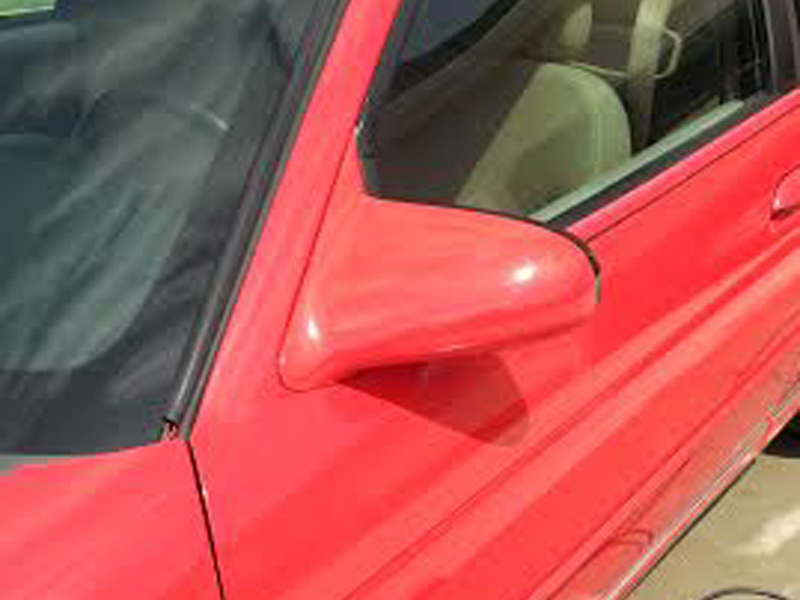 Here's the old handle and the new one. The only way to tell which is which is to look at the broken piece. 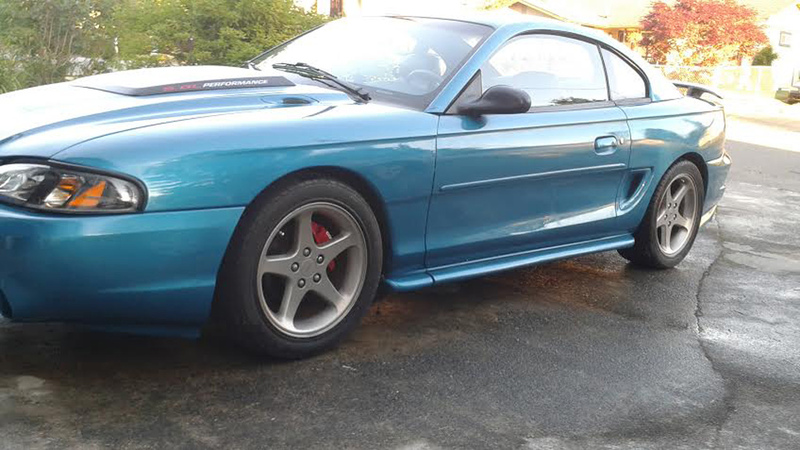 I'll be ordering another color to touch up the wife's '06 Mustang." 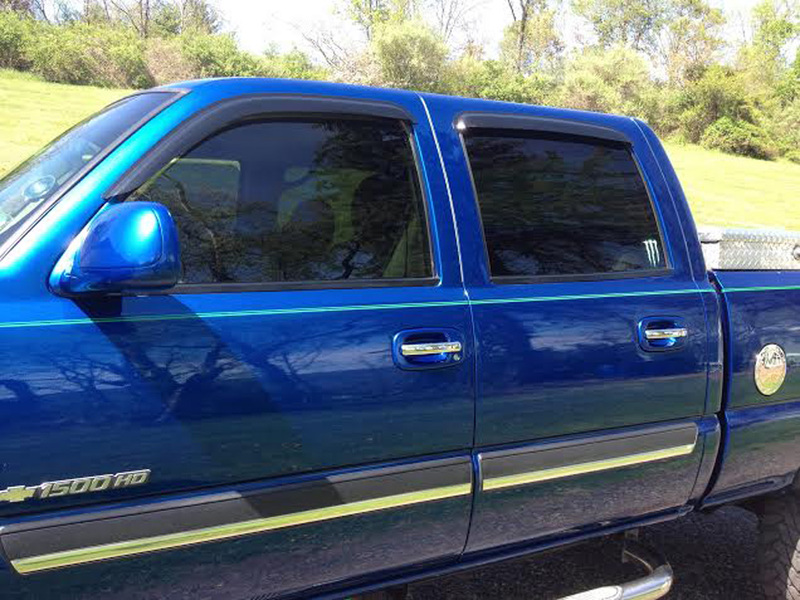 "Wanted to get rid of all the nasty black textured plastic on my Silverado and make the paint all flow in the brilliant blue. 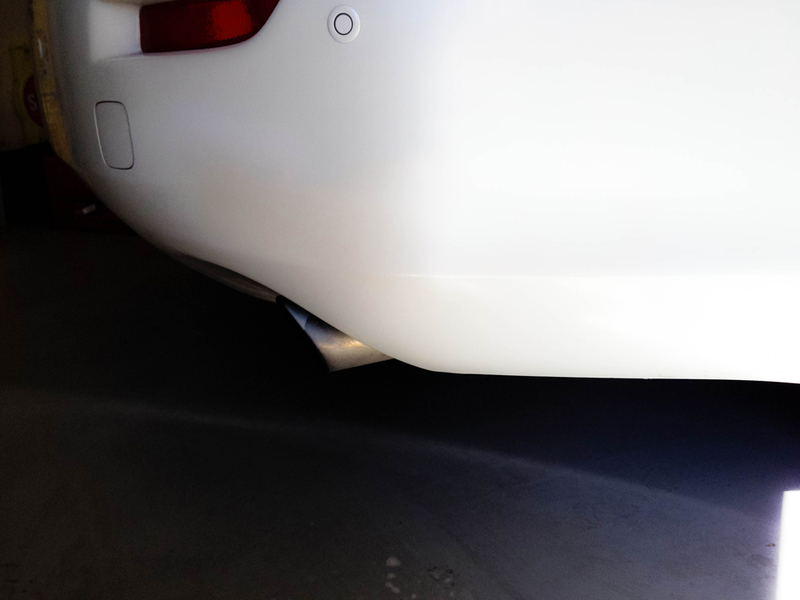 I will admit that I was very skeptical about using spray can and I'm normally the guy you paints with a true spray gun but I knew each plastic part would take a lot of time because I was not just cleaning and painting but rather sanding all the texture out so I had a nice smooth shine. I'll tell you what... WOW!!! 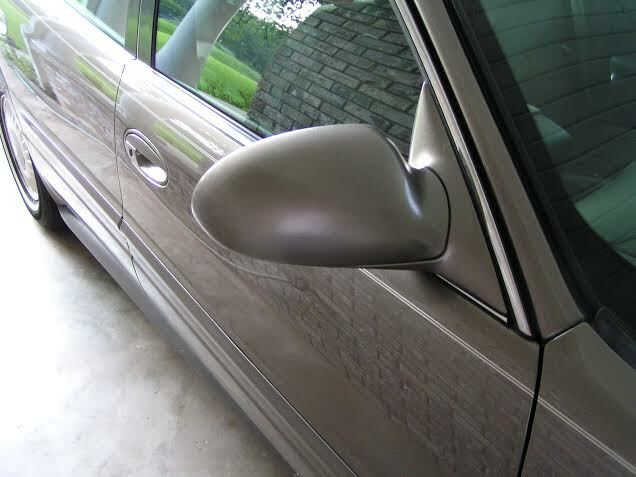 You were able to match 11 year old paint perfectly and too boot, in a spray can. You guys are TOP NOTCH !!! No question. You have my business for life. " 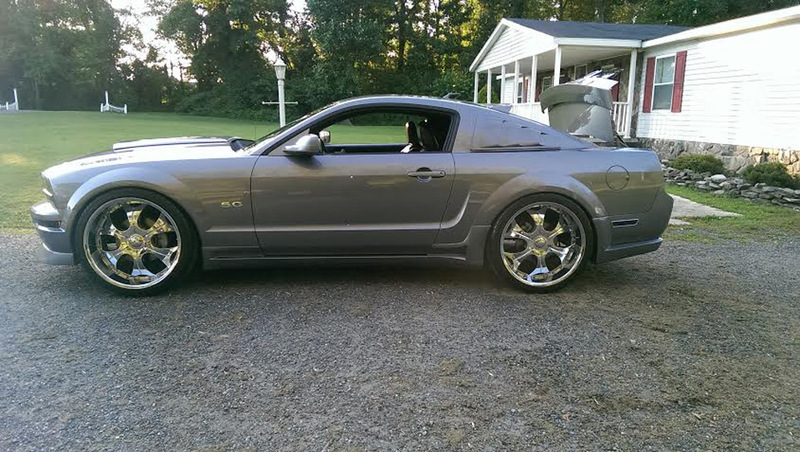 "2006 GT Mustang with the Stage 3 Body Kit and 2013 Roush Hood Scoop Roush Quarter Window Louvers all I painted with Automotive Touchup paint.. 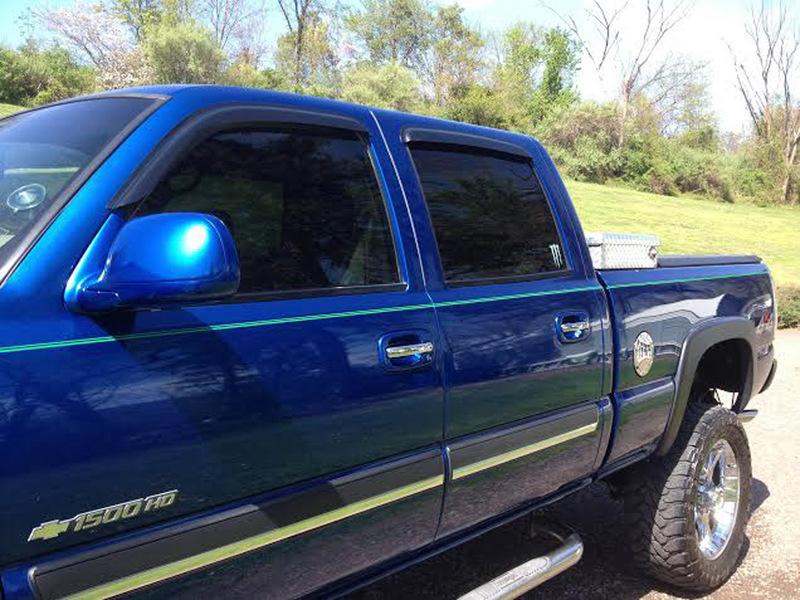 This paint is the best a perfect match every time!" 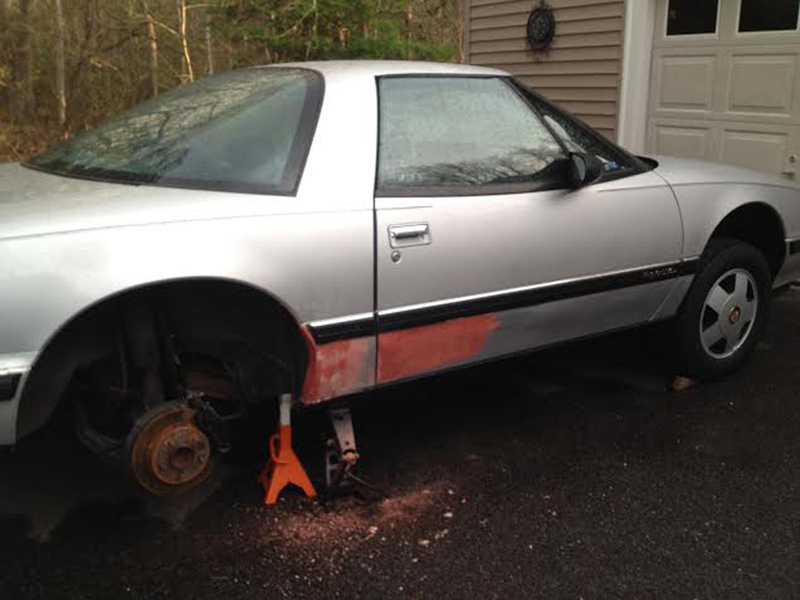 "1989 Buick Reatta, past the rear well"
"I used three cans of your 12oz aerosol and three cans of clear to respray the front clip of my Jeep. 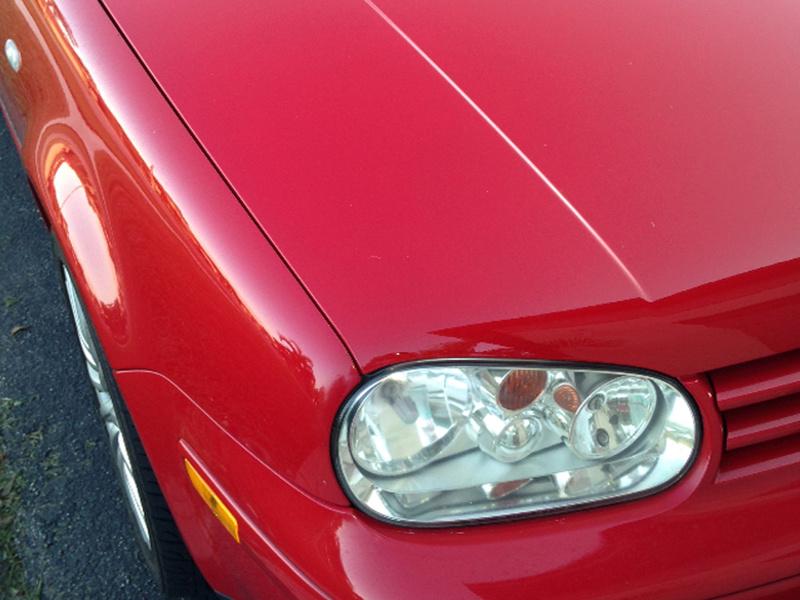 I was skeptical of it matching the OEM paint, but it is an absolutely perfect match! 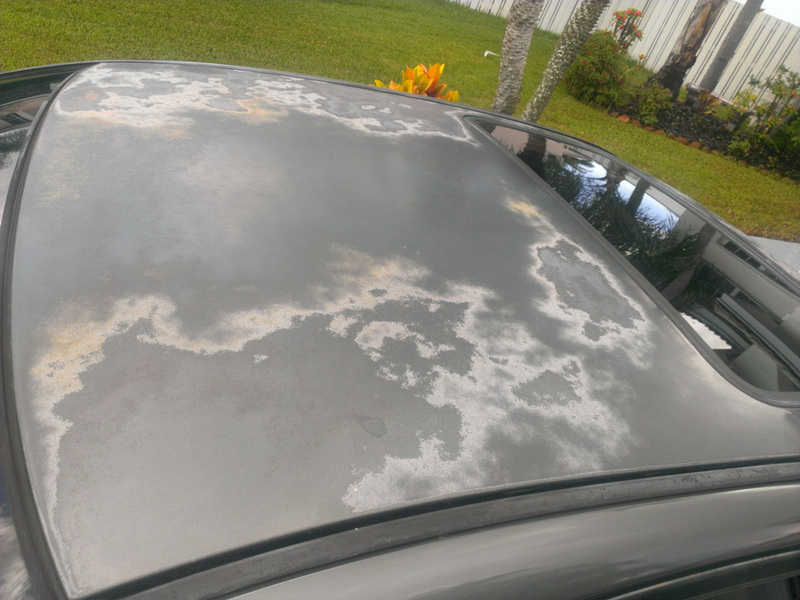 This was sprayed in the worst possible conditions - in Florida humidity outside under trees. 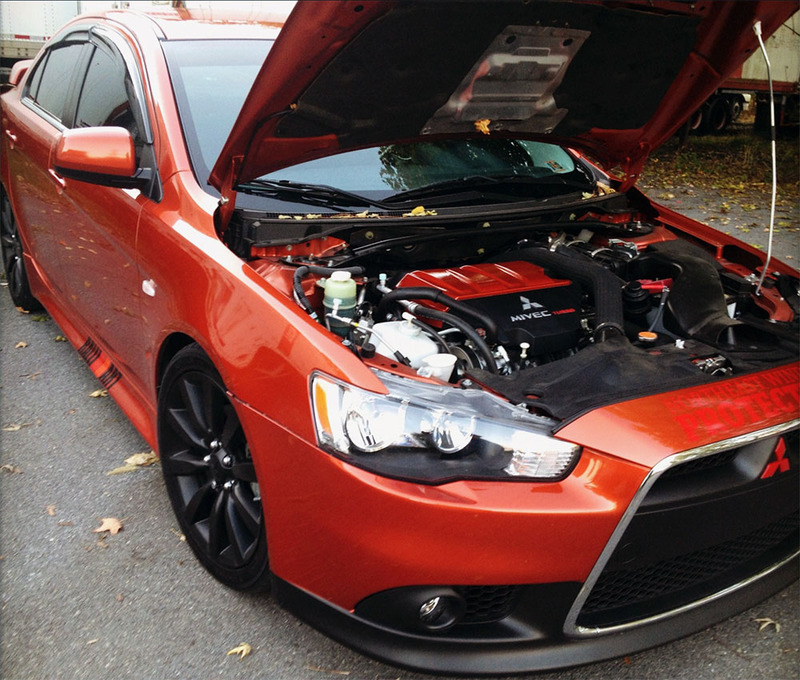 With the proper prep work, results can be great! " "Worked great. 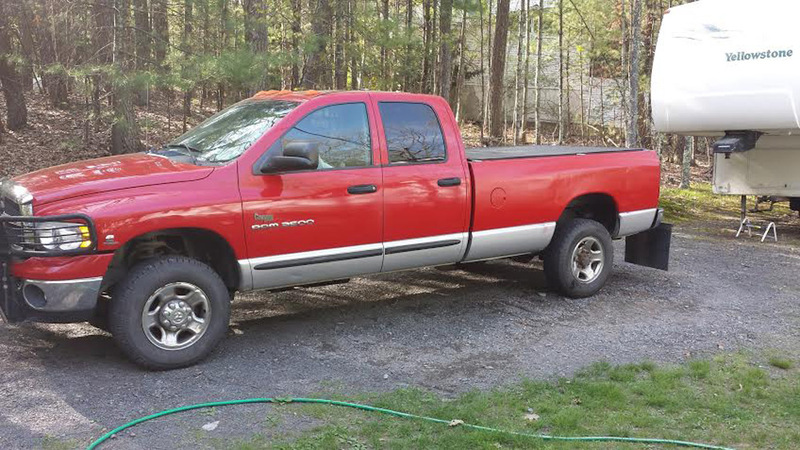 2003 Ram Truck is good to go for another 10 years." "Amazing. 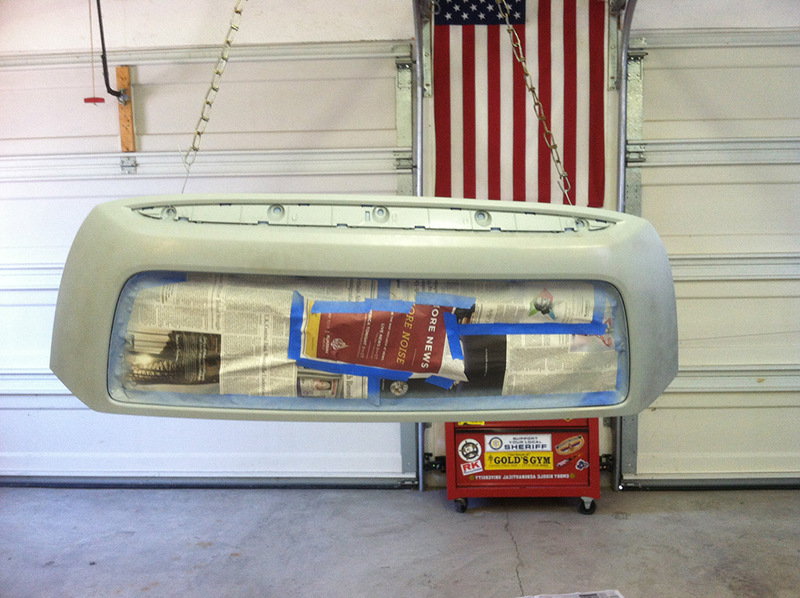 I thought by sanding and repainting my bumper myself i'd come out with an 70-80% job at a 20% price. 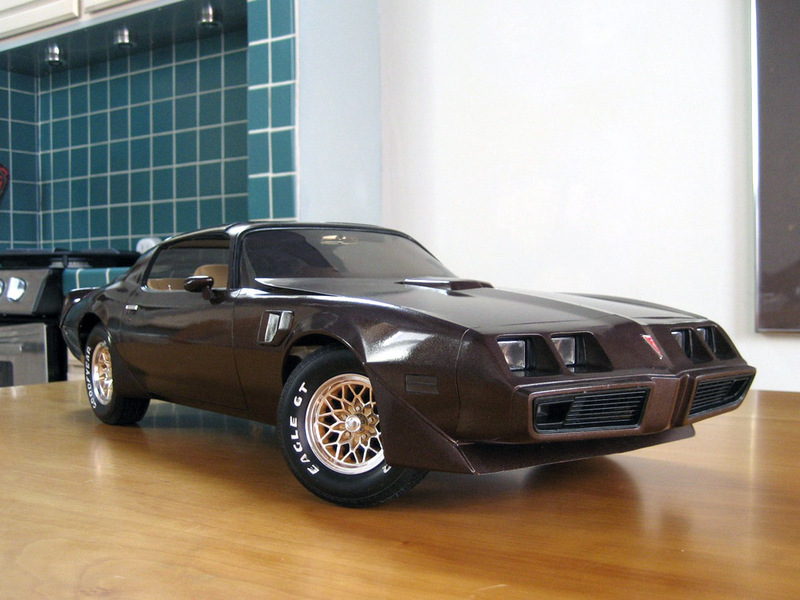 However, i can't see how it would look any better than if i'd have a shop paint it in a booth. 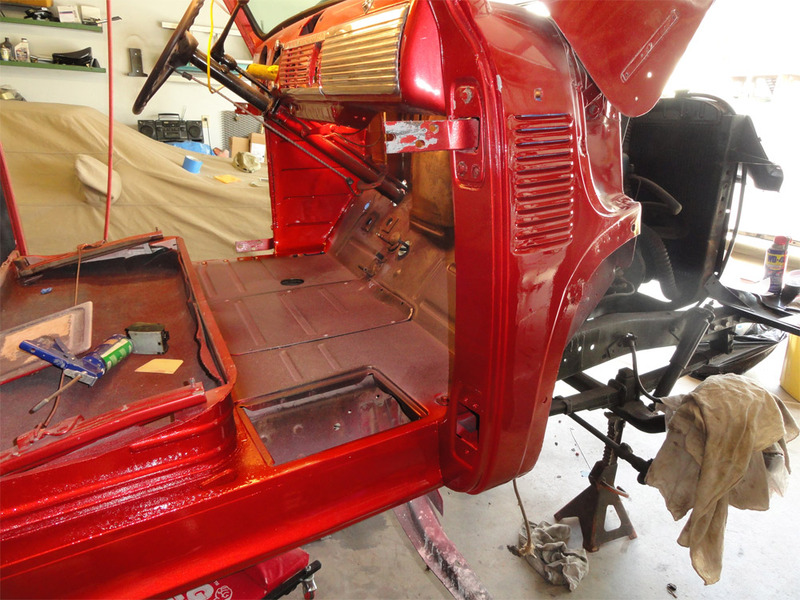 The color match was perfect, and it's given me the confidence to tackle bigger automotive paint project I thought were beyond my reach." 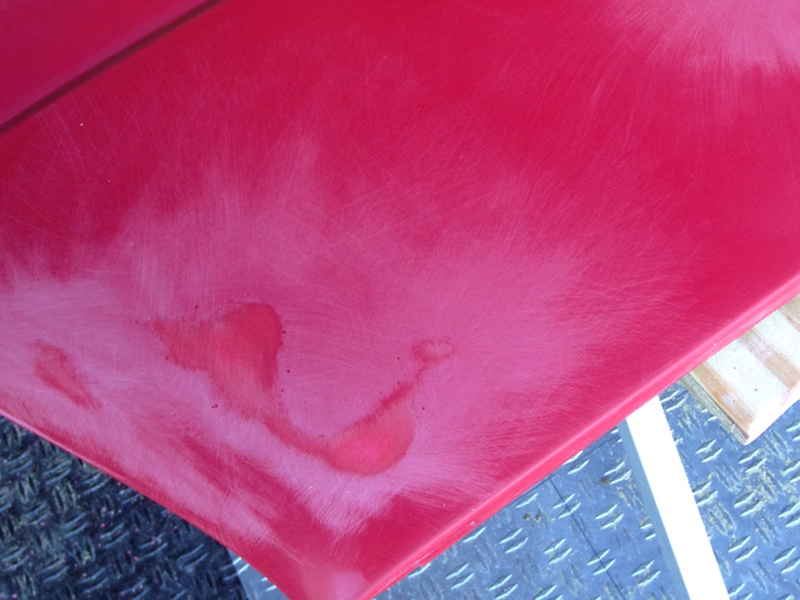 "Thank you for such a great aerosol spray product produced. Love it!" 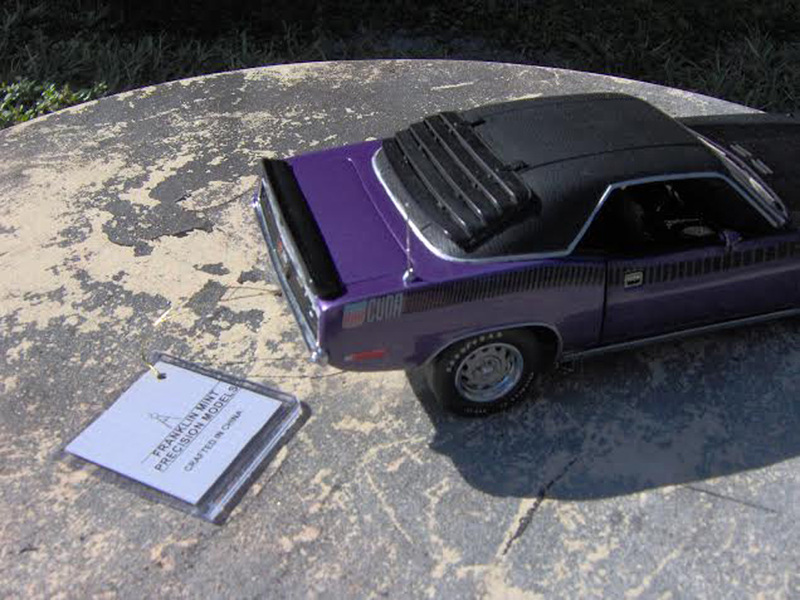 "Truck rims before & after"
"1/24 scale die cast cuda"
"I would recommend this for the do-it-your-self person that knows their way around a spray rig using high VOCs. 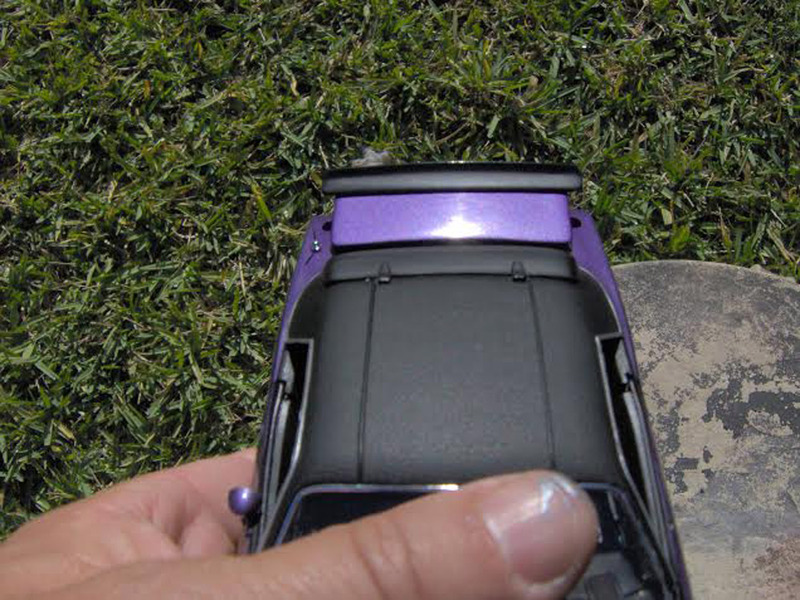 Color match was not crucial since I painted the entire car. 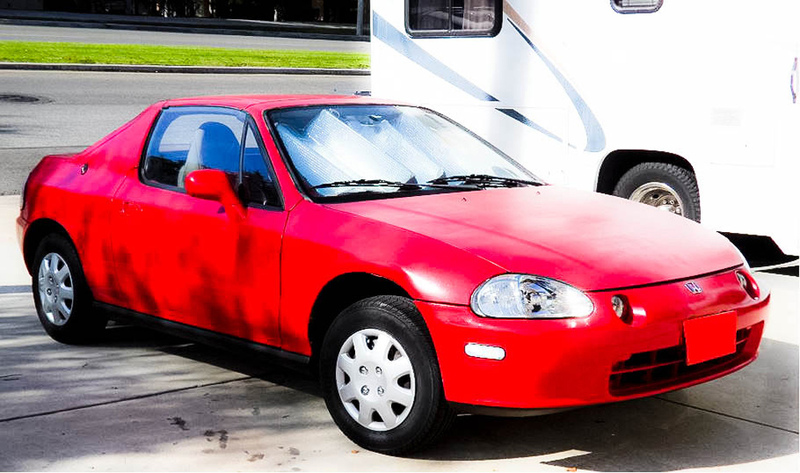 My 23 year old daughter was out of the country when I painted her car, but I kept her appraised of my progress with photos. I've included two of the photos I sent her. Before and after. 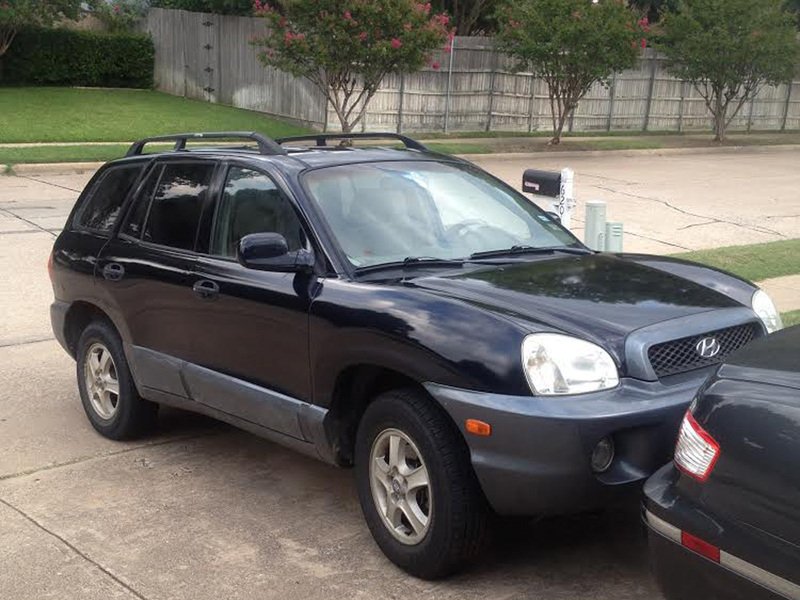 She loves her almost new 2004 Hyundai Santa Fe. 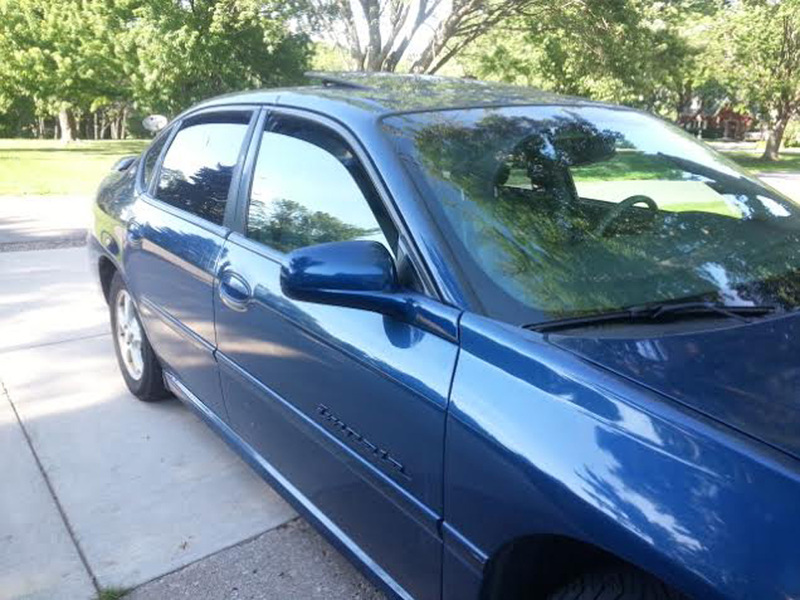 Wanted to include photos. 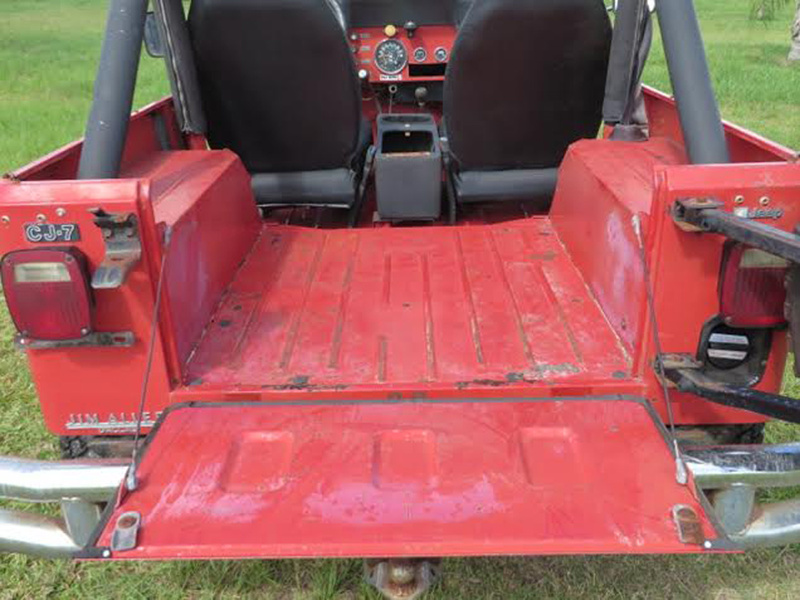 Before: sun damage from college years outside with no cover. 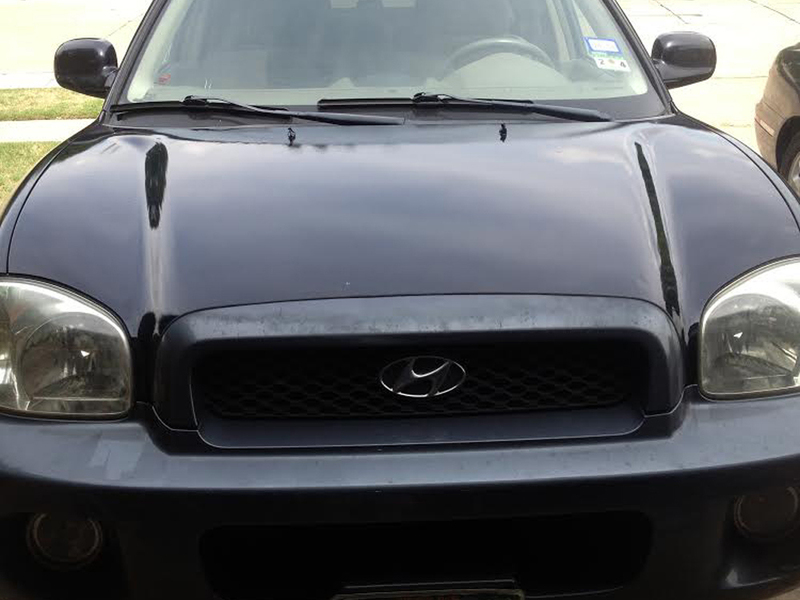 Notice closely how badly damaged the hood is. 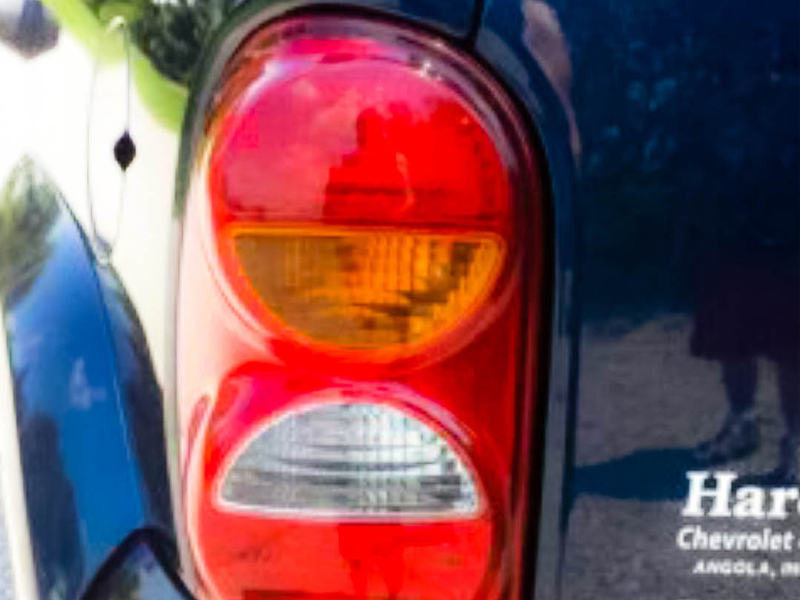 The entire car looked that way. 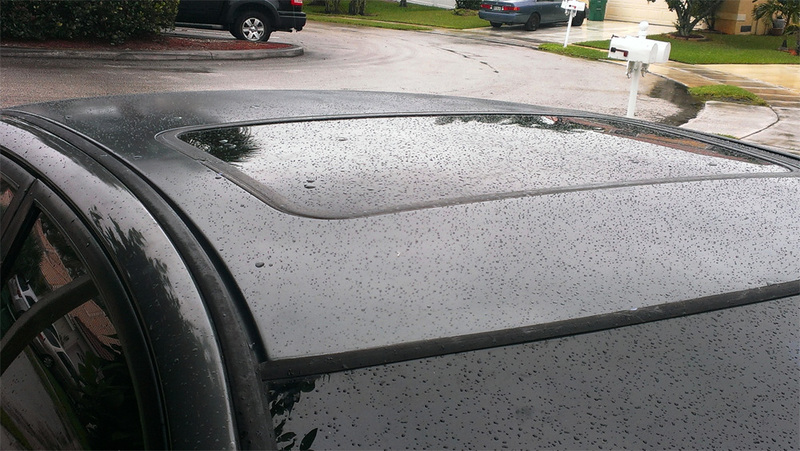 After using your products: the hood is so mirror-like the apparent artifacts are actually reflected clouds in the sky." 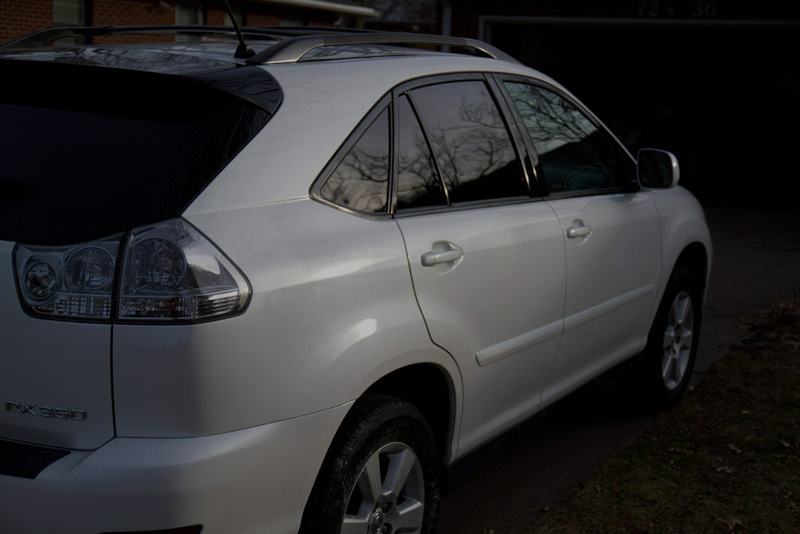 "AutomotiveTouchup is awesome!! 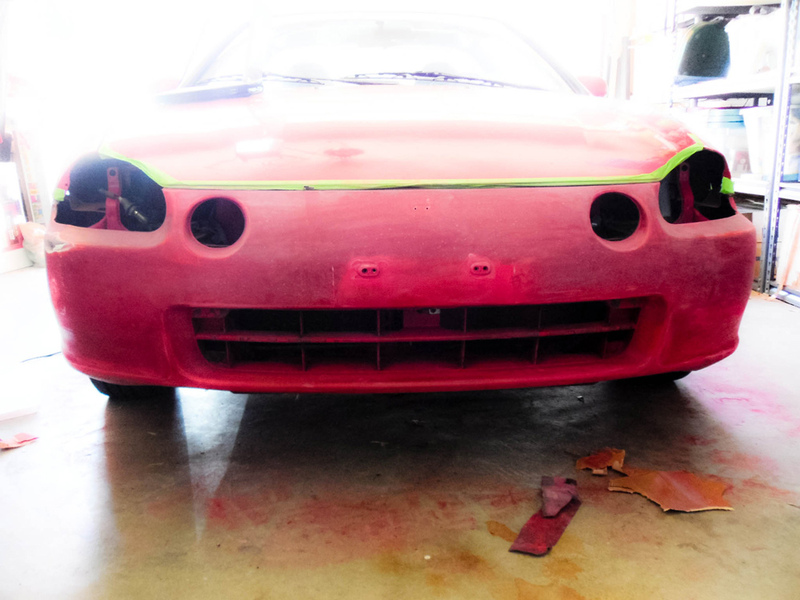 !The paint was a perfect match!!! 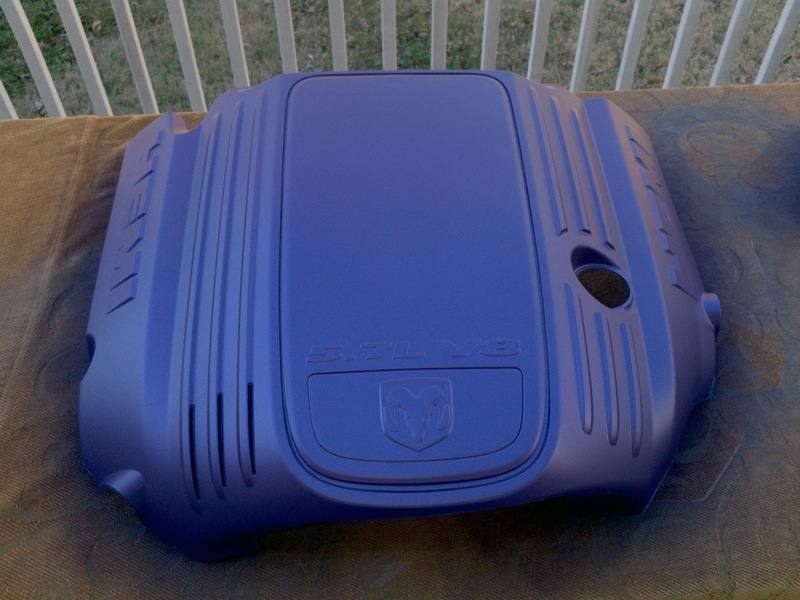 You can't even tell it was sprayed with a spray can it looks just as good as a spray gun. 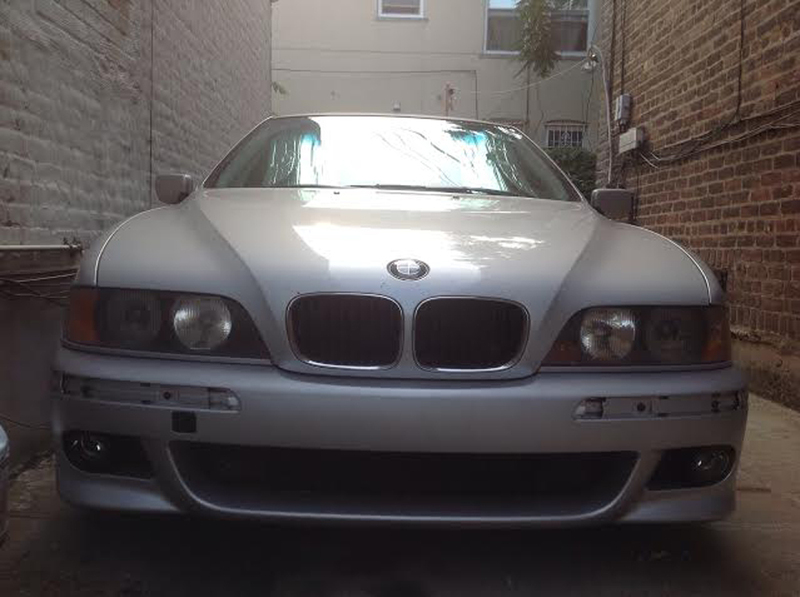 My daughter is now happy her BMW does not have freckles anymore!!!" Do you offer t-shirts? 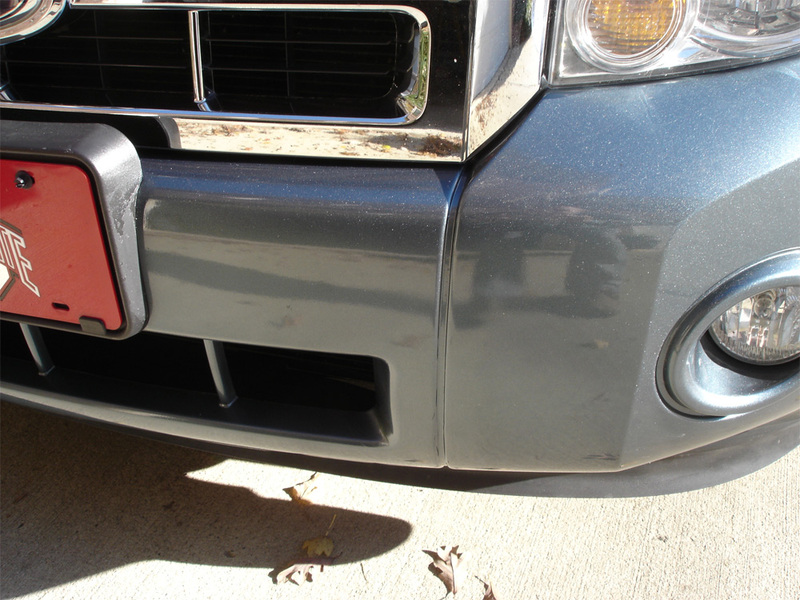 I just used your paint to paint my bumper on my Nissan and I am very pleased. 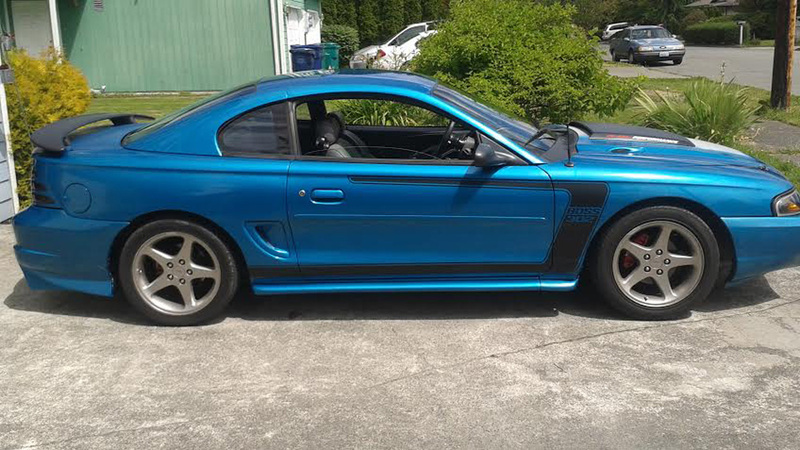 I am going to write an awesome review and would love to wear a company shirt to the many car meets and track days that I attend. 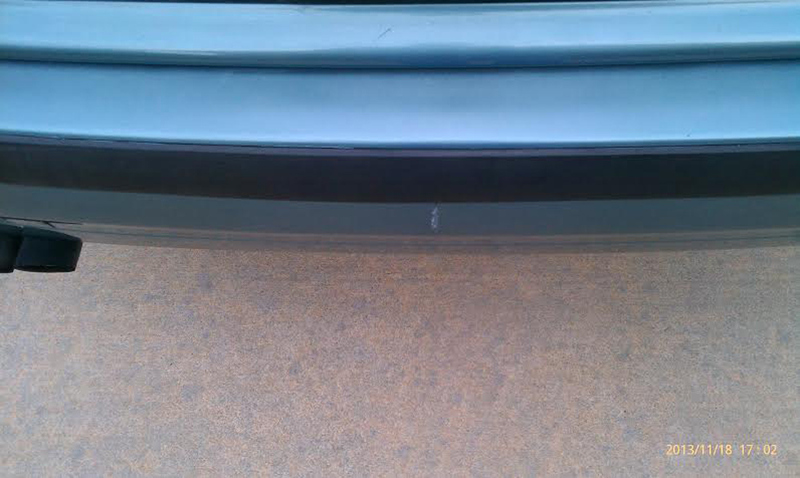 Attached are a before and after shot of the bumper I repainted." 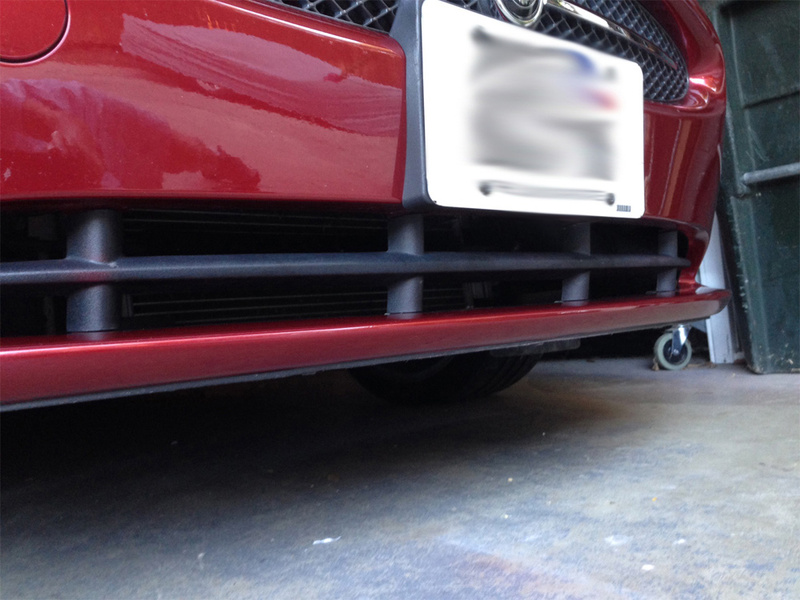 "Just wanted to thank you for your great products and color matching. 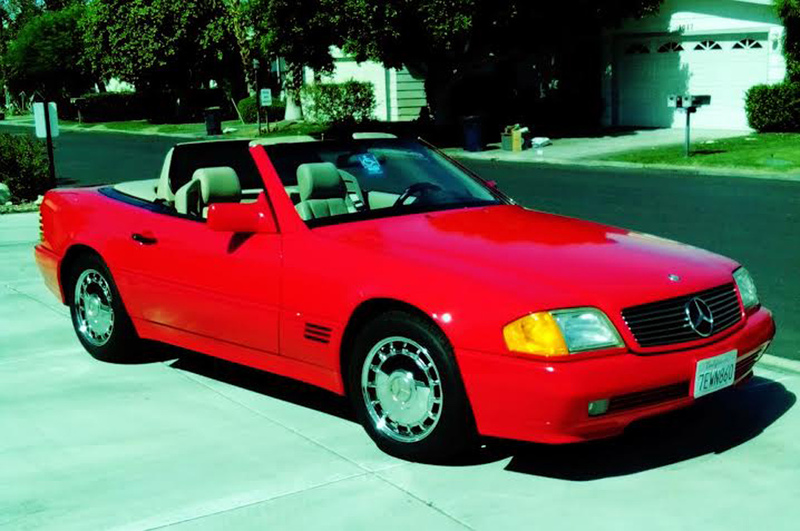 I have a pristine 1992 Sl500 that I purchased with a few scratches in the hardtop. 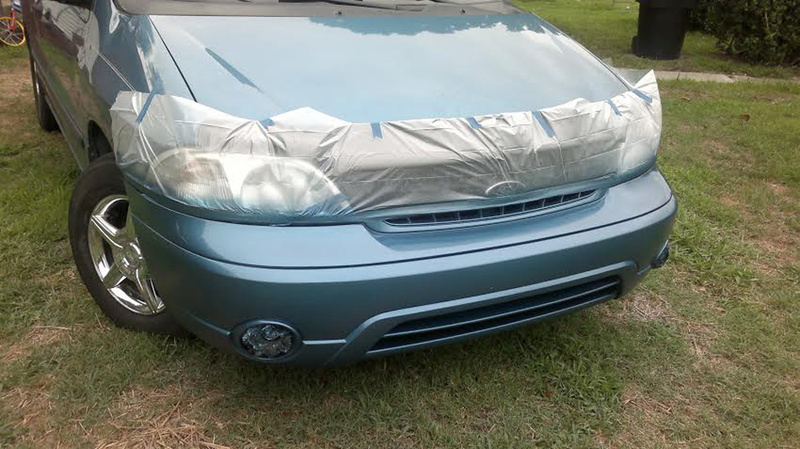 When I was quoted 1000.00 to fix I decided to give it a try myself. I took my time and prepped it correctly. Here are a few pics of what really surprised even myself. Thanks again for wonderful products. 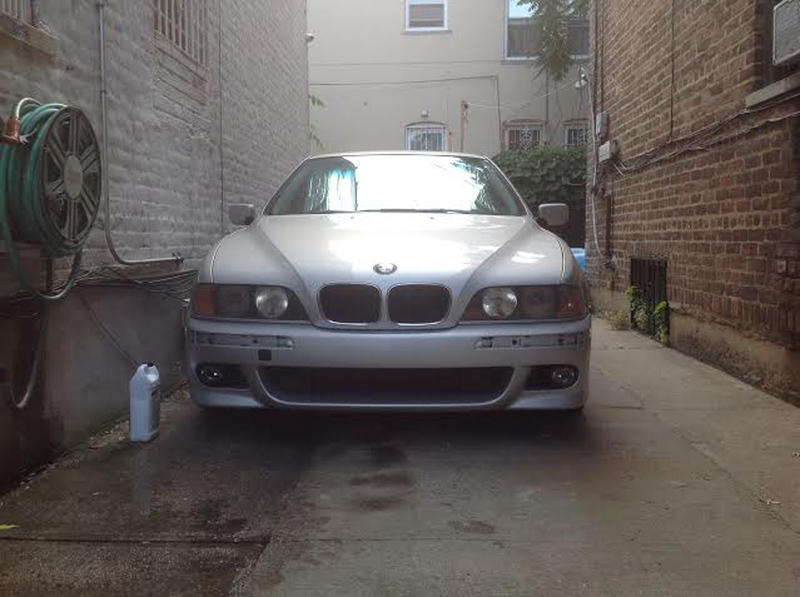 I also did the front spoiler and you can't tell from factory." 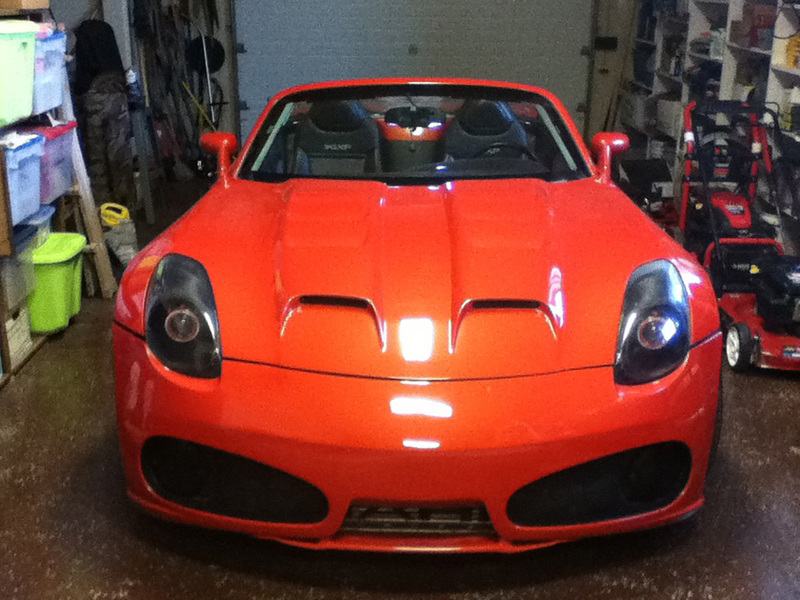 "Here is the finished project the color is 2010 Lotus Burnt Orange.Thank you very much. 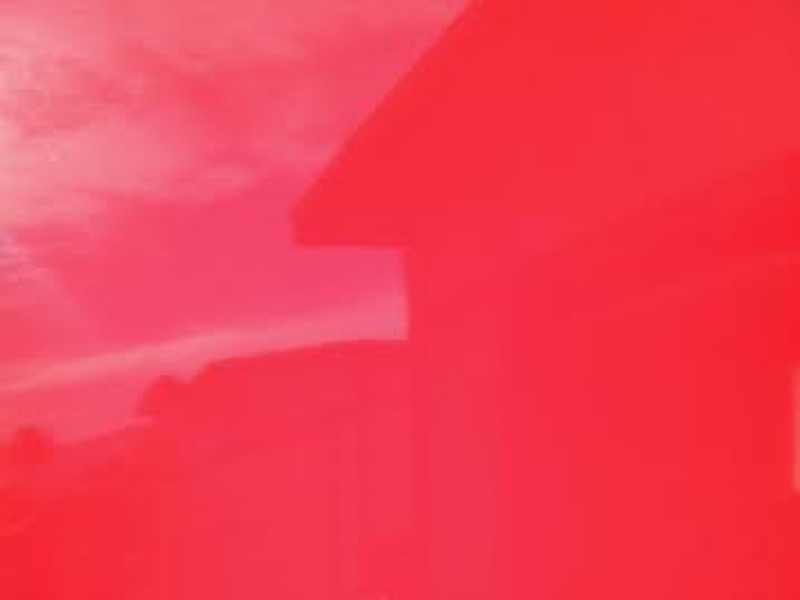 Will be buying more paint in the very new future." "Unfortunately I wasn't smart enough to take "before" pictures. 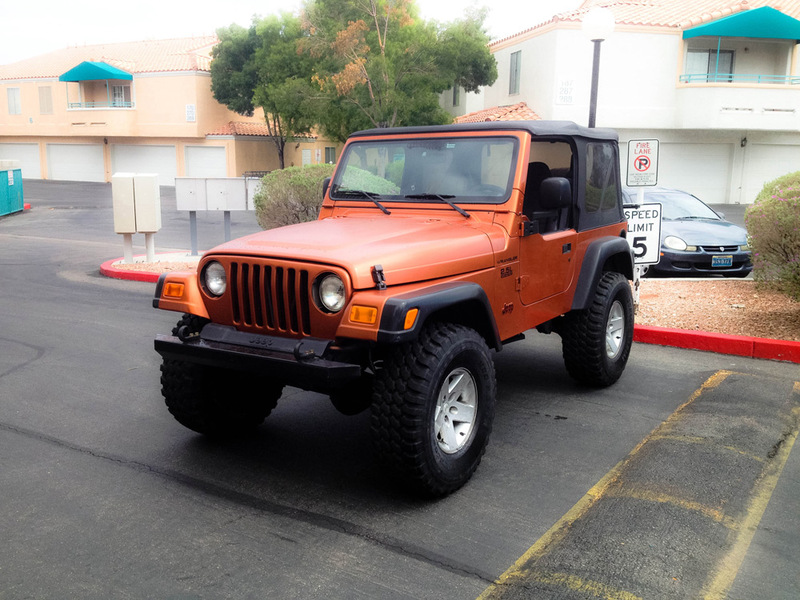 The color matched perfectly." 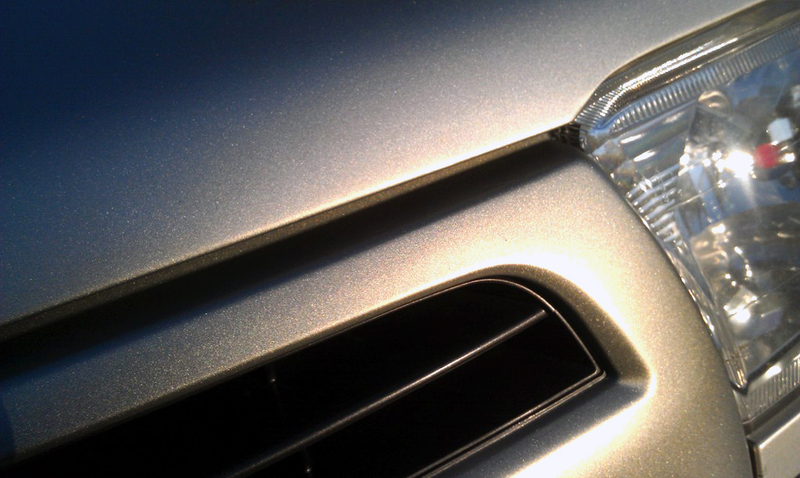 "Super paint. 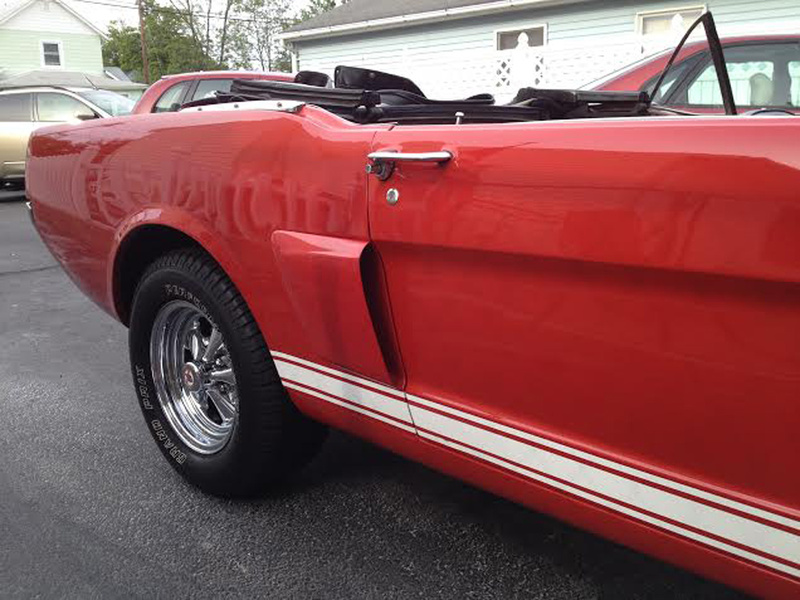 The match for my 65 mustang was right on, thanks!" 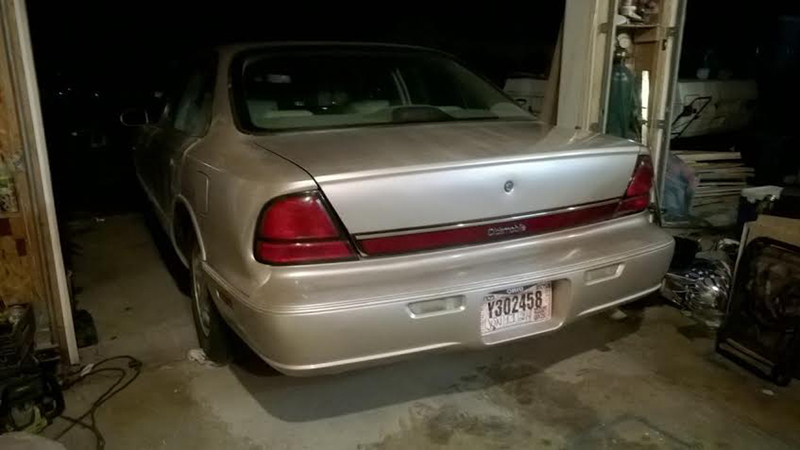 "2004 Impala with a missing right mirror. 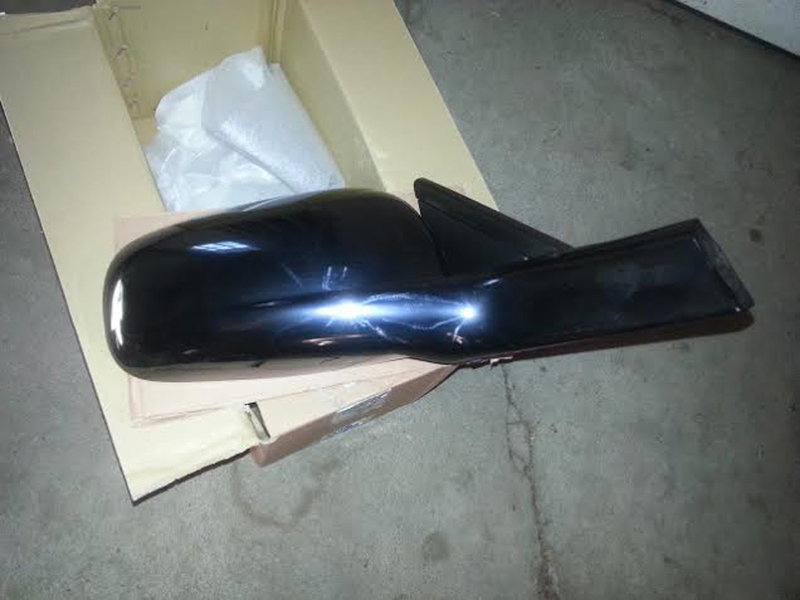 I bought a replacement/aftermarket mirror that needed to be painted. 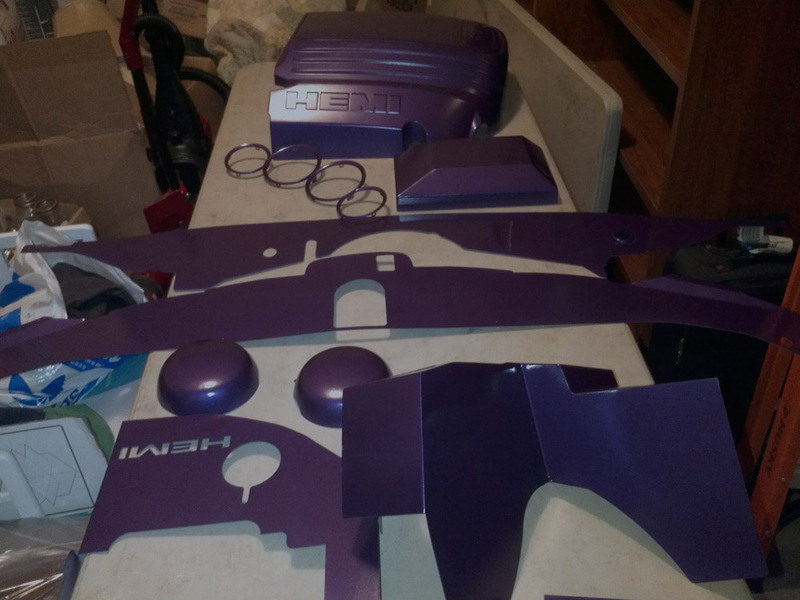 I asked a friend who is a paint and body man how he would do it. I ordered what he suggested and I think the result speaks for itself. 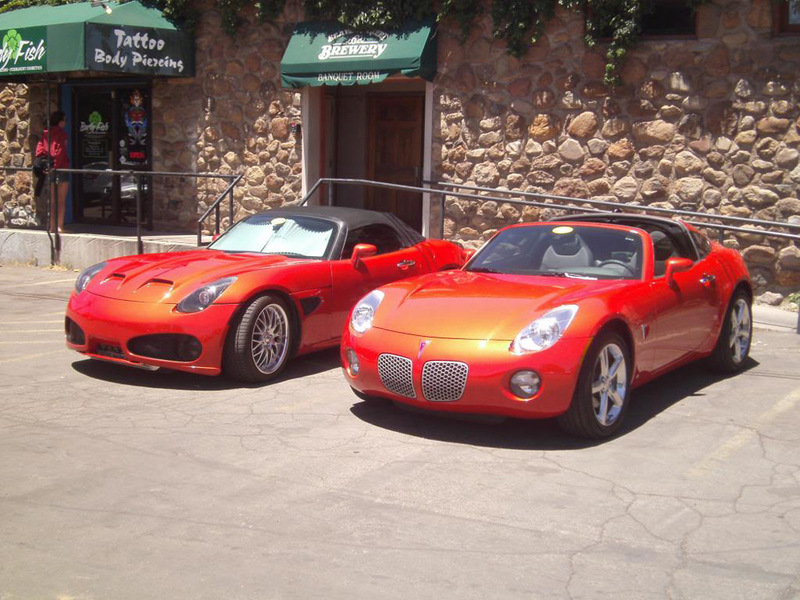 Thanks for great products at truly great prices!" 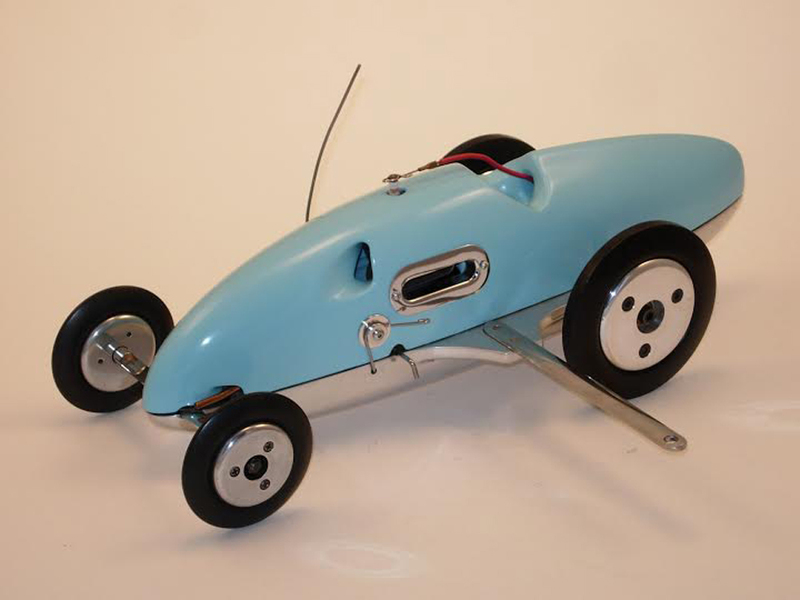 "Dooling .29 powered Davis-Carlson mite car, originally owned by Butch Williams of Los Angeles, CA, following a period-correct restoration and painted with 1957 Chevrolet Periwinkle Blue." 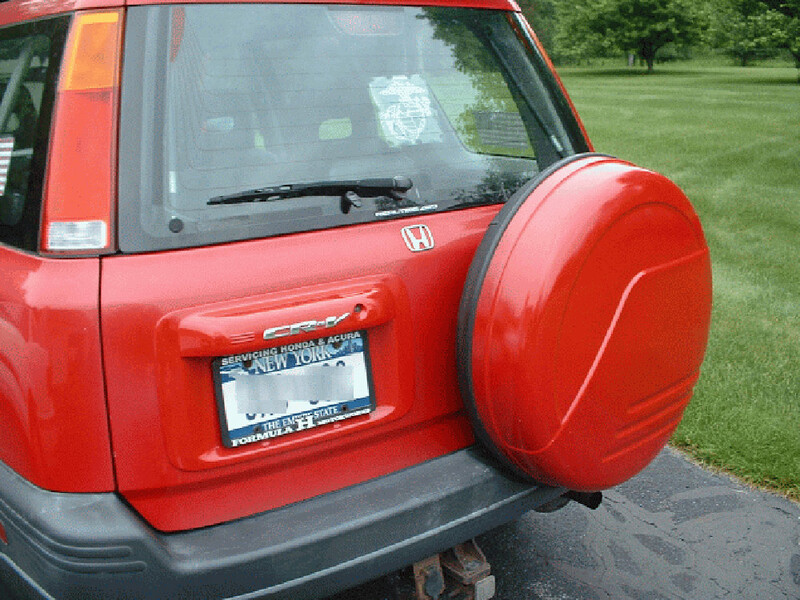 "Had to mix in another color, but turned out well"
"On the red 2000 CRV the plastic side view mirrors were fading badly as was the license plate surround. Your 12 oz. 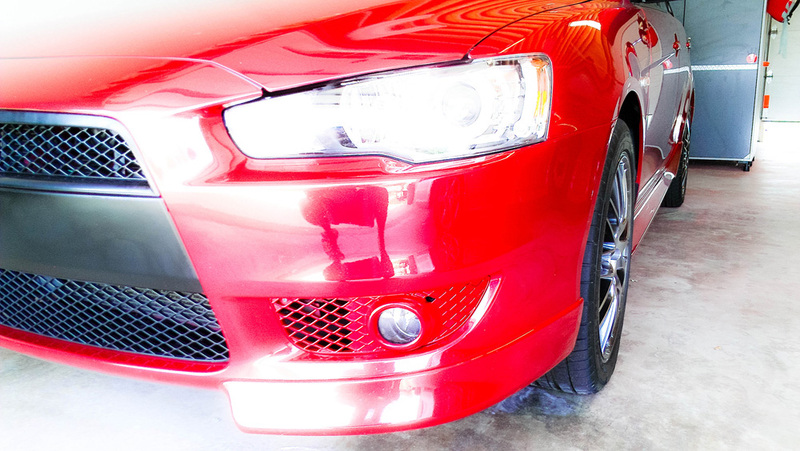 can of Milano red matched the car color perfectly! 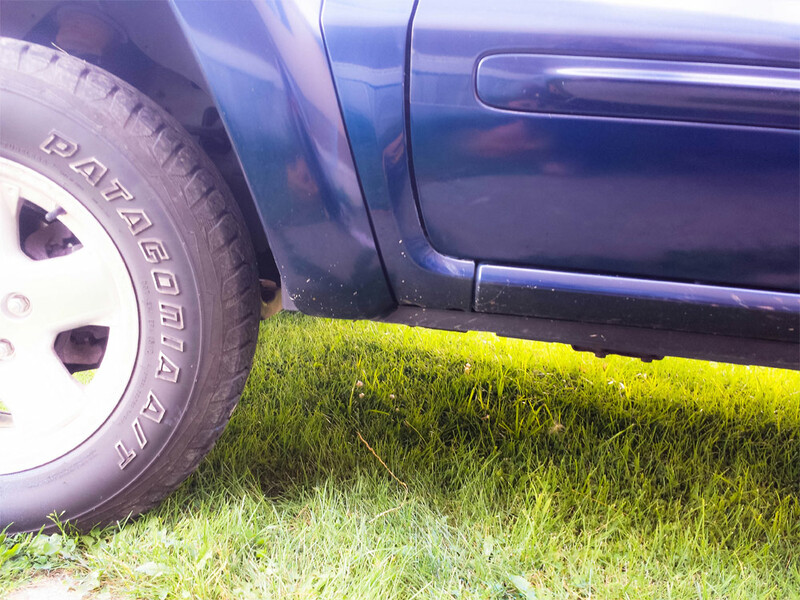 I was so impressed with the results that I even painted the black plastic tire cover. 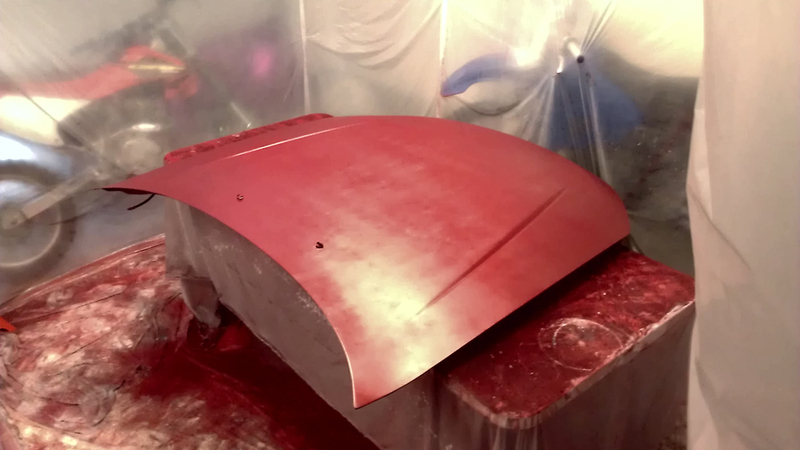 I was worried that such a large surface might show a difference but again the color matched. 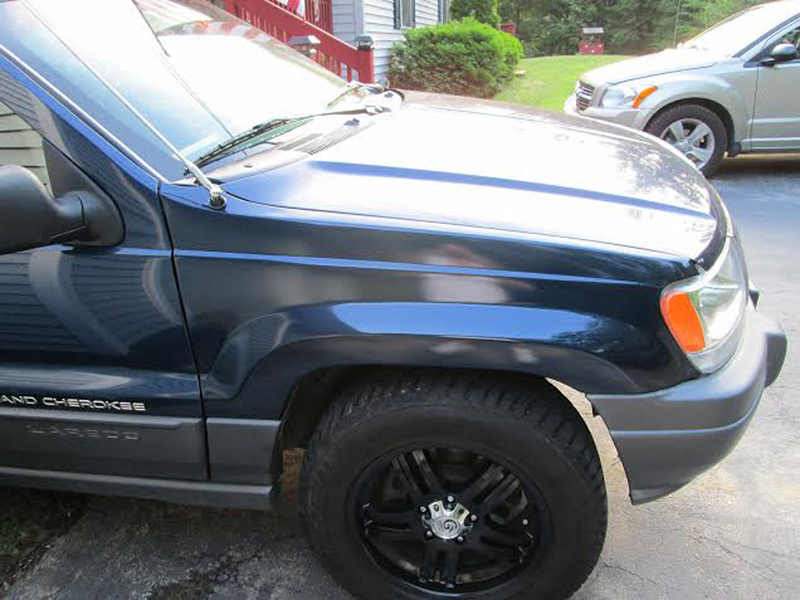 I did this job last year and your paint has held up through a New York winter that had been very harsh and I mean the salt and sand on the road. I was so happy with the durability of your paint that I went and bought a 12 oz. 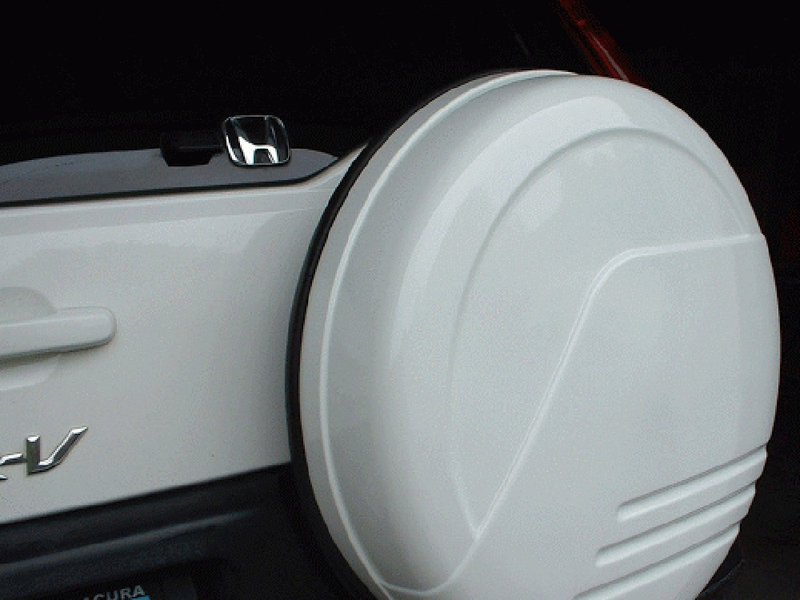 can of your paint for my white 2002 CRV and painted its black plastic tire cover too. I think it looks great. I have also purchased a 12 oz. 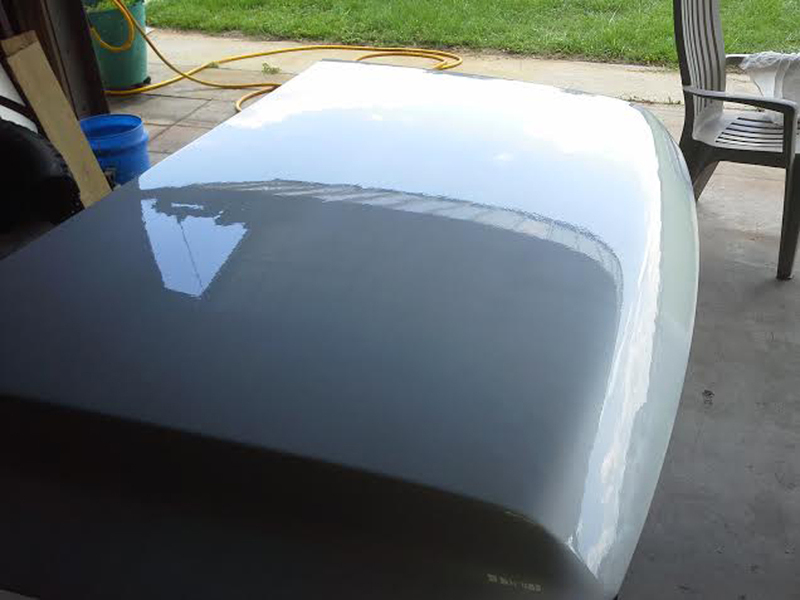 can of your clear coat, followed the instructions of applying 3 coats and the shine is terrific." 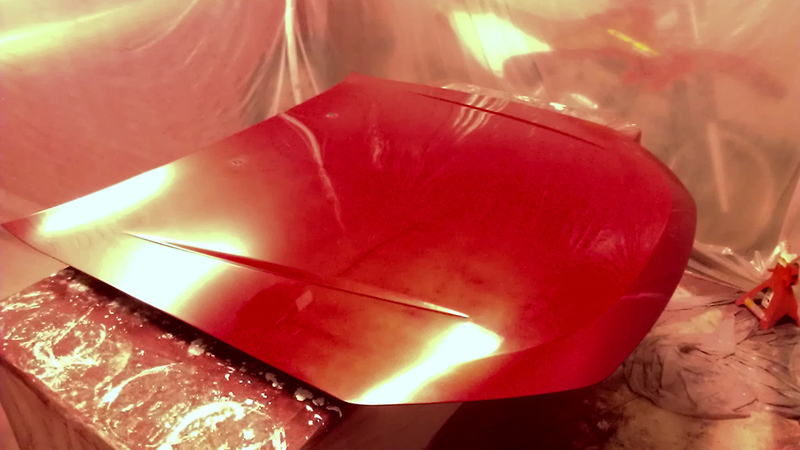 "This was the first time I have ever painted a car and I have to say that the color match was spot on. 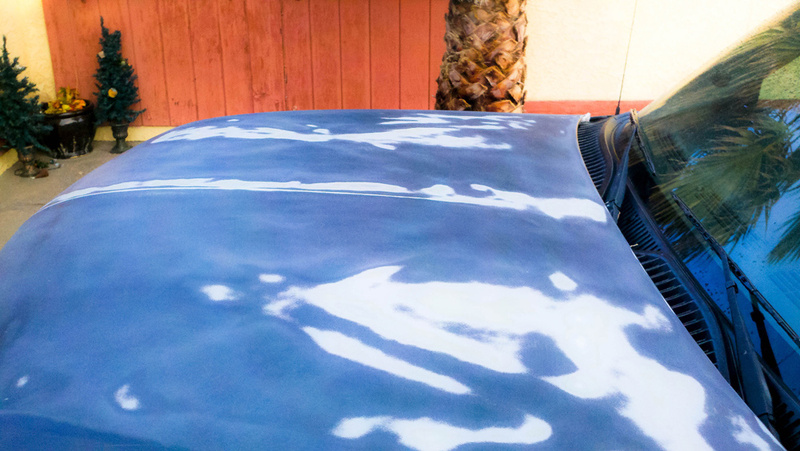 I did not paint the roof of the car and the rest matched perfectly. 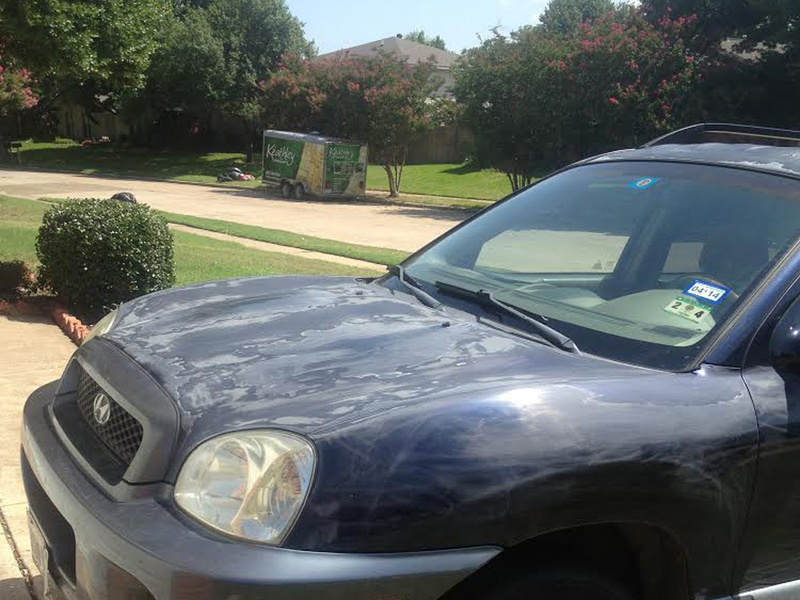 My parents were so impressed that they want to have there Mercedes done to. 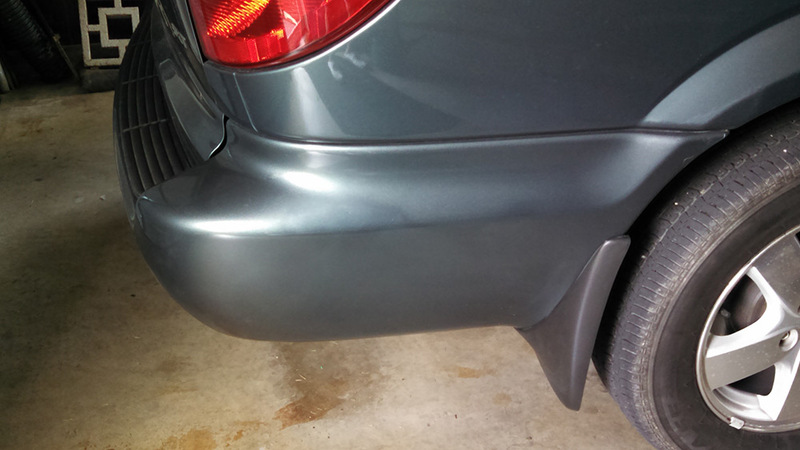 This paint was very easy to use, I can't believe how well it turned out. Thank you." 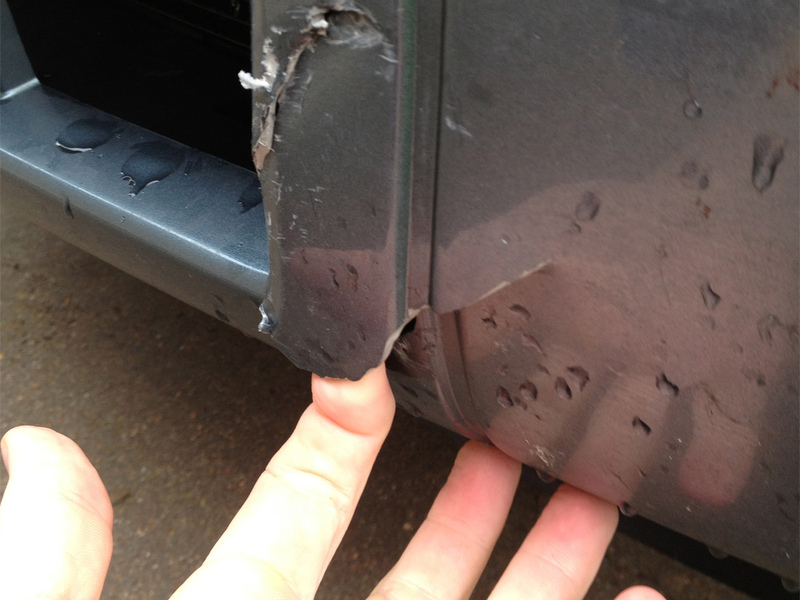 "I had some rust on fender edge. 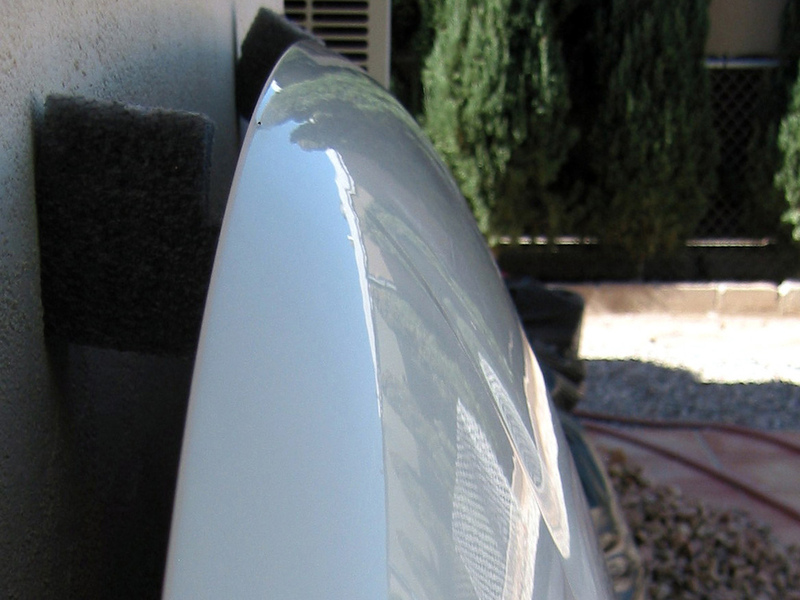 Sanded and painted perfect match. I was extremely pleased." 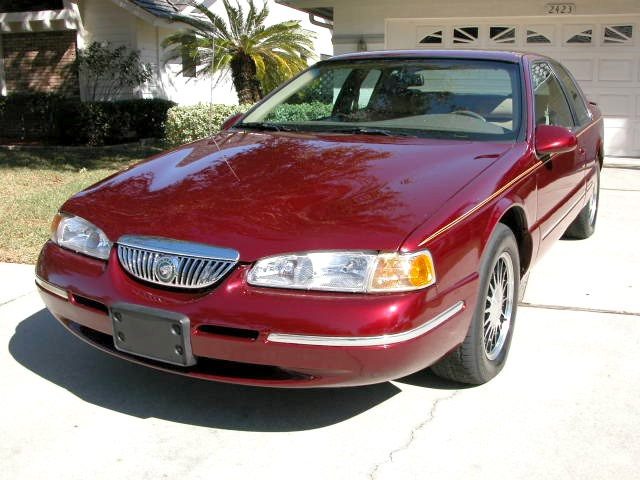 "I bought this 1998 Oldsmobile 88 from a friend of mine for $500 with low mileage and a really nice interior but now totaled by their insurance company. With some elbow grease and lots of pulling, I got it into a very nice state. 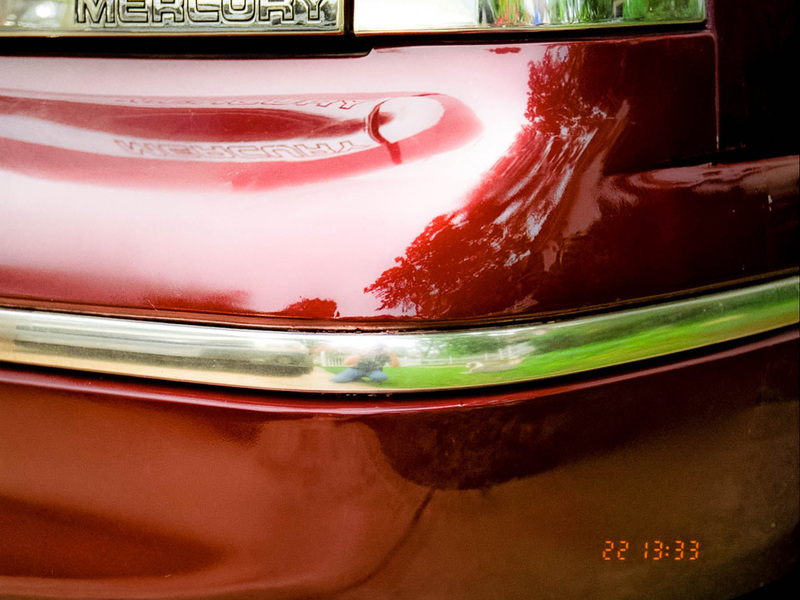 Not perfect, but for a full repair including paint at under $200....you can't beat it.Paint match is almost perfect on this very unusual color. 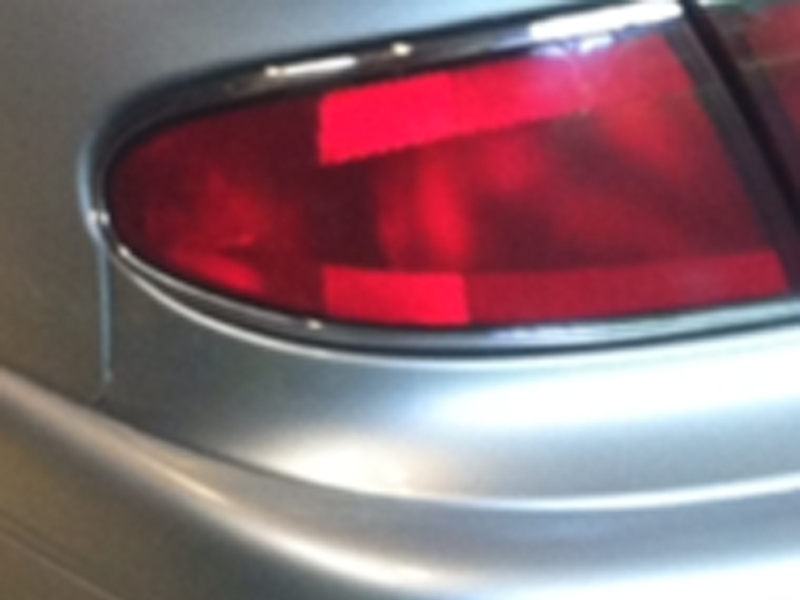 It is a very metallic beige that turns pinkish in certain lights. The match is ridiculously close in all lighting. Love it!" 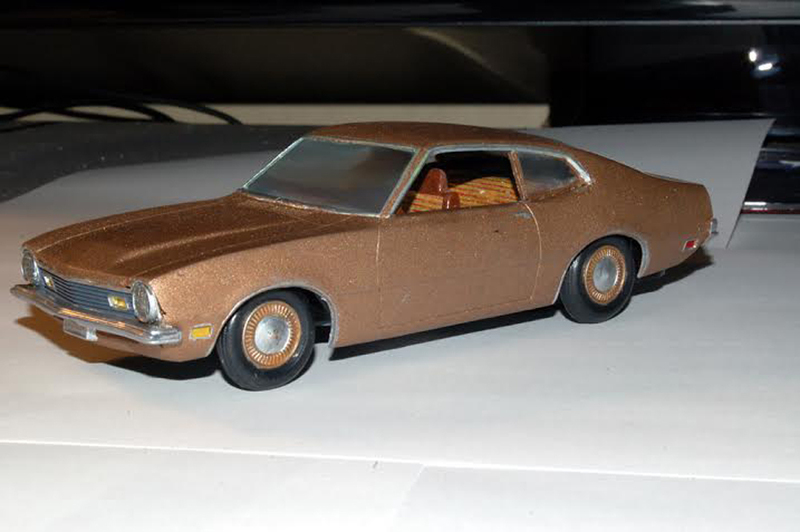 "I used your paint to re-create the infamous '73 Maverick that I had in high school. 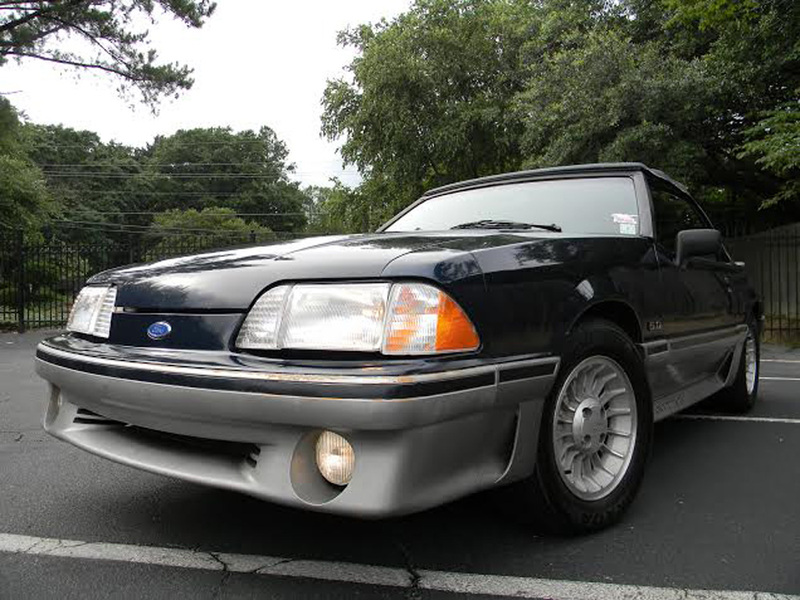 After much searching, your Ford 5H was an absolutely perfect match! 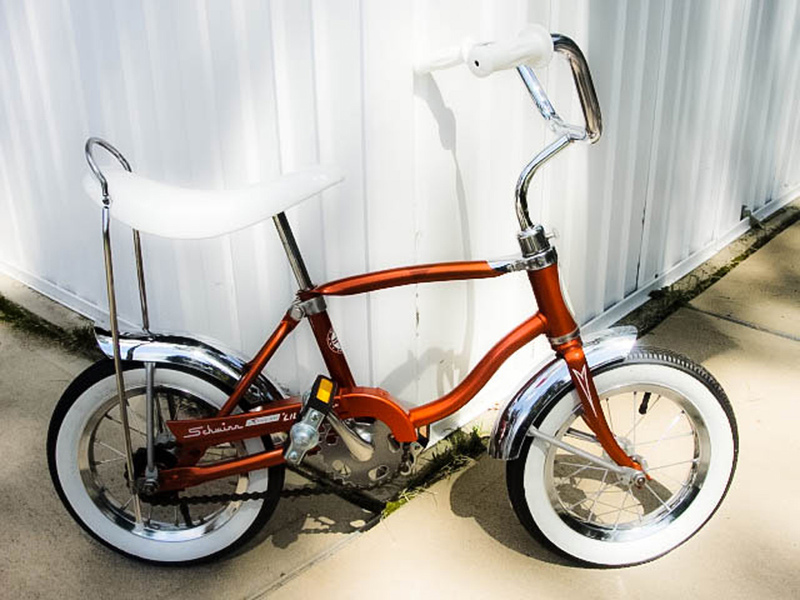 The project came out nice, and brought back a lot of fond memories for both me and the old gang." 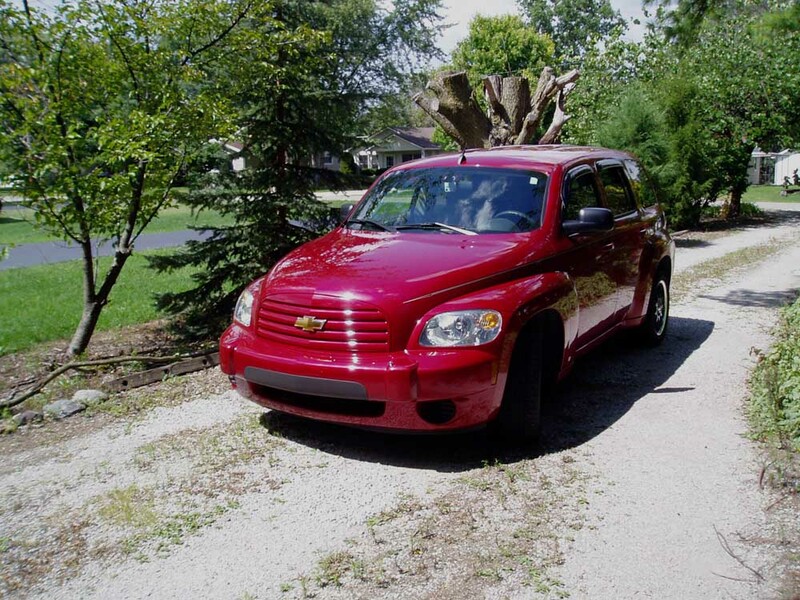 "Several years ago my car slid down our icy driveway into our mailbox. 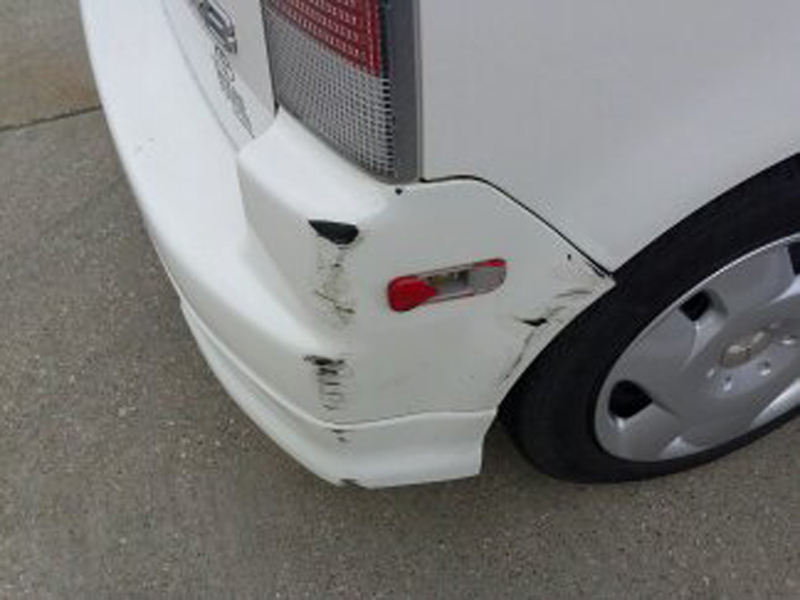 I need the insurance money for something else at the time. 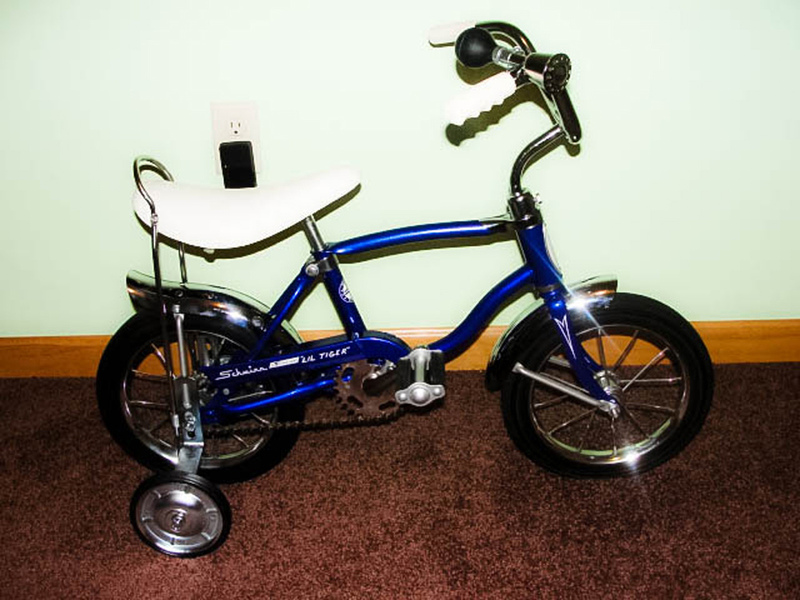 I finally got around to trying to fix it from my wheel chair. 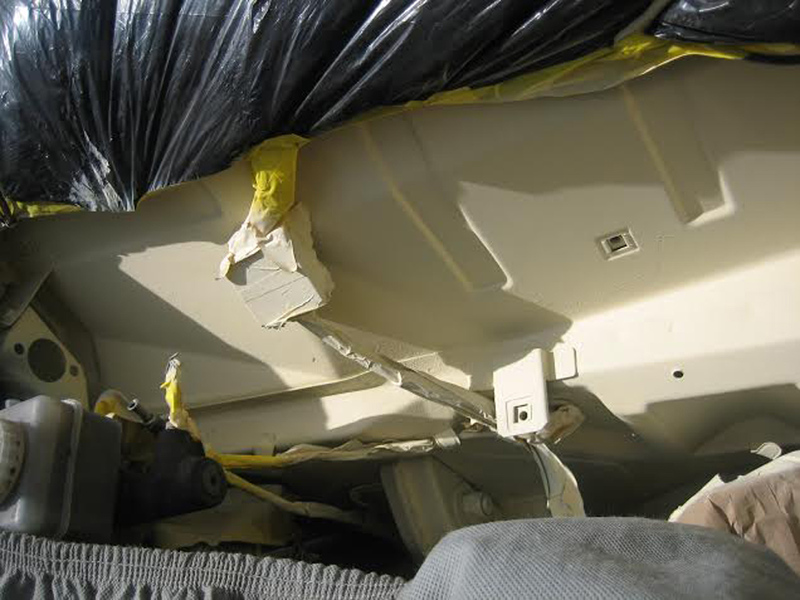 My local auto parts store told me I would need to replace the trunk lid. I hat being told something can't be done. 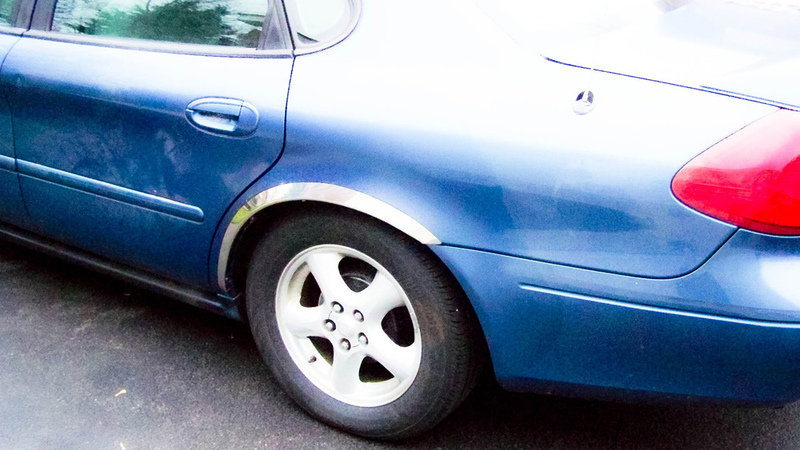 I bought a dent puller that required me to drill holes in the dent and had a sliding weight to pull-tap the dent. 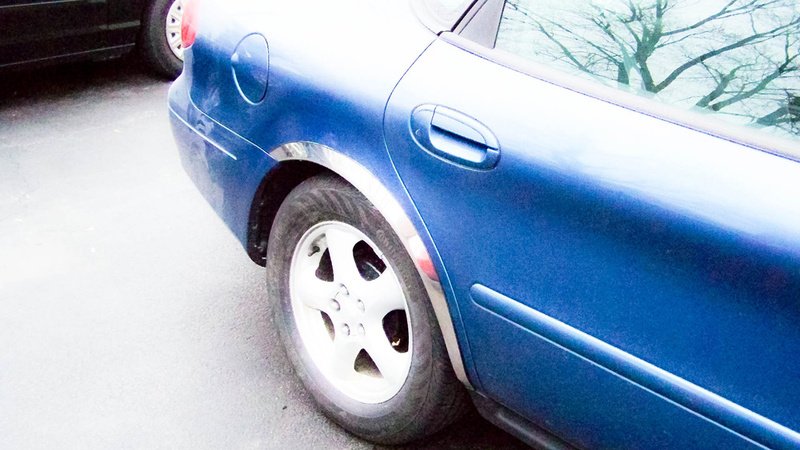 I stripped out every screw hole without making any impact on the dent. It was only at that point that I started taking pictures. At this point I had to decide whether to give up or keep trying. 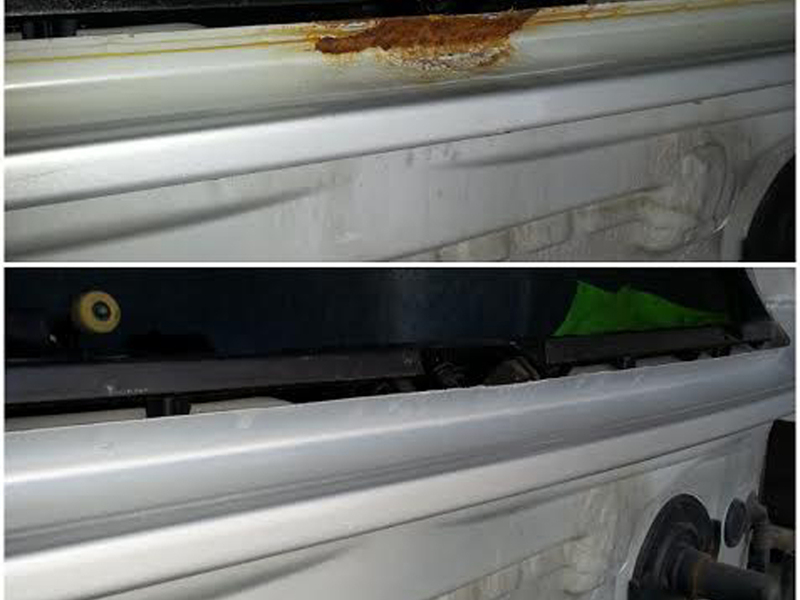 So I went to a hardware store, bought an electrical junction box for pulling support and threaded a bolt into a washer and nut on the backside. 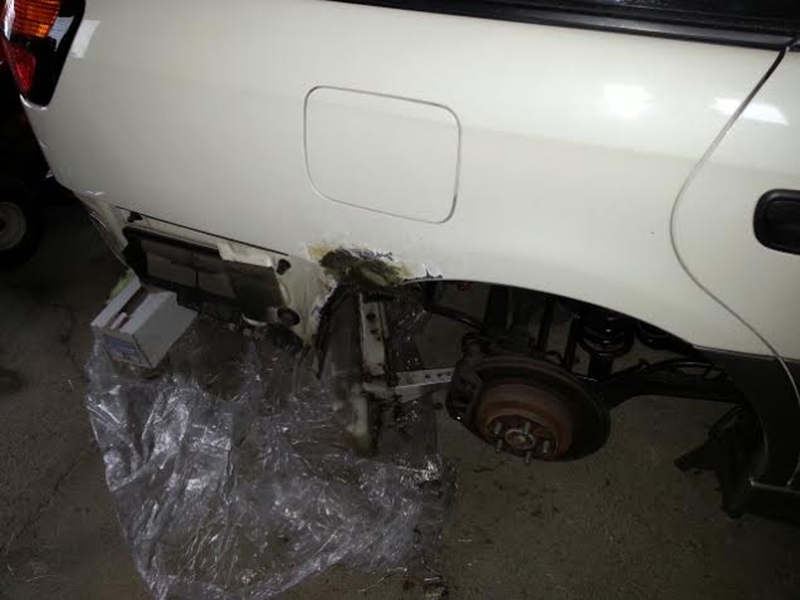 I had to stick a wrench in a piece of pipe and duct tape the washer and nut to it to get access to the holes since my trunk lid has a double wall. 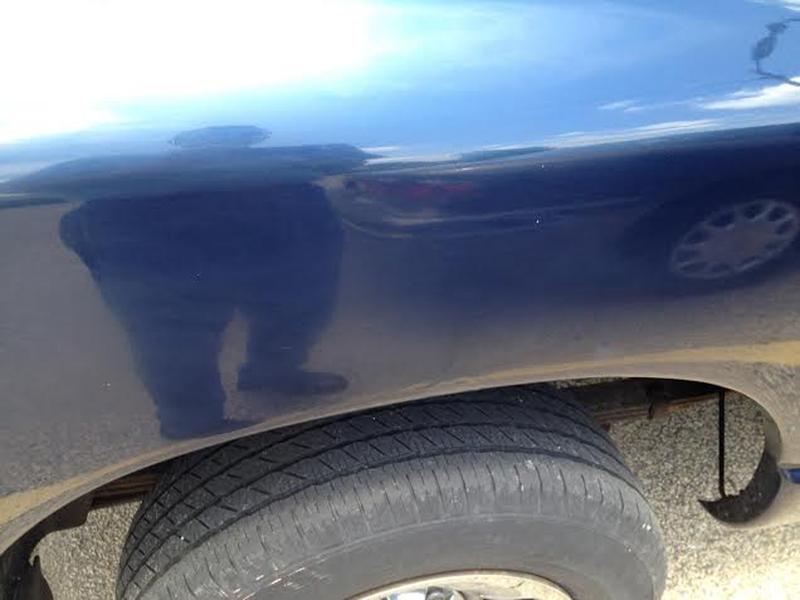 I got the dents pulled out pretty close. Sanded good. 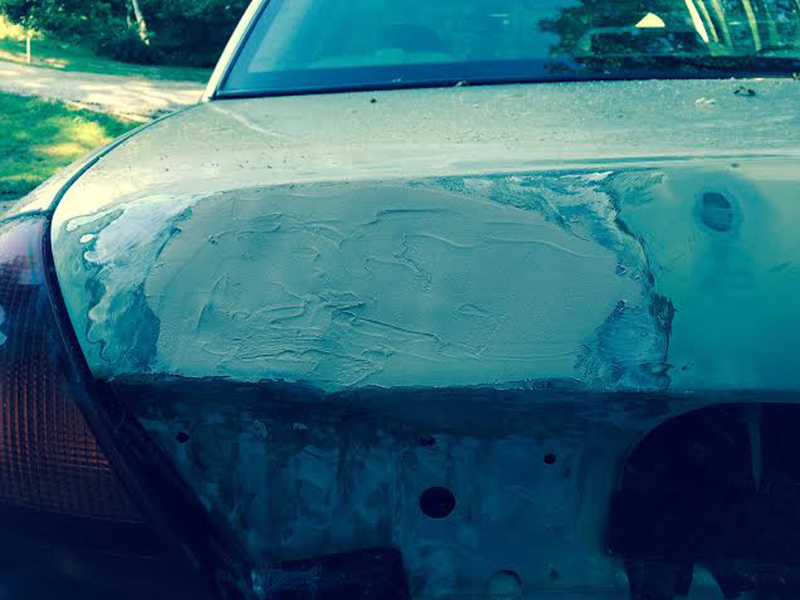 Used Bondo products to cover the holes and sanded smooth. 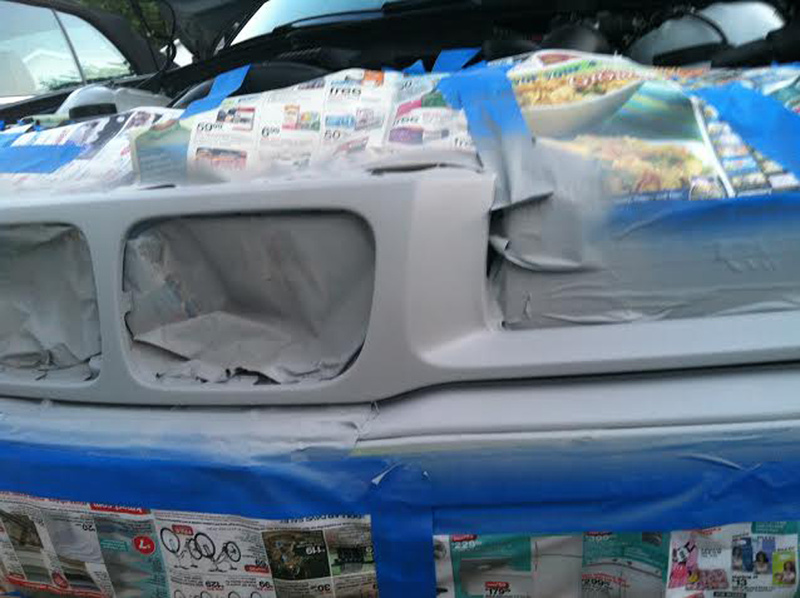 Then I applied your primer and paint. 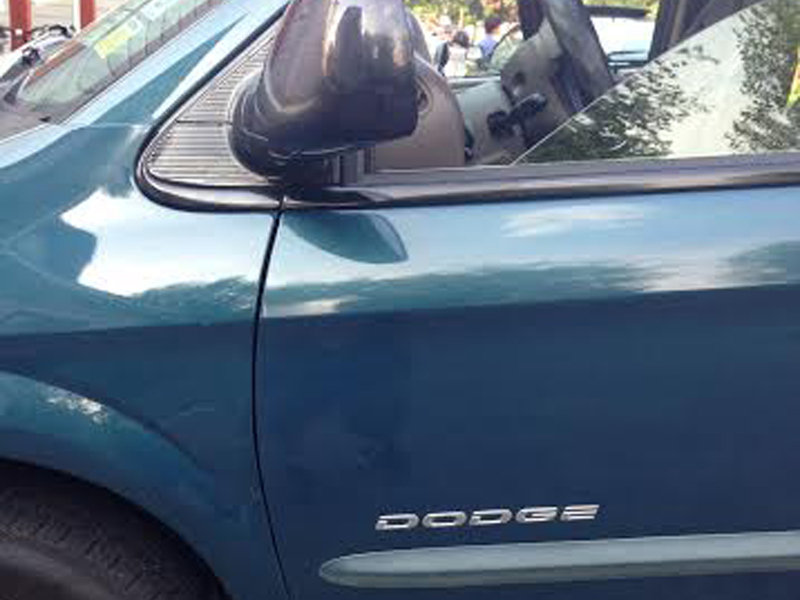 The paint was probably a perfect match to the original paint. 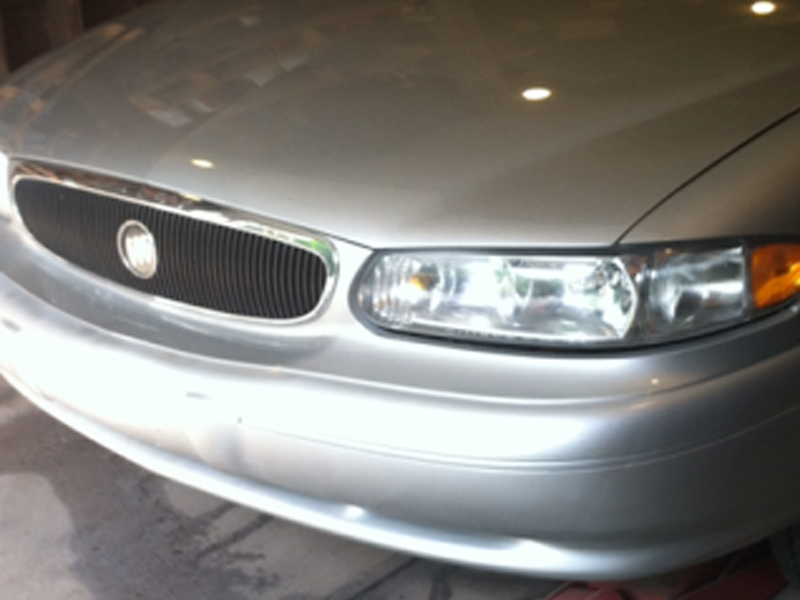 But since my paint had faded, there was a slight difference. 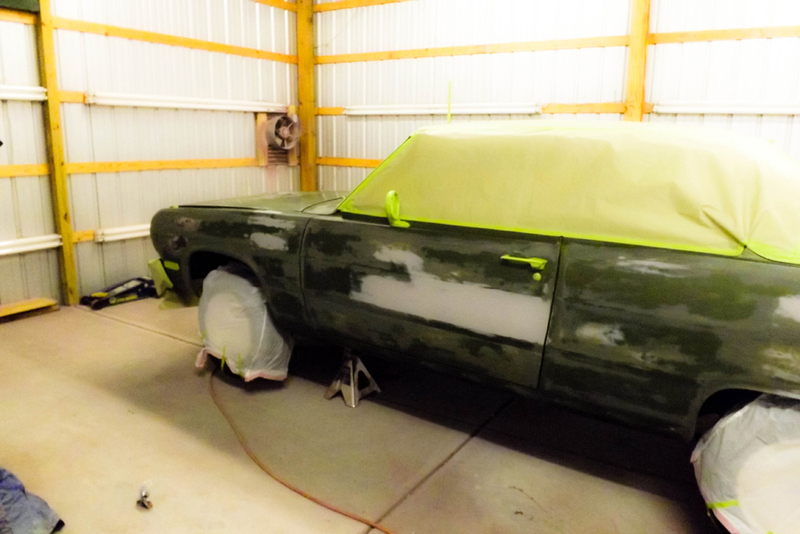 I intuitively blended it in by spraying less paint as I moved from the repair to the surrounding areas. I have yet to polish it out, but I couldn't be happier. 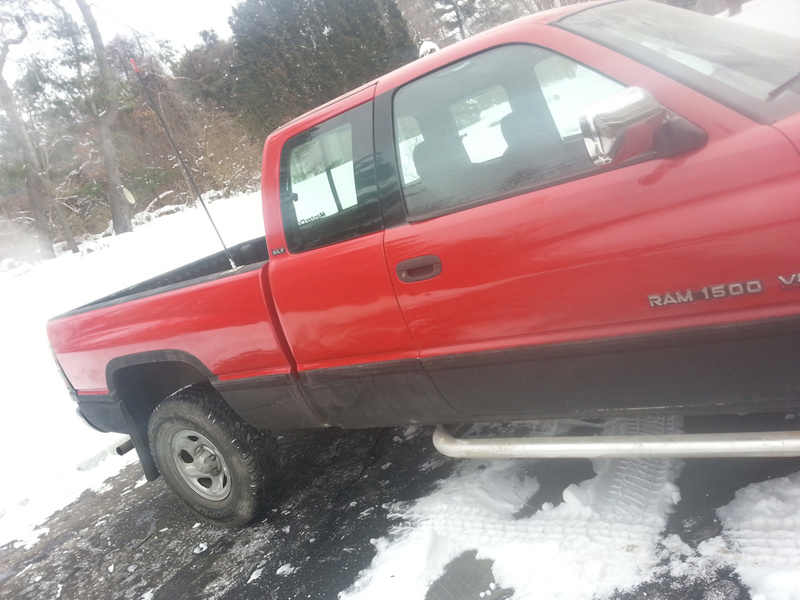 I now have the confidence to tackle my 1985 Dodge 600"
"I am so pleased with your product. 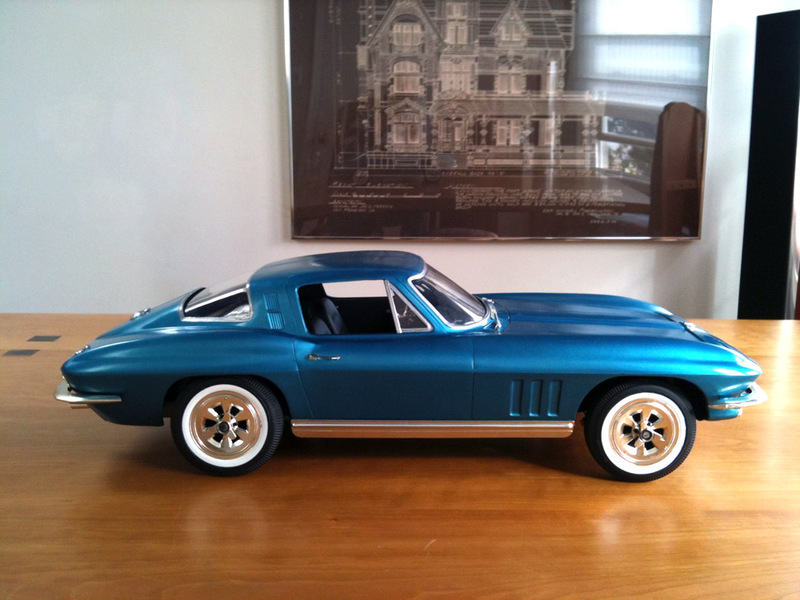 I just finished my car. I am a 76 year old grandma. Thank you!" 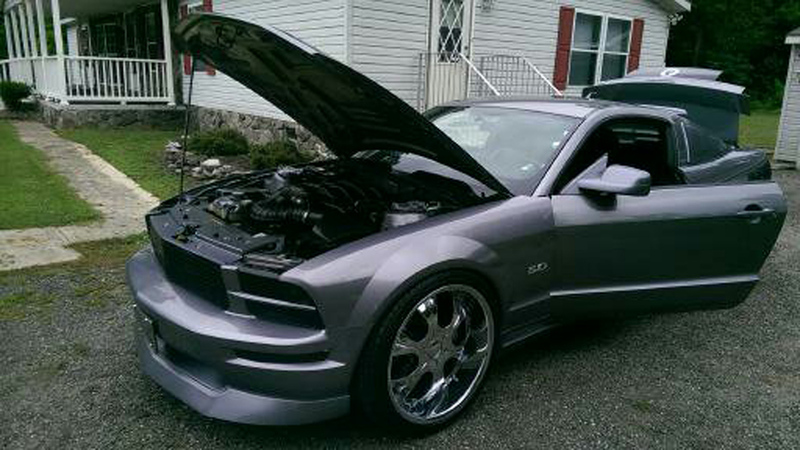 "I hate chrome! 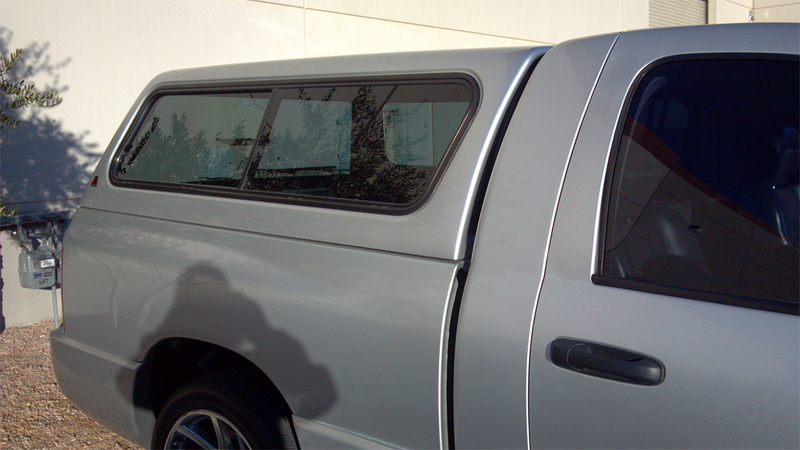 Products were impressive, I was leery about spraying the Nautical Blue Metallic, but it turned out great. 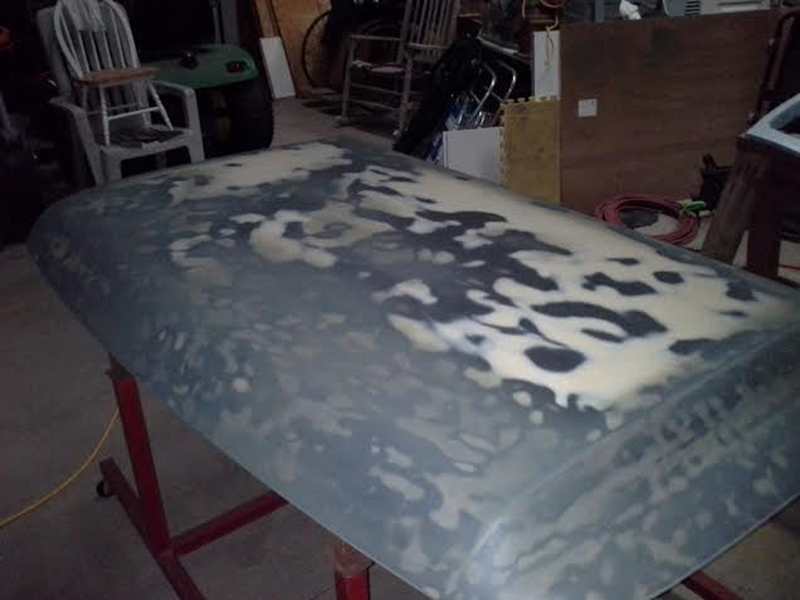 Surface sand, 2 coats of adhesion promoter, 3 coats of primer, 3 color coats and 4 coats of clear... 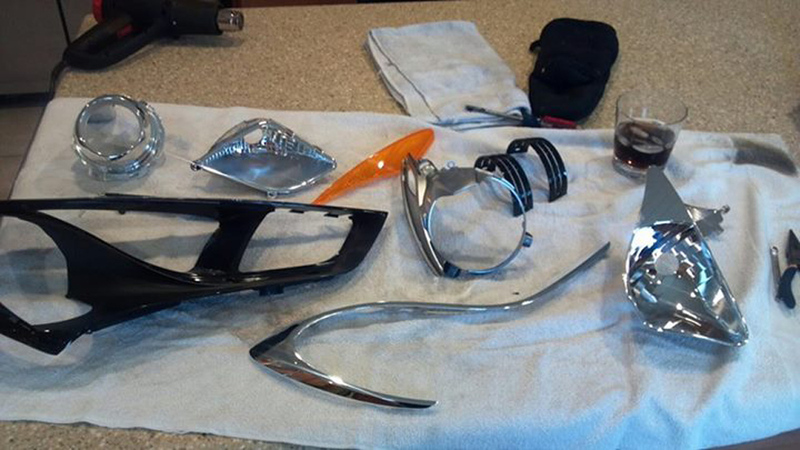 Wait 24 hours and wet sanded to 2000 and hand polished out. 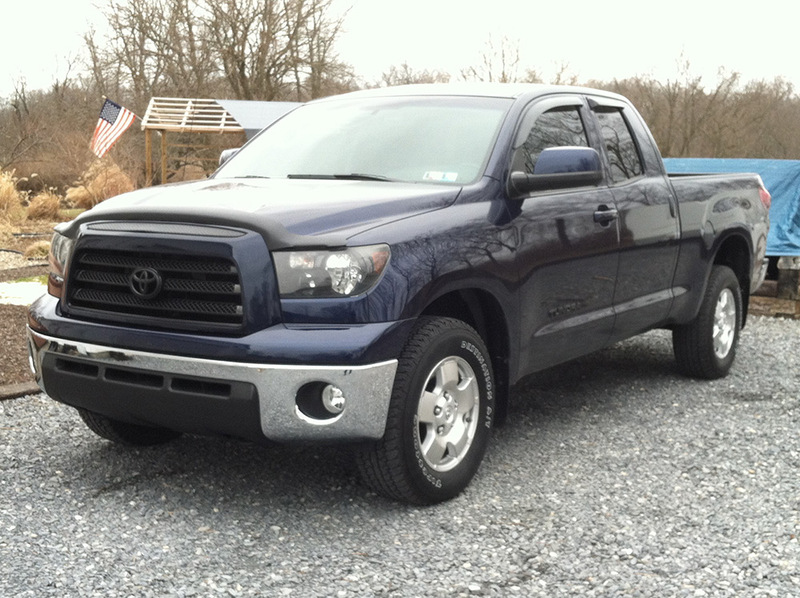 Looks better than what Toyota did!" 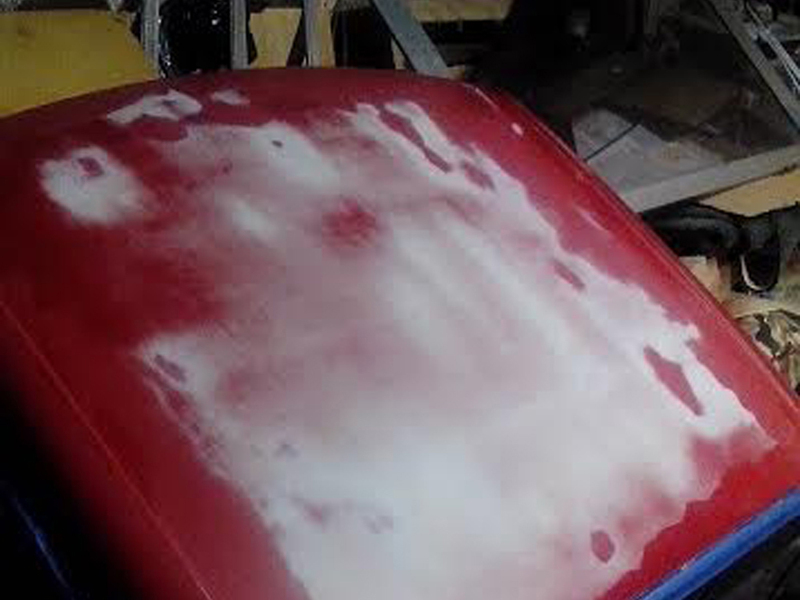 "Paint job restoration on the hood of my wife's 2003 Saturn L200. 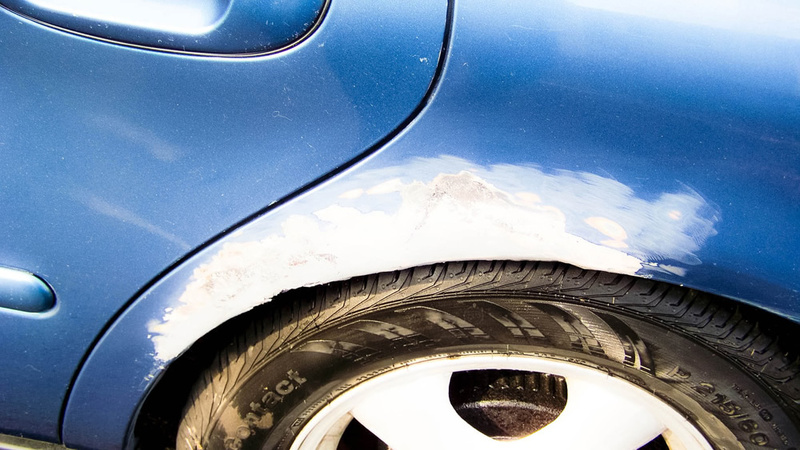 It had corrosion under the paint that began as little peels that kept growing to the point where I was ashamed to even let my wife drive the car. 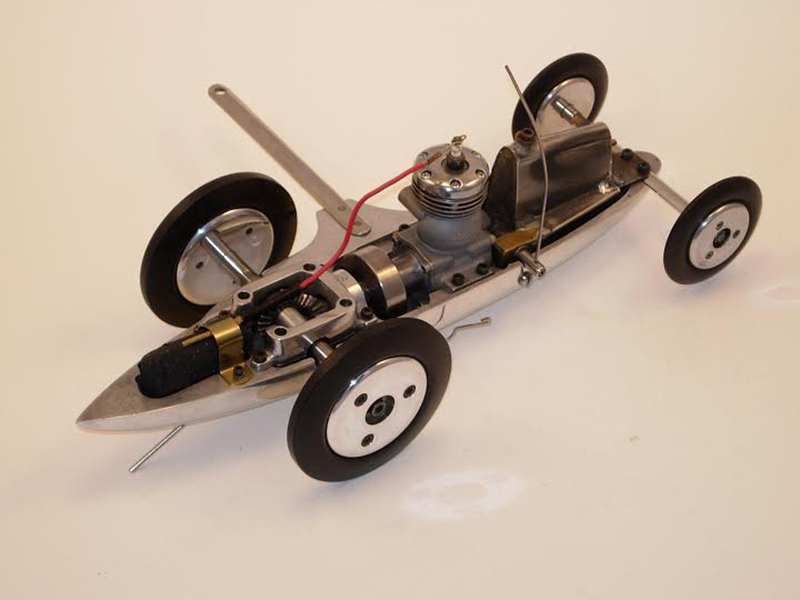 I enjoyed the project and the finished results were better than expected. Even the guys at work were impressed. Lord really blessed this one. 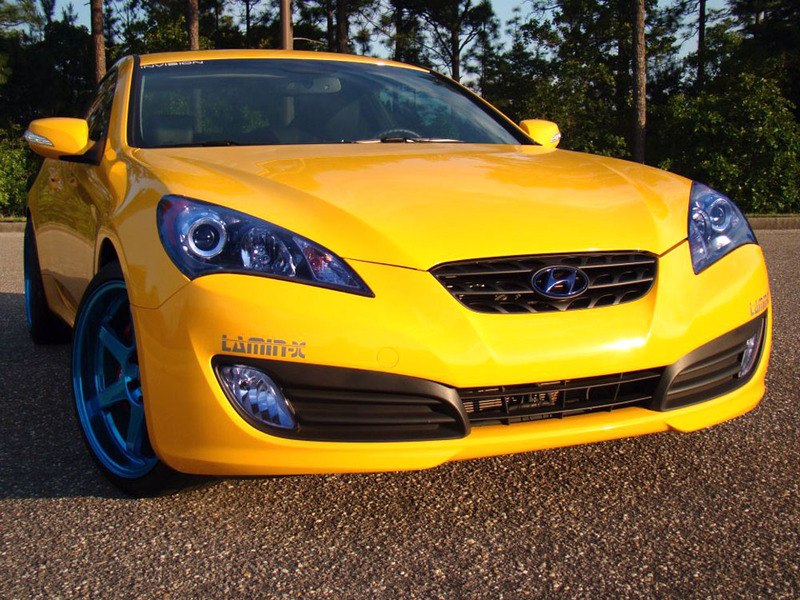 Great paint! Thanks!" 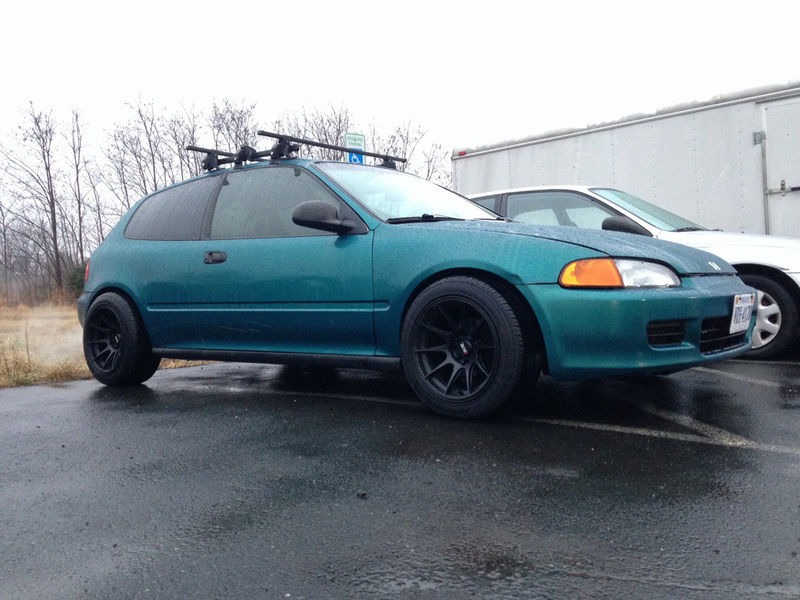 "1995 honda civic hatchback I had to buy a new bumper a body shop gave me a quote of $200.00 I spend about $50.00 in paint, tape and clear and a few hours later a have a bumper that looks like the oem one great paint I have already recommend this paint." 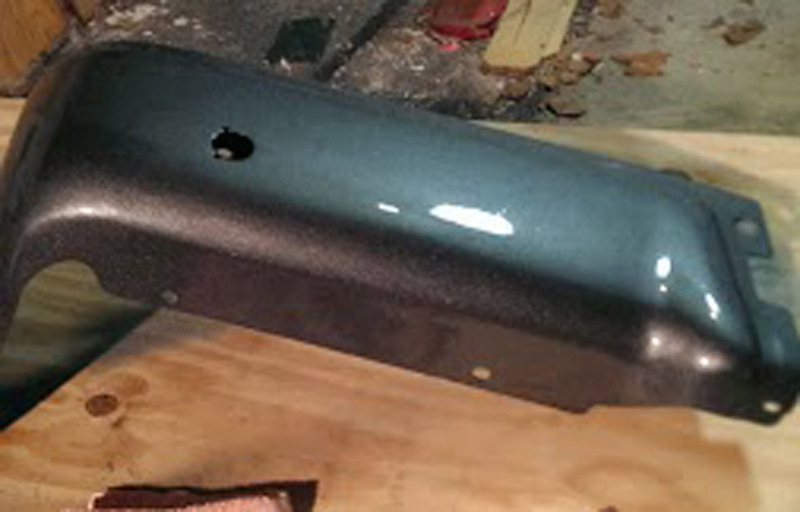 "I found a set of 2011 ford f150 bumper pieces that were primered the problem was painting everwhere i checked they wanted more to paint them than i gave for them. 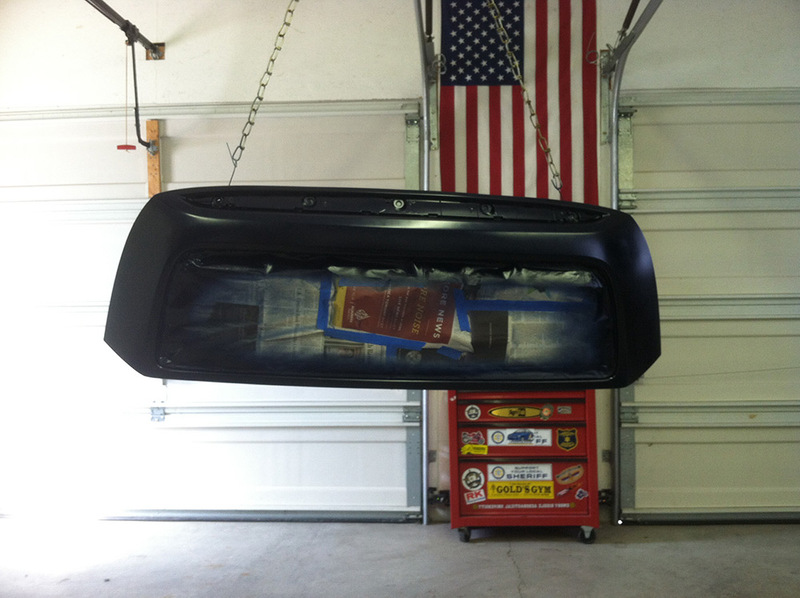 Automotive Touchup solved that problem with their quick shipping and near perfect match paint. 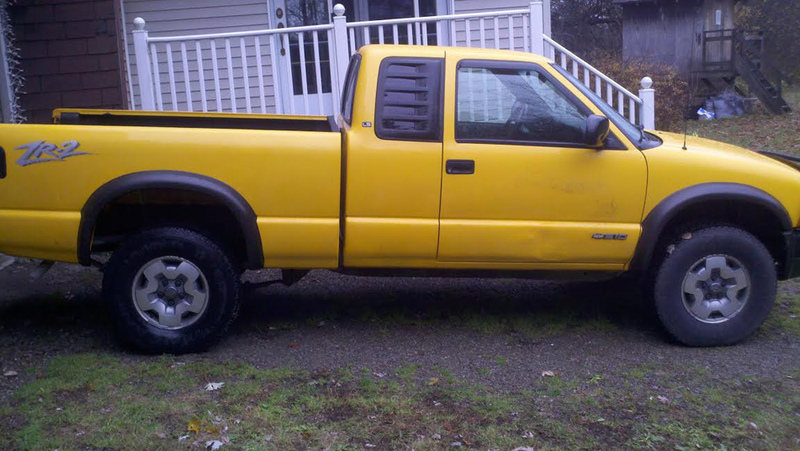 Thanks saved me alot of time and about 100 dollars." 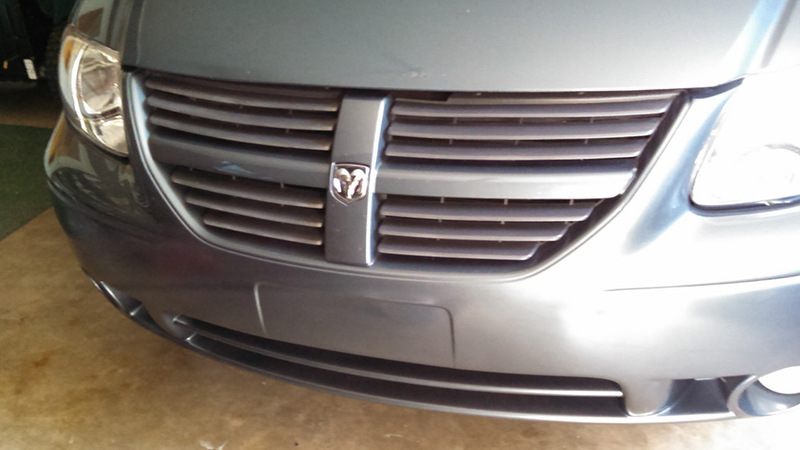 "2006 Avura TSX, Granite Pearl, front and rear bumpers." 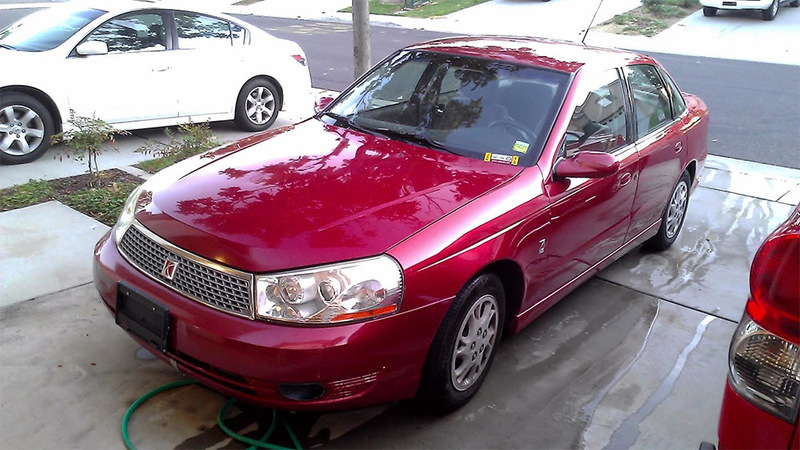 "2003 Mitsubishi Galant. 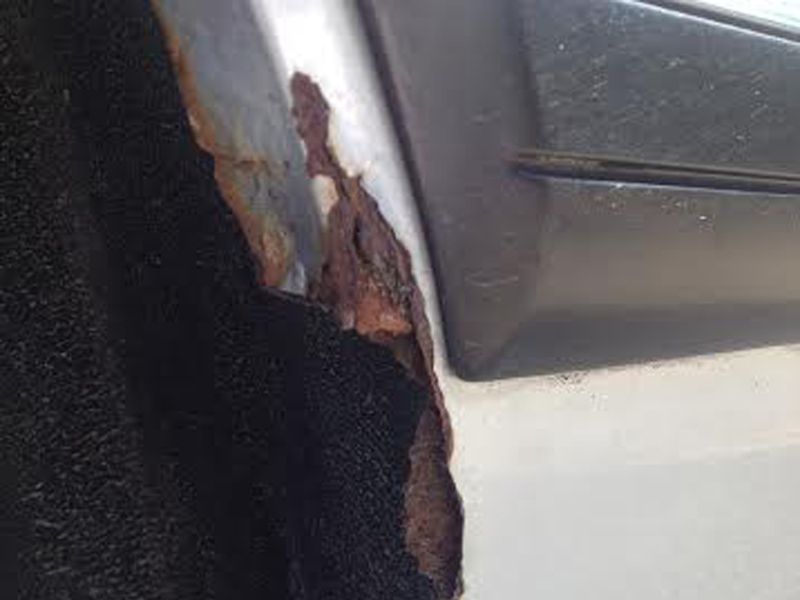 Severe rust and oxidation on roof.."
"My most excellent preparation of a new bumper cover for a 05 Hyundai Elantra. 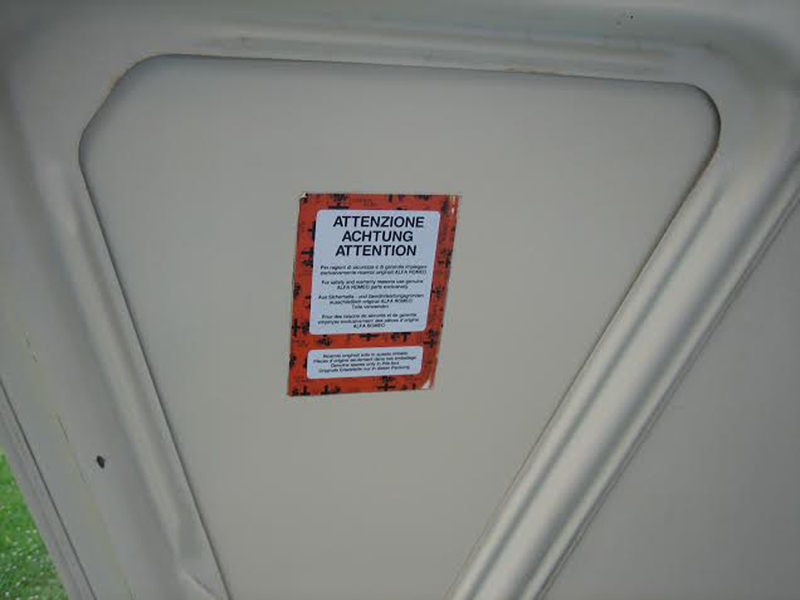 An ecactatch. 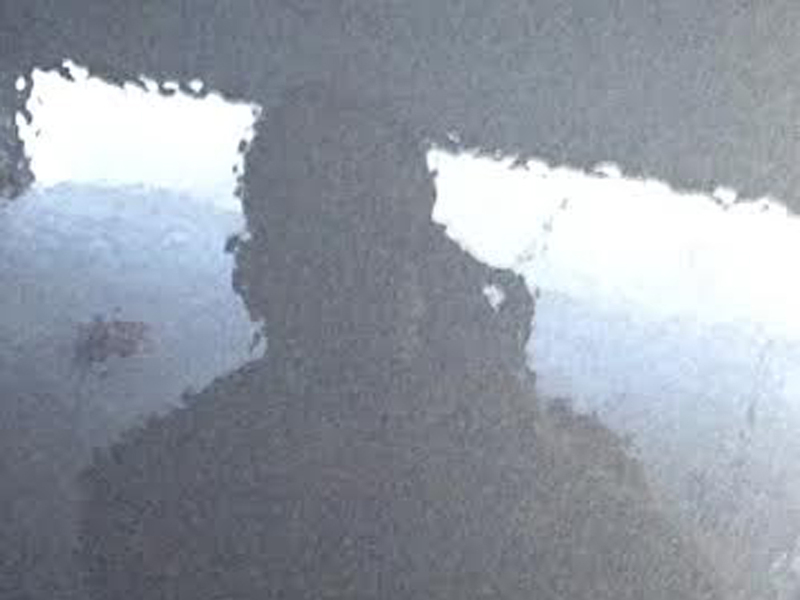 And I did it myself using an appropriate mask respirator." "Hello! 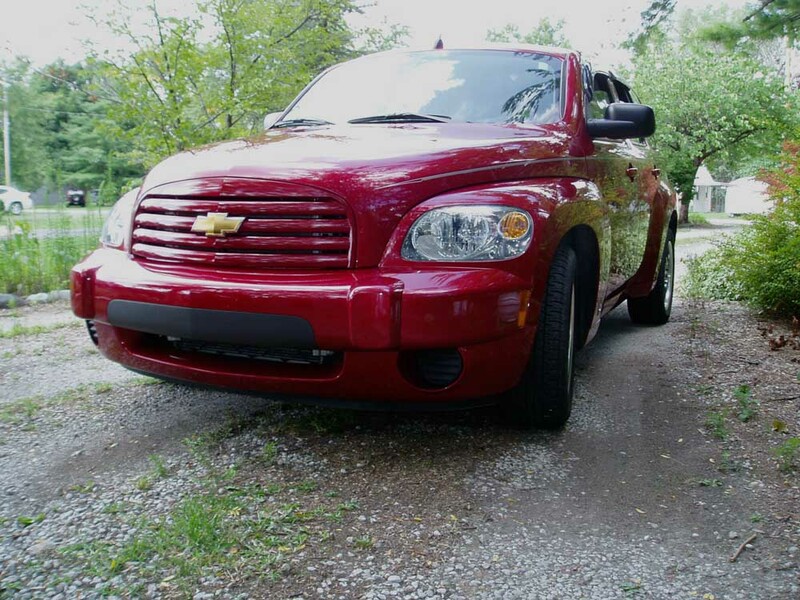 I just submitted my review but found a few more good pictures that show better angles of our before and after work. 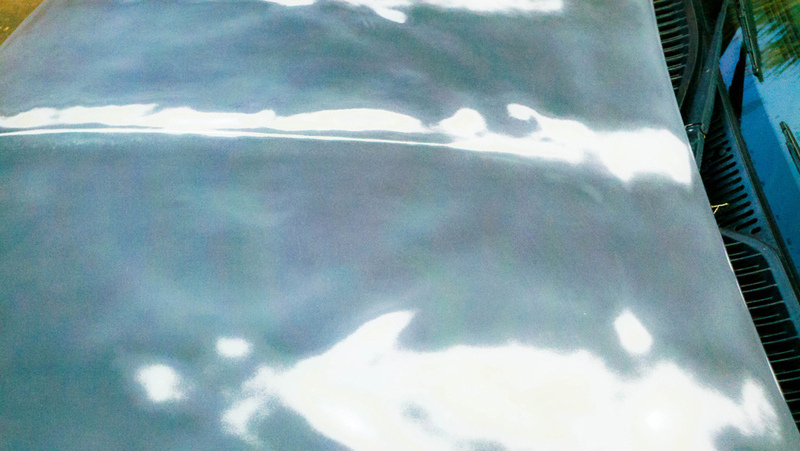 Please feel free to choose the best ones if you'd like to add them to your site. Thanks!" 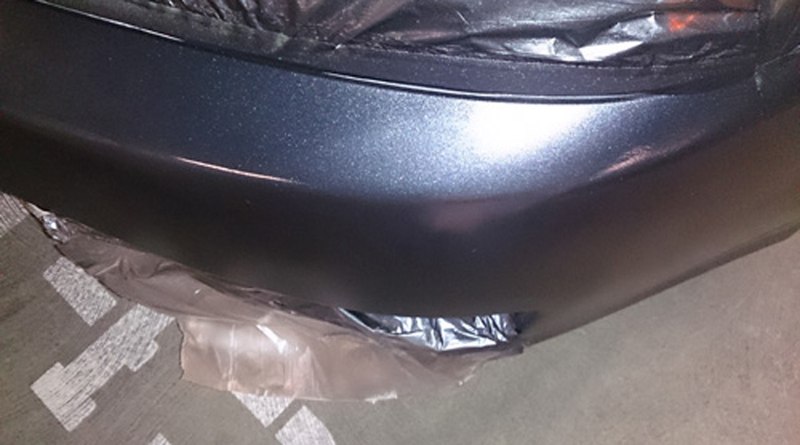 I also just purchased a pint of Silver for my 2014 Toyota Camry to spray the vent visors to match car. Both paints were perfect matches. Thanks." 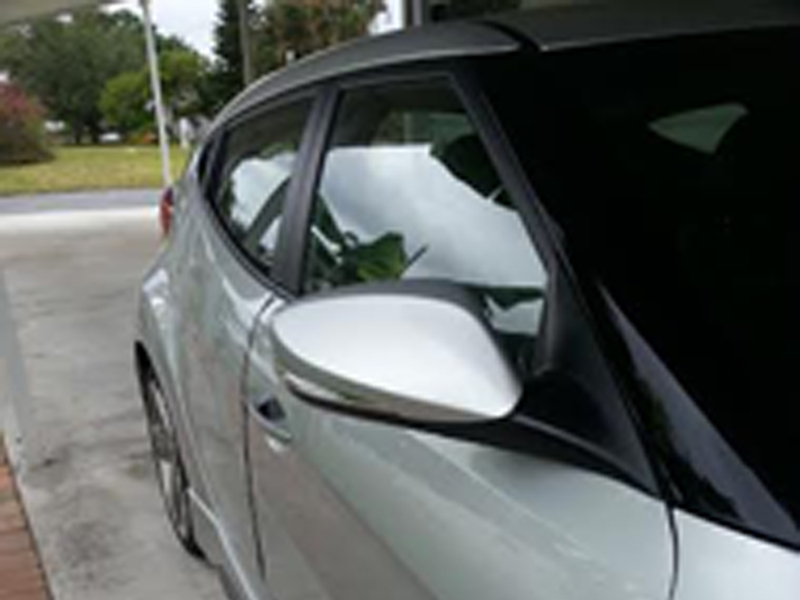 "Before and after pics thanks for a great product.I couldn't believe how good it worked." 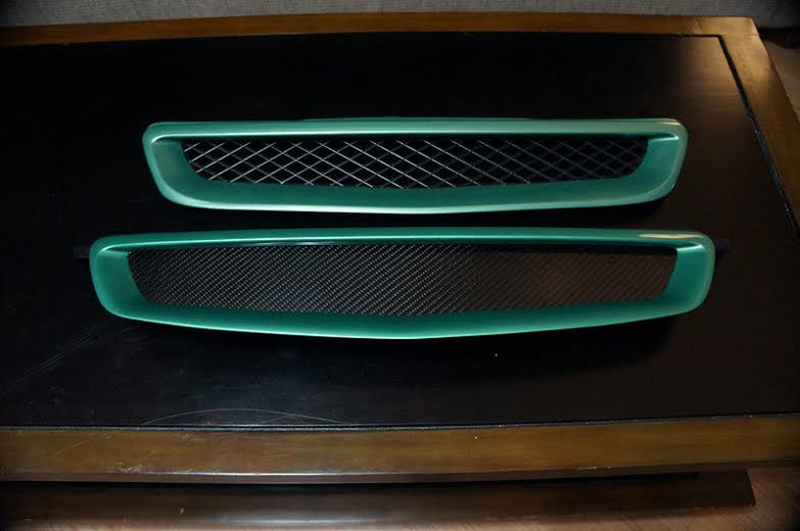 "Color matching chrome grill surround. 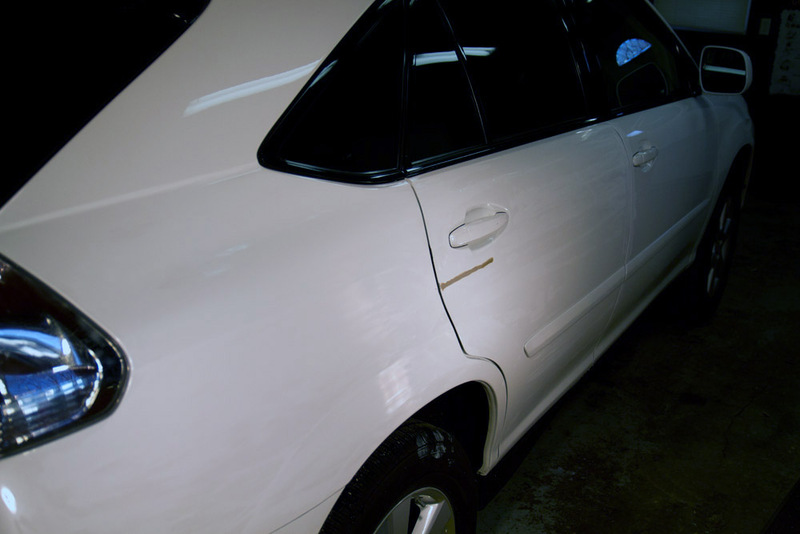 Toyota Spruce Mica paint and your clear too. 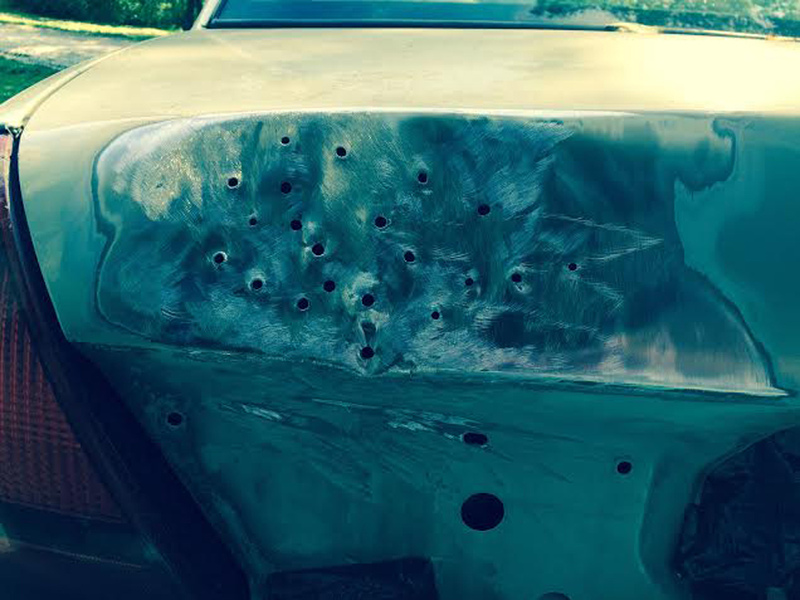 My rattle can job came out how I would expect a body shop to paint it. 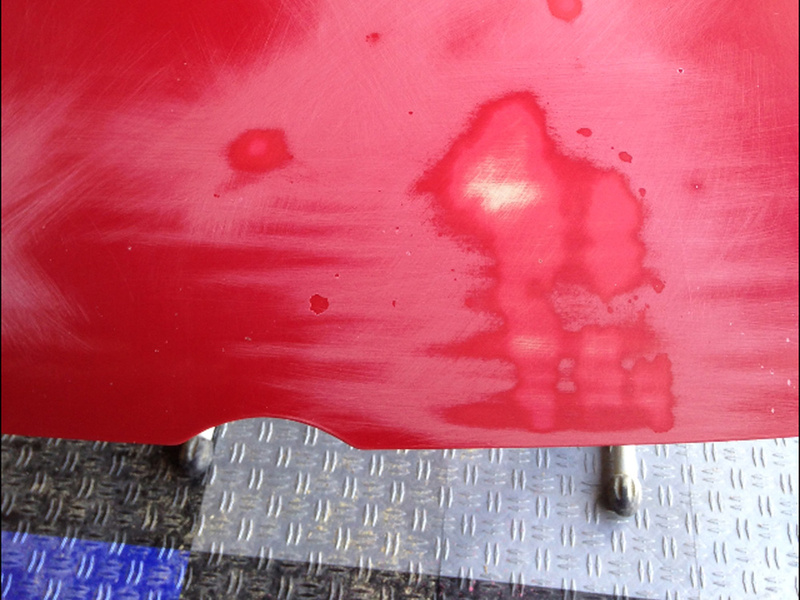 The 3rd picture shows a crazy deep color with perfectly smooth clear coat over it. I didn't have to sand at all.."
"In order to place this in context I had absolutely zero painting experience before starting out on this project. 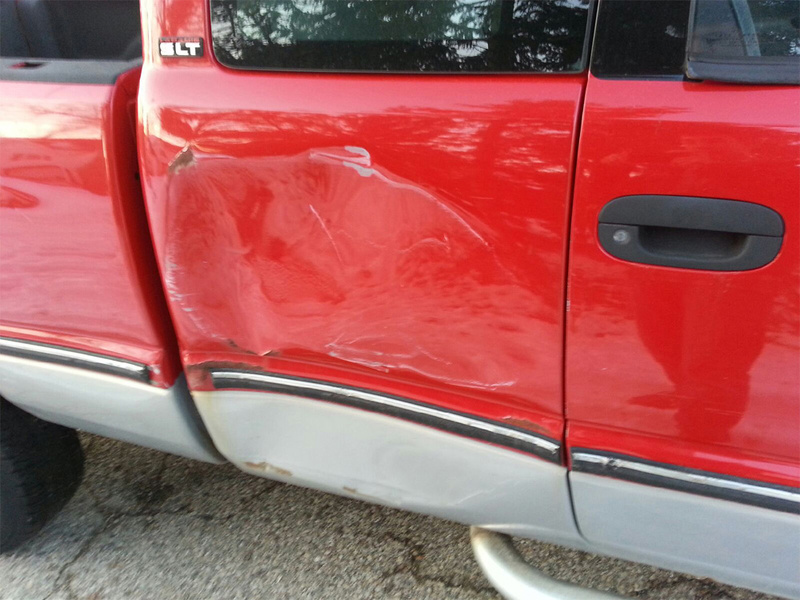 I figured since I got the truck for so cheap why not give body filler and painting a shot for myself... I am simply speechless, the results speak for themselves. 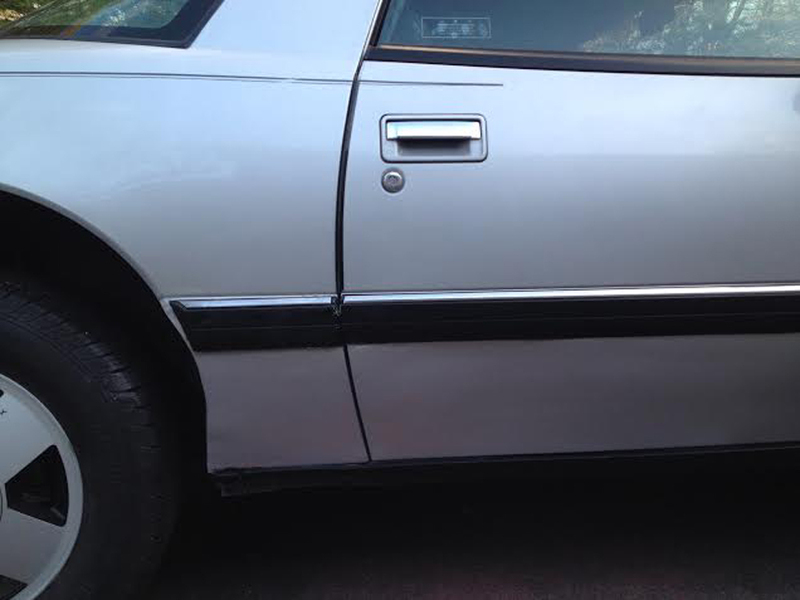 I banged out the dents, applied the filler and then all I did was follow the instructions on the can and on this website. 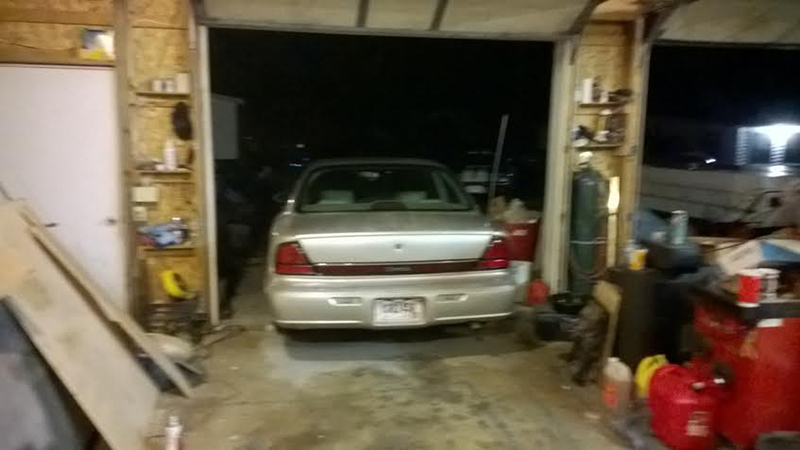 Also keep in mind I did this in a home garage (with lots of ventilation) in winter with a space heater for heat... I put this stuff to the test. 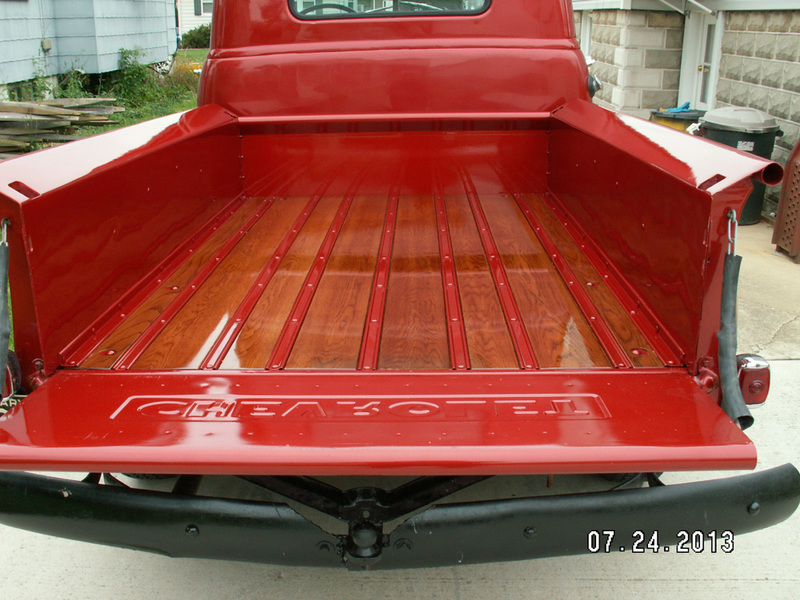 The first picture is when I bought the truck pre bed-liner applied to rocker panels. 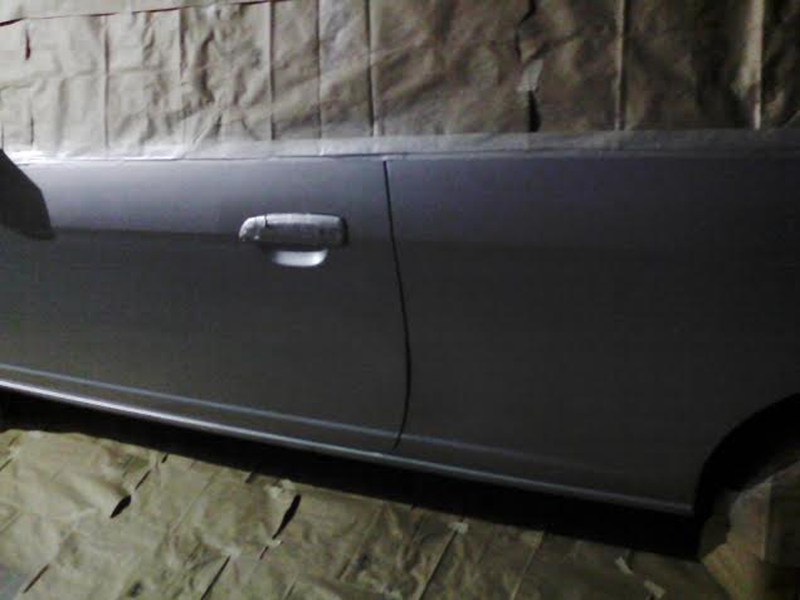 Second pic is pre clear-coat. 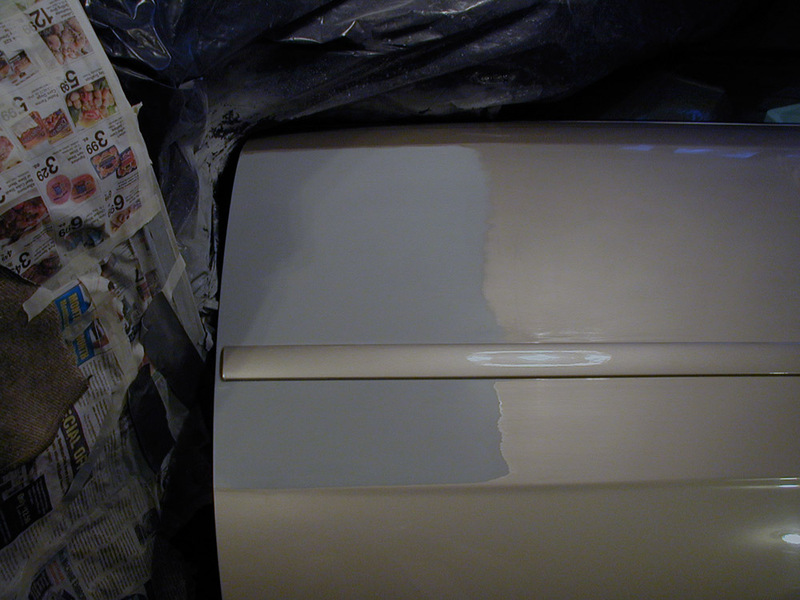 Third picture is showing how well the factory paint matched (left is original, right is new). 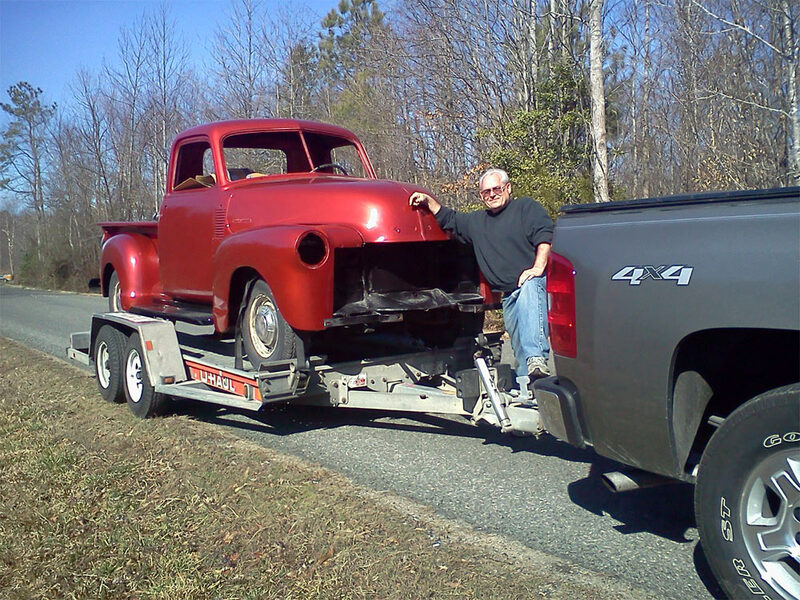 And the last picture is the trusty truck in all its glory, the part painted only looks different because I had just wiped it off and there's a layer of dust on the rest of the truck." 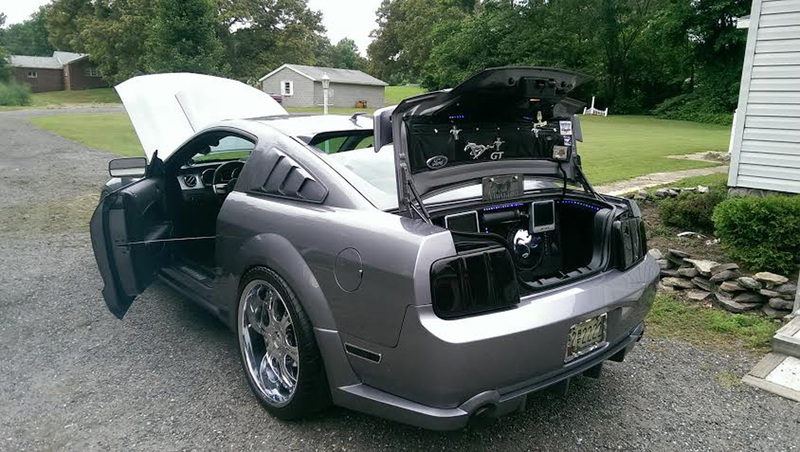 "Just to have my bumper painted was going to cost me a few hundred dollars, so I though my be I can do, by being just the back bumper. 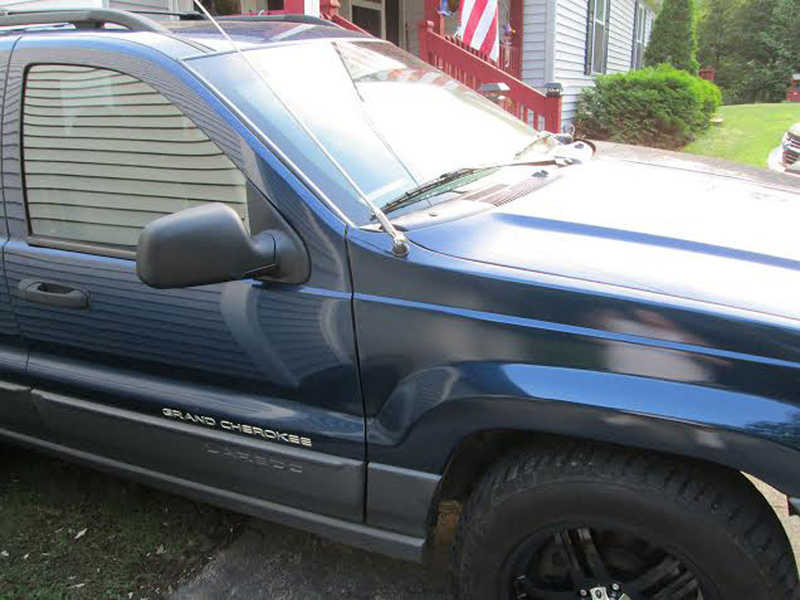 I did it and it looks really good, the paint color was a good match. 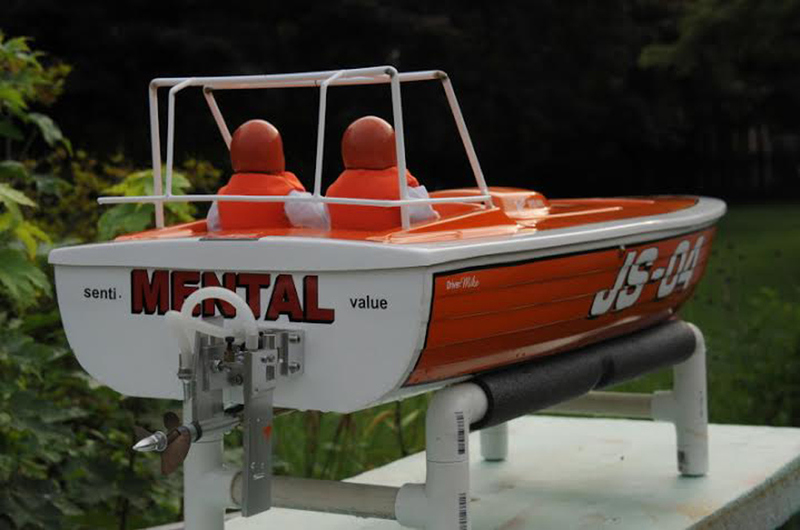 I will use these guys again for any small paint jobs I need. 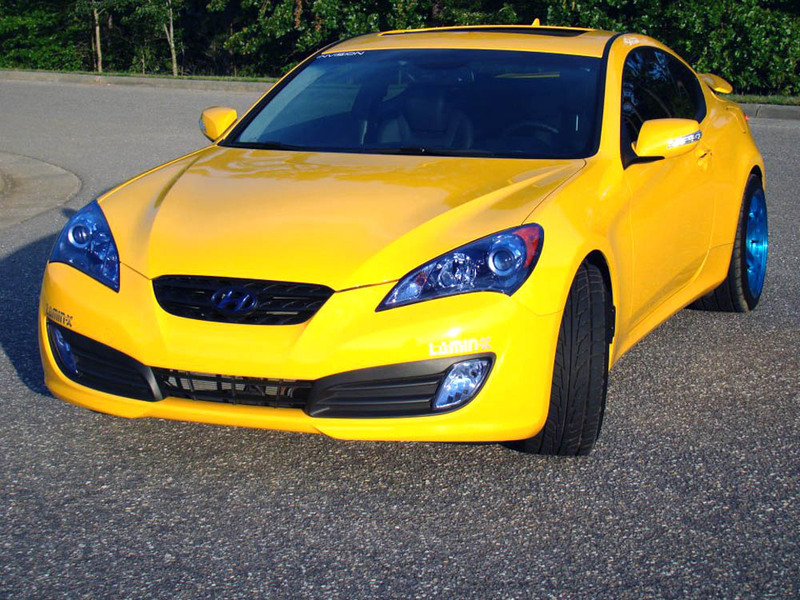 Thanks"
"2013 Hyundai Genesis Coupe - I forgot to upload my before pics of my headlights! 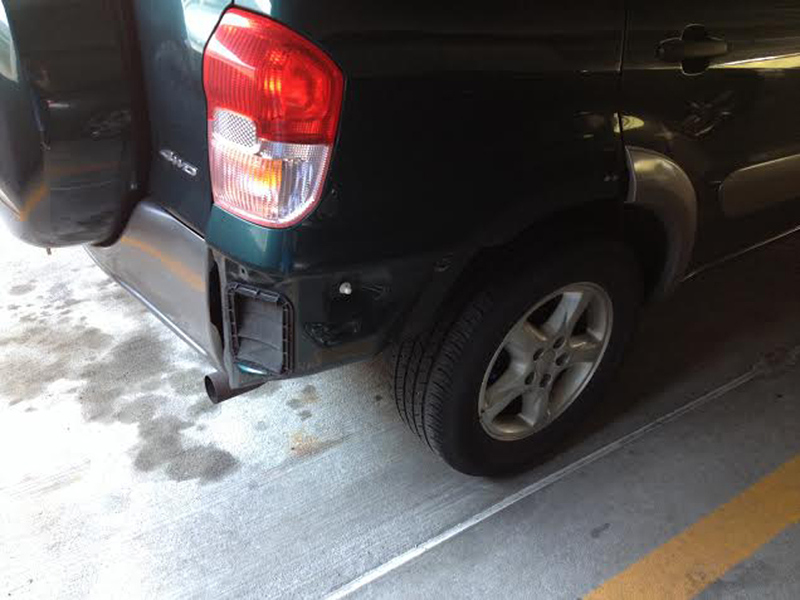 So here they are...."
"I had my rear bumper damage by someone side swiping me from the rear. 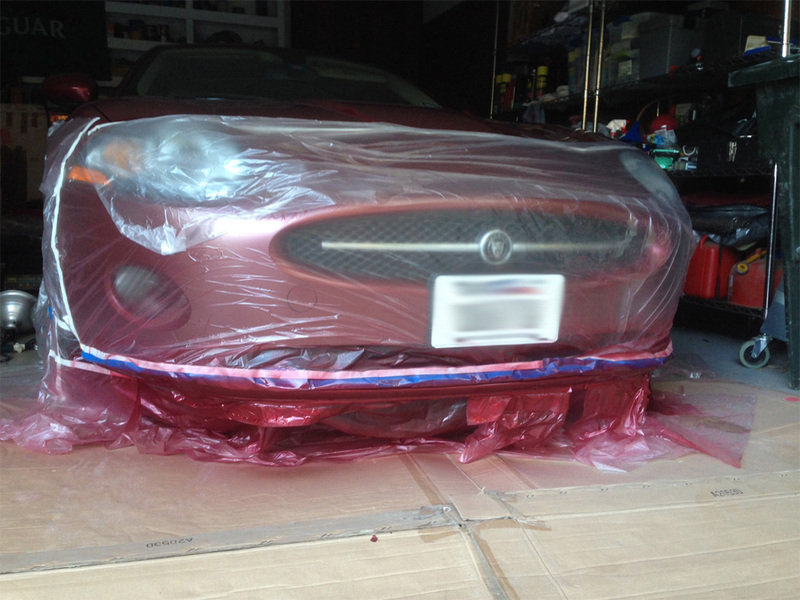 I ordered all the materials I needed to get it repaired and repainted from AutomotiveTouchUp. 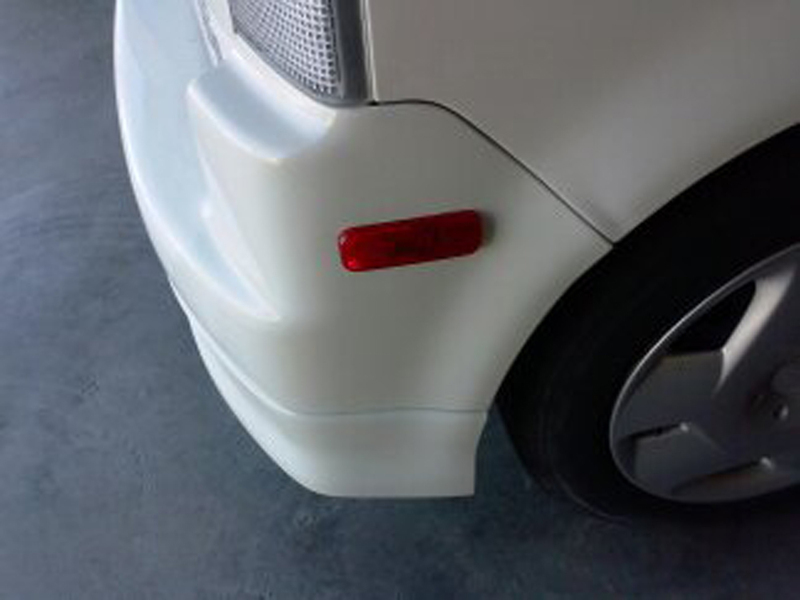 Great product, paint matched up nicely. This is the before and after pics. " 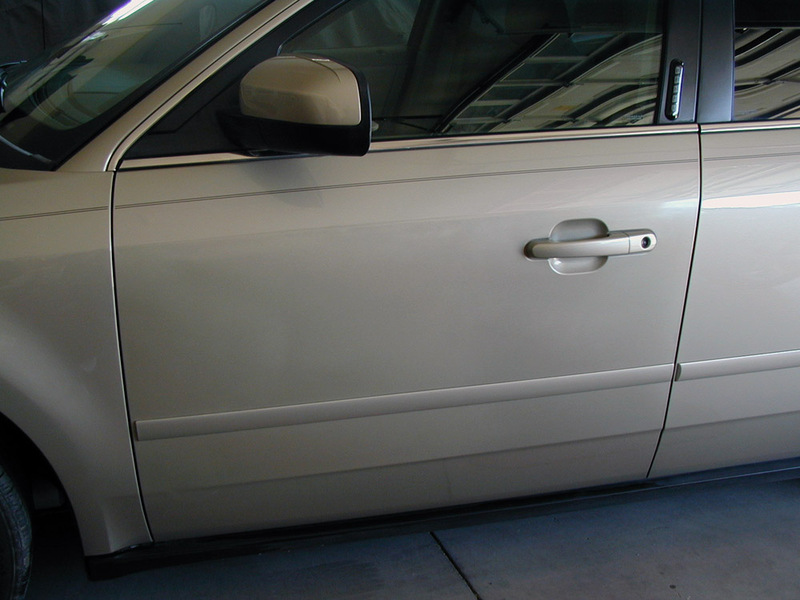 "The paint matched perfectly. 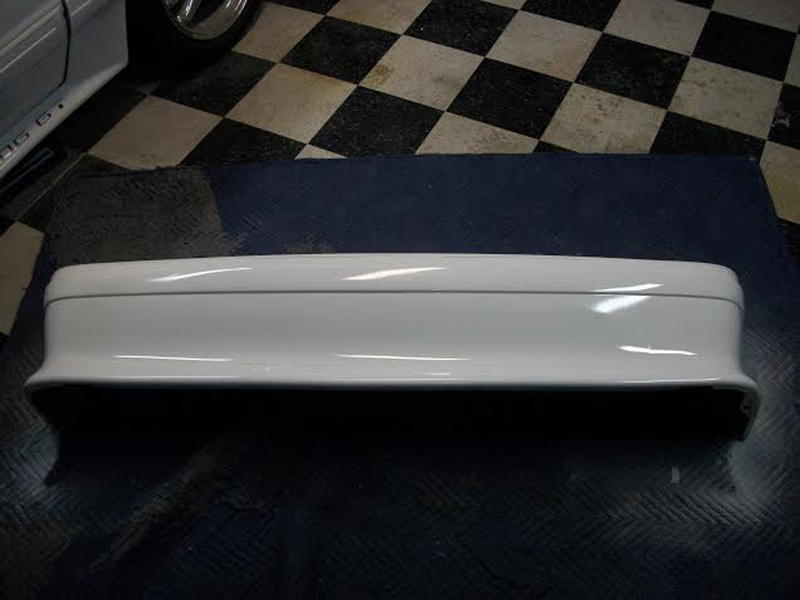 I used two coats of white primer, two coats of touch up, and a few coats of clear coat. Came out perfect! 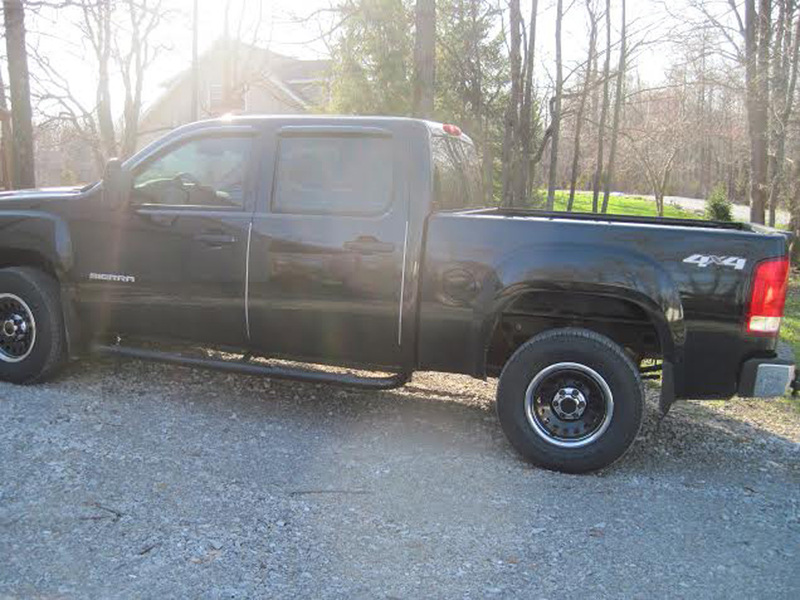 The other side of the truck is next, once it warms up outside. 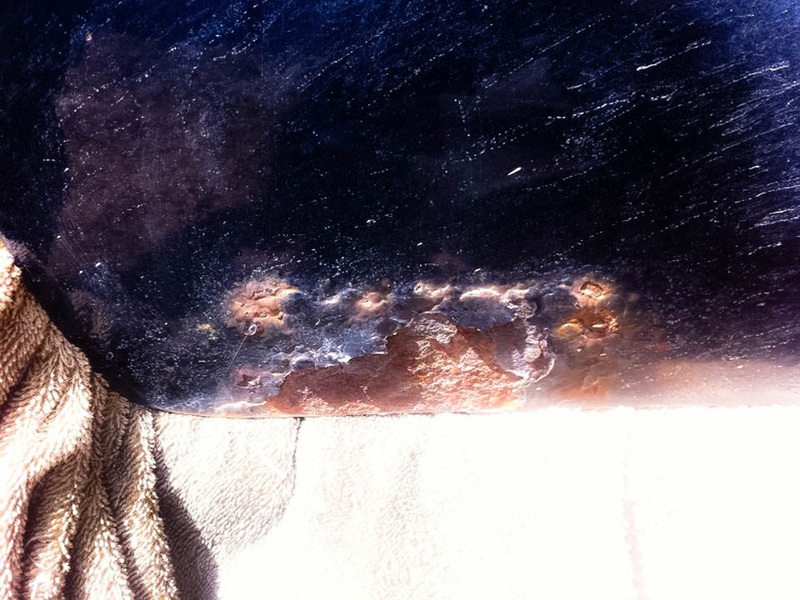 Let's just hope I killed most of the rust....."
"I'm so glad that I found AutomotiveTouchup spray paints before repairing rust damage on the tailgate of my Dodge pickup. 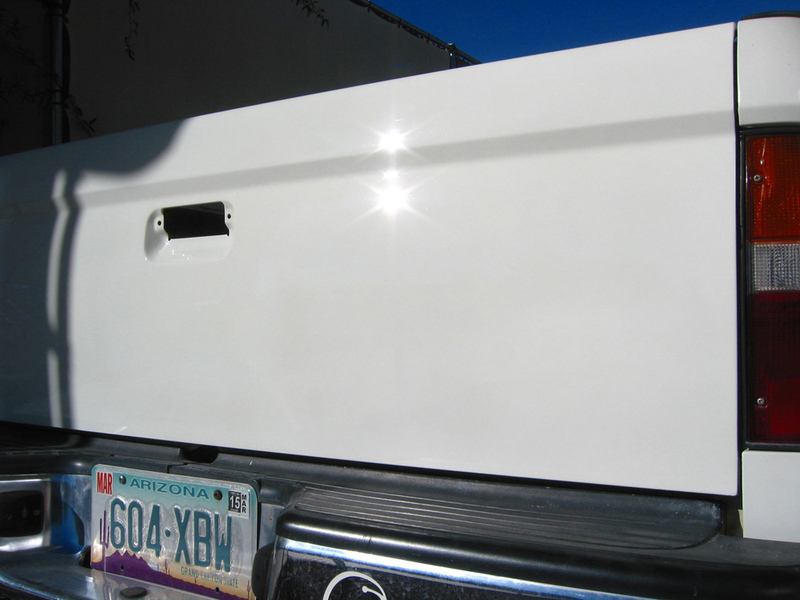 I didn't really want to refinish the entire tailgate so I decided to give AutomotiveTouchup brand a try for this small repair. These are professional quality paints! The match was perfect. I followed the label directions exactly and I couldn't be more pleased with my results. 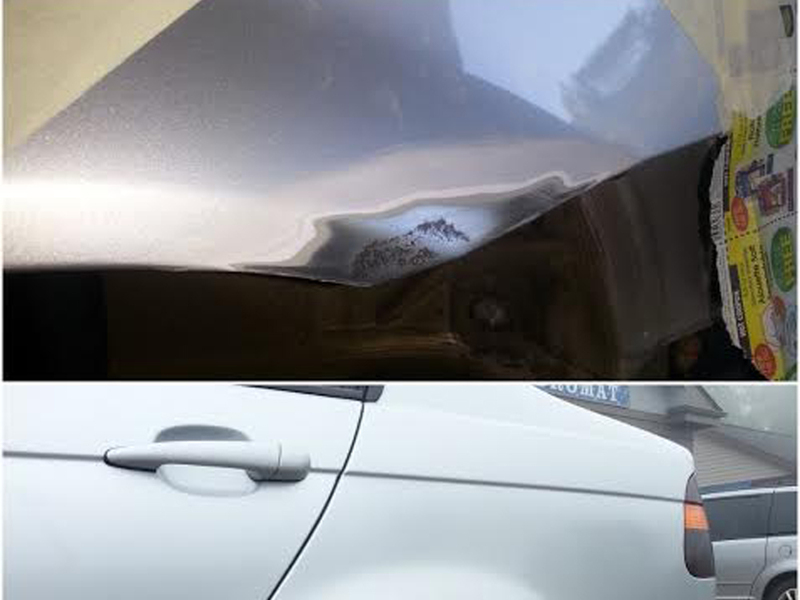 I would HIGHLY recommend these products to anyone doing a similar repair. 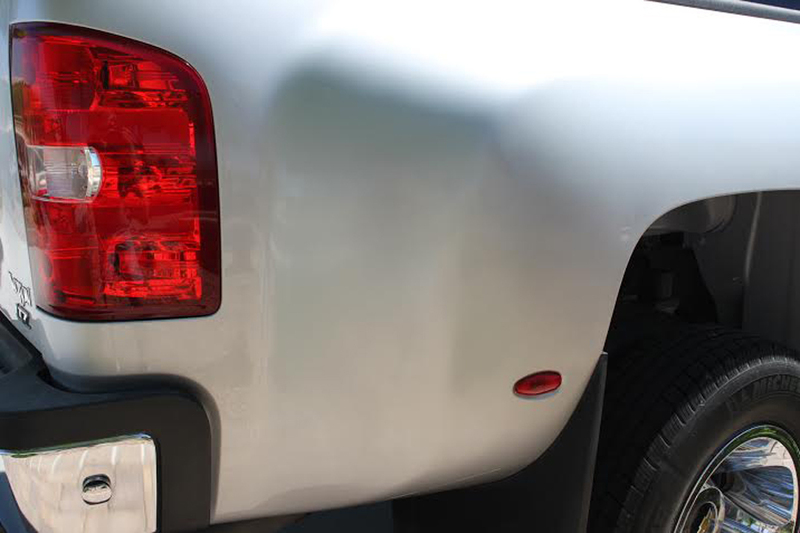 With such good results, I have decided to use AutomotiveTouchup paints when I repair some rust damage on the front quarter panels of this same pickup. 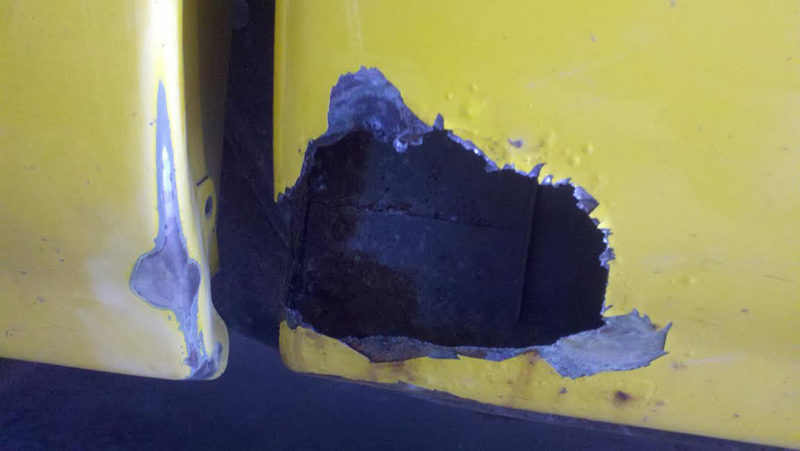 Picture #1: Original rust damage on the lower left corner of my tailgate. 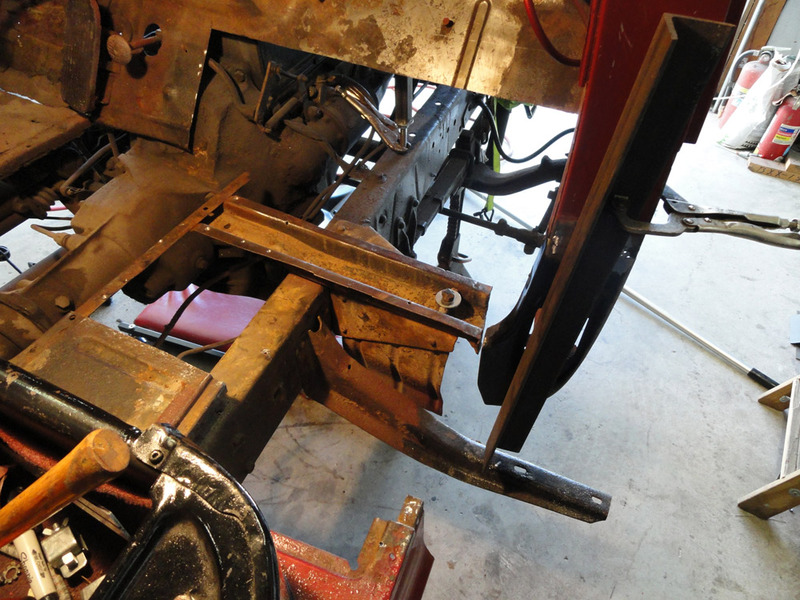 Picture #2: Rust area cut out and weld-through primer applied. 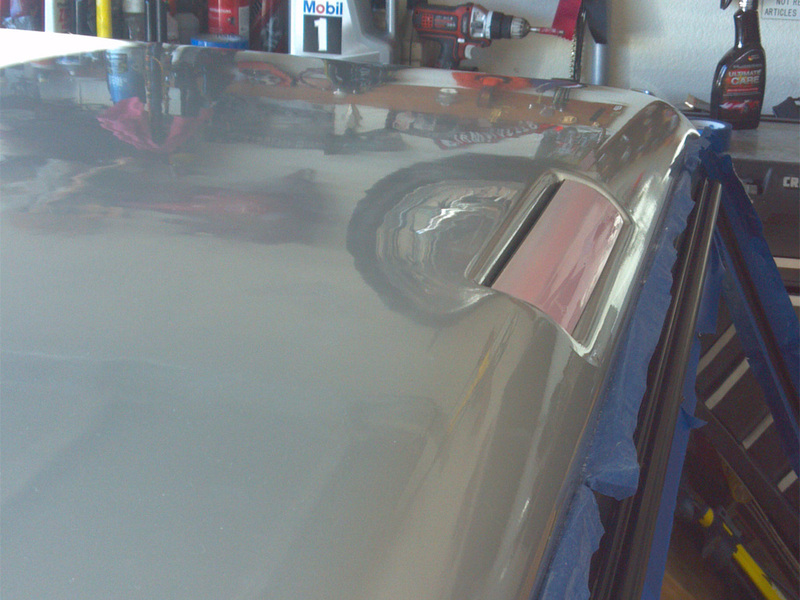 Picture #3: Sheet metal patch welded in place, ready for filler. 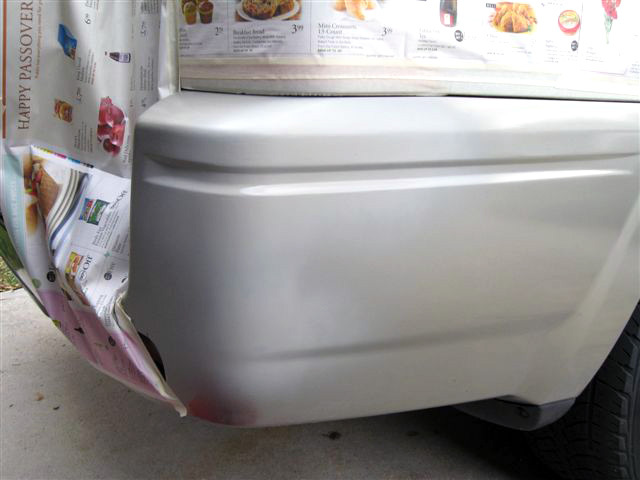 Picture #4: Finished tailgate being set back in place after application of AutomotiveTouchup Sandable Primer, Base Coat and Clearcoat." 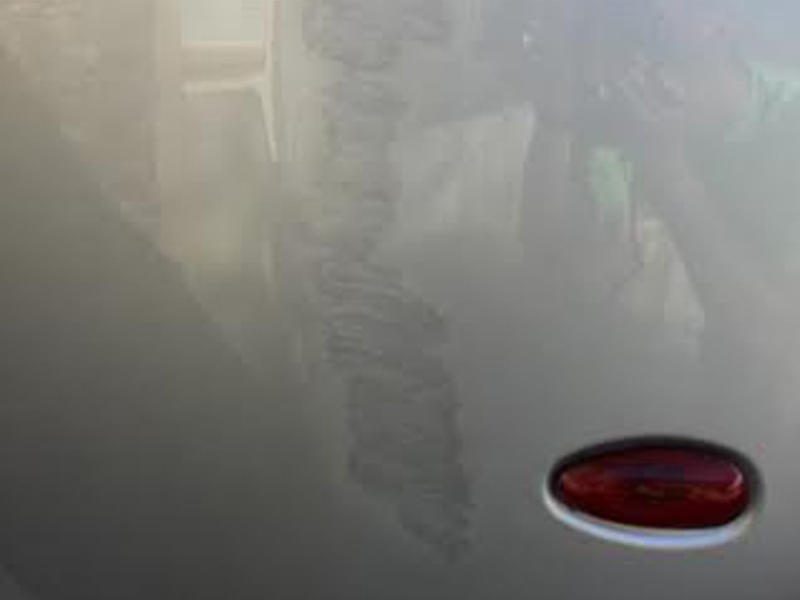 "The paint was spot on perfect can't really tell the scratch was even there. 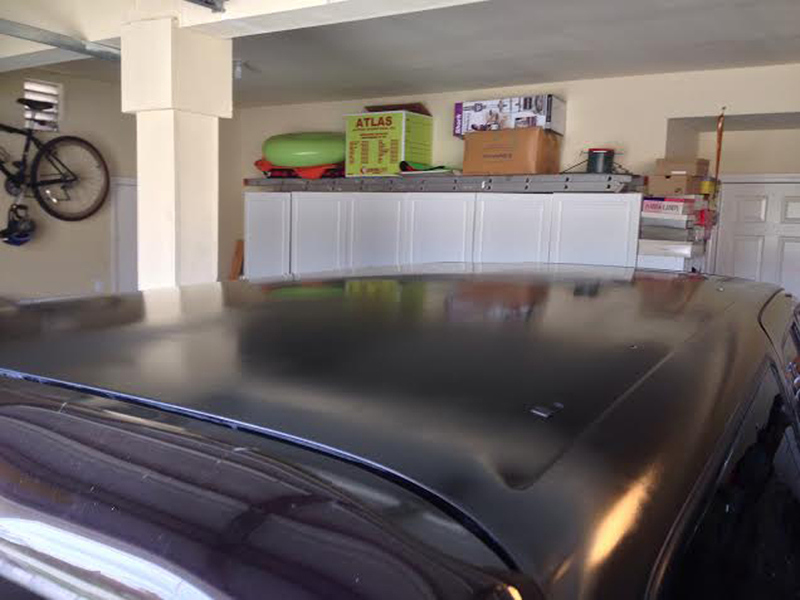 The base coat and the clear coat was perfect i love it"
"The paint was a very good match. I also appreciate the videos on how to use your products. They gave me the confidence to try the work myself. 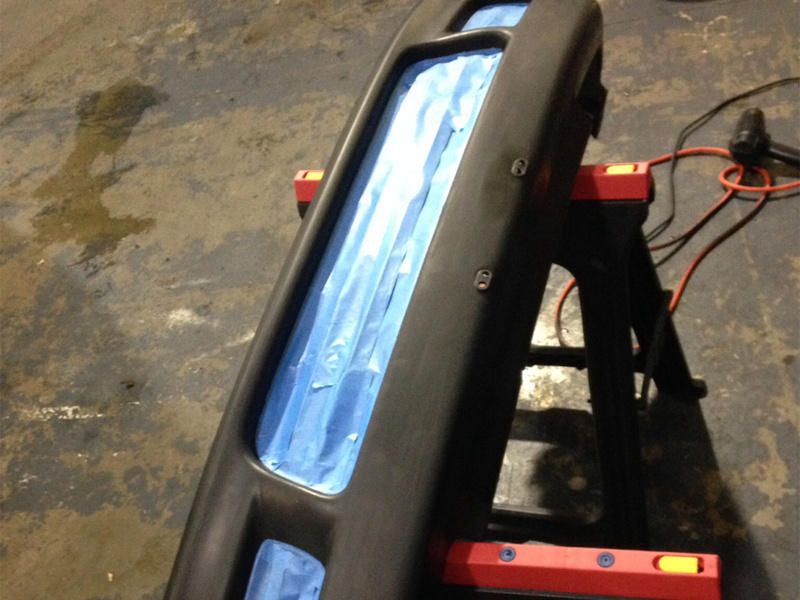 I painted a new rear bumper cover for my car. It looks very good for my first time. I will use your products again." 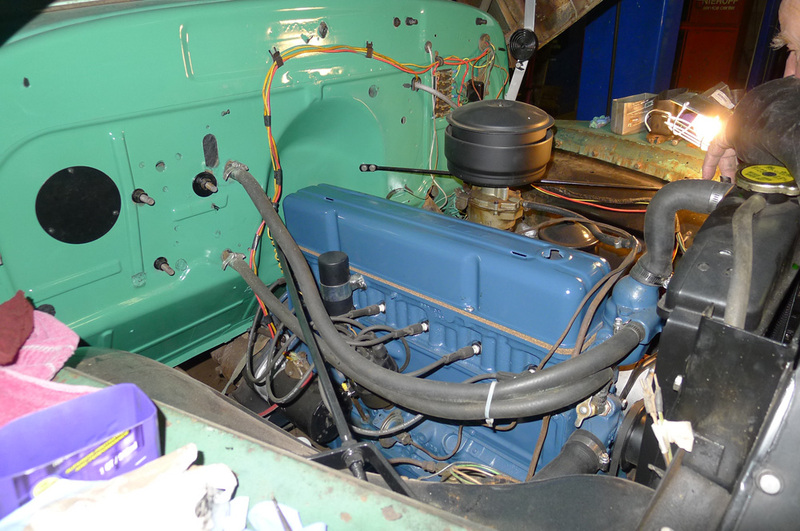 "Ocean Green Spray Paint for my 1954 Chevy 3100. 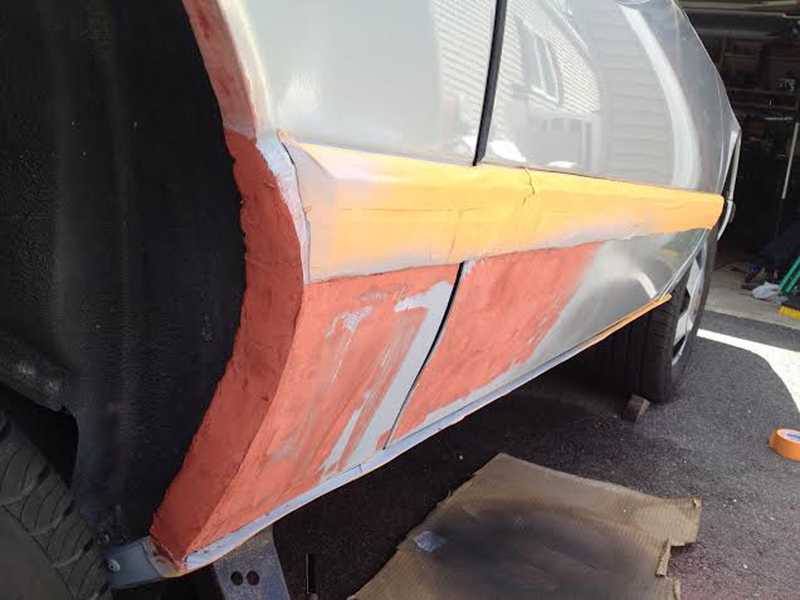 I painted the firewall and the color is an amazing match from a spray can. 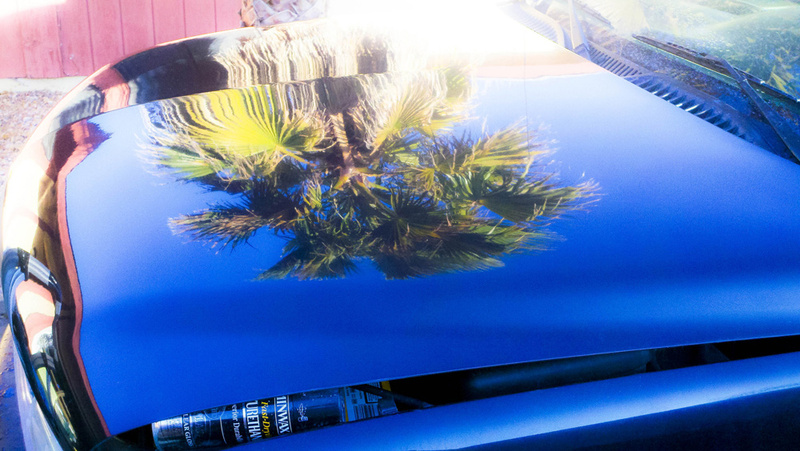 Sprays on nice, clear coat makes it pop. 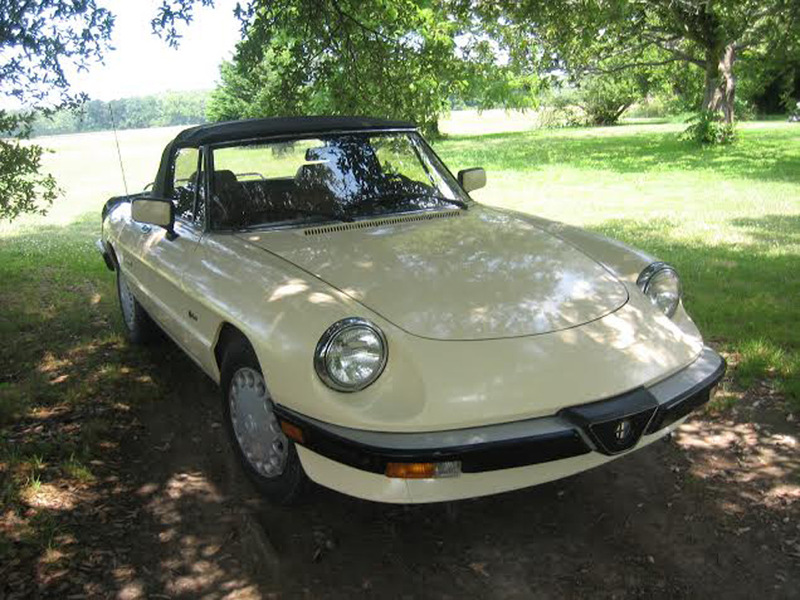 Considering ordering it for the exterior it matches so well. 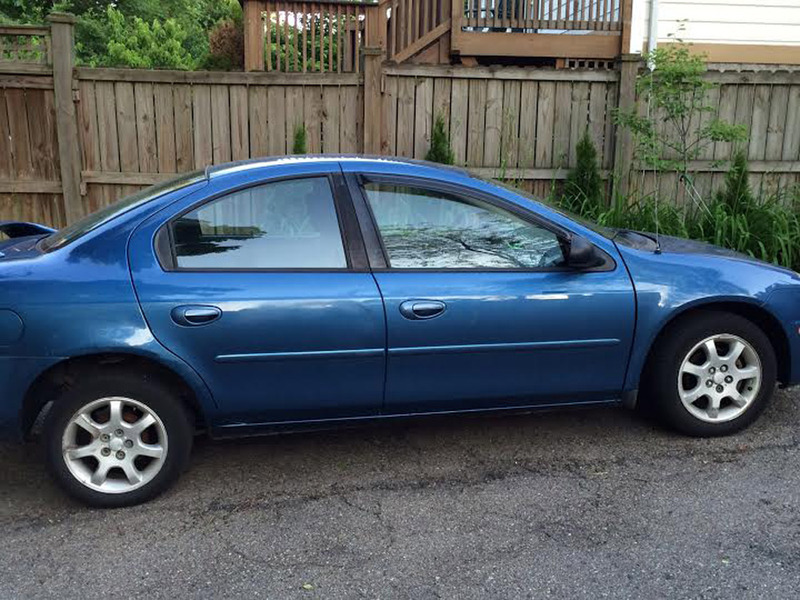 Thanks"
"The color match was spot on. 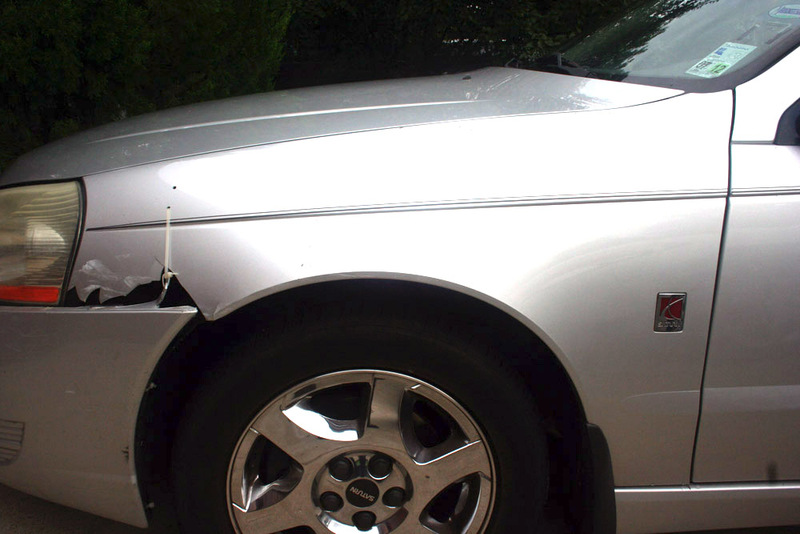 People couldn't believe I did this with a spay can! 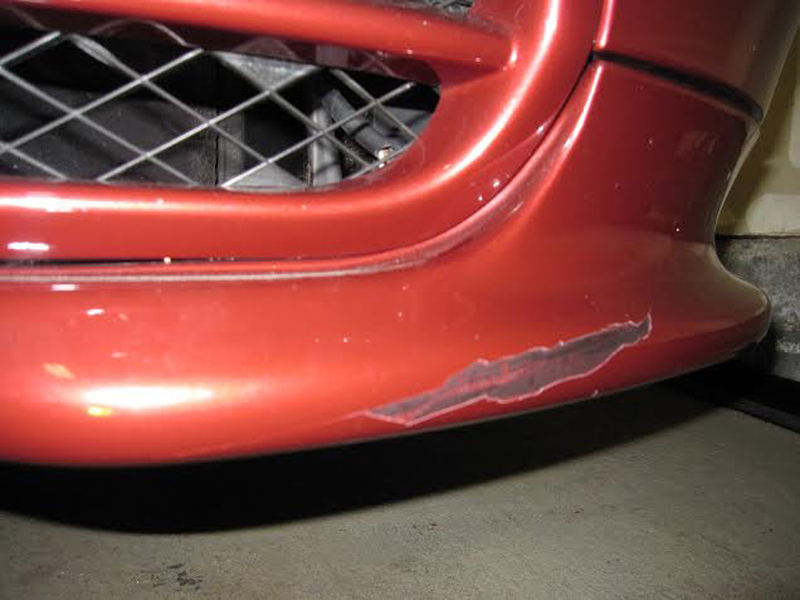 I will continue to use your products on this car and my other cars that need minor touch up." 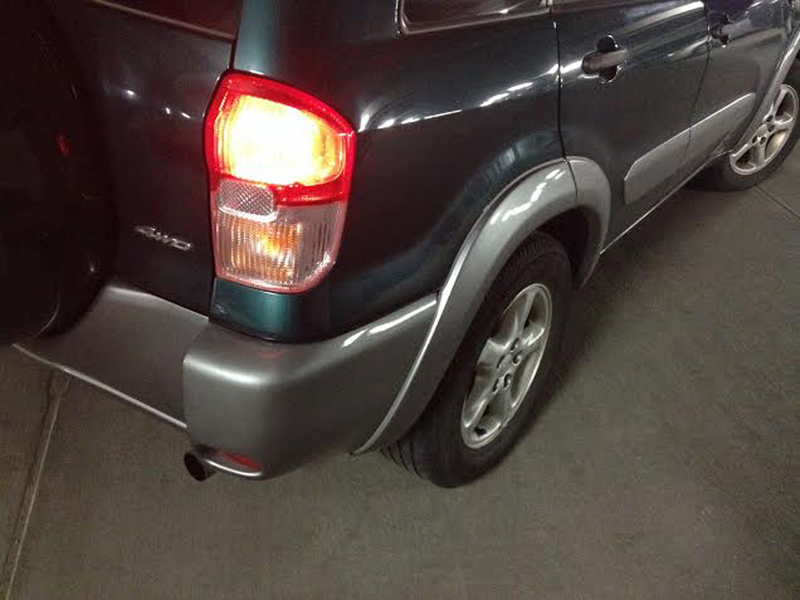 "Repair of plastic bumper on Ford Escape. 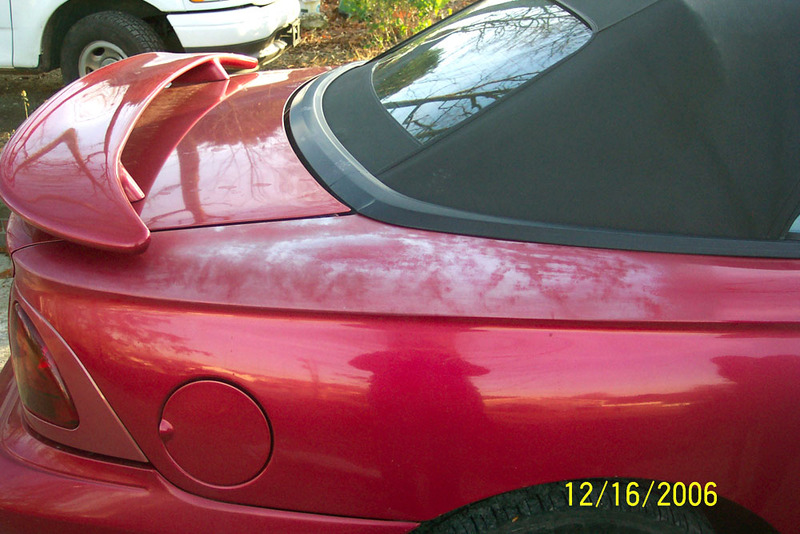 I ordered 12oz of the Plastic Parts Adhesion Promoter and the paint and clear coat to do this repair. 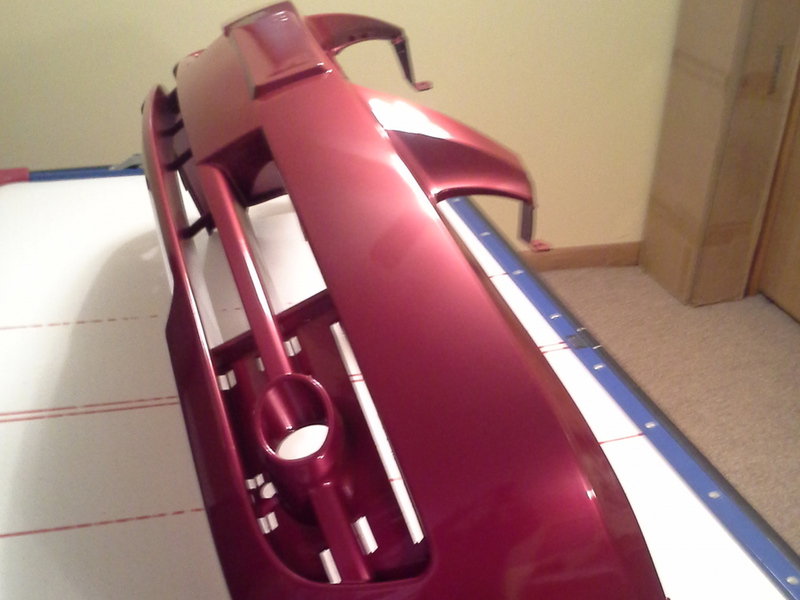 I purchased the epoxy and primer locally. The items I ordered all worked very well. 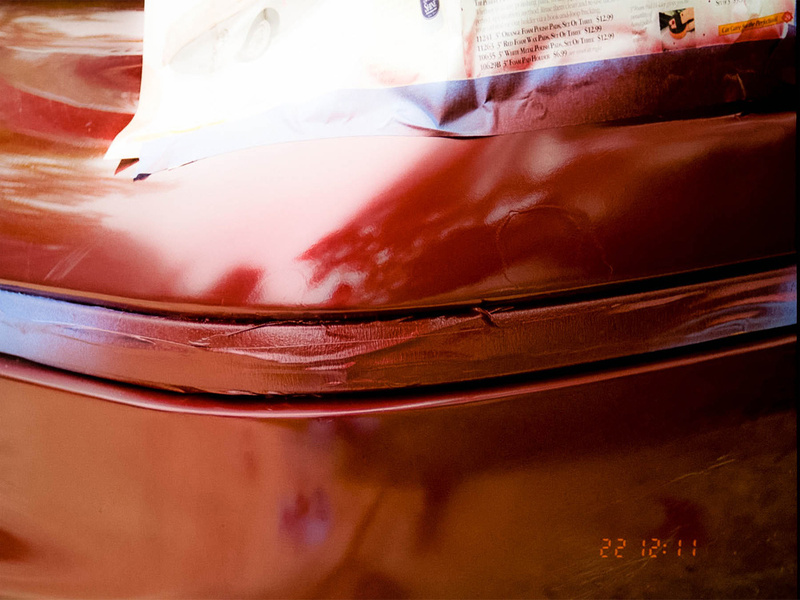 This car has a heavy metallic paint and the instructions on the can addressed the color match and to use light coats to not make the repair darker that the rest of the car. I'm very satisfied with the results. 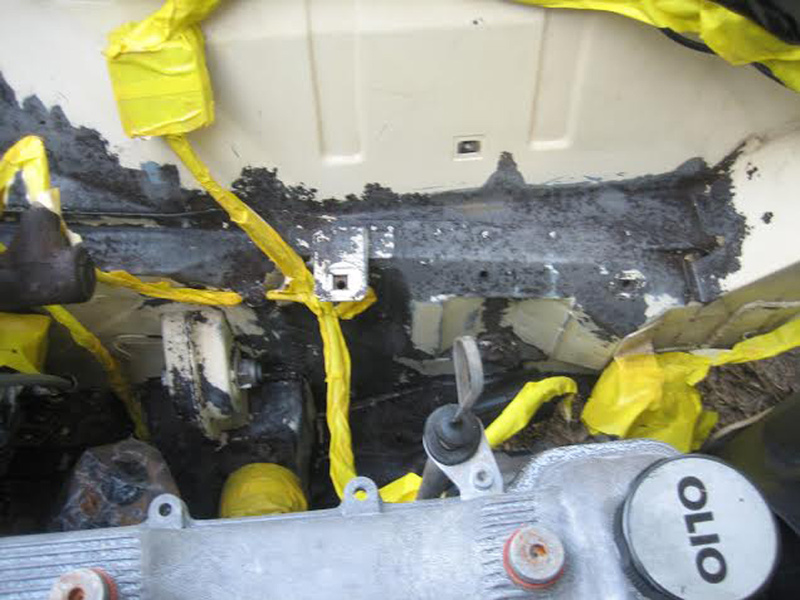 Cost of materials was $45 and the body shop wanted over $300 to do the work." 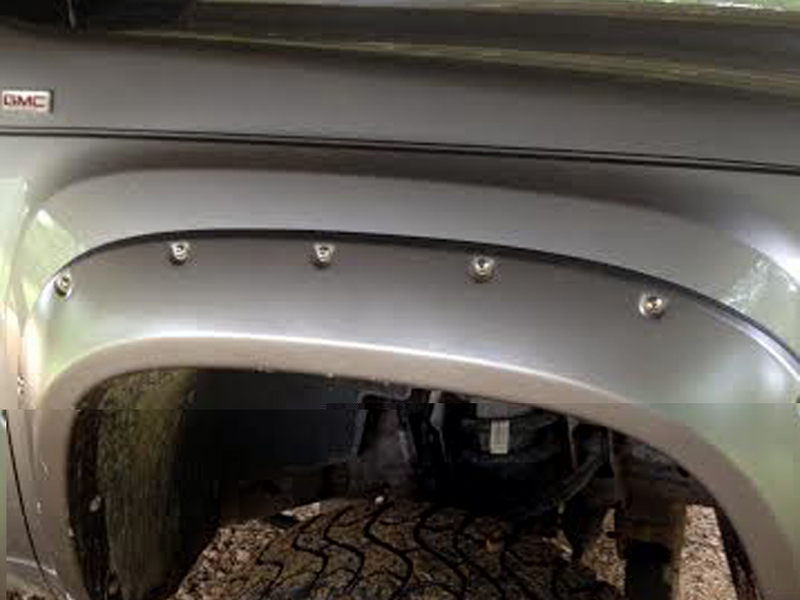 "The front hood of my Toyota Tacoma surely shows nearly 300,000 miles and 19 years of enduring flying gravel chips. 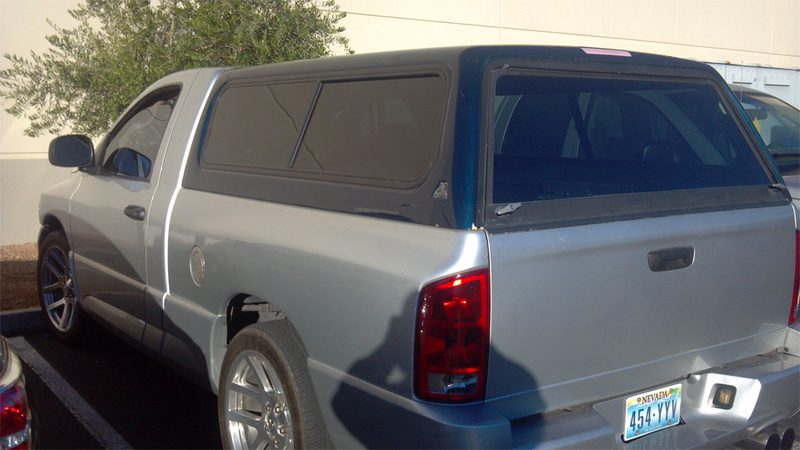 And the tailgate, exposed to Arizona desert sun, was toasted. 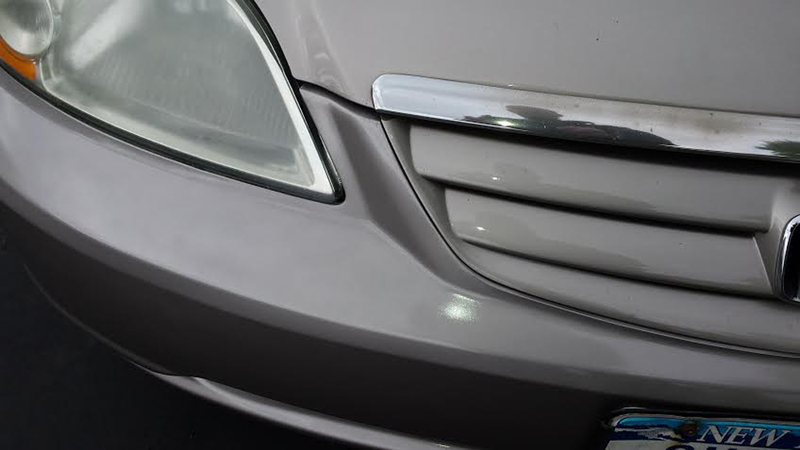 I am so glad I stumbled upon Automotive Touchup. 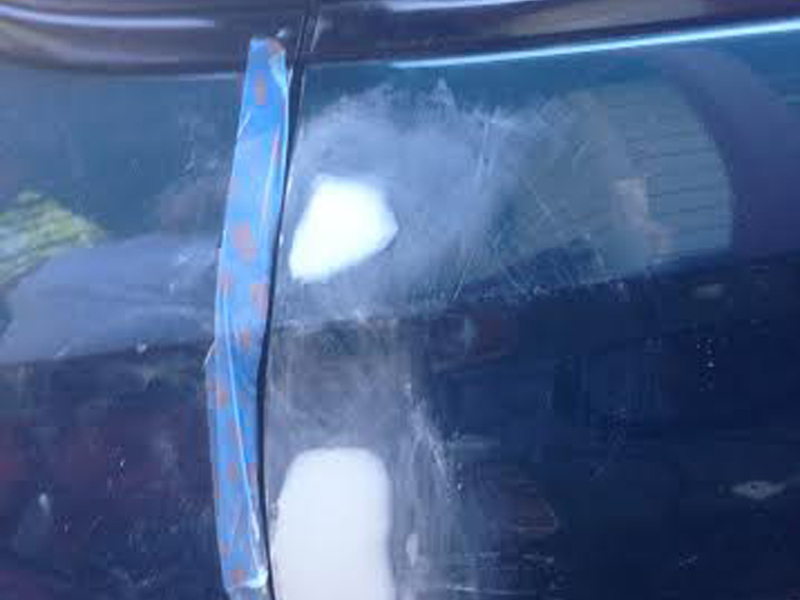 I have no idea what a professional body shop would have wanted to do this. 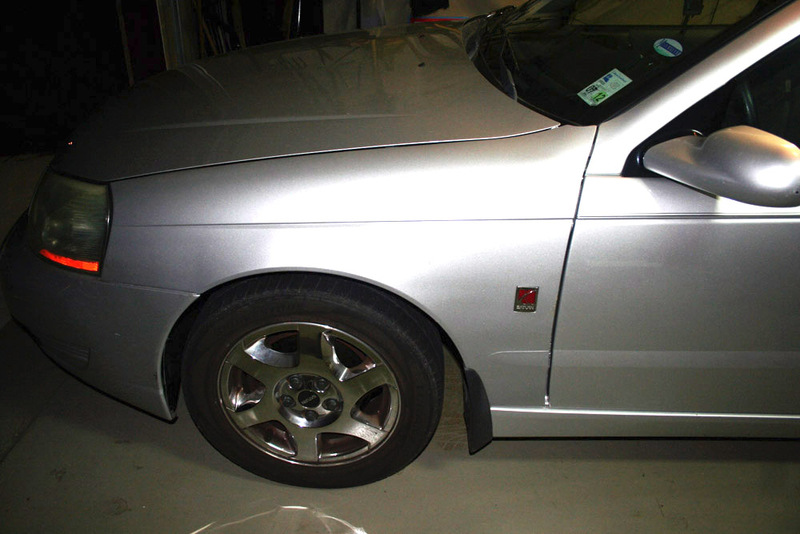 Here are before and after pics, using AT's aerosol white primer, base and clear coats. 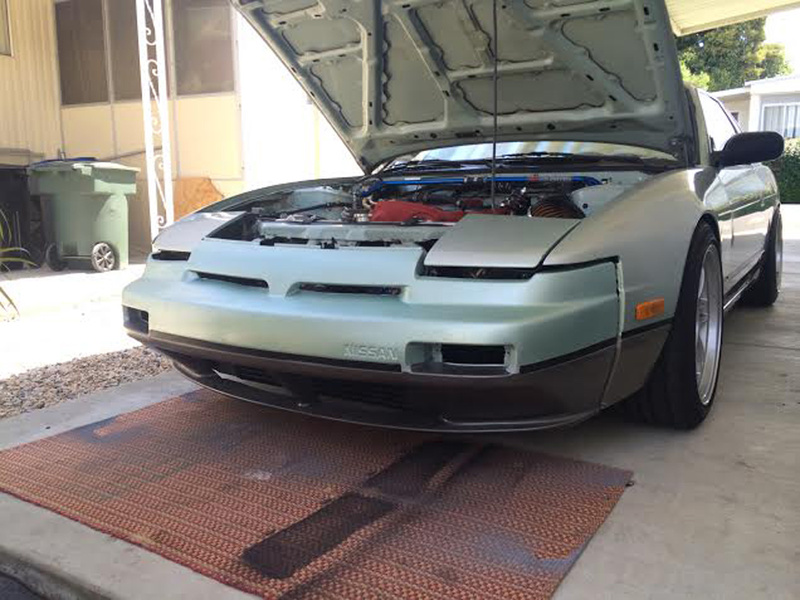 Took the hood off for better control of the coating applications, and am letting it sit to cure/harden. 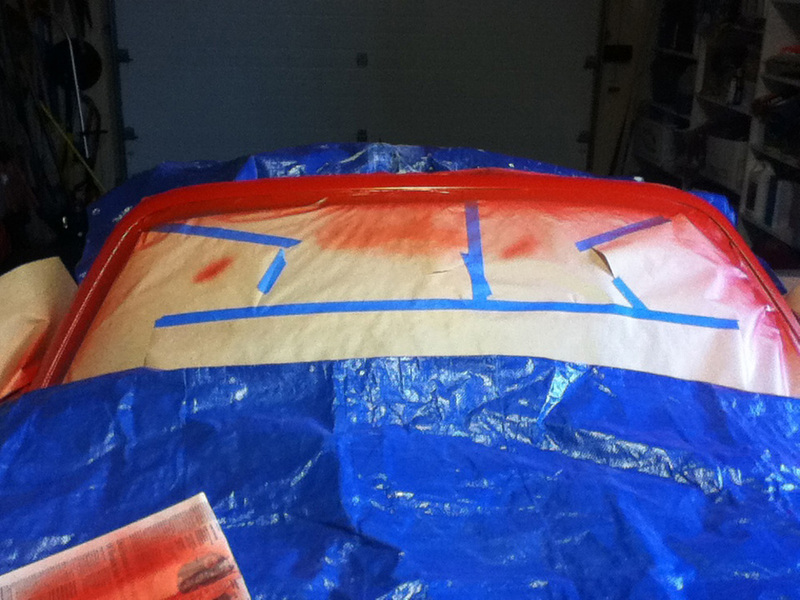 NOTE: I re-primed & base coated just the front of the hood and clear coated the entire hood. 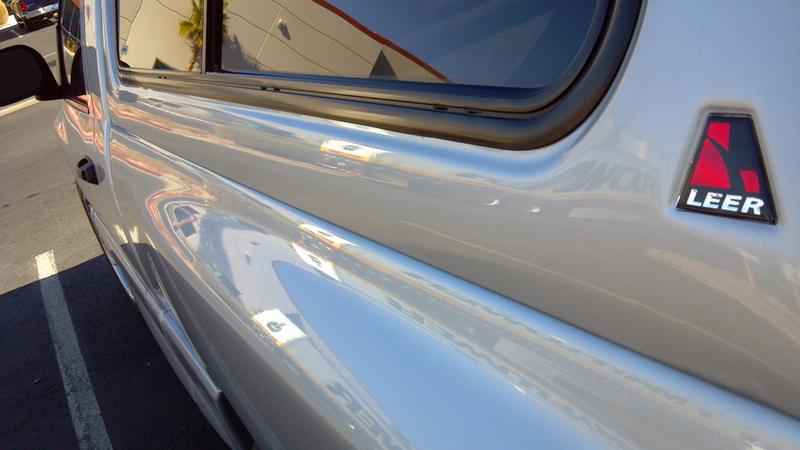 The color match was absolutely perfect, and the clear coat shines like crystal. 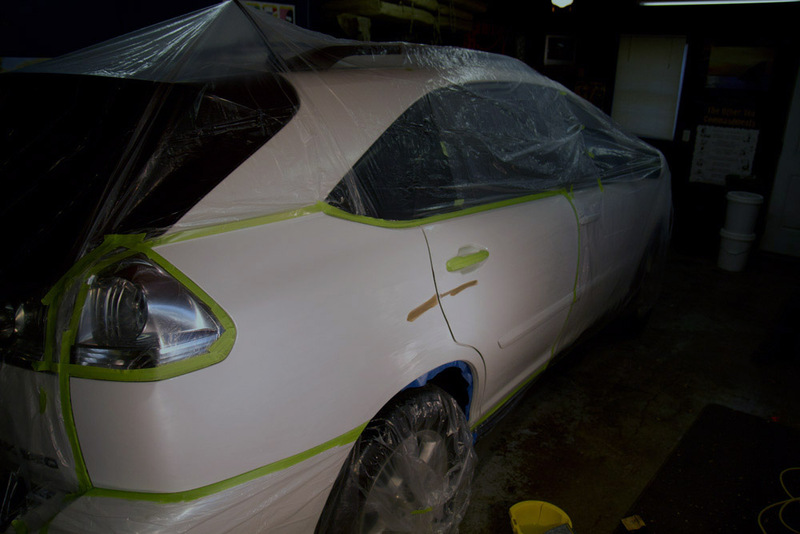 I can not see where the factory color ends and AT's match begins." 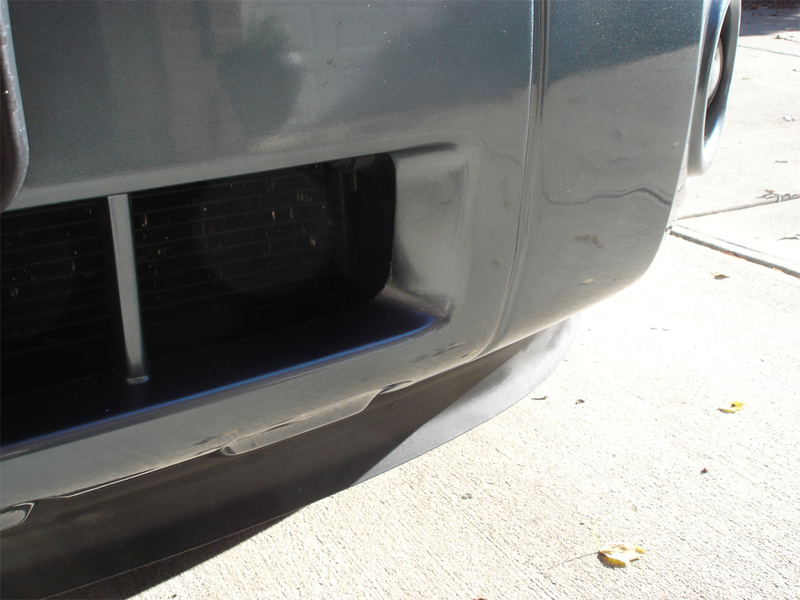 "Thank you for the speeding response to my inquiry for products required to repair the lower valance on my Jaguar. 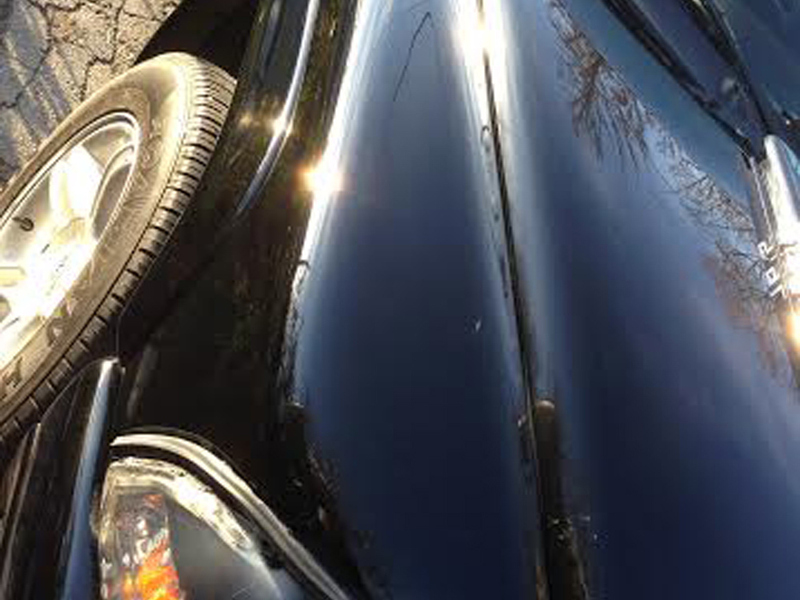 Your customer service staff was very helpful I received my order within a few days and that gave me time to repair the valance, which was badly scratched, before my next Concours event. 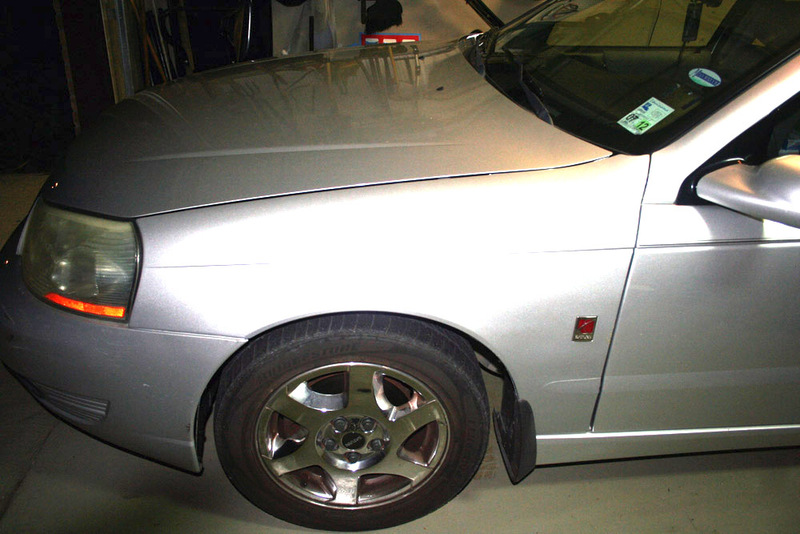 I am happy to say there were no point deductions made by the judges inspecting my car. 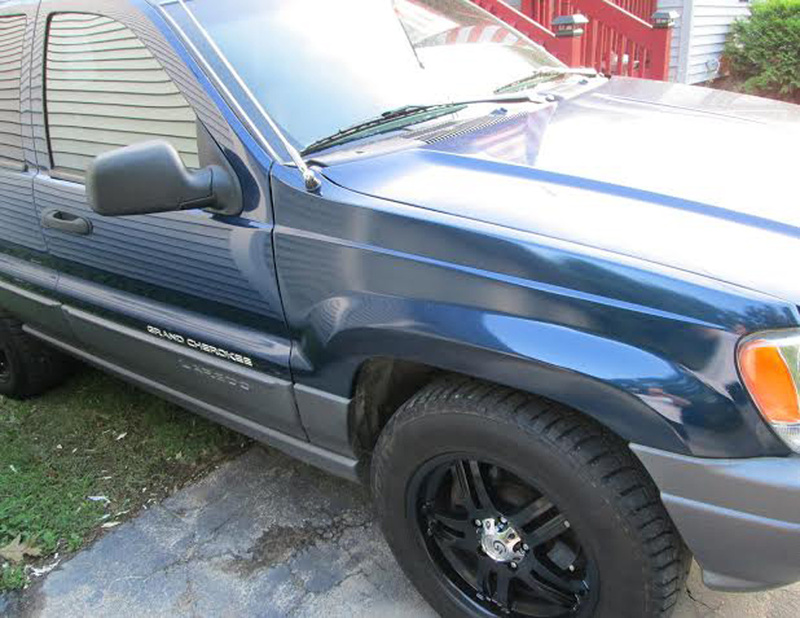 As you can see in the pictures the color matched perfectly. 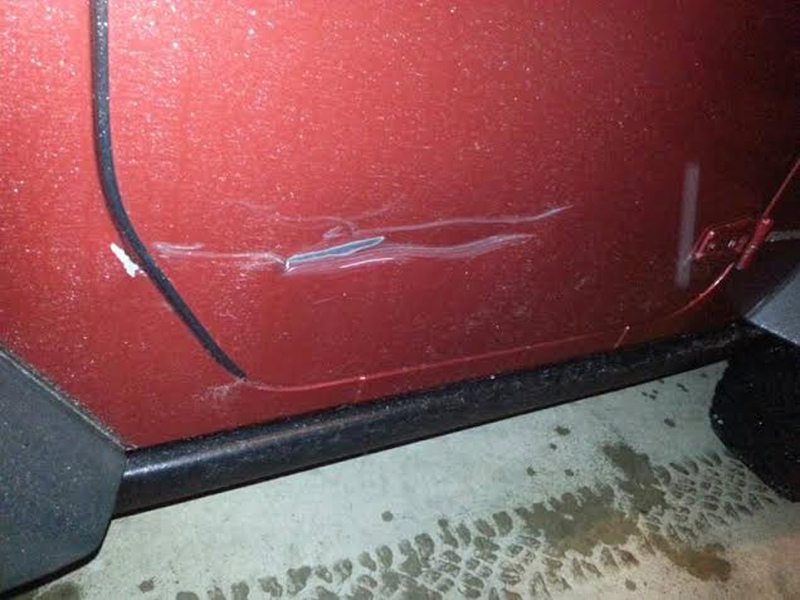 Thanks again.."
"L/S of my 1969 Garnet Red Camaro showing repainted rocker panel." 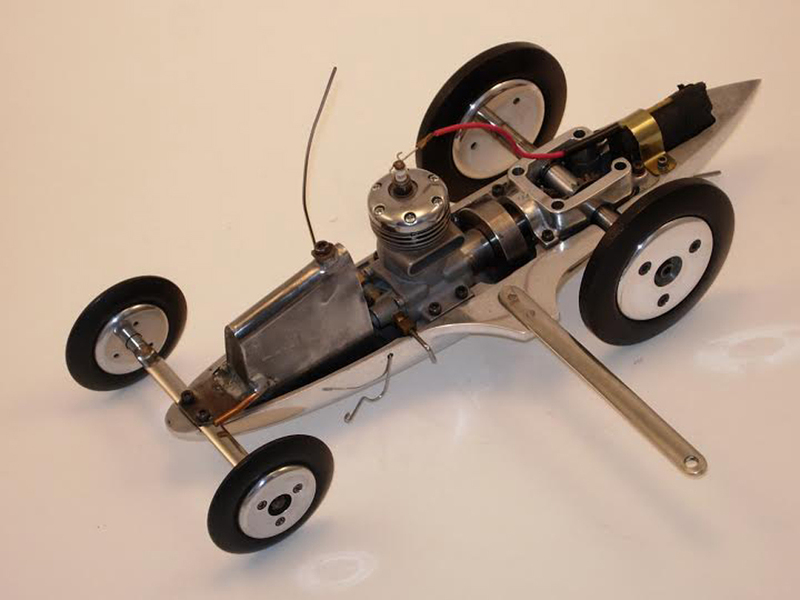 "Very nice result, in my opinion, and quite easy to complete. 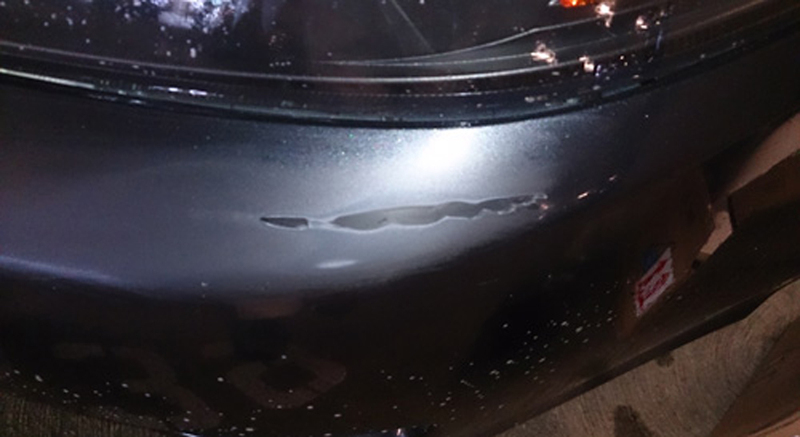 The original damage was due to a parking lot bumper scrape which resulted in the paint being removed from the bumper and a black streak left in its place. My first attempt was to use dealership purchased paint in a small bottle using a small brush. It turned out to be a mess which I didn't think I could rub out even if I tried. 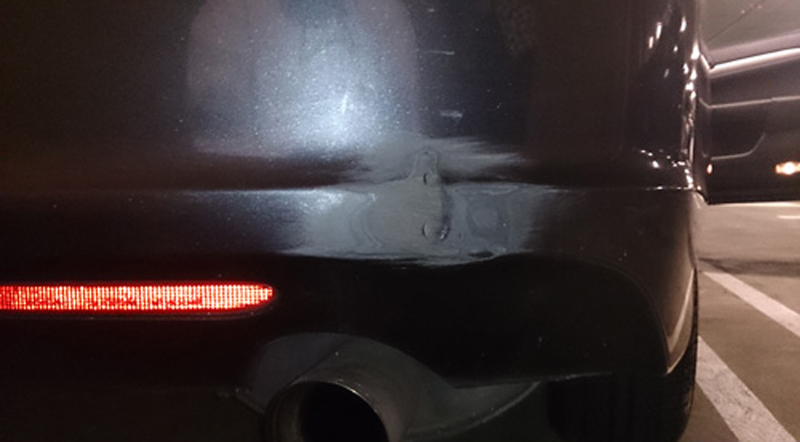 So, I ordered spray paint from your website which easily fixed my messed-up first attempt. 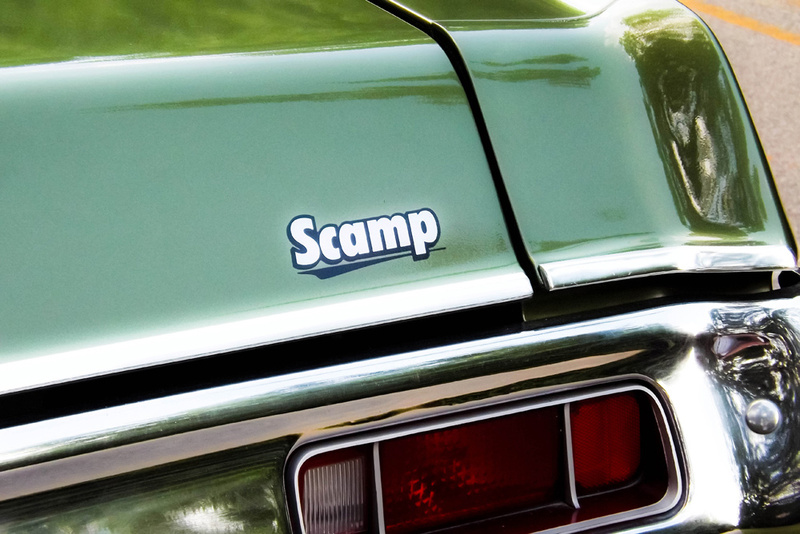 You have one more happy camper." 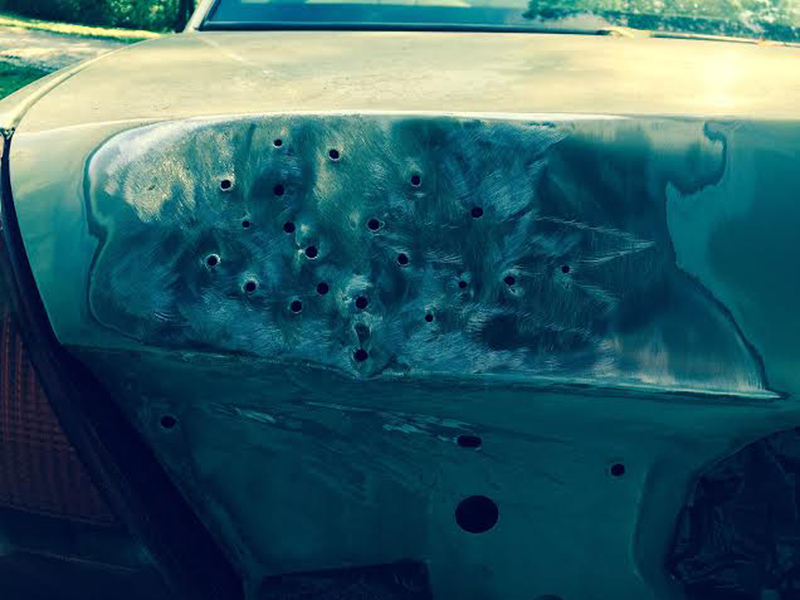 "Hood is done paint match was perfect. 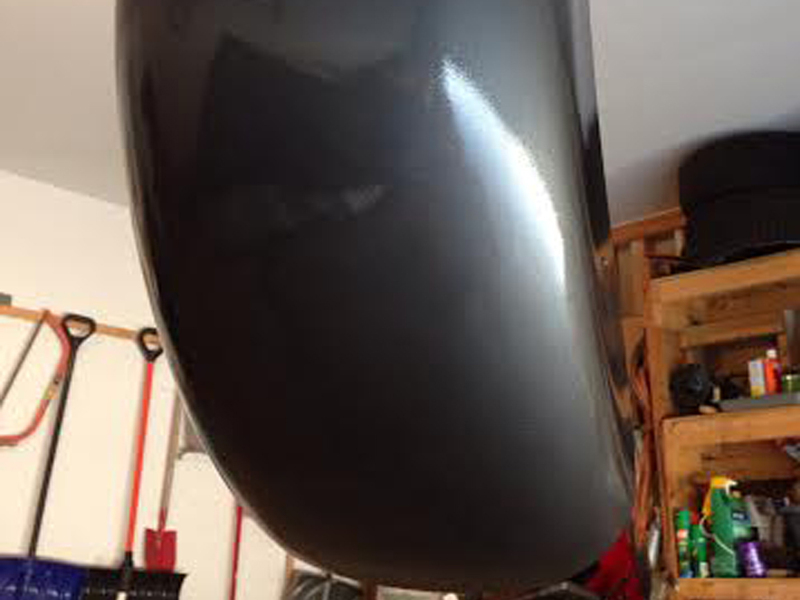 Sanded and buffed clear coat to perfect shine "
"I've tried plastidip but disliked the feel and ease of removal. 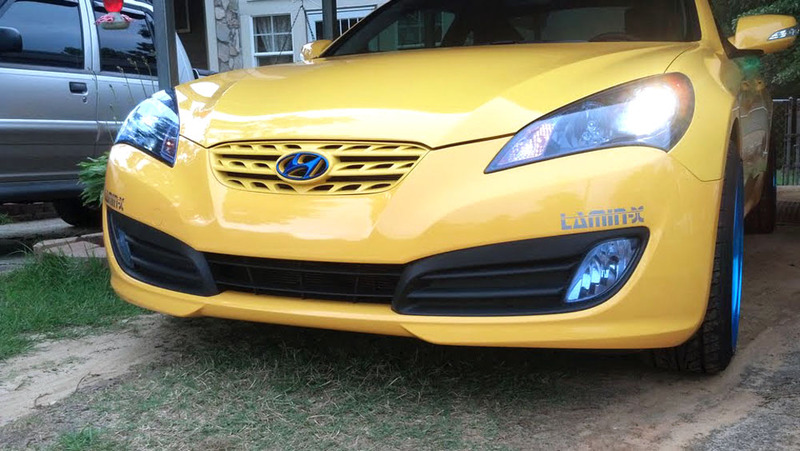 I then tried a CF vinyl wrap and liked the look but I didn't like the overall quality. " 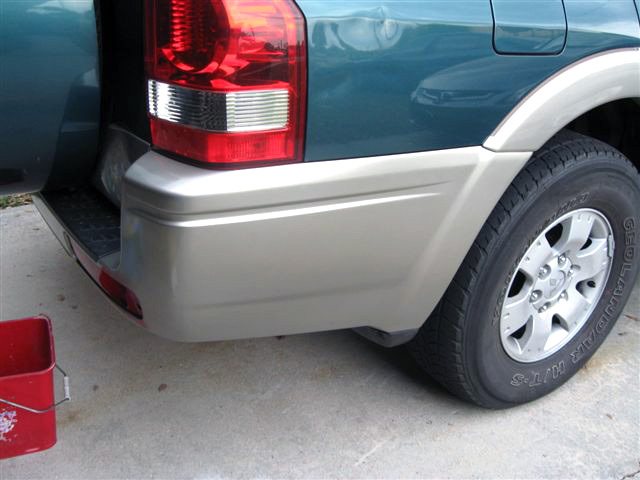 "After being told by the local Ford body shop supervisor that the side panels on my Expedition could not be painted, I did some online research and when I found the AT site, I had my answer. 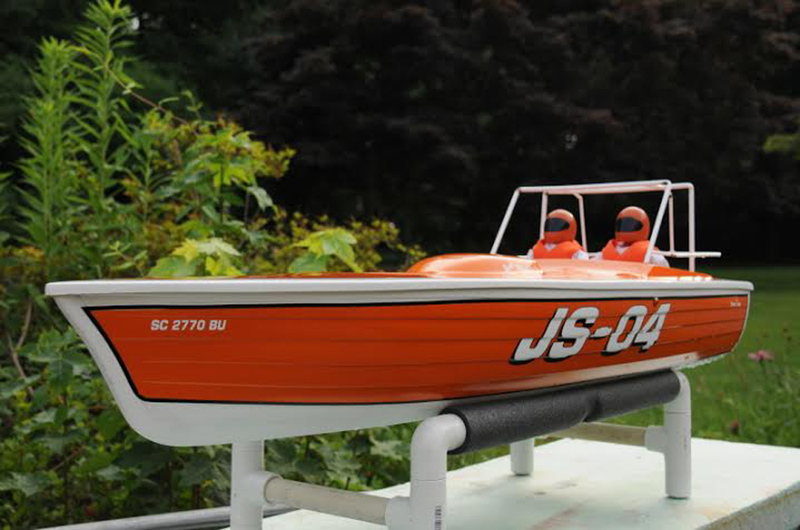 I ordered what I needed and following the video tips, I have the results shown in the photos. 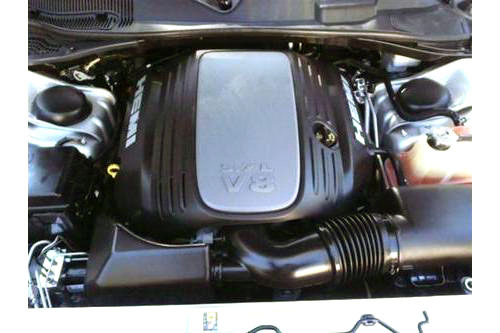 AT made it all possible!!" 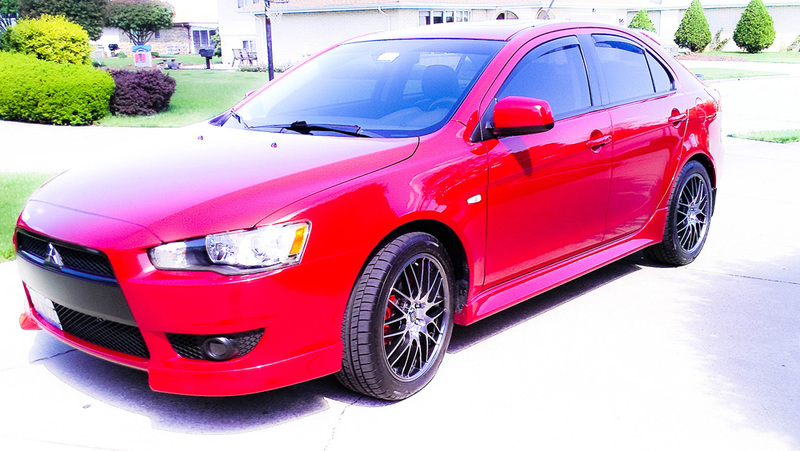 "2010 Mitsubishi Lancer GTS Sportbackbr/Just wanted to drop you all a line & let you know how happy I am with my purchase. 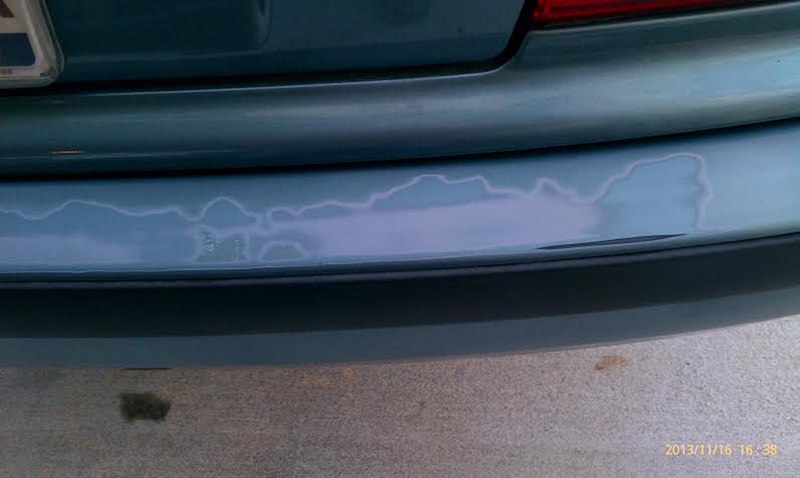 The paint matched up perfectly. 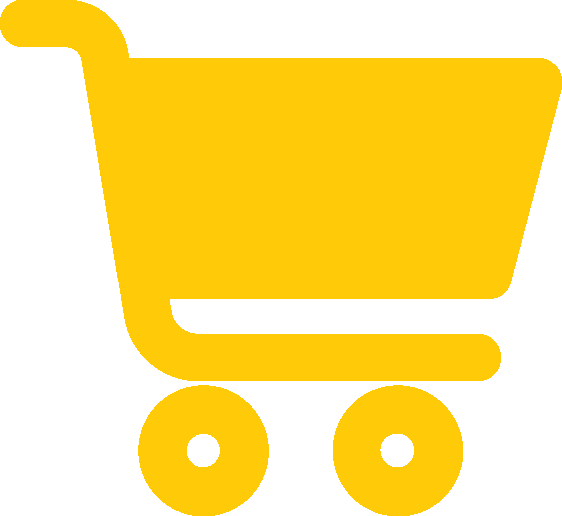 If you want, post this on your website, you have my permission. 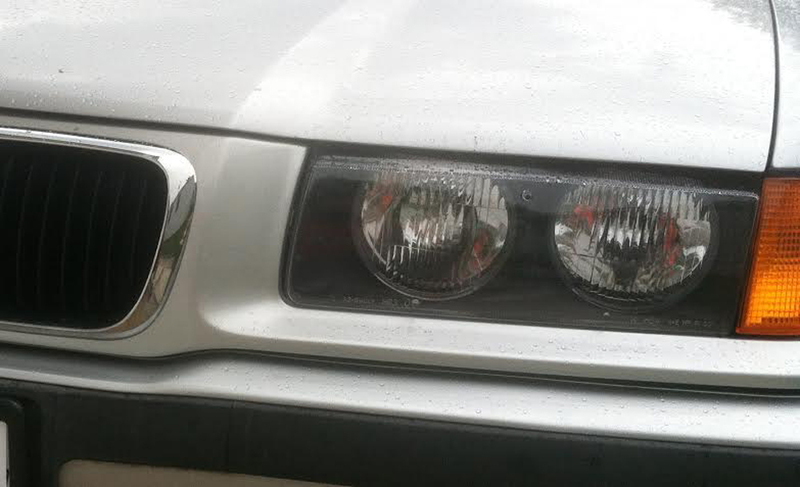 I painted the black fog lamp housing to match the rest of the car. No more cheap looking housing, now it looks great!" "Hi, I was wondering why you dont advertise on on any websites? 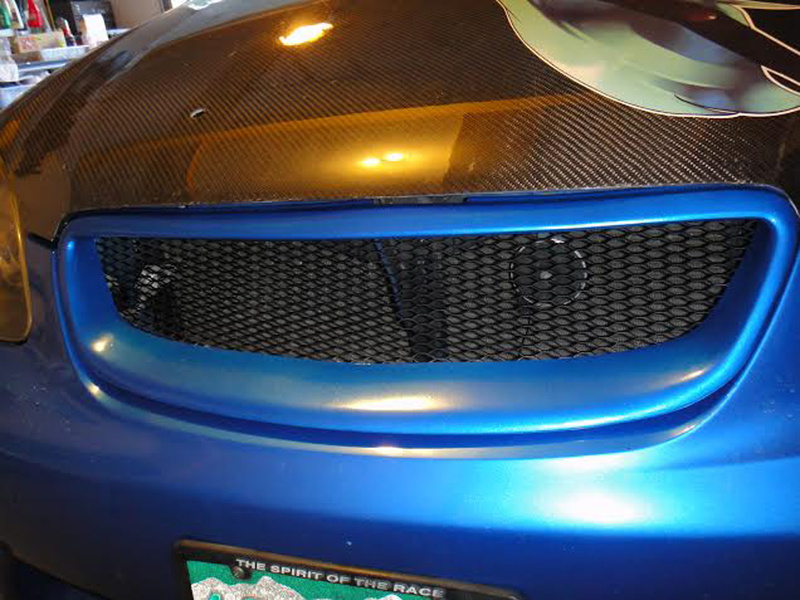 (maybe you do but I dont see it) I bought some green with envy spray paint for my 2011 Challenger SRT and the match was perfect. 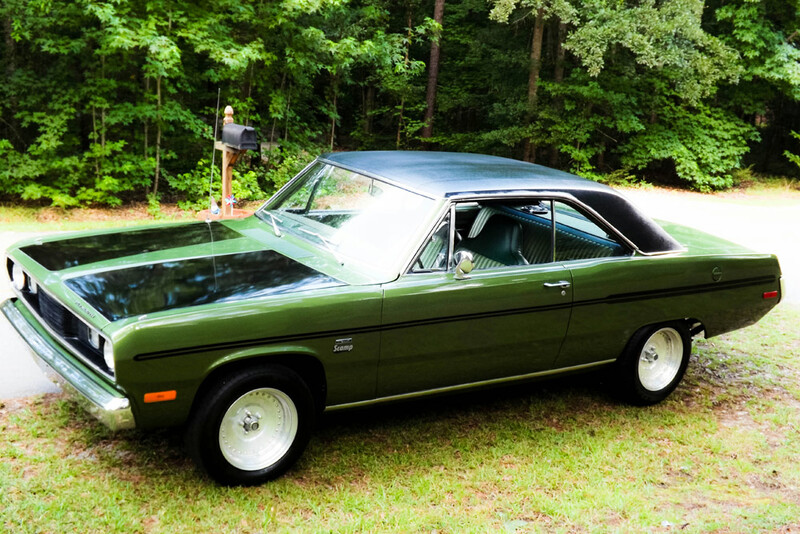 I know there are a lot of people who own challengers that have hard to find, match paints. (plum cray, toxic orange, green with envy etc) I would think that a few forums would be great for you. NO, I am not associated with any forums, so I am not trying to get money from you. I am a member of challengertalk.com and I know those members are always painting stuff. 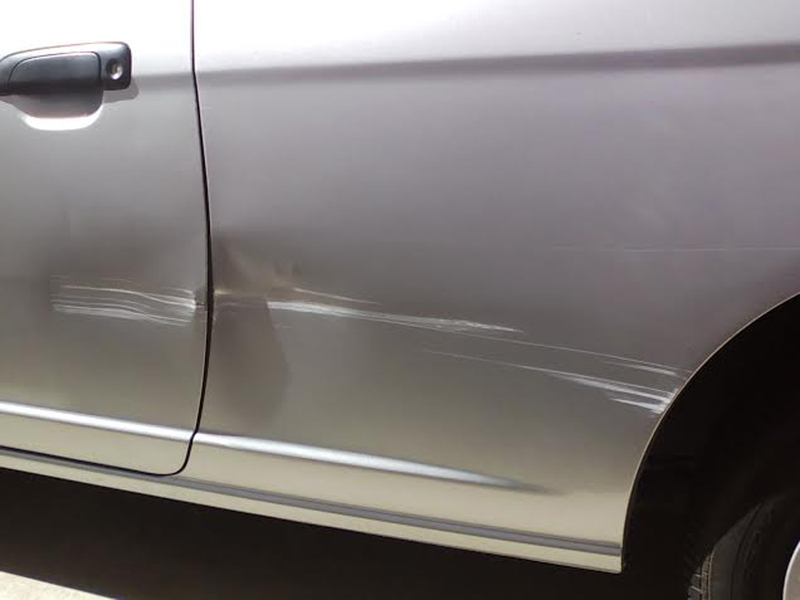 Anyway, thanks for the great paint, I will be placing another order soon and I will praise your product. 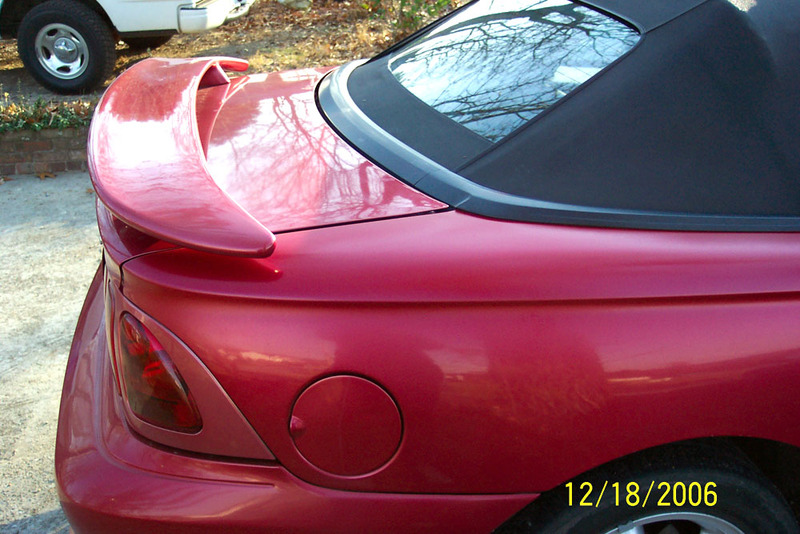 I attached a couple of pictures of what I used the paint for." 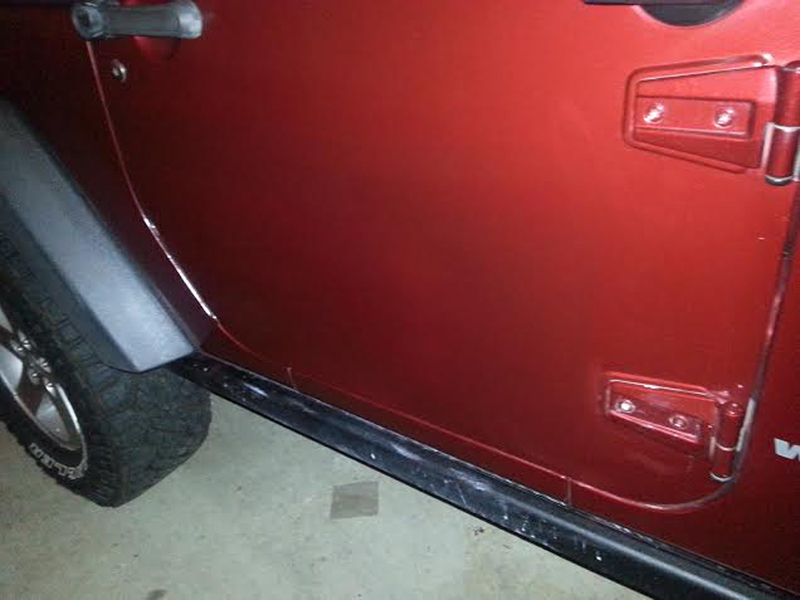 "Here are the before and after pics of a rust hole on the door of my jeep and the tail lights I modified." 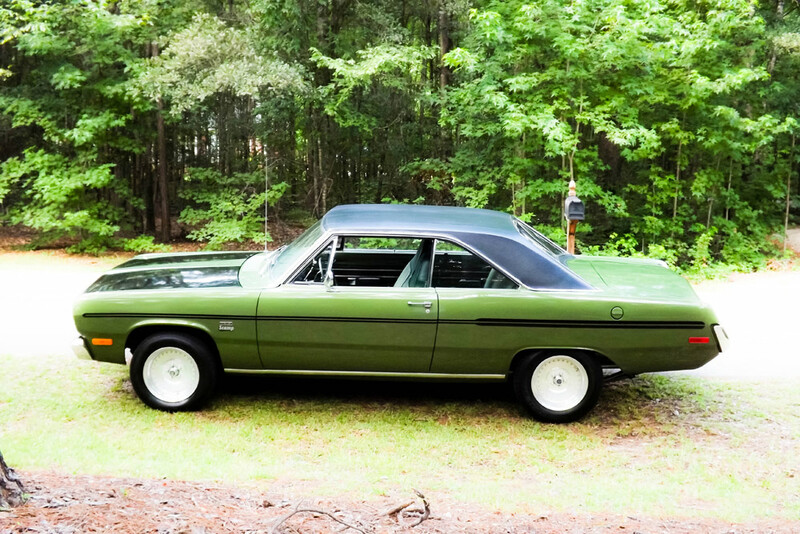 "I ordered the ready to spray paint and clear coat system to repaint my 72 Plymouth Scamp. 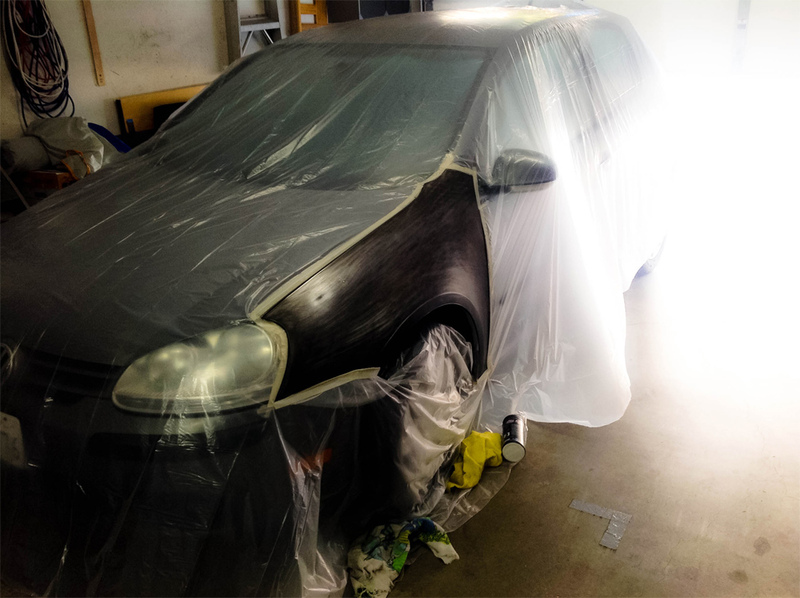 I did all the prep work and had a friend spray the car. 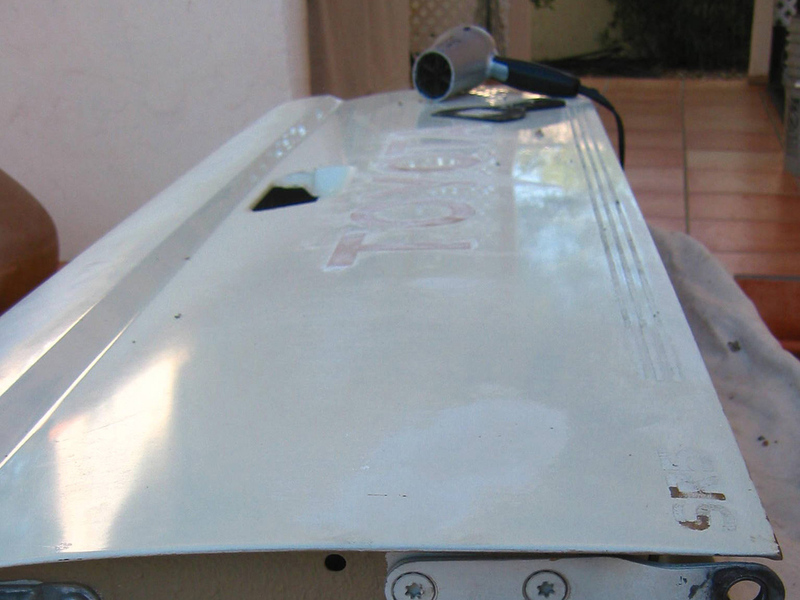 He loved the ready to spray paint and had used the high quality clear before (except he paid more). 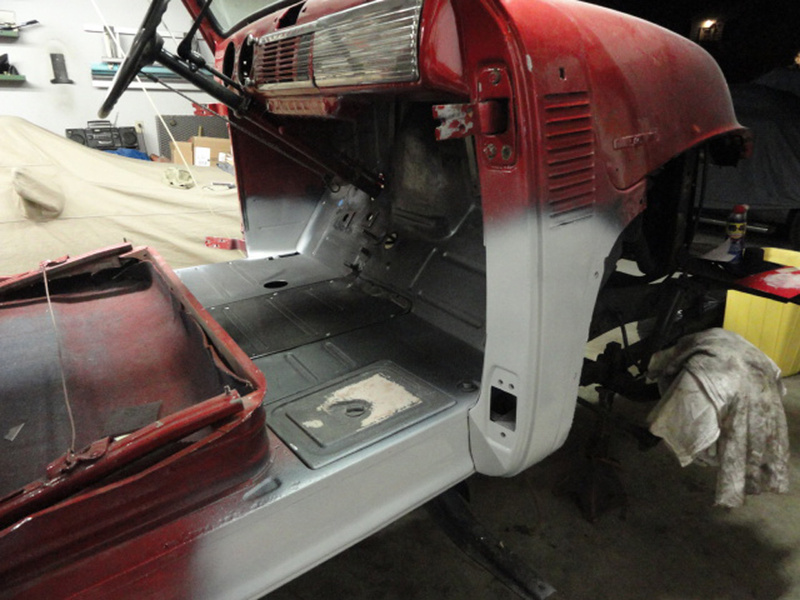 The job turned out awesome, and the paint matched the door jambs, under the hood and trunk perfectly. I couldn't be happier. You are my paint supplier from now on!" 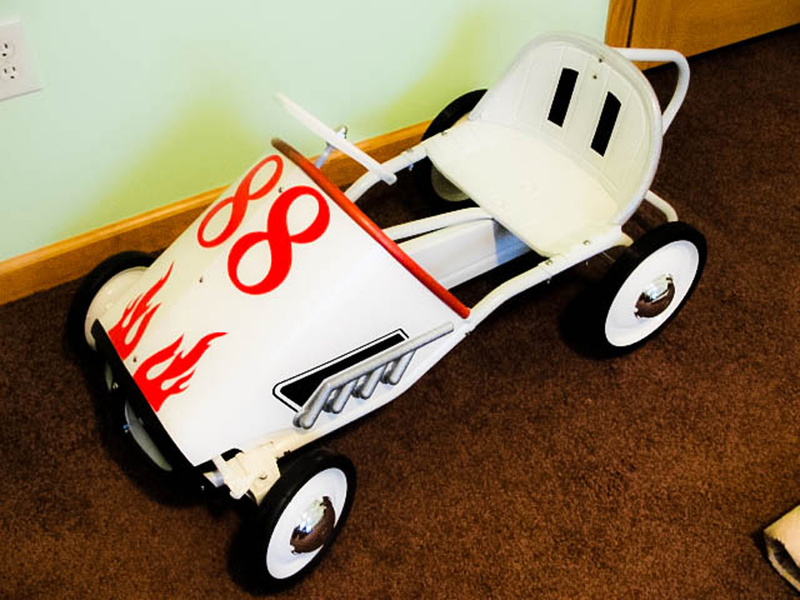 Here is something you might not think your auto paints would be used on. 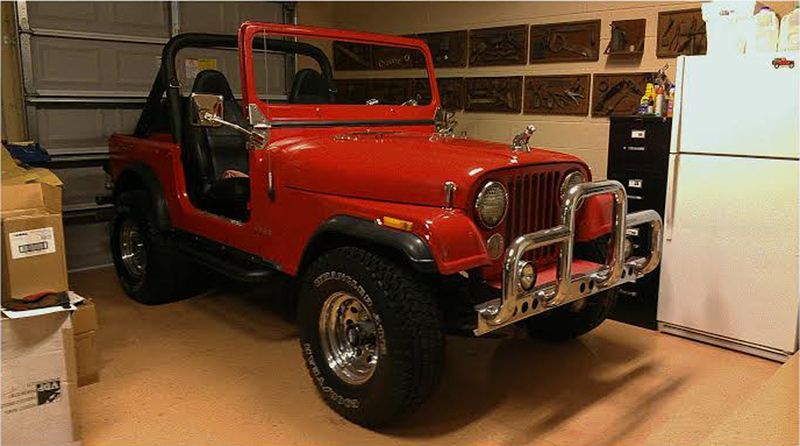 "I just finished painting my jeep, which has a fairly odd and rare factory color, and I am absolutely amazed at how the color is matched perfectly. 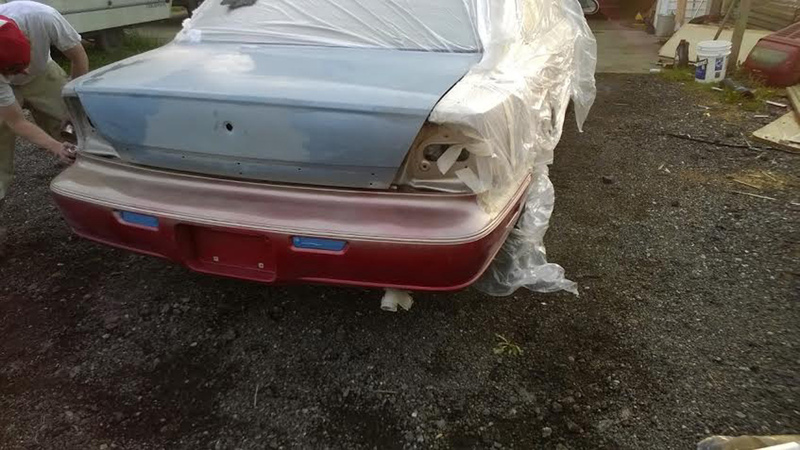 I honestly can't tell where the new paint starts and the factory paint ends. 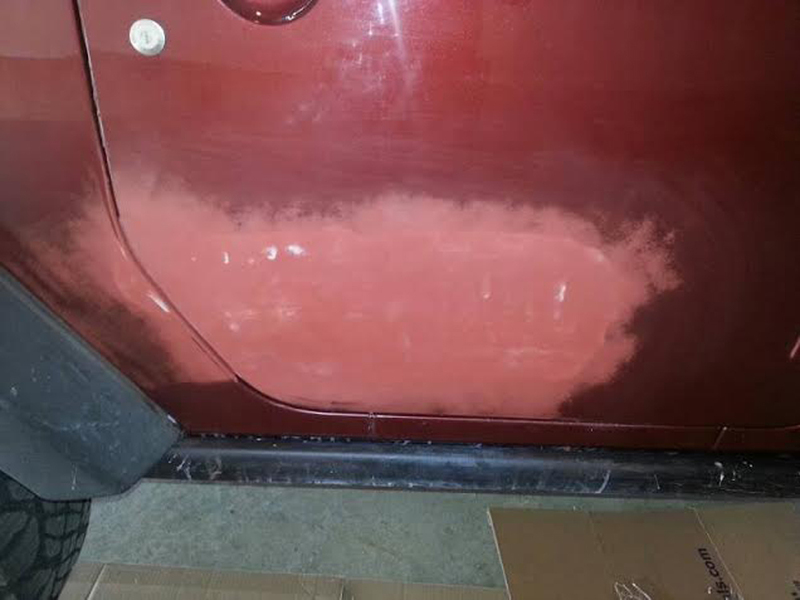 Professional quality repair out of a spray can, and I have the before and after pics to prove it." 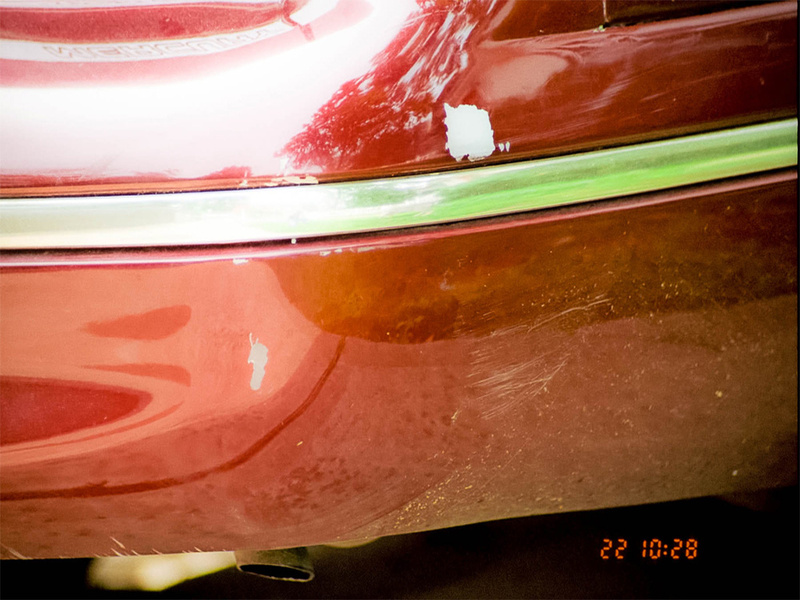 Want your touch up project featured here? Submit your pictures to show off your amazing results! 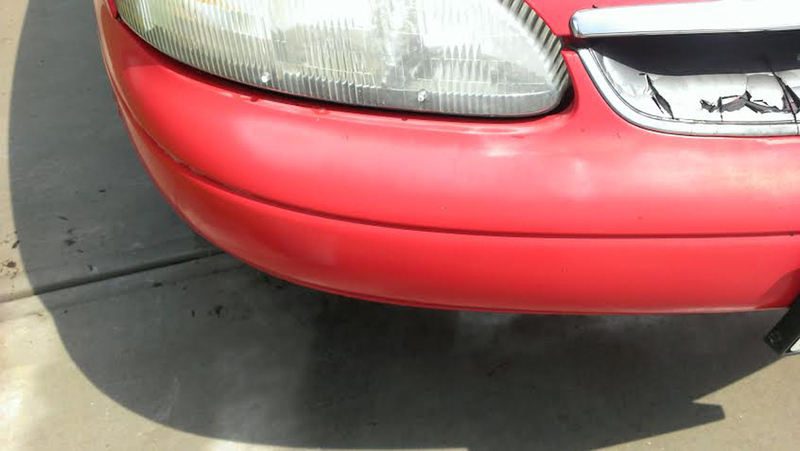 "Decided to re-paint my two-toned scraped up bumper on my '94 Del Sol. 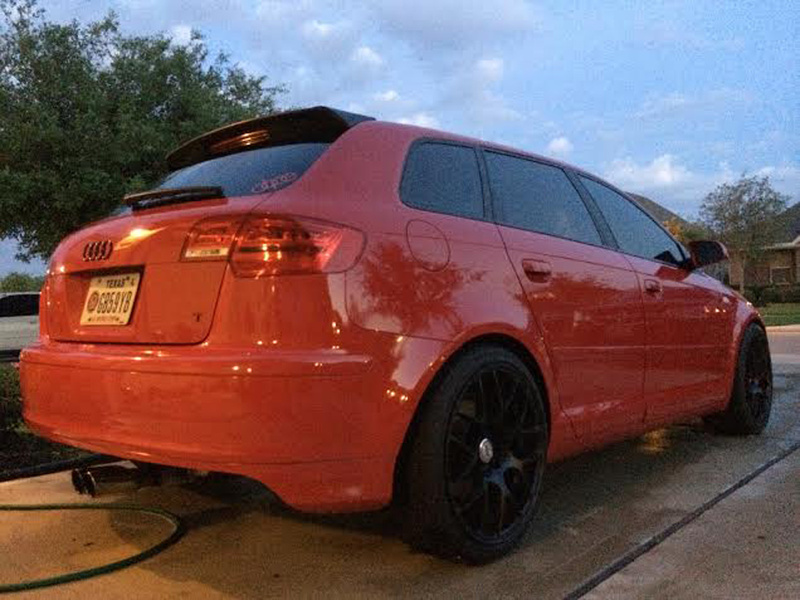 Got done and it looked SO GOOD that I just had to paint the rest of the car! 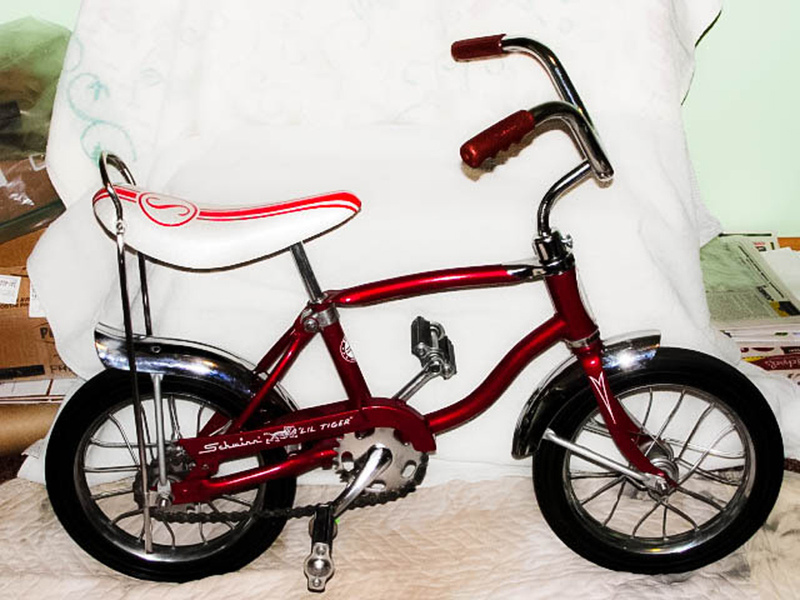 Amazing product, true to the original factory color. Got another project to do, and I won't use any other product. Yours has proven truly superior! Thank you!" 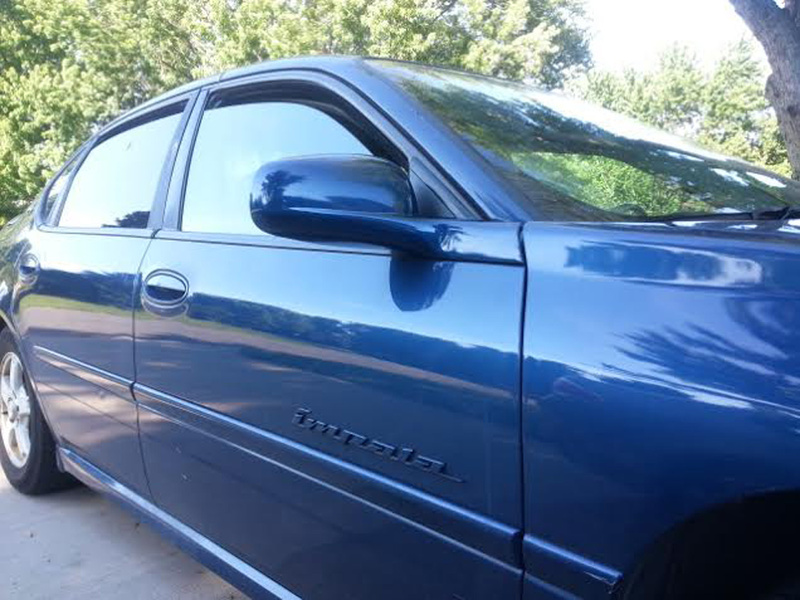 "I recently purchased a 2002 Ford Taurus SES. 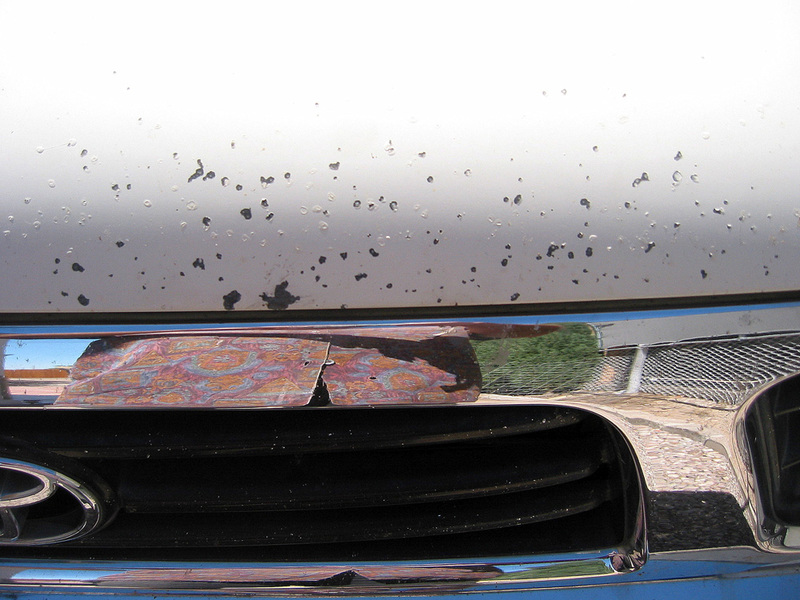 When I purchased the car I knew there was some rust on both rear quarter panels. 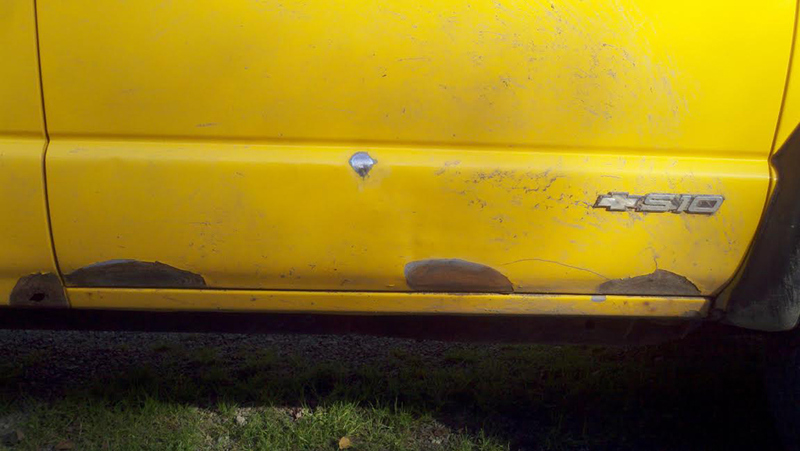 Once I got home I found out how bad the rust really was I was really upset I did not look closer before I bought the car. 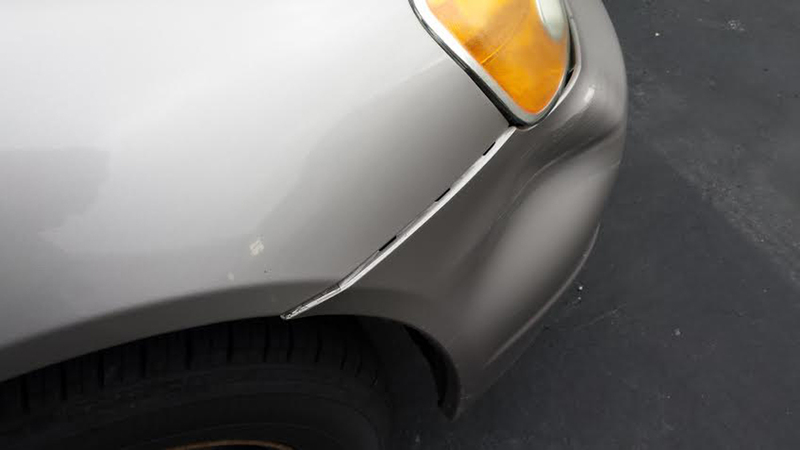 I actually talked to two body and fender guys who said to repair it would cost more than I paid for the car. 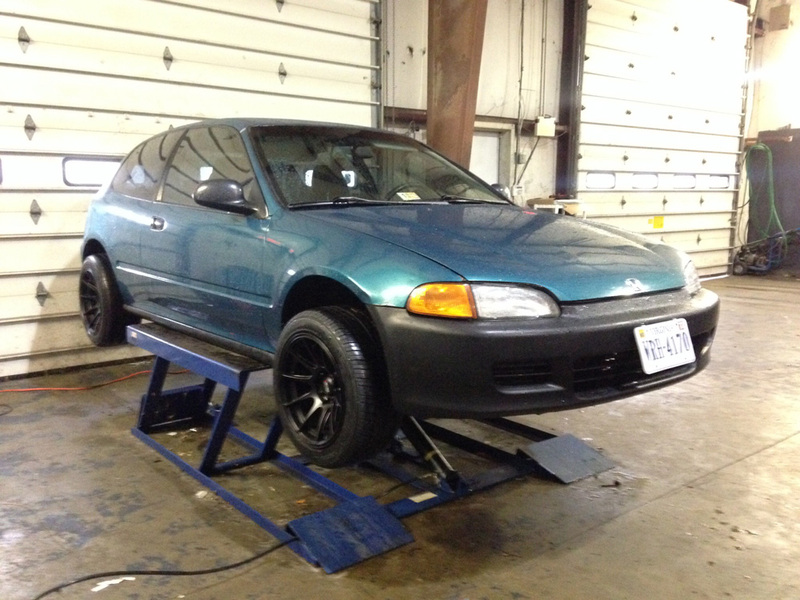 I work in Customer Service and have never attempted automotive body work before. 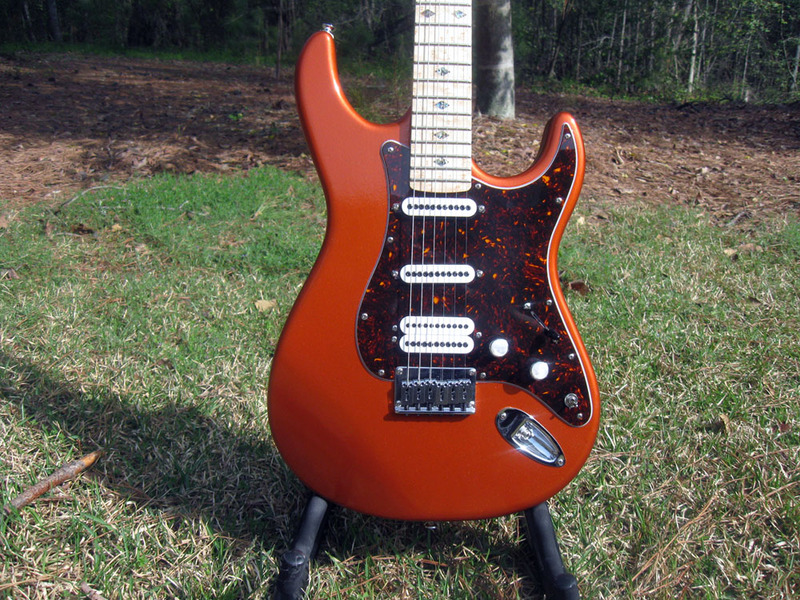 I searched some forums and found that you came highly recommended as far as color match. 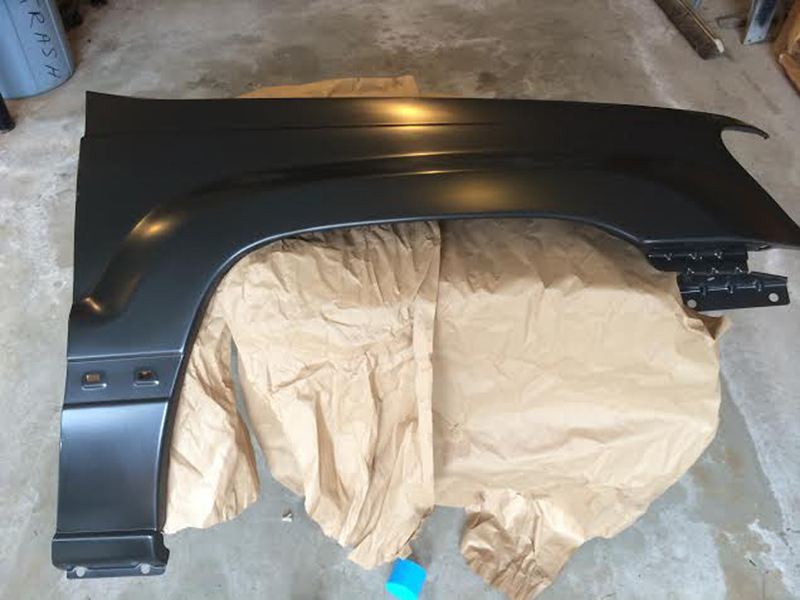 I ordered a can of spray paint and began a two week project.I pulled the car out of my garage this morning, and to say I was totally amazed at the color match is an under statement!!!" "Thanks for the great match! 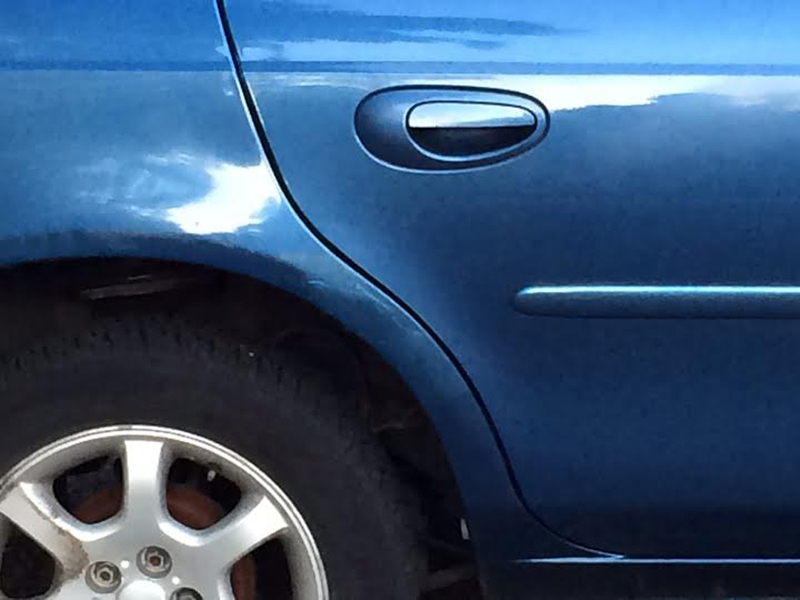 Can't even tell where the old paint meets the new paint. Fantastic job! 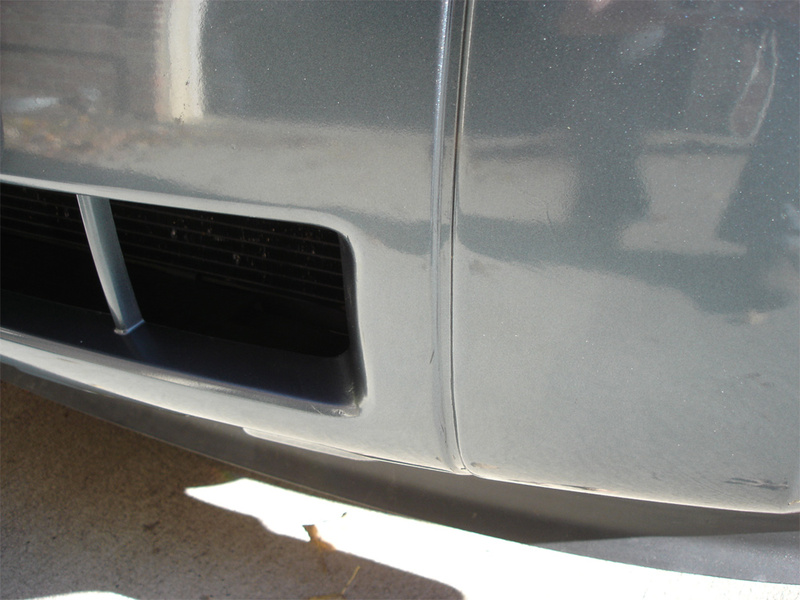 Repaired a spot on my wife's Lexus where she ran the side of the car down the mailbox...ugh...turned out great!" 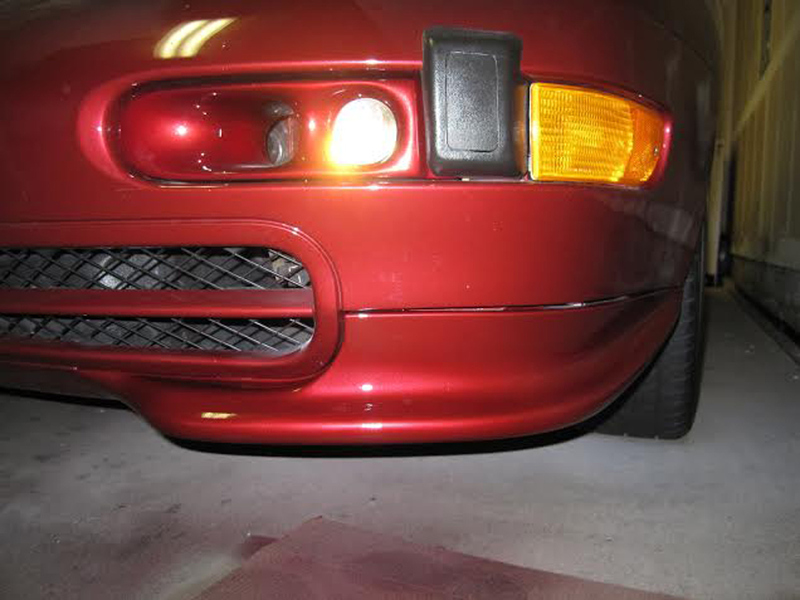 "Here's a couple shots of my HHR after I painted the grille. 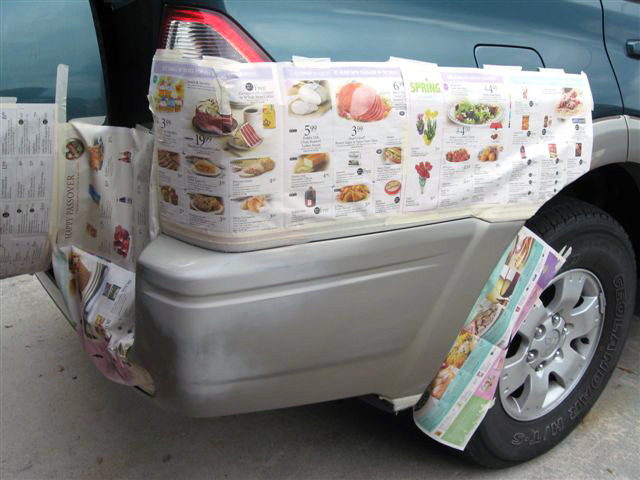 Your paint is an exact match, instructions were easy to follow. Thanks." 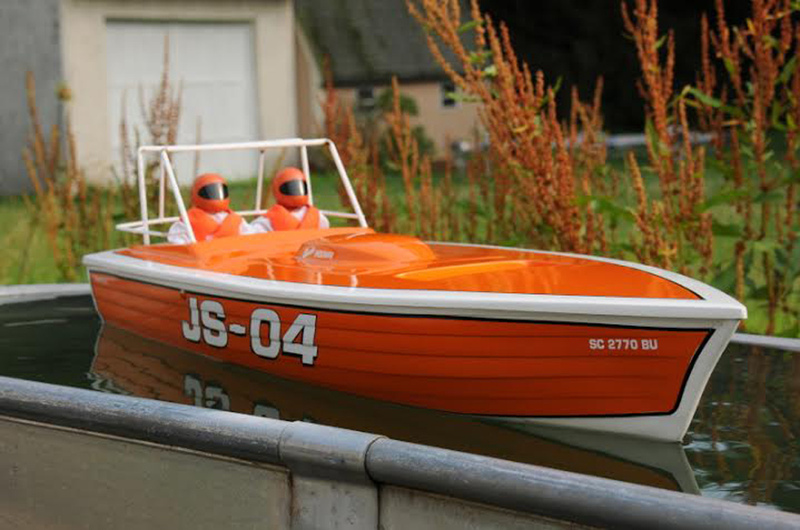 "I rarely bother to contact a vendor over anything. Mostly because I just don't like them. I've been smoked a few times but good. But you guys should know you have a top notch gig going on down there. 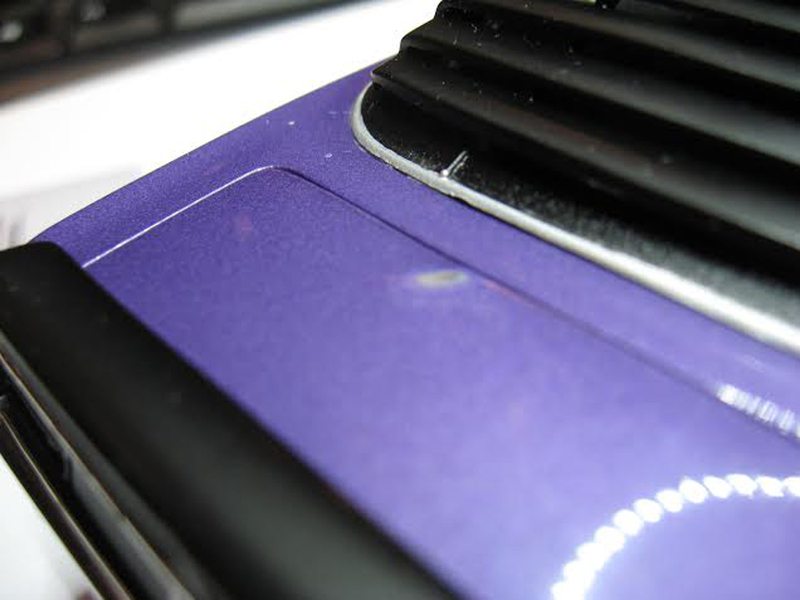 Colors are dead-on and consistent every time.. shipping is fast and products are high quality. Sent a pic of what i was able to do with your stuff. 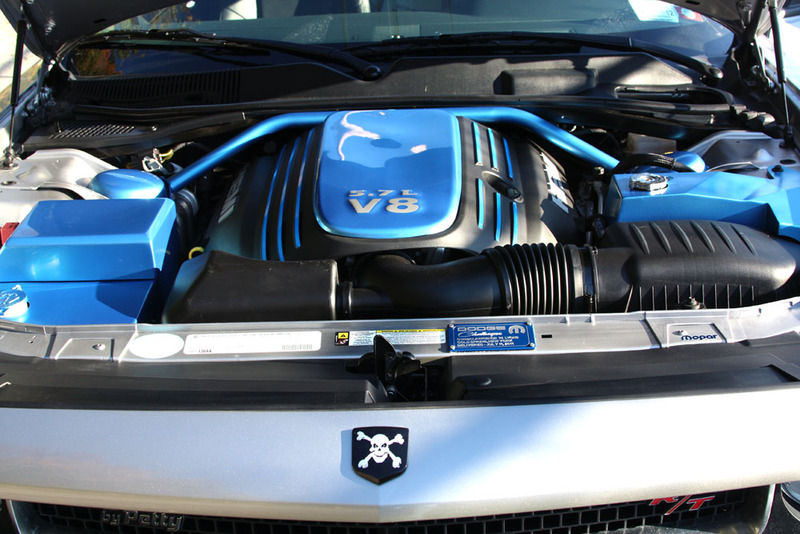 If you guys have a small sticker i would be happy to put it on my engine bay, car shows and all. Thanks again"
"Just wanted to thank you guys! This is the 2nd thing I''ve painted with your paint and thought you might like to see the results. " 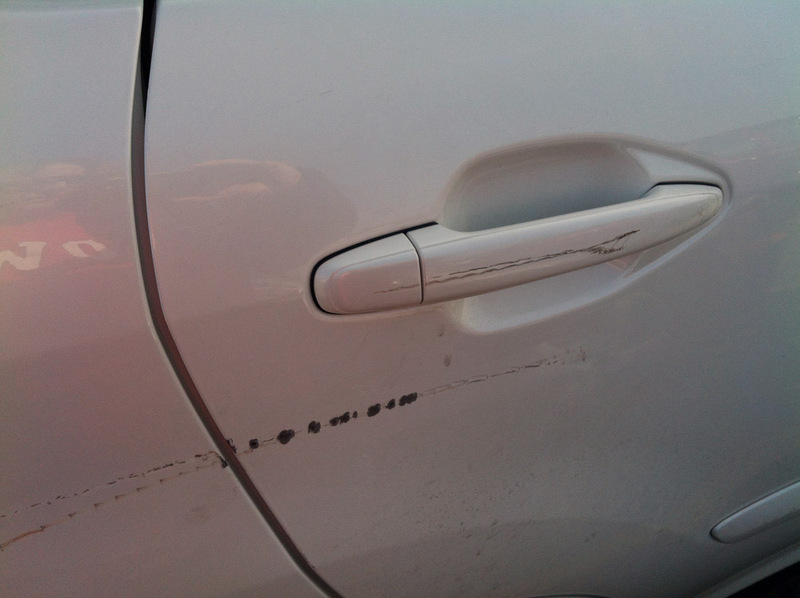 "A parking lot damage to the driver side door was estimated at $1,840. I decided to try to fix it myself. 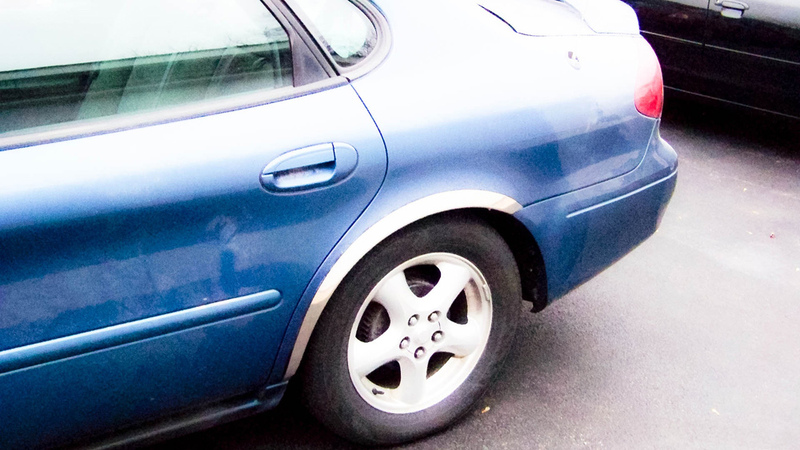 I used your automotive touch up paint and clear coat. Cost, $44.00. It is an almost perfect color match. 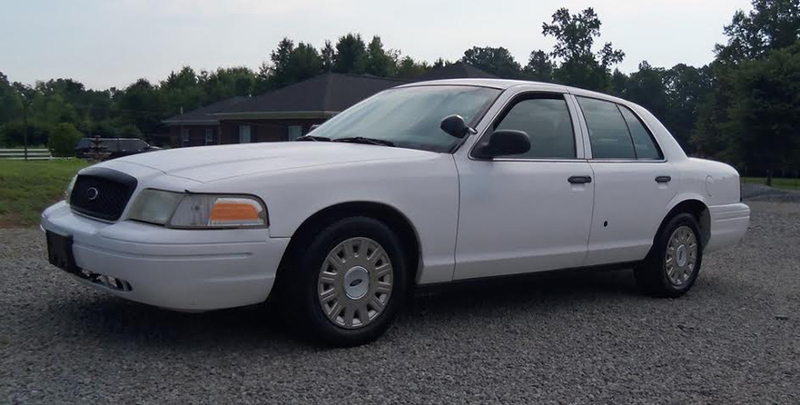 With the extra $1,800. we are going on a 7 day cruise to Mexico." "Thanks a lot. Here are some pics. Came out pretty good for my first time." 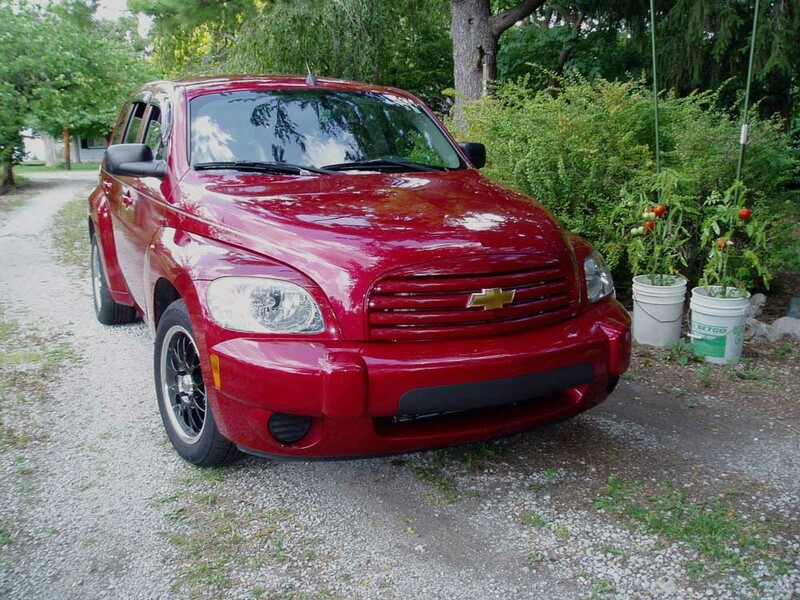 "Attached are the before and after pictures. 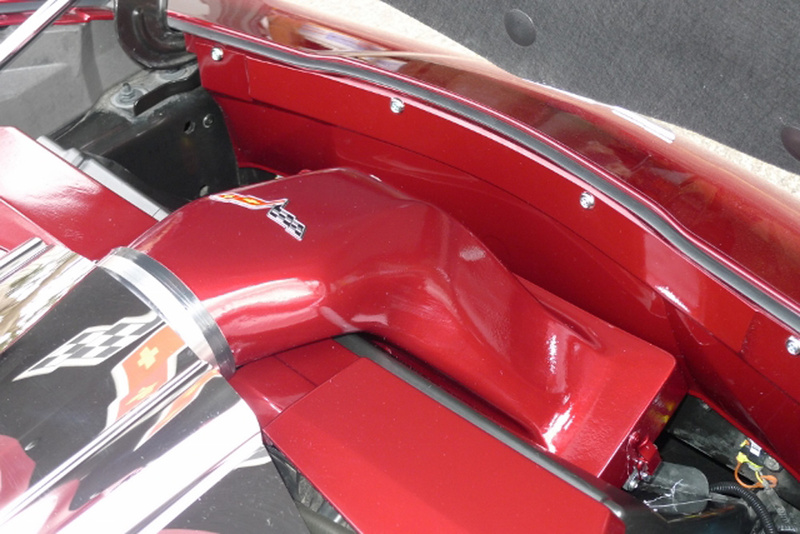 I am VERY happy about the improvement in my paint. " "Hi. I've been buying a lot of your product. Just wanted to show you what I've been doing with them. All the best from Kevin." 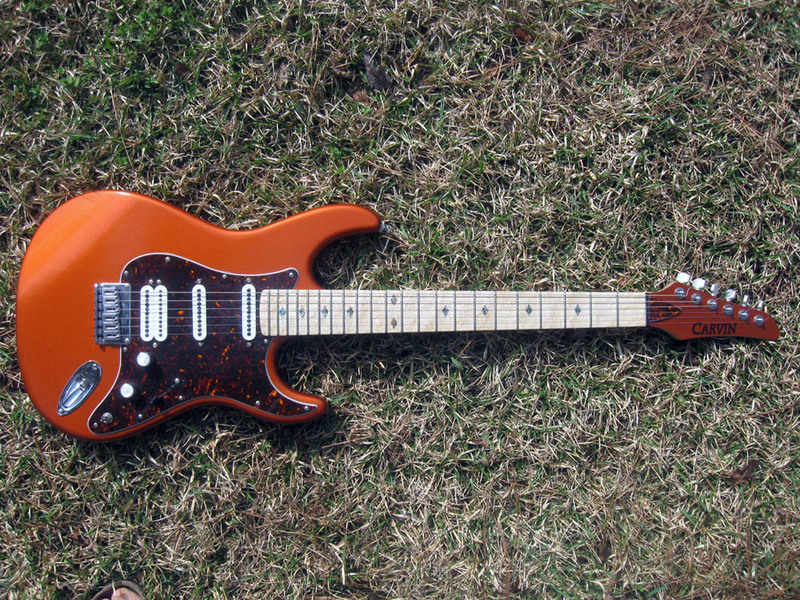 Just talked to you about making the base coat paint…..Here's a couple pictures of a guitar I painted using your products. 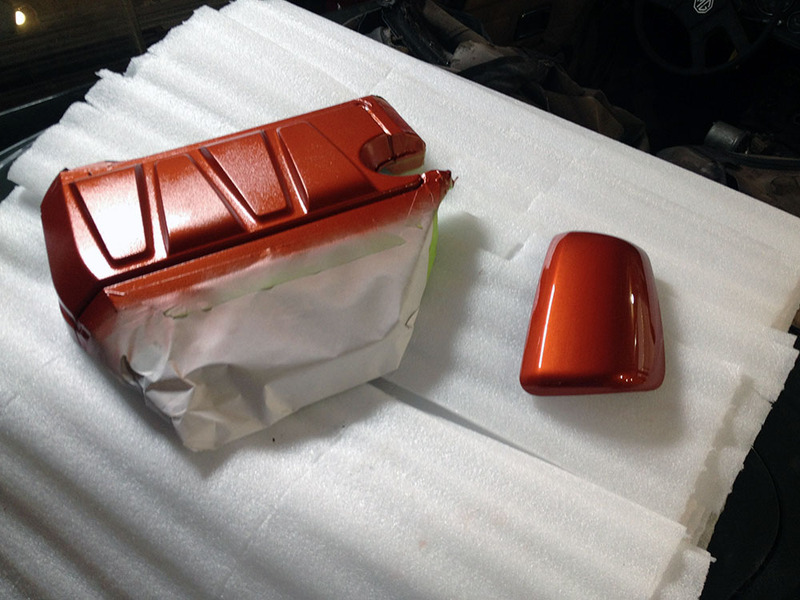 Base coat is Chevrolet's Atomic Orange Metallic with the one part clear coat. 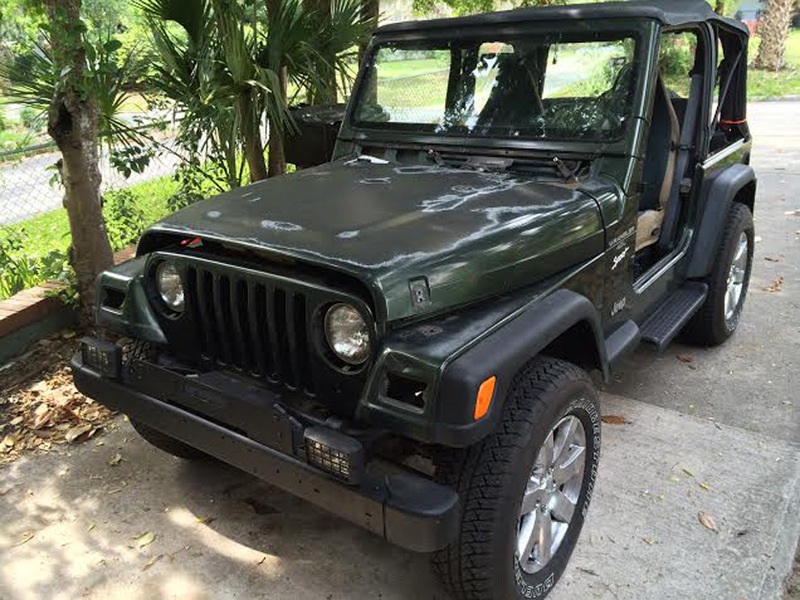 "Good products and Service you carry and provide there..! 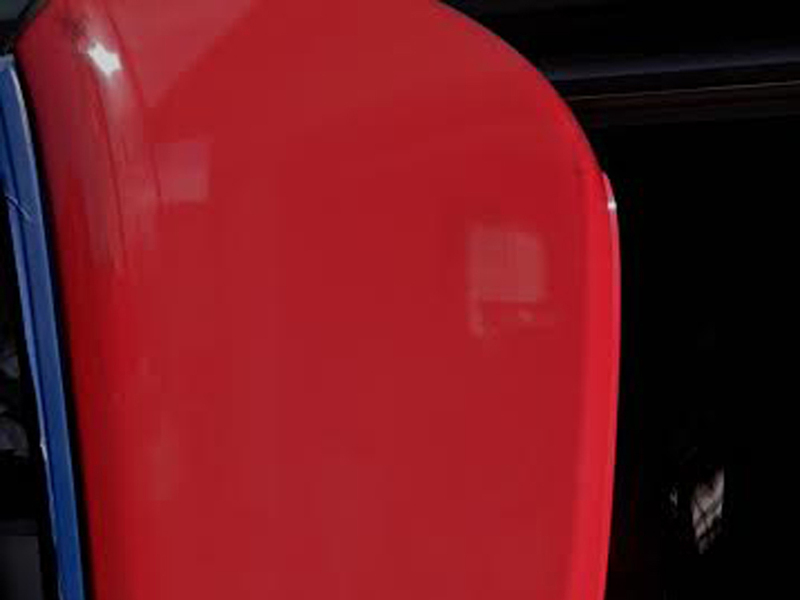 Thanks for making our job more easy and more efficient..! 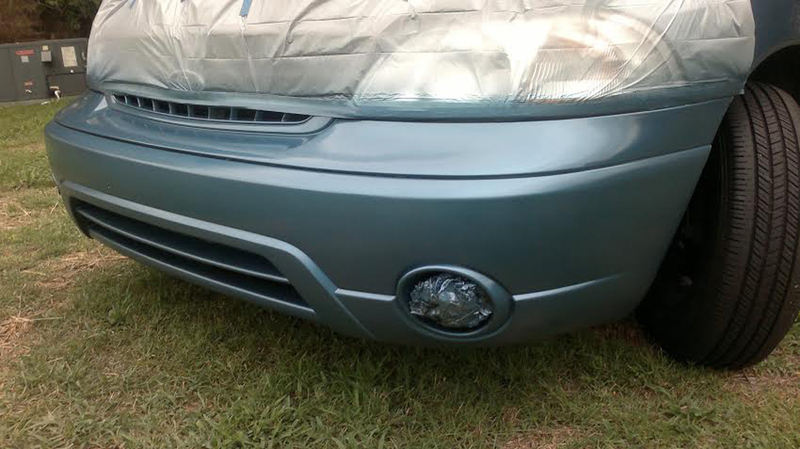 My neighbor was very impressed with the outcome results on her Montero as well as I was. Keep up the good products you provide.! 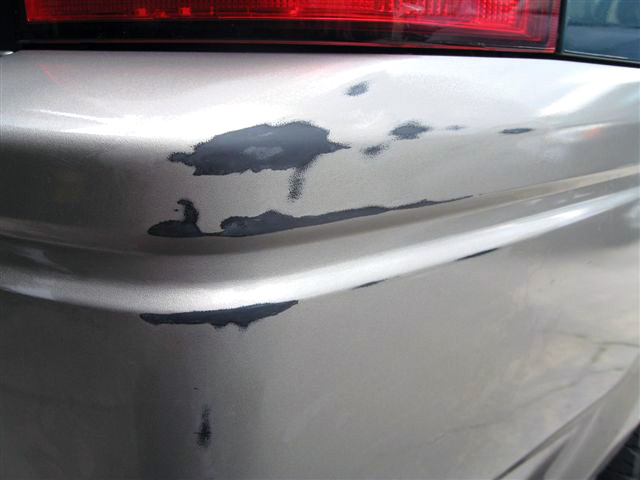 "Your paint was spot on. 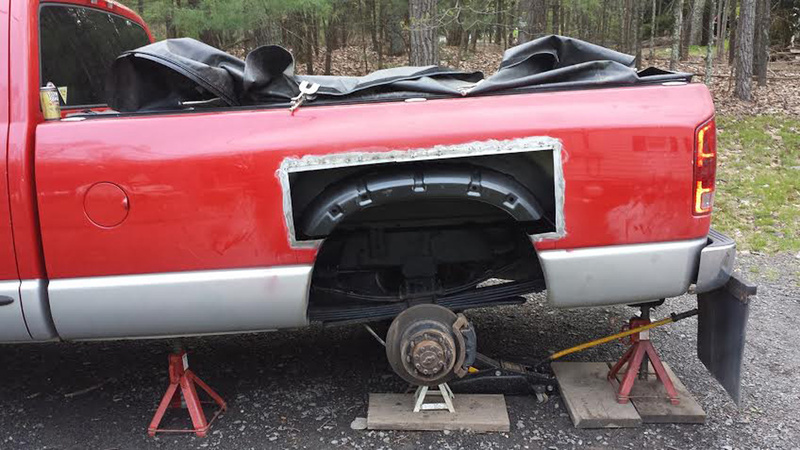 Just ordered another can, to do some trim work. 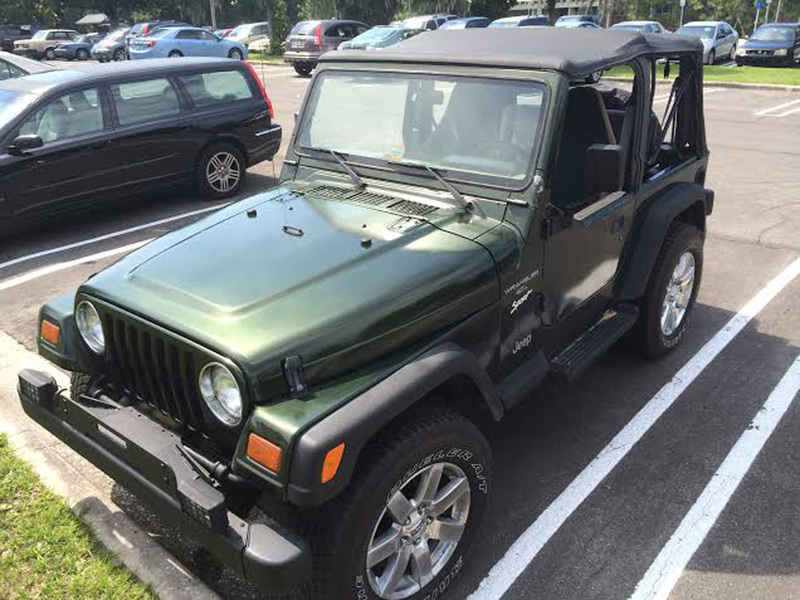 Will be ordering my wife's color as well. 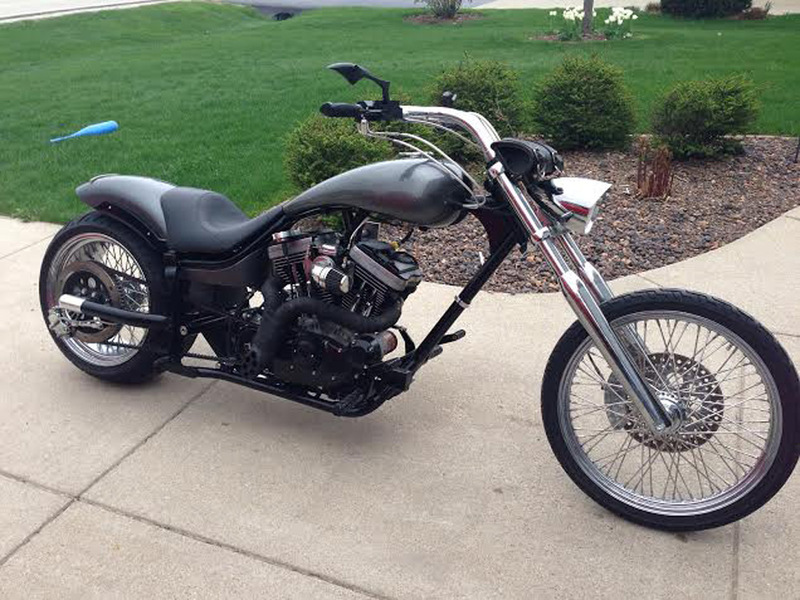 Here is a few pics of the work." "I just wanted to thank you for your products. The color match was spot on, and being a specialty color i was even more in shock. 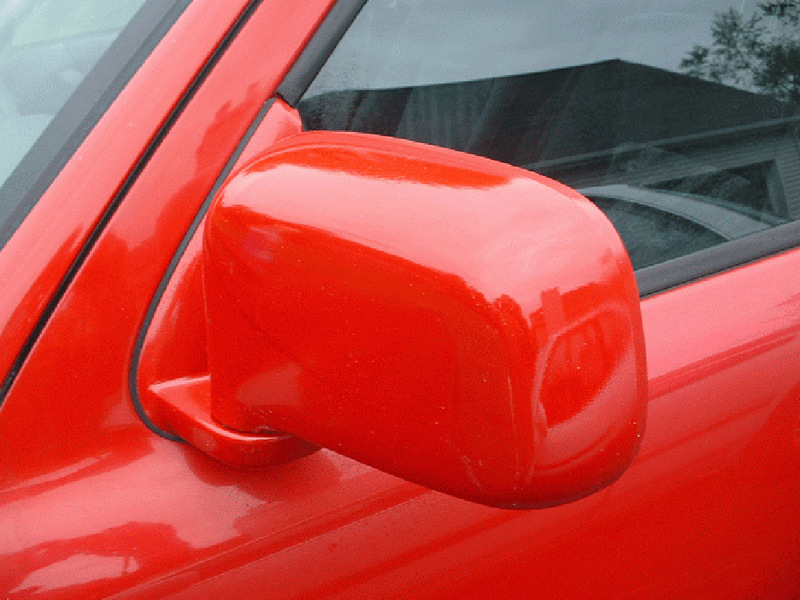 I had a tractor trailer tread hit my side mirror so figured it would take it upon myself to repaint. 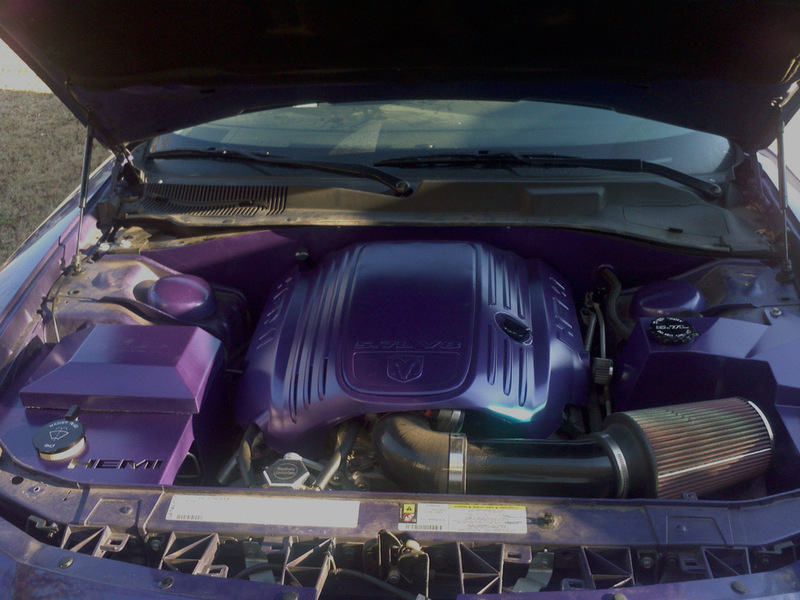 The sandpaper pack, tack cloth, plastic prep, and aerosol spray cans was all I needed to repair my mirror and added a little color-matched style to my engine bay as well. 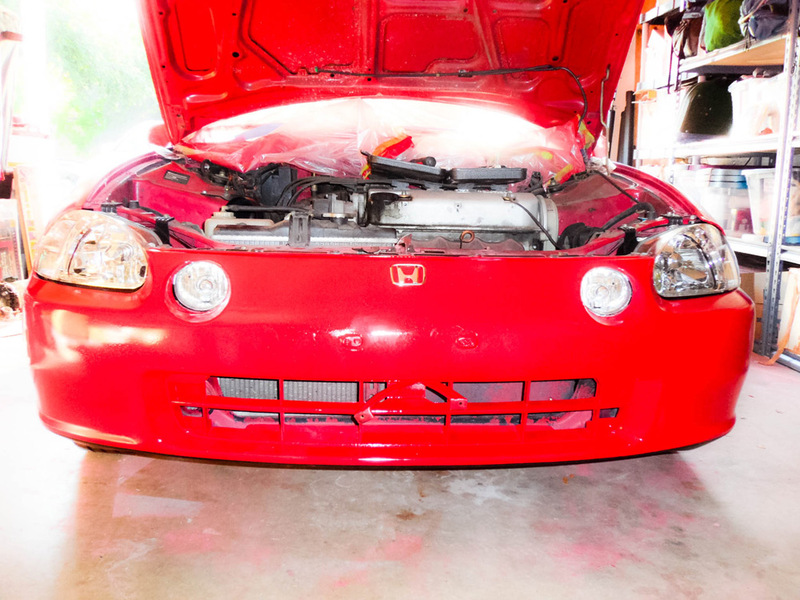 I dont know who i haven't told about your products since I've repainted my parts."